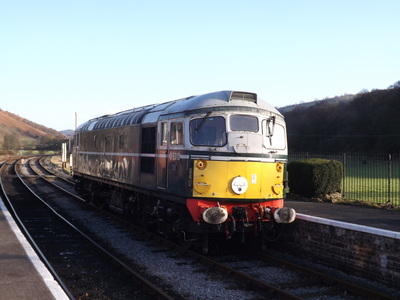 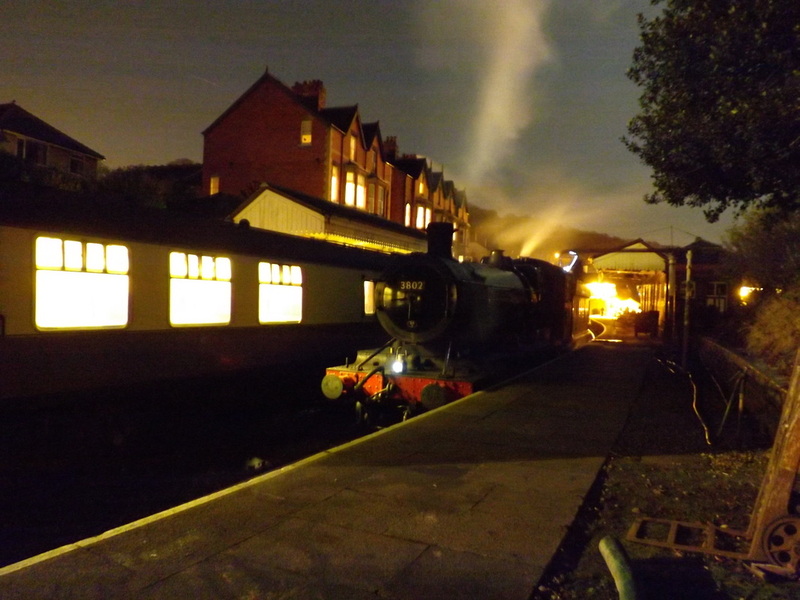 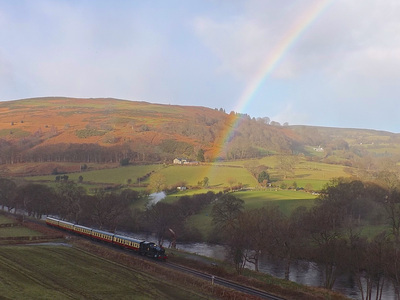 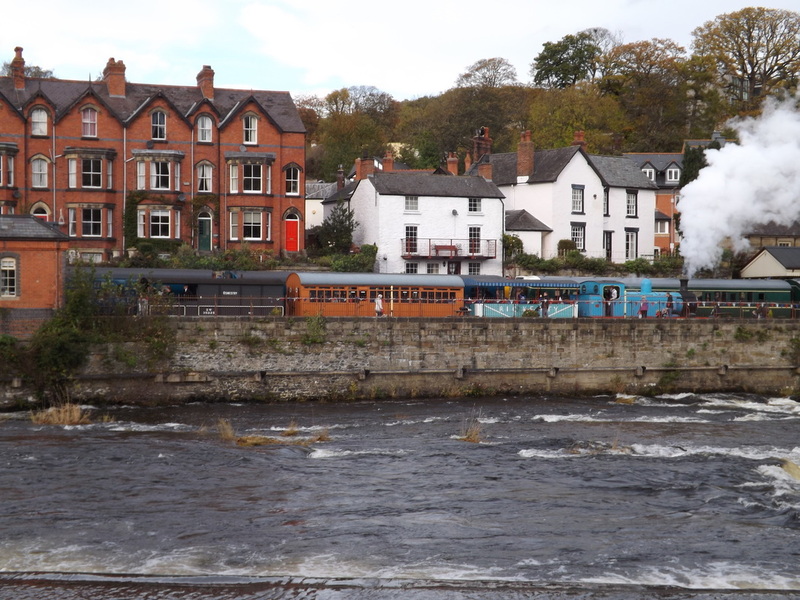 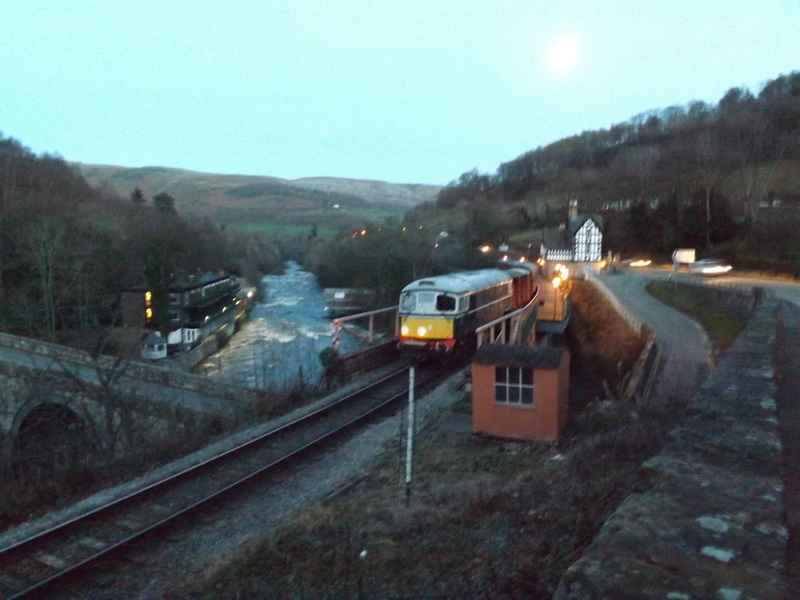 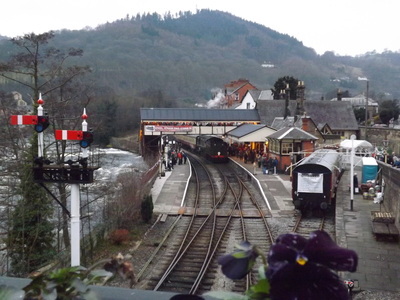 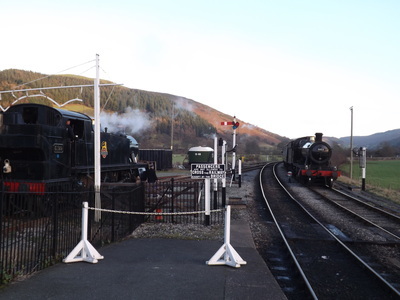 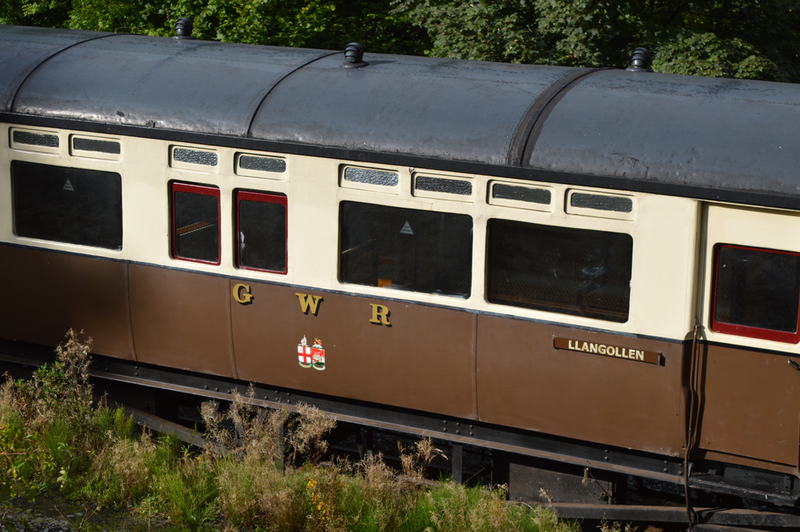 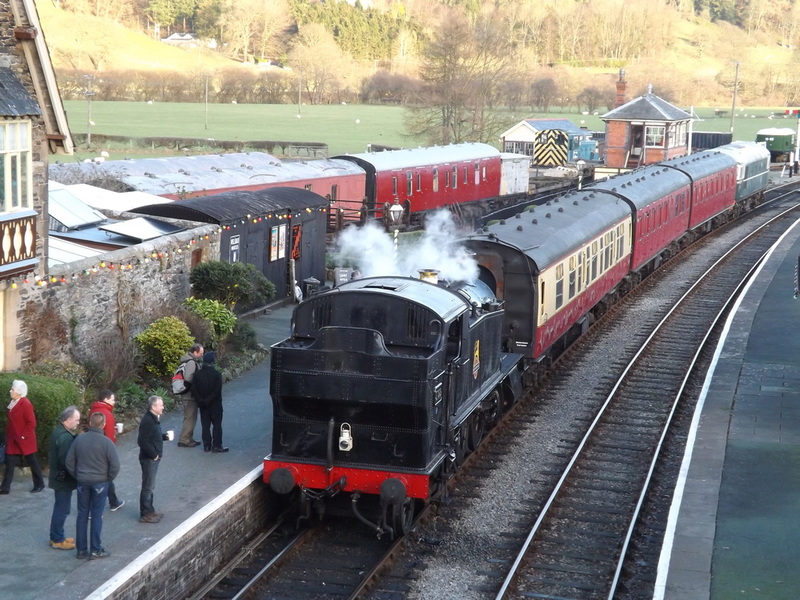 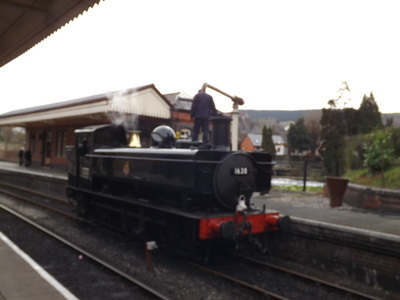 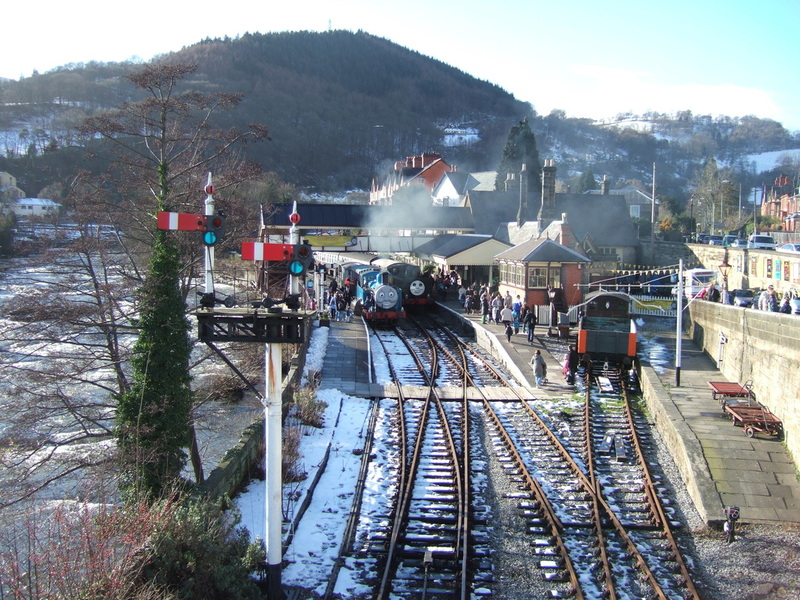 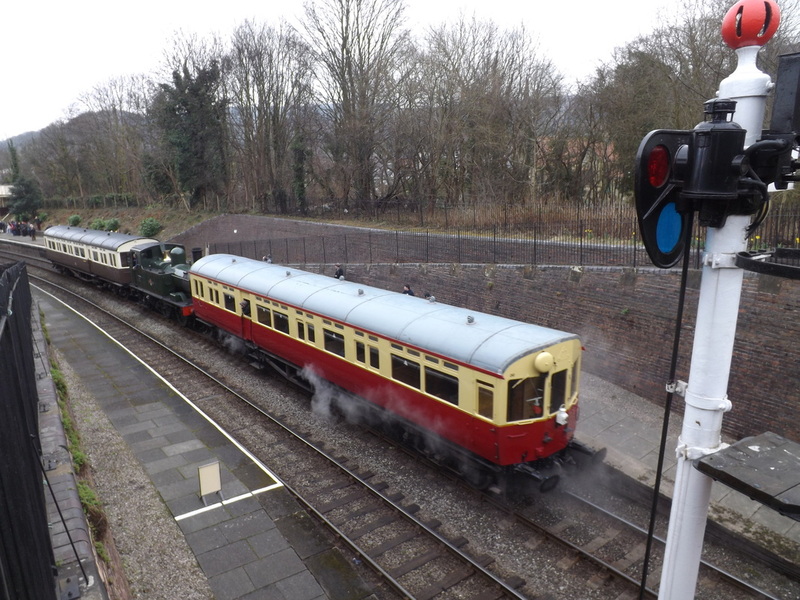 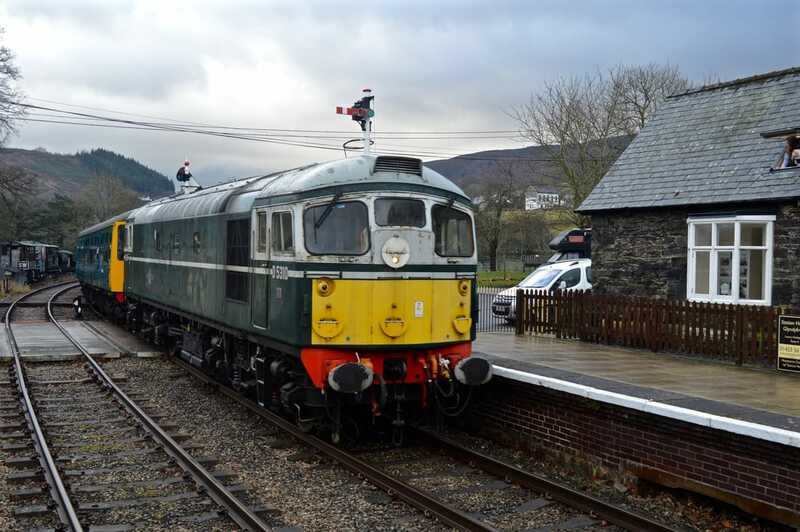 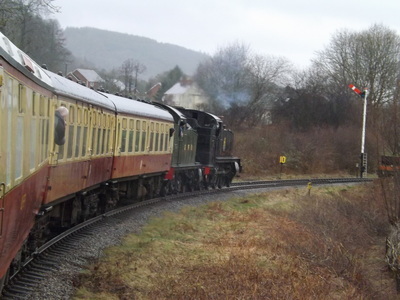 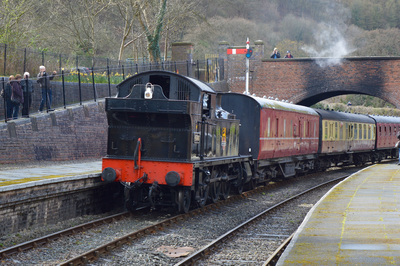 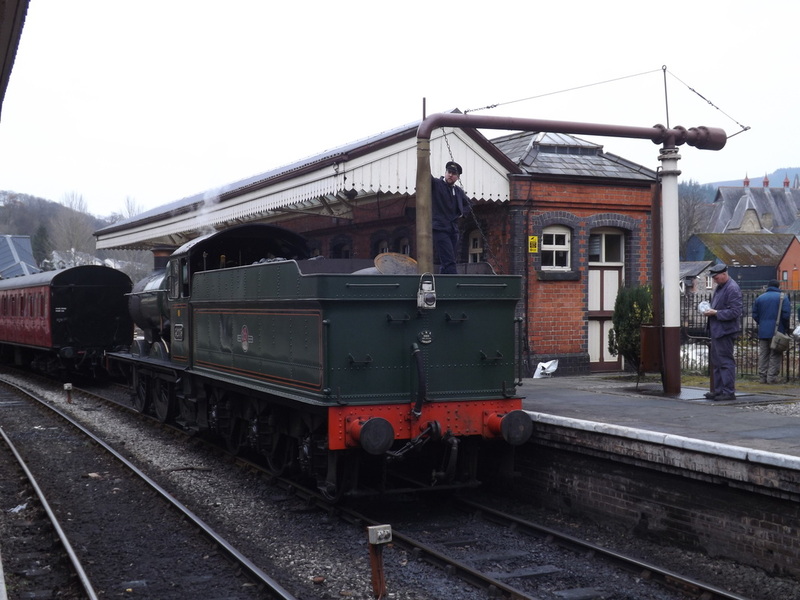 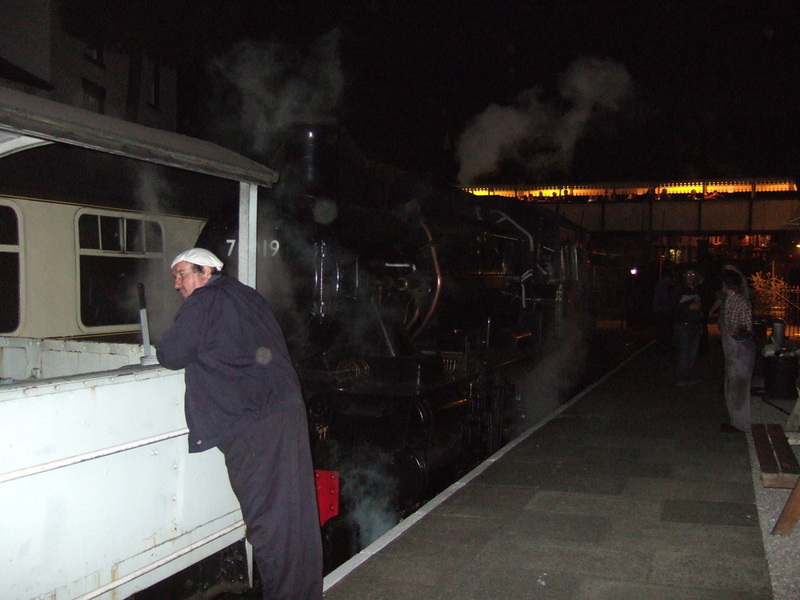 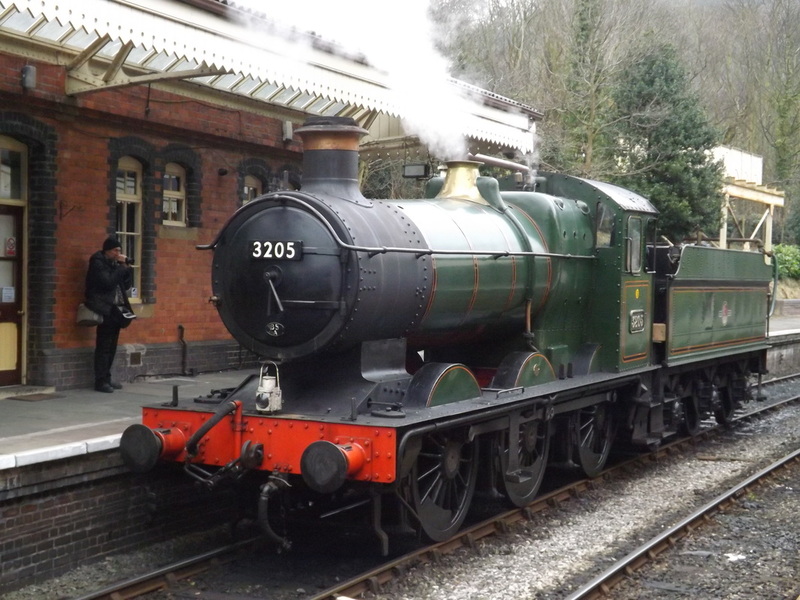 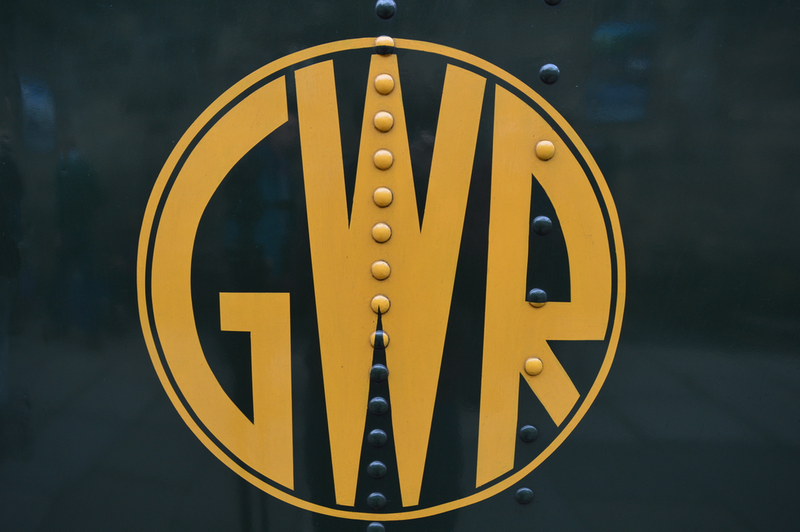 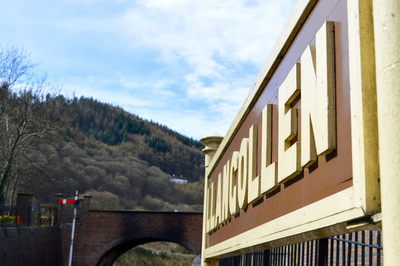 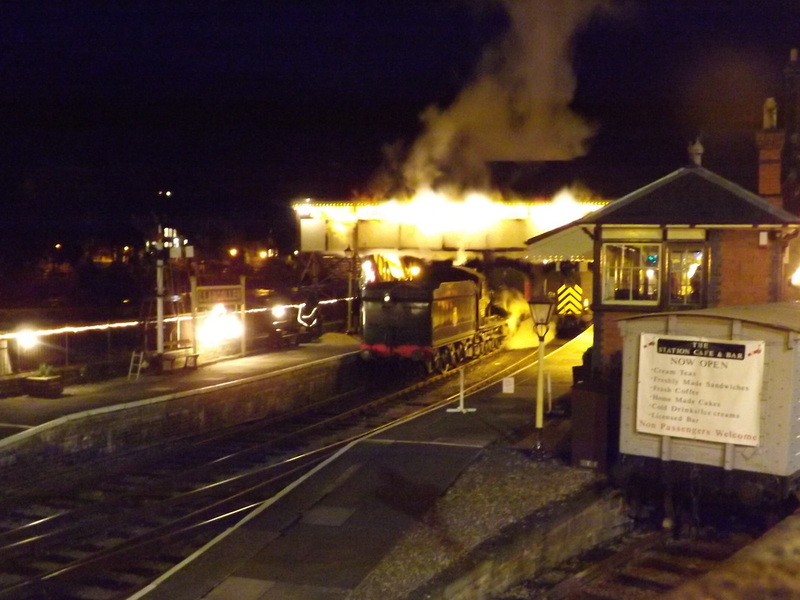 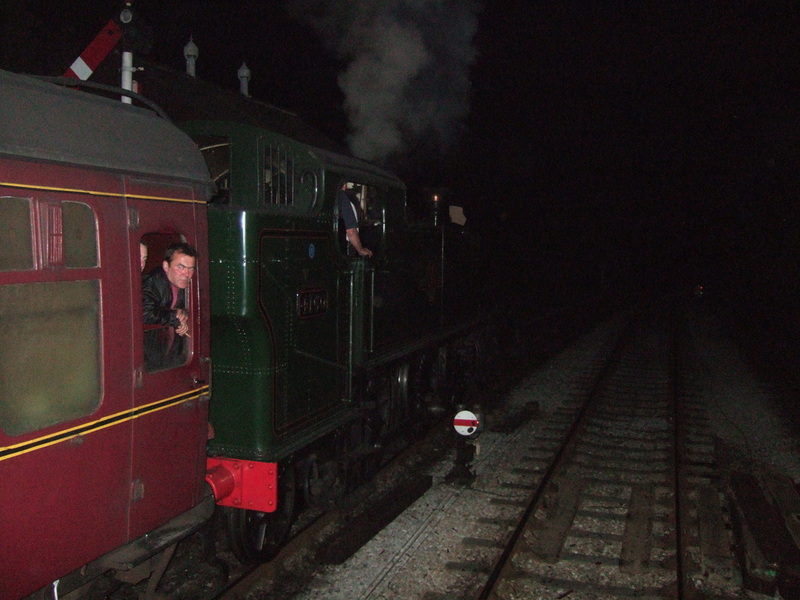 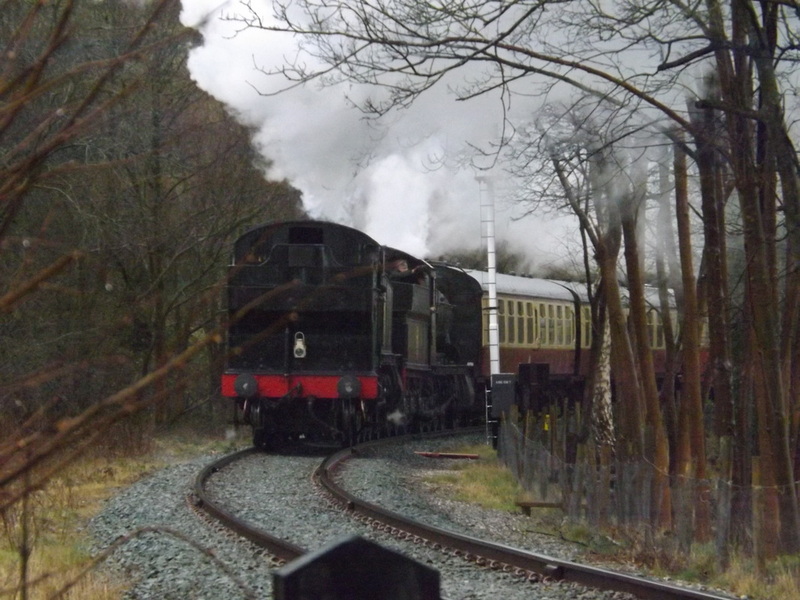 The curtain call to the Llangollen Railway's 2016 season was the Winter Warmer Gala. 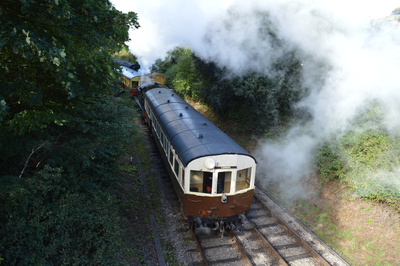 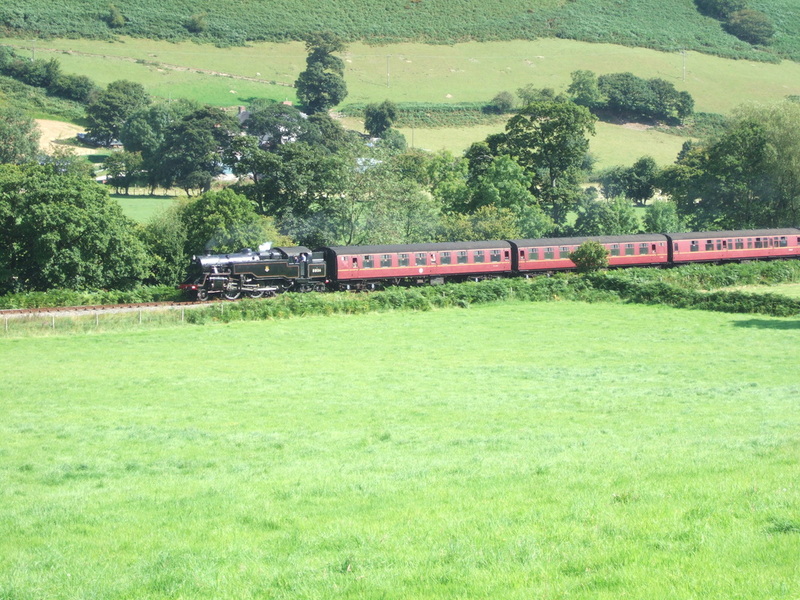 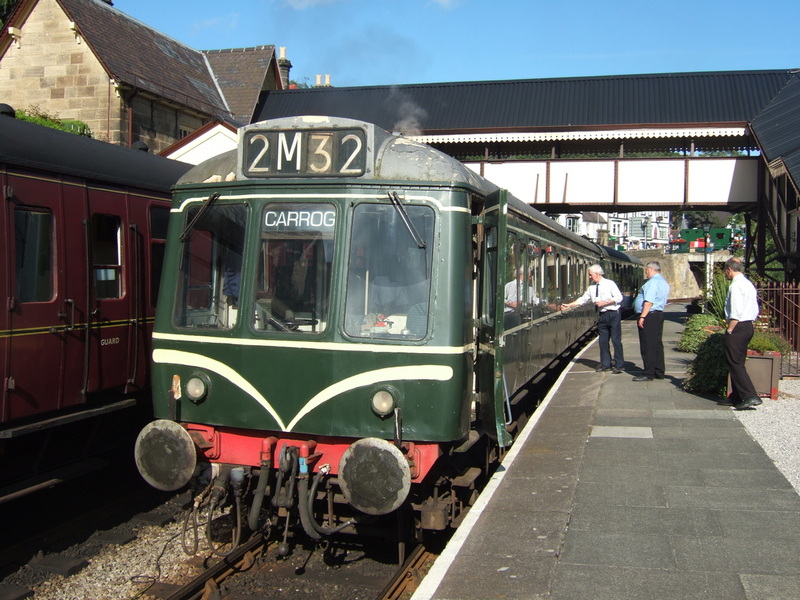 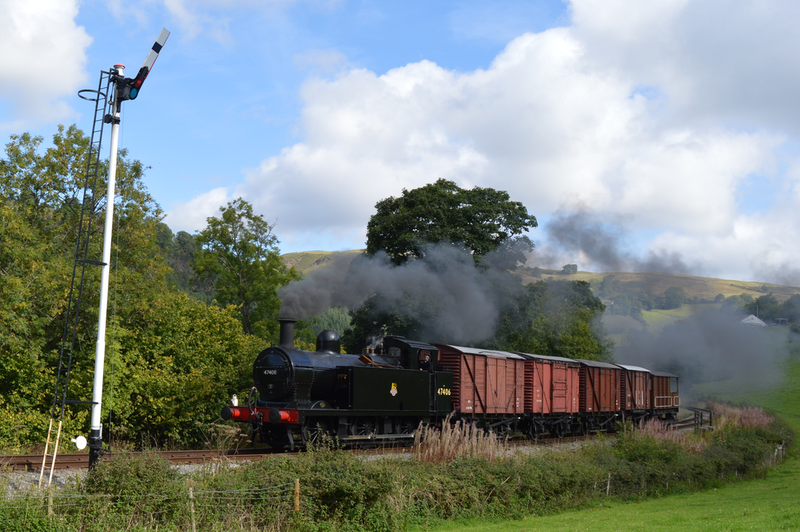 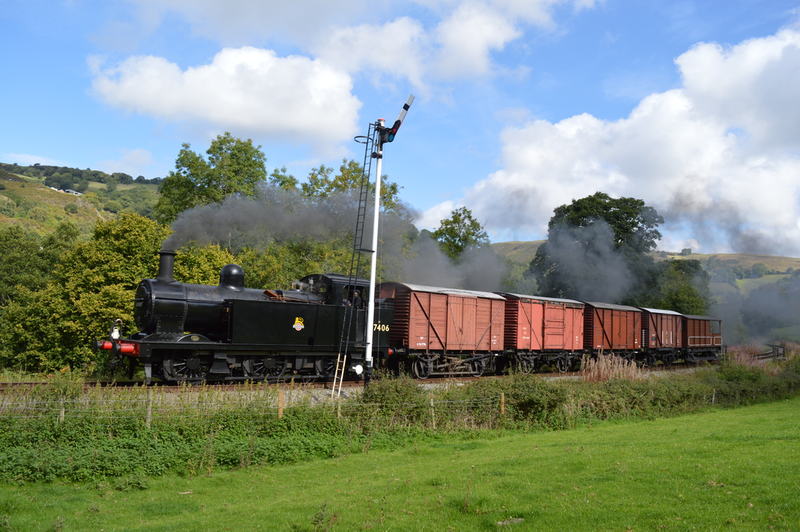 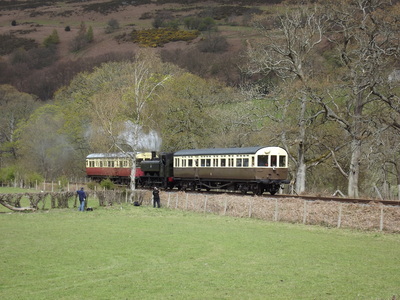 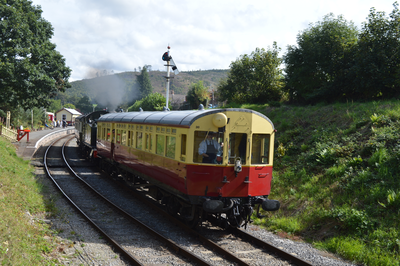 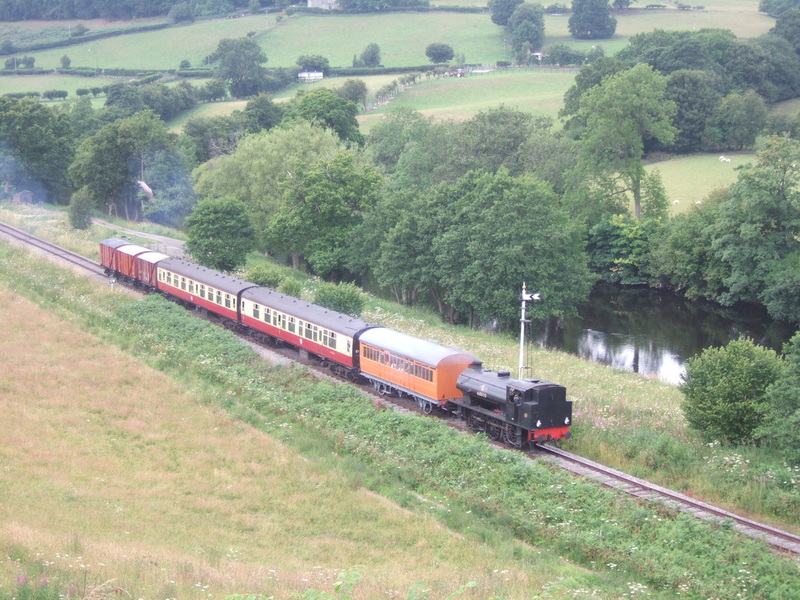 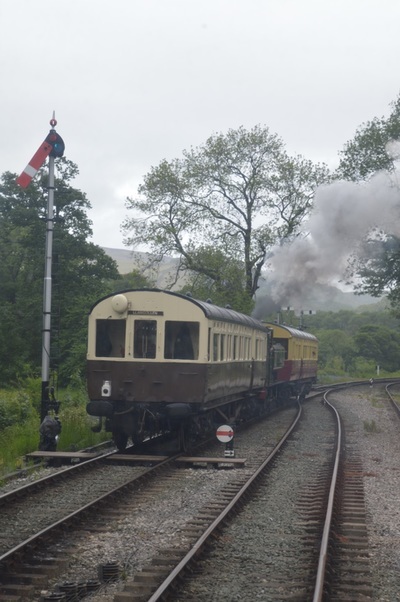 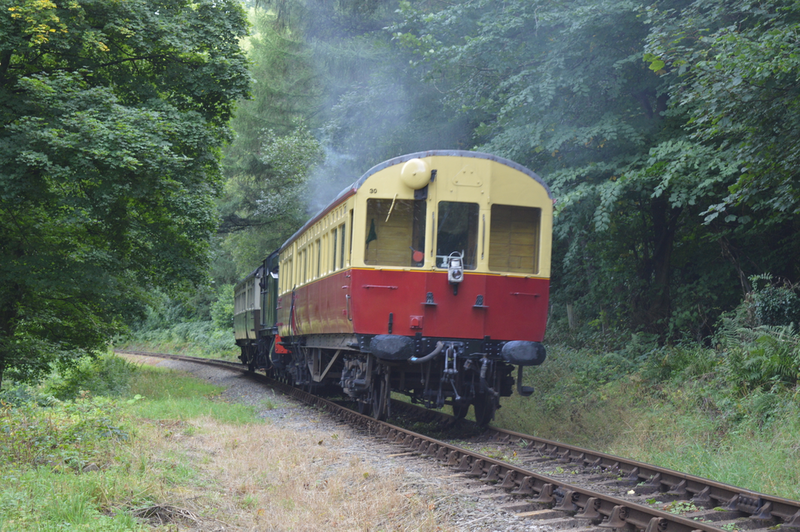 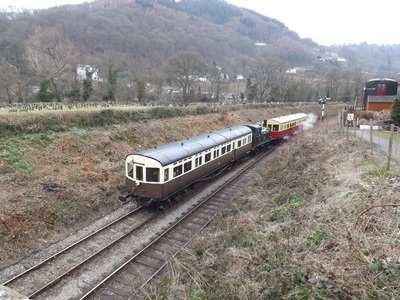 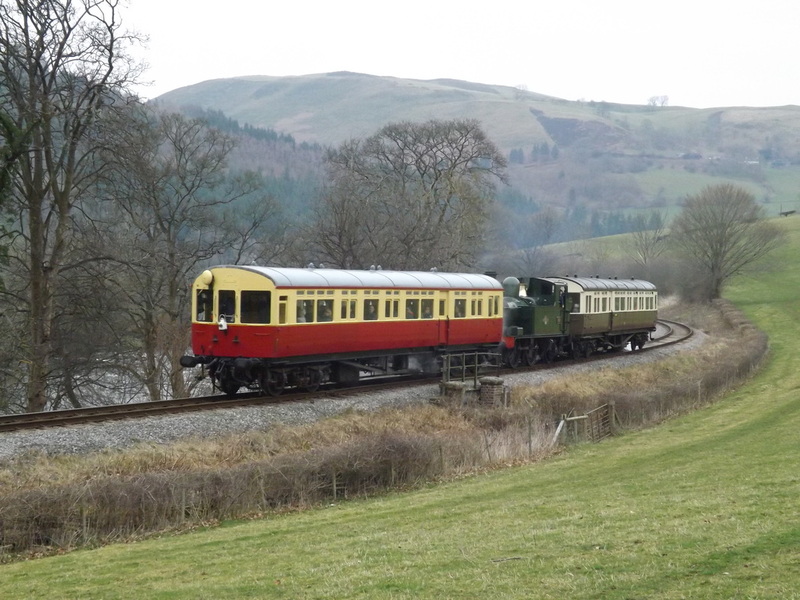 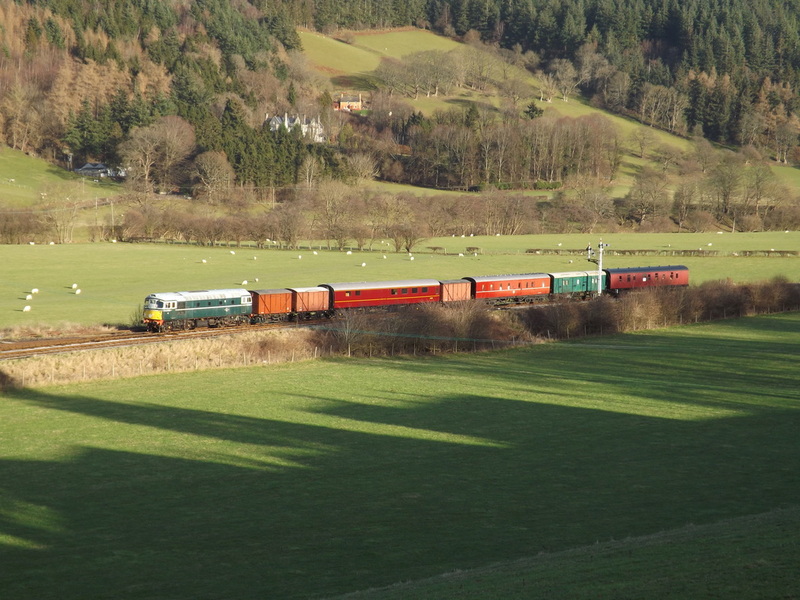 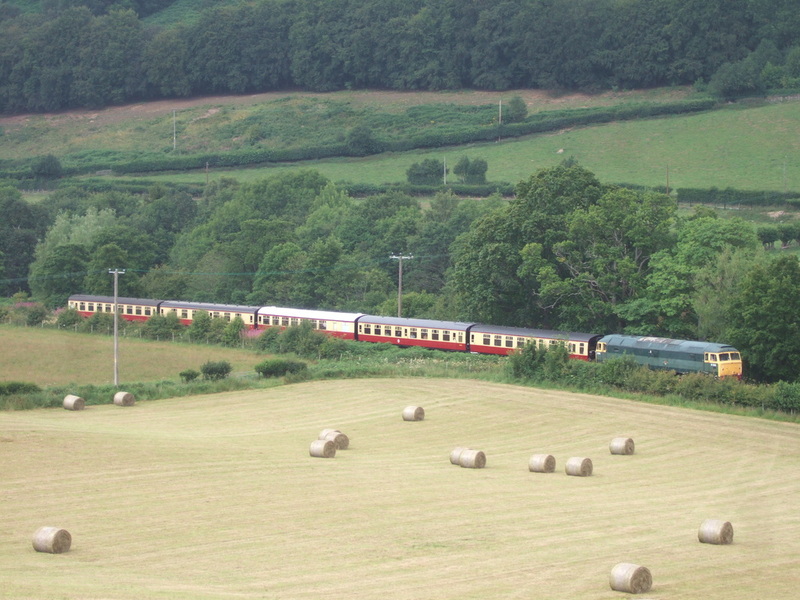 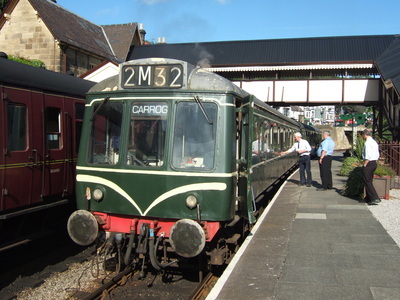 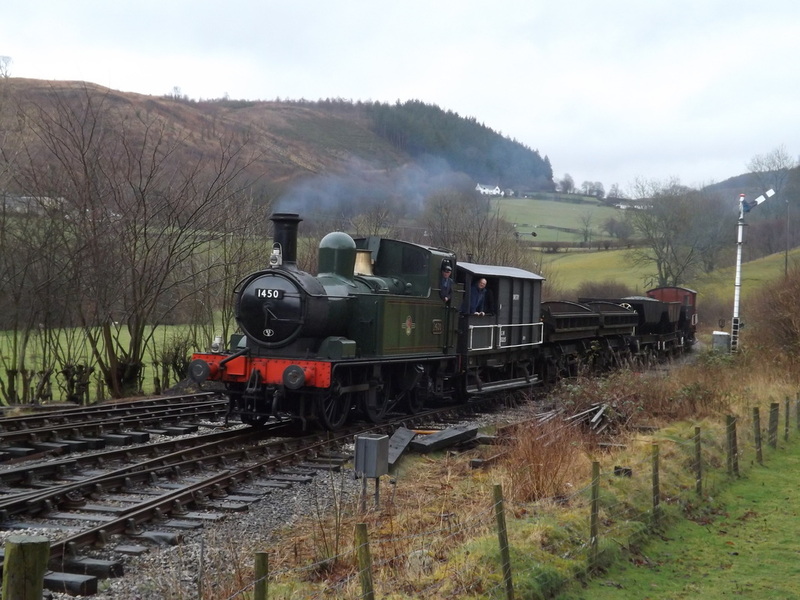 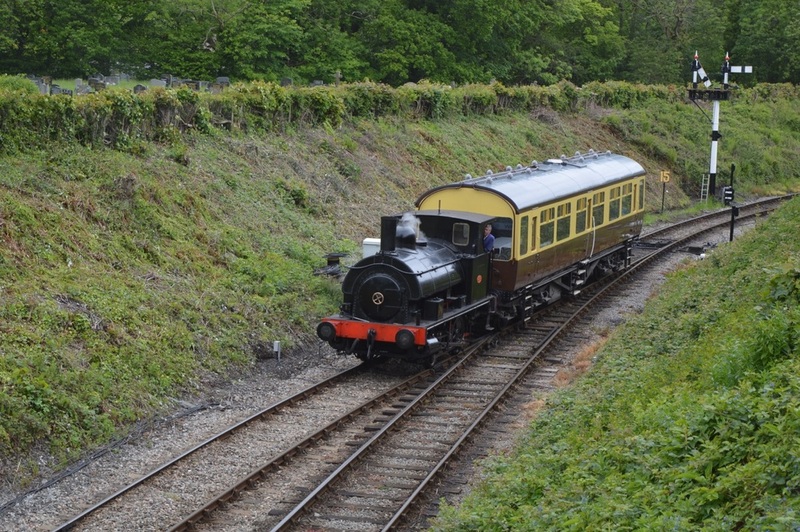 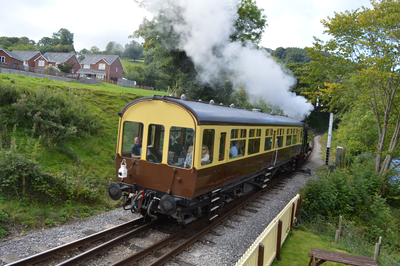 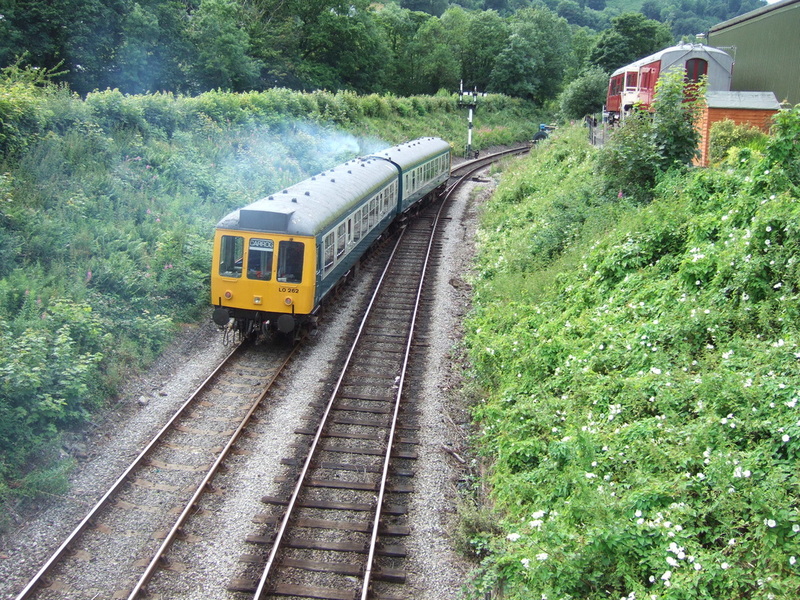 The event featured Hudswell Clarke 0-6-0 'Jennifer' on her first Llangollen passenger trains, vans attached to the rear of a DMU and being shunted off at Carrog by Foxcote Manor onto the rear of her own train and a DMU drag. 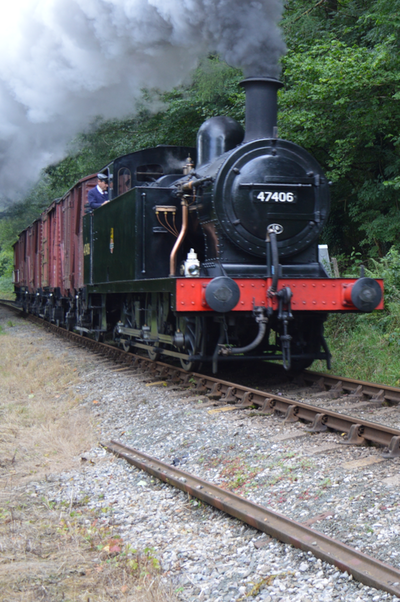 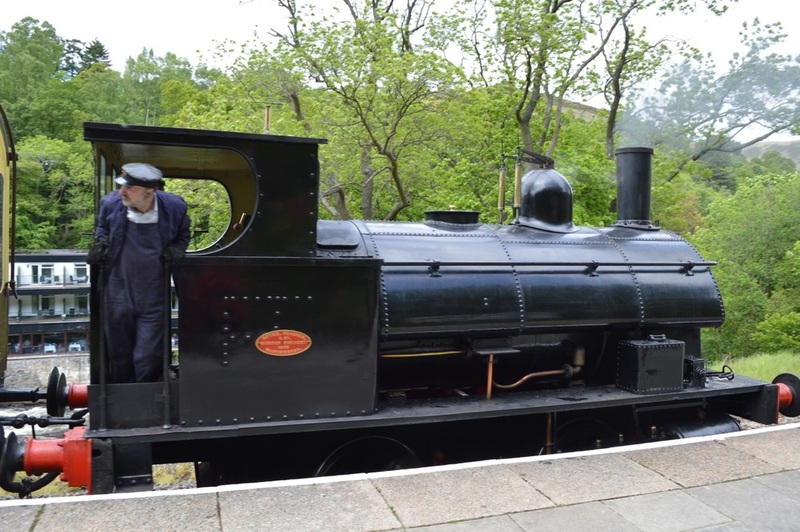 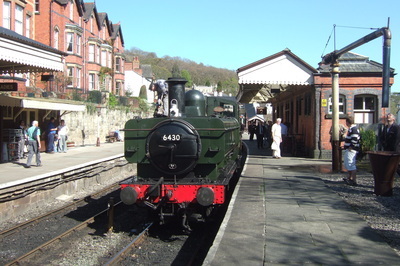 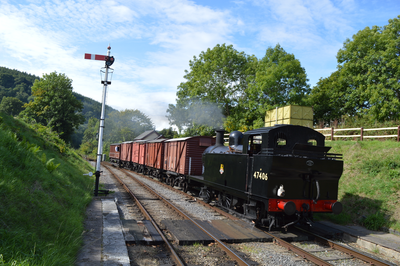 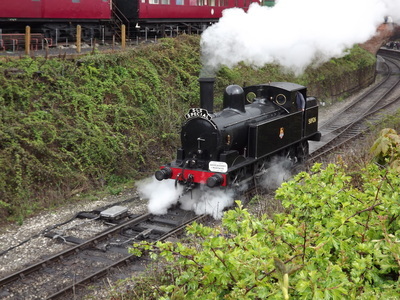 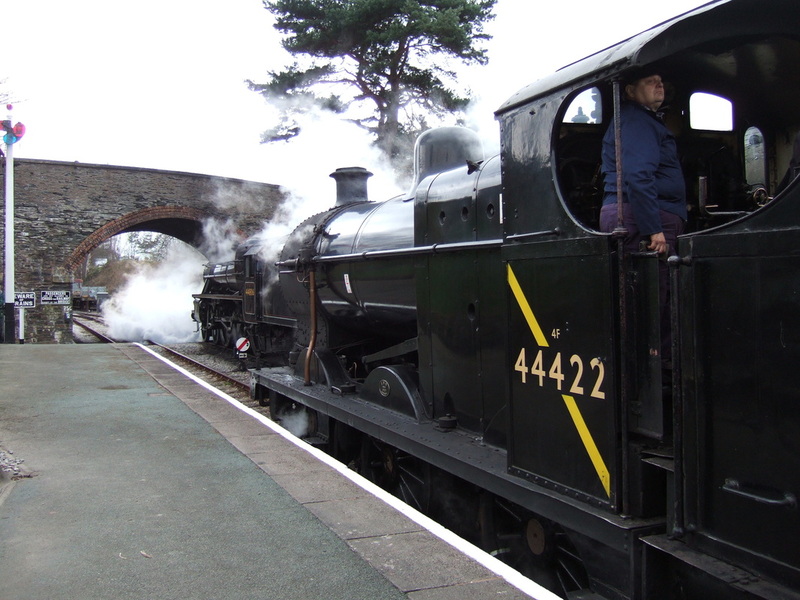 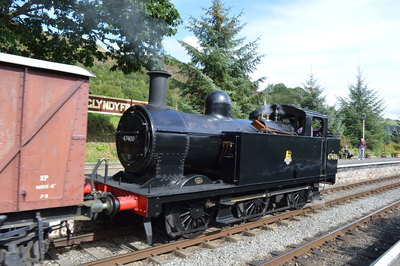 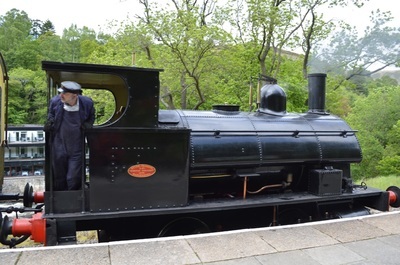 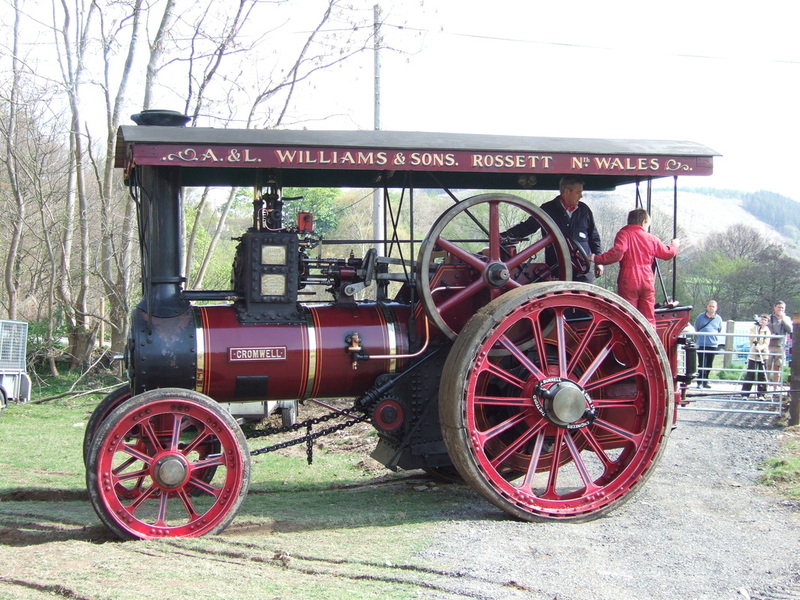 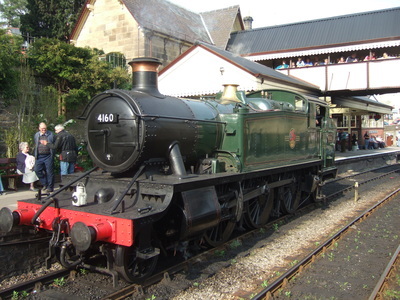 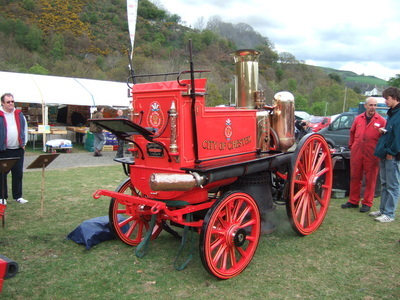 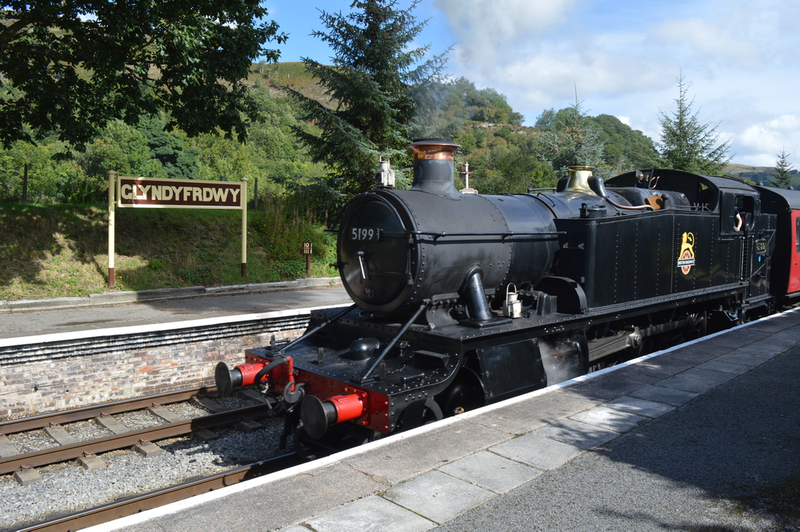 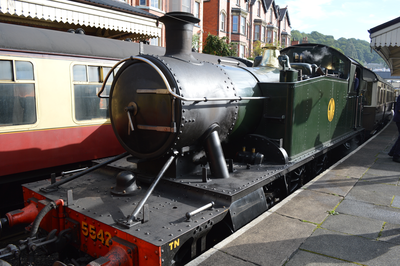 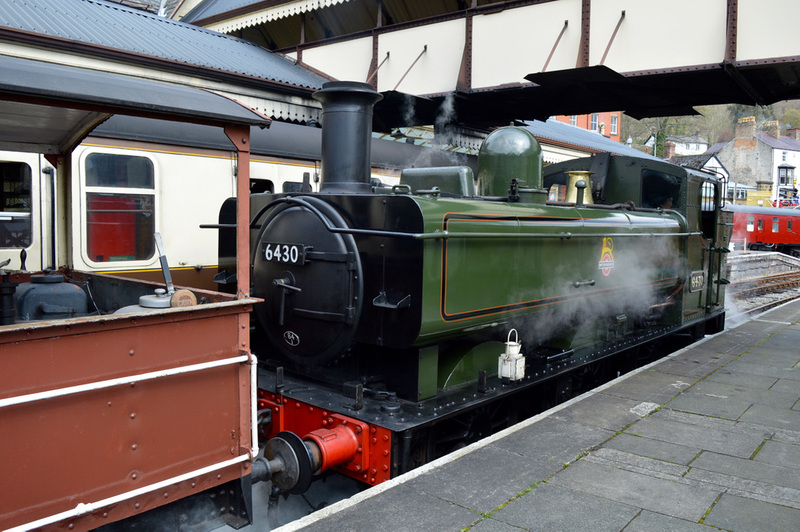 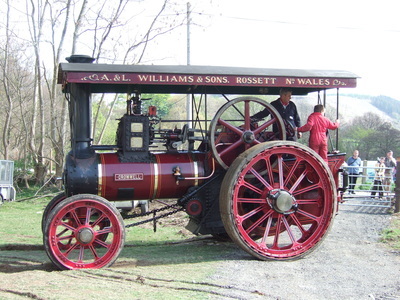 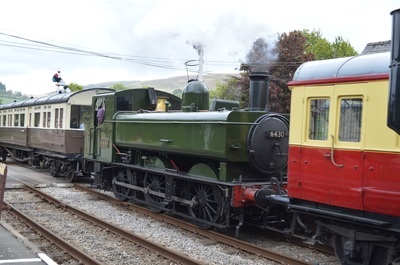 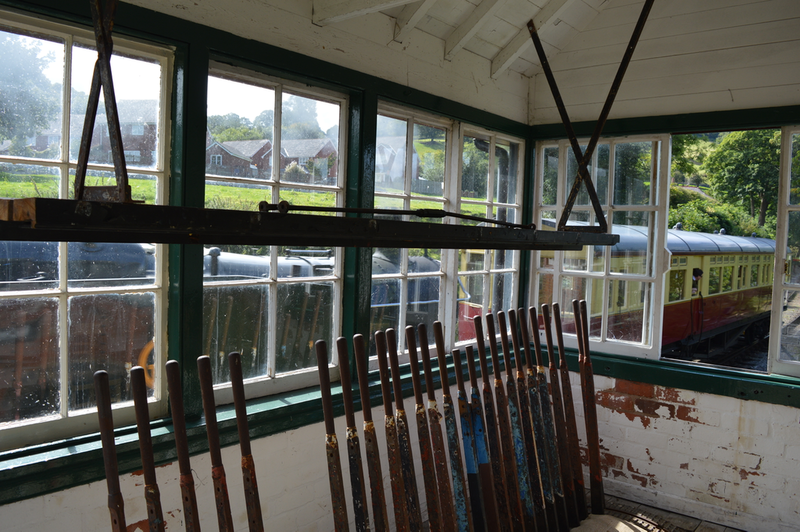 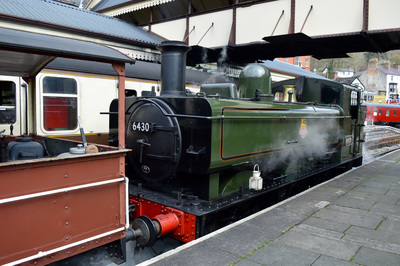 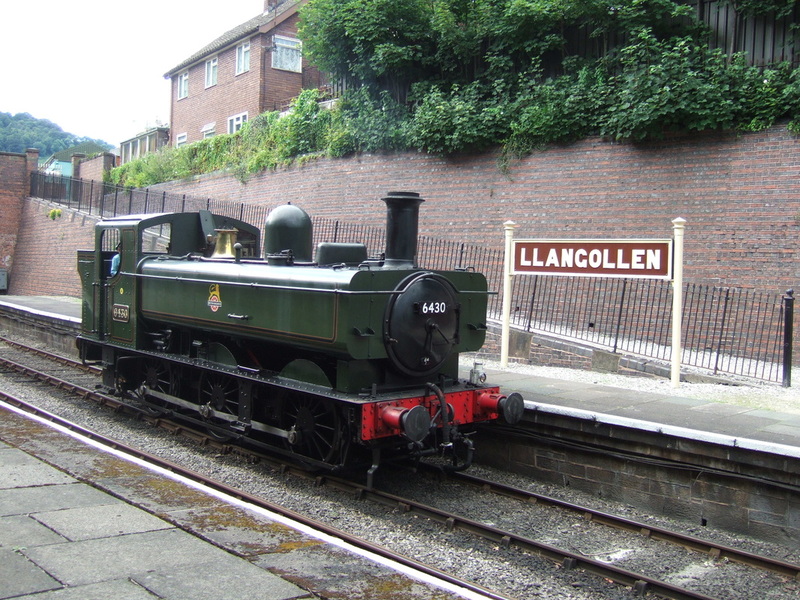 The first locomotive to arrive at the Llangollen Railway when preservation started was a Fowler 40HP 0-4-0. 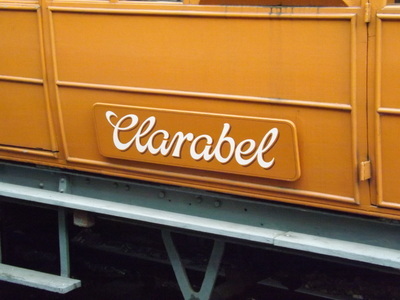 The locomotive was named Eliseg after a local landmark. 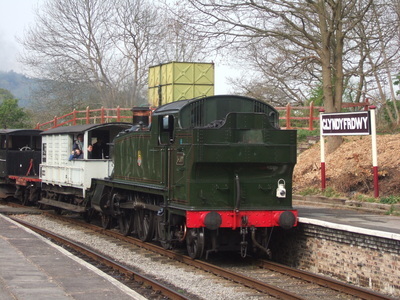 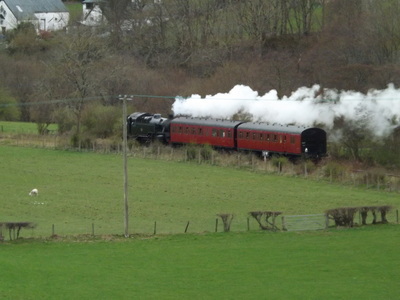 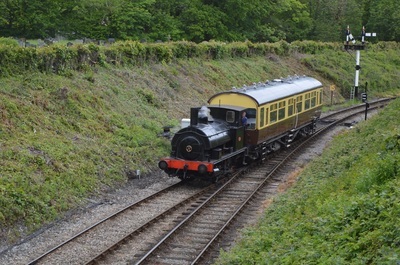 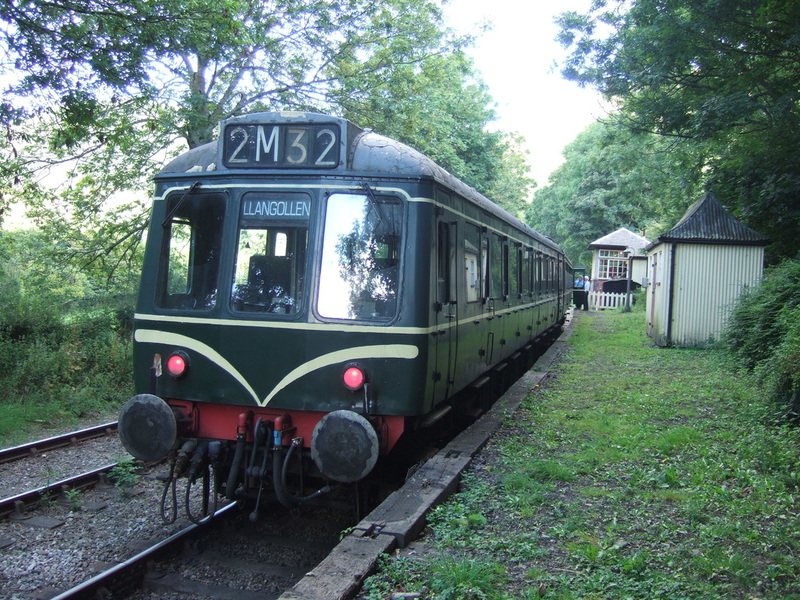 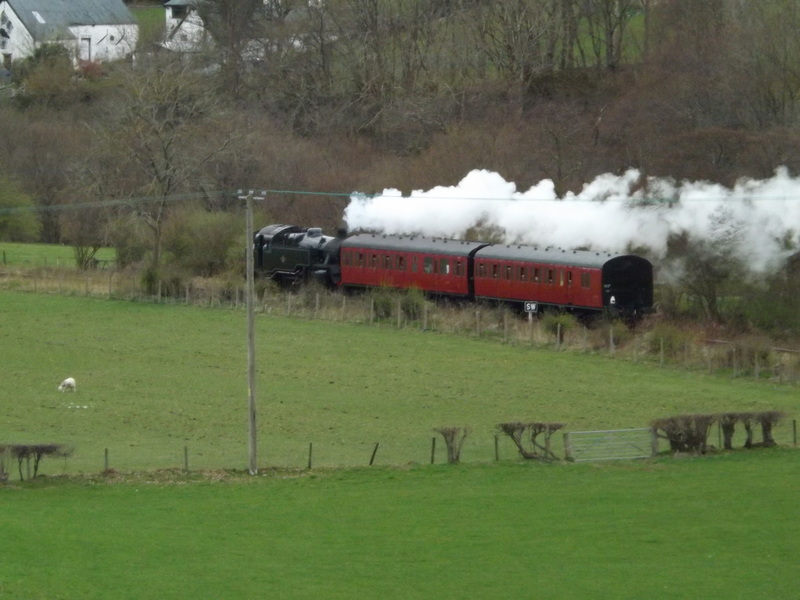 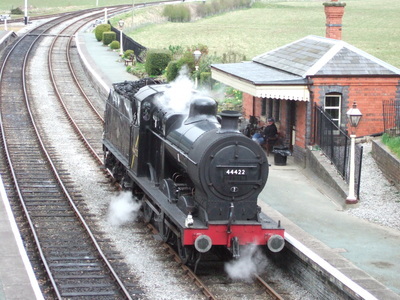 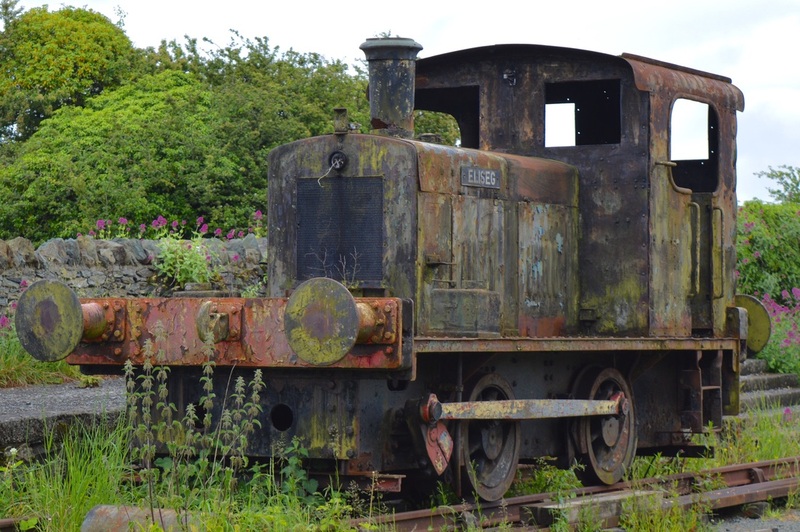 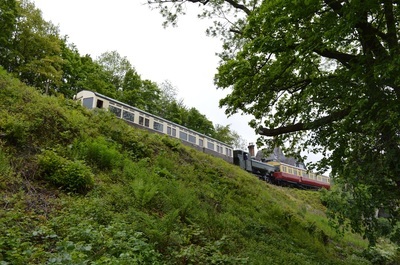 Originally built for use at Broughton aircraft factory, the locomotive is now out of use and has the line and is on display at Llannerchymedd station on Anglesey (as seen above). 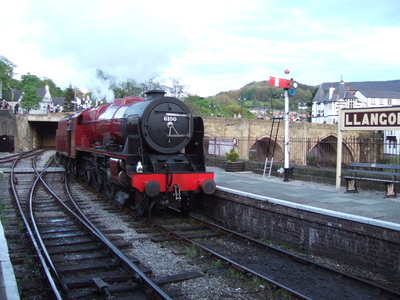 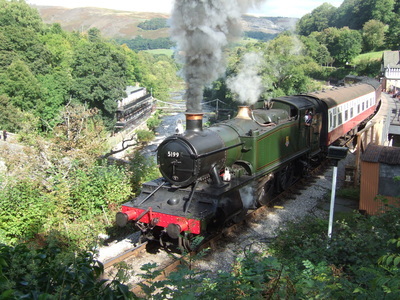 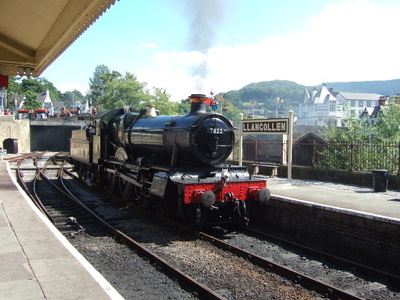 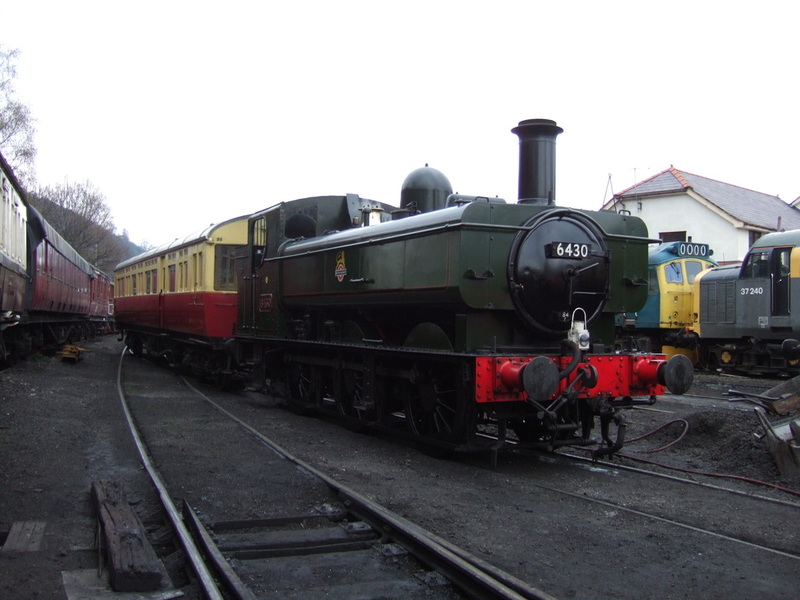 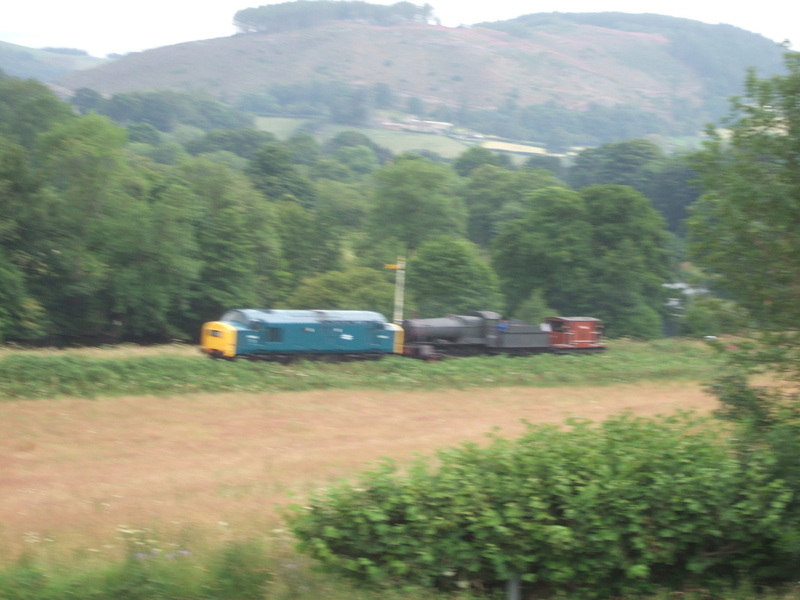 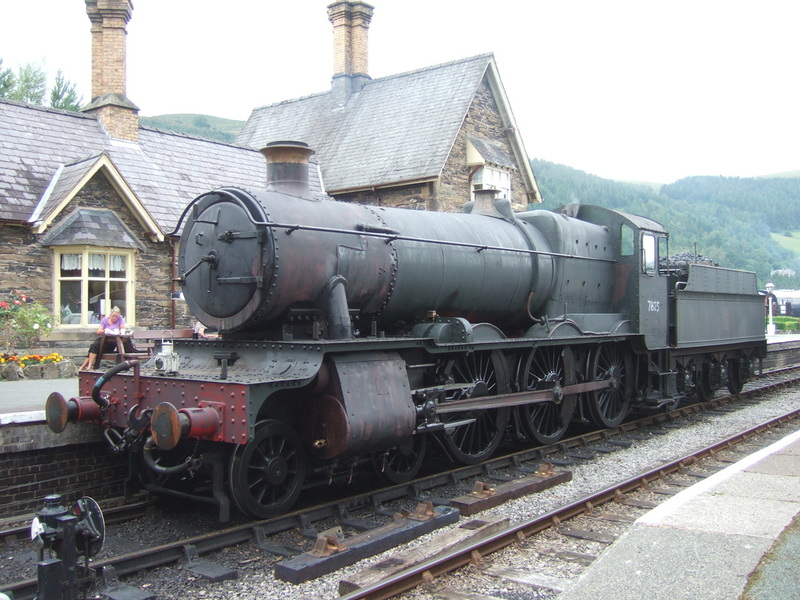 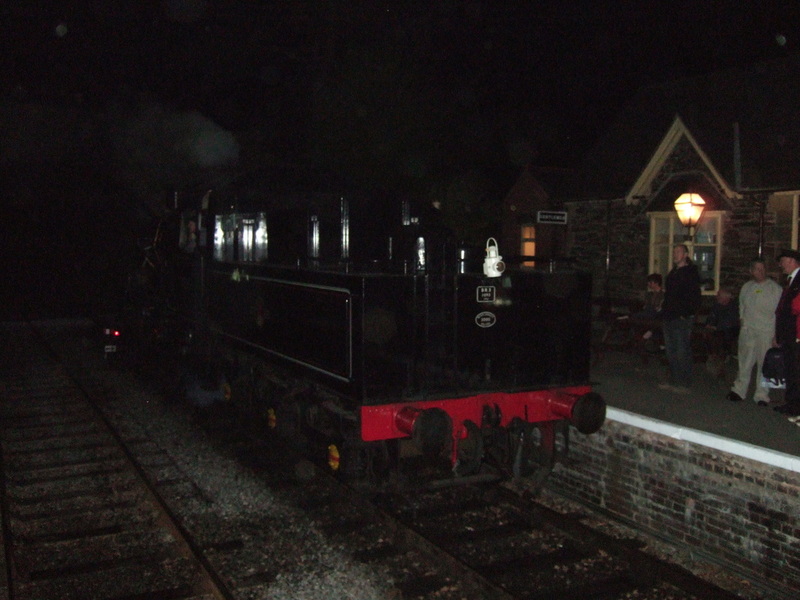 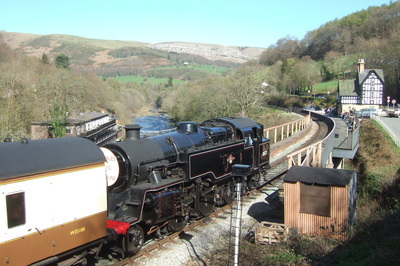 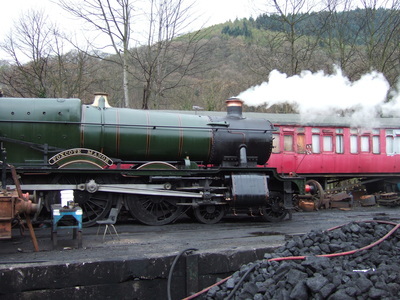 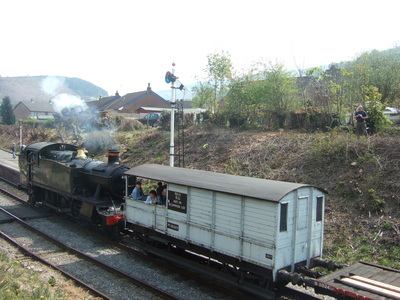 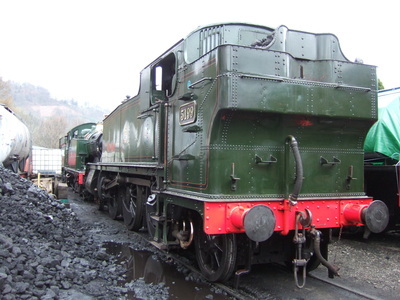 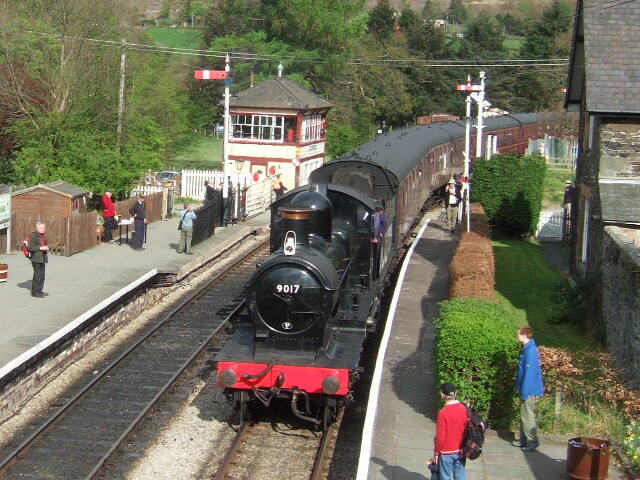 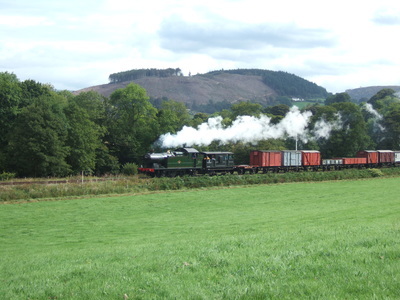 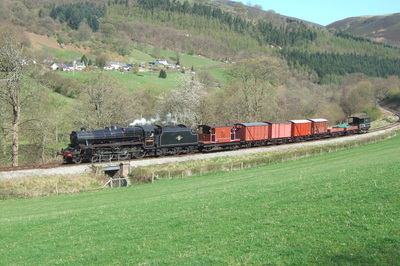 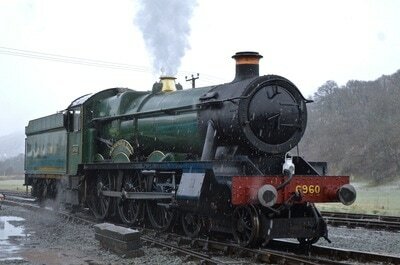 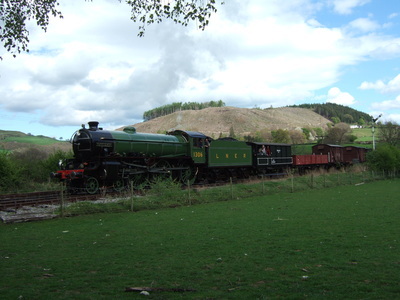 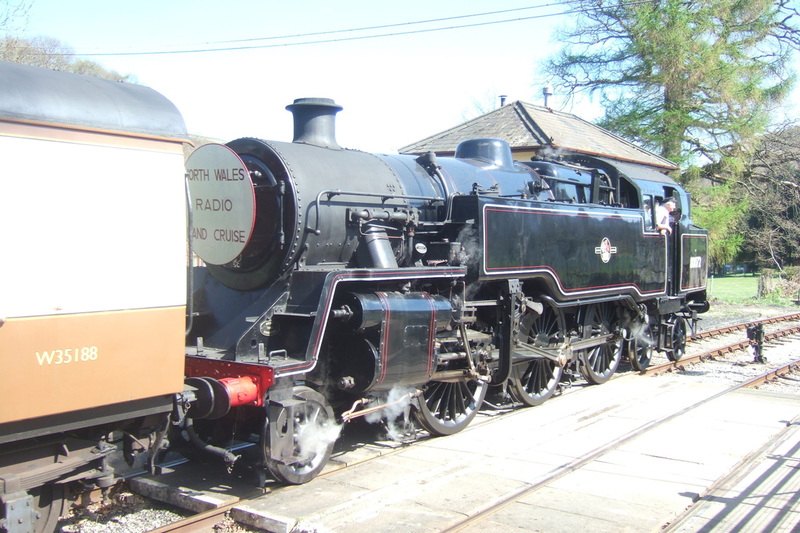 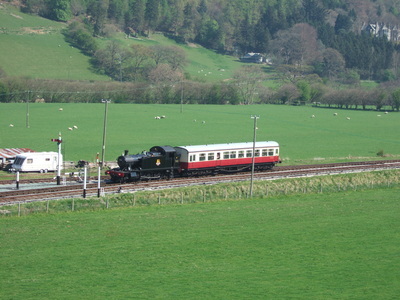 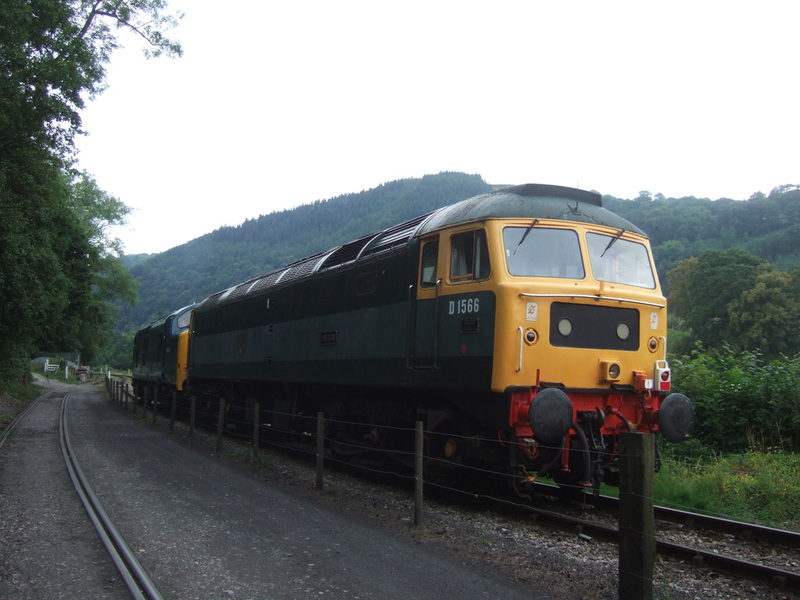 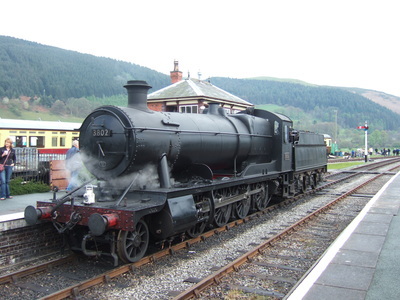 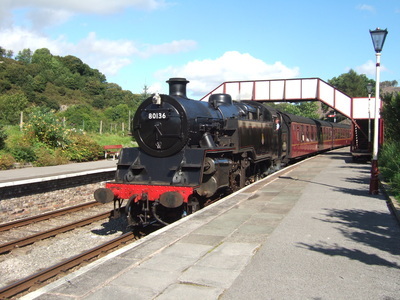 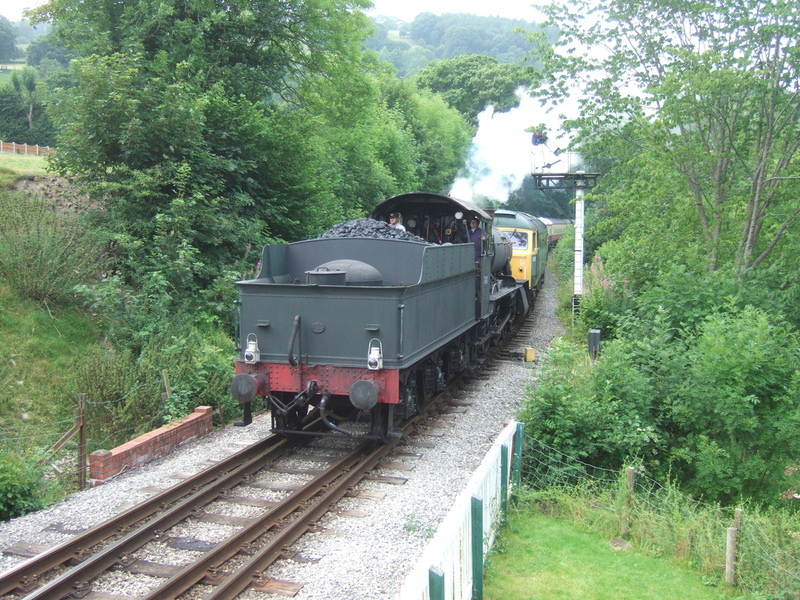 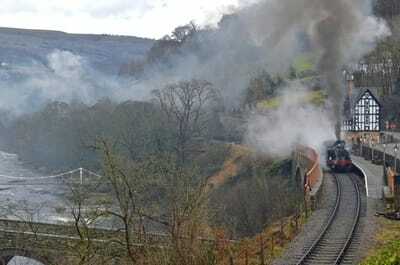 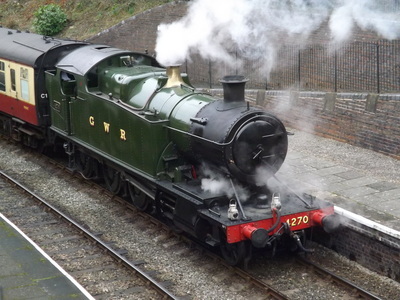 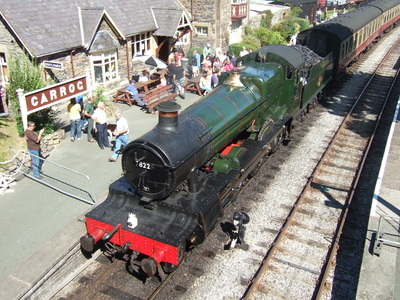 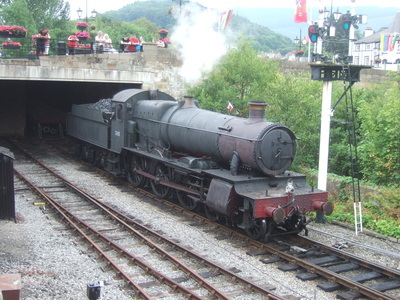 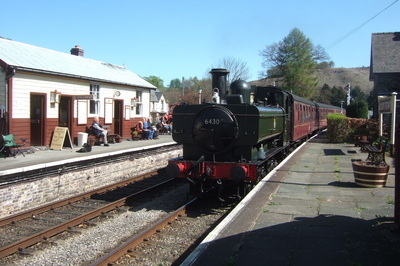 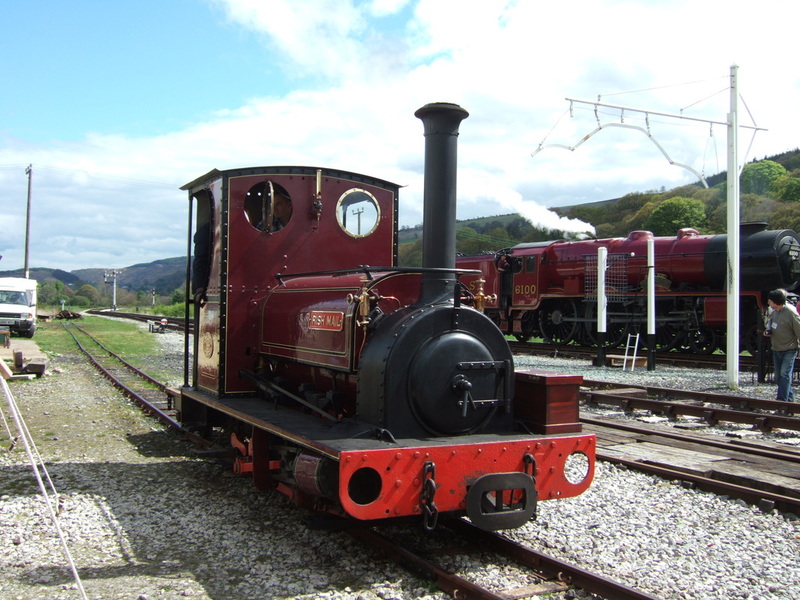 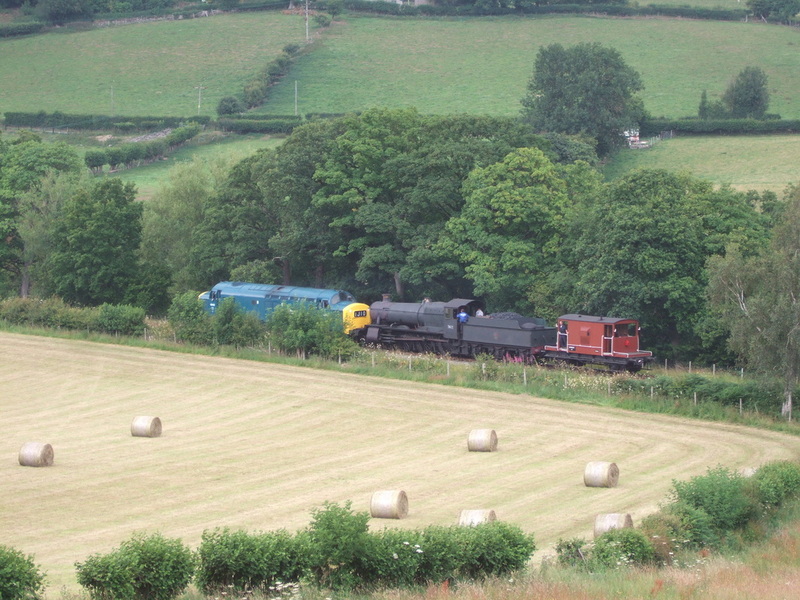 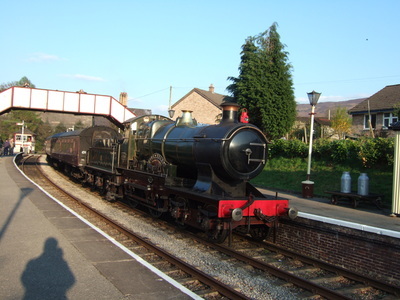 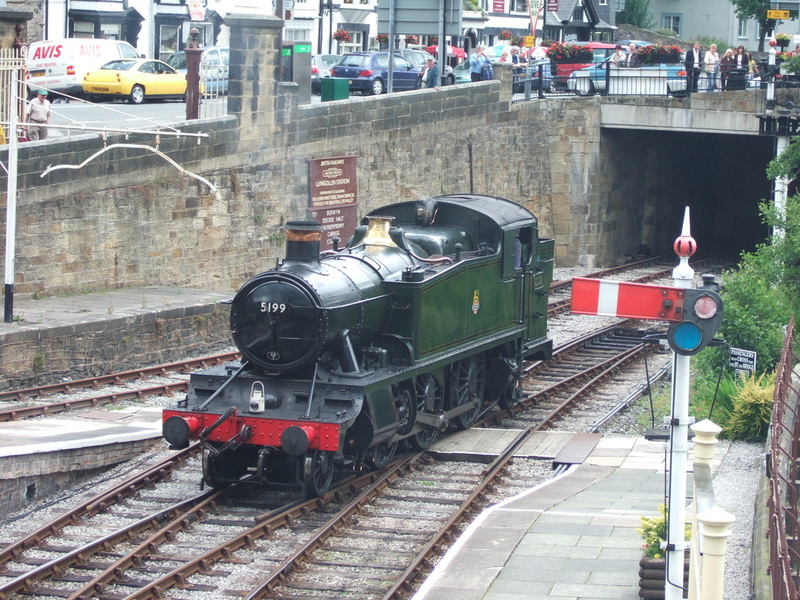 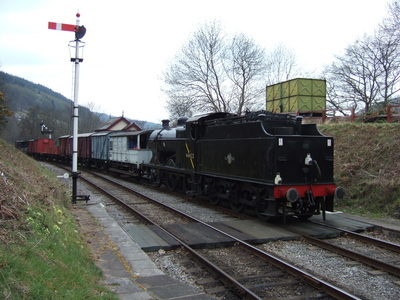 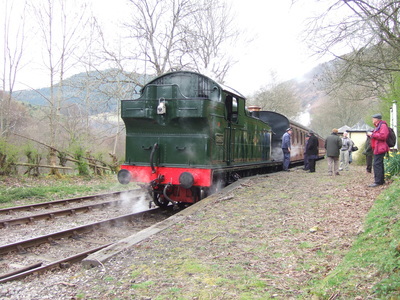 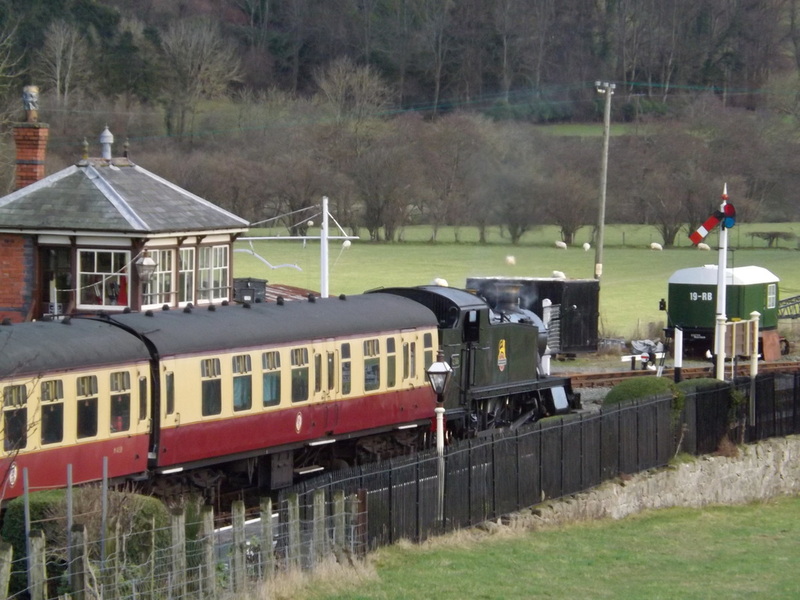 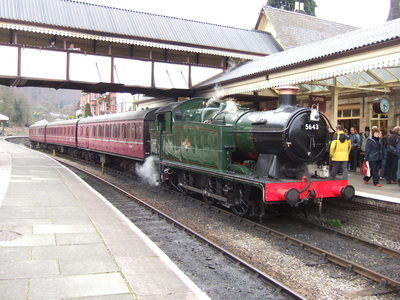 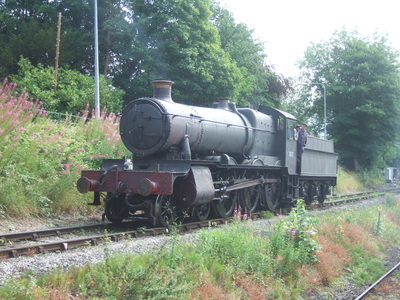 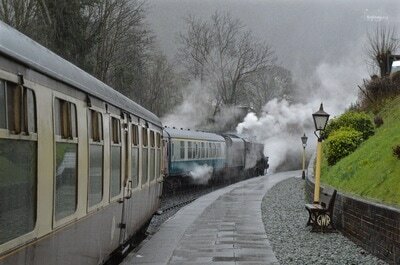 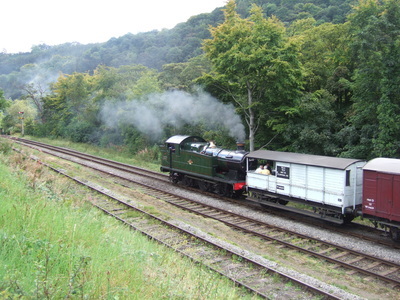 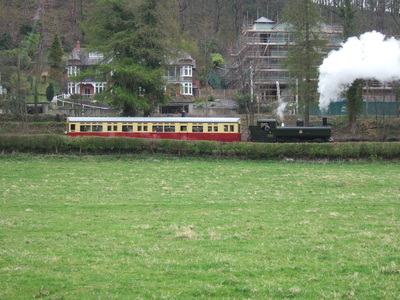 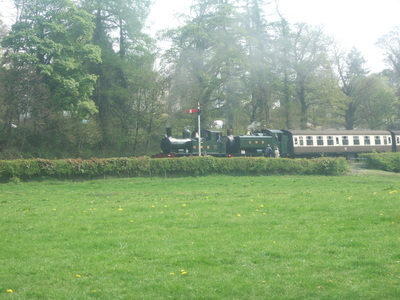 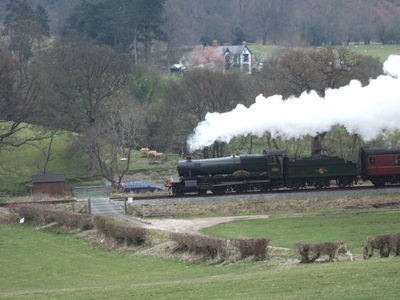 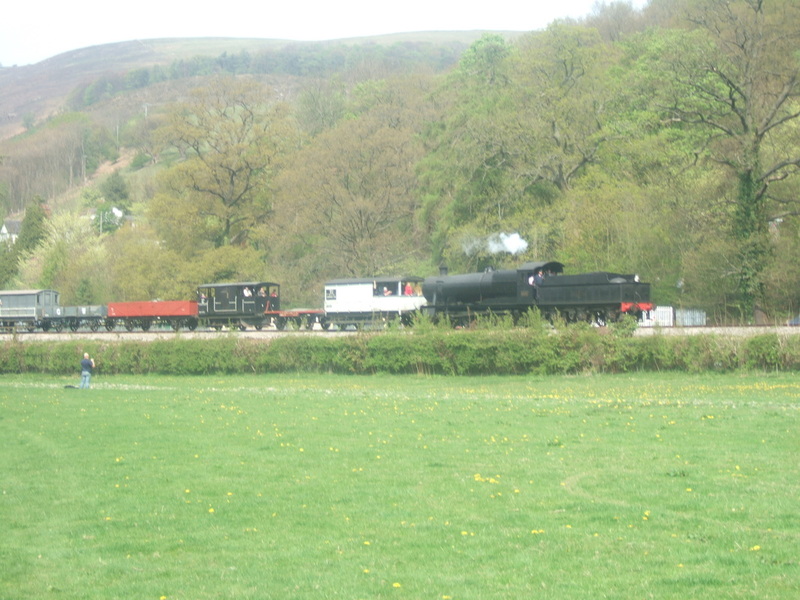 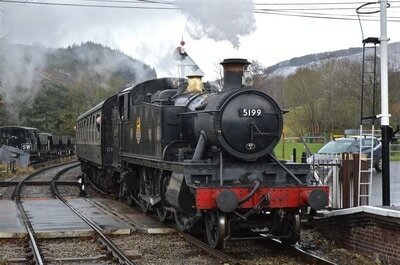 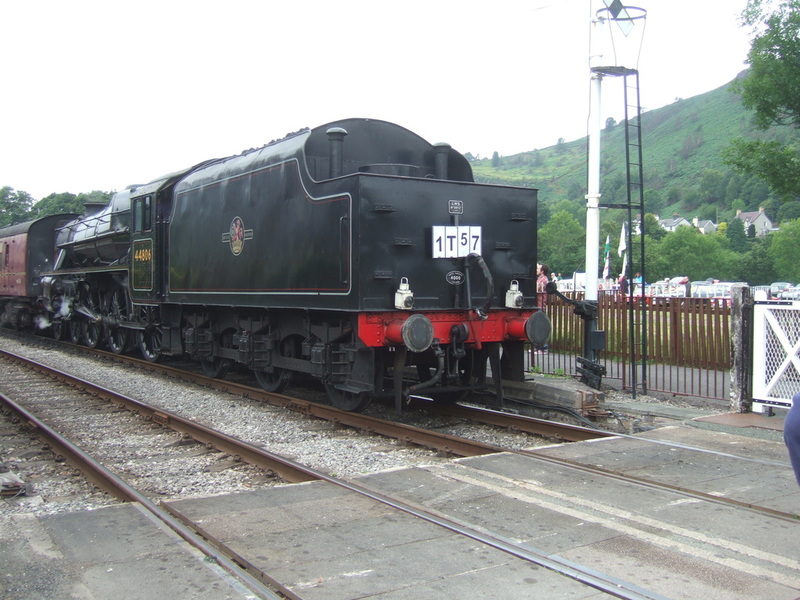 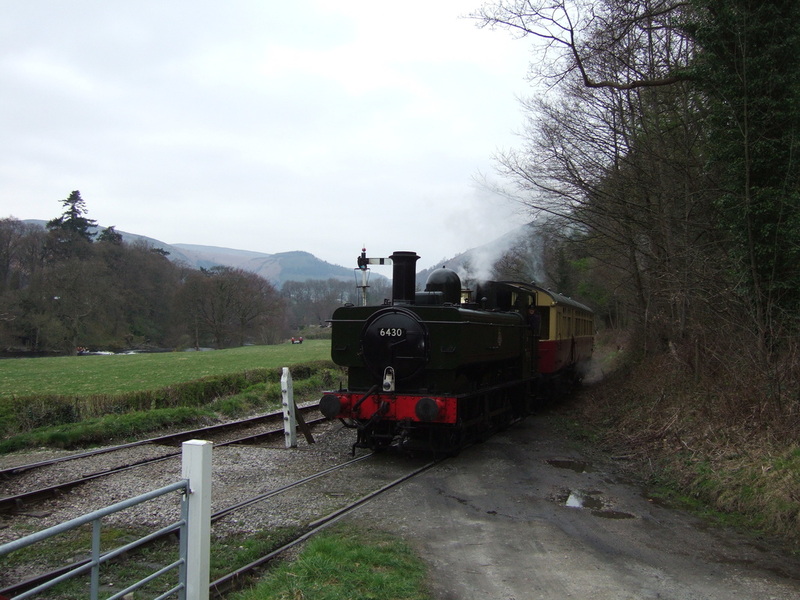 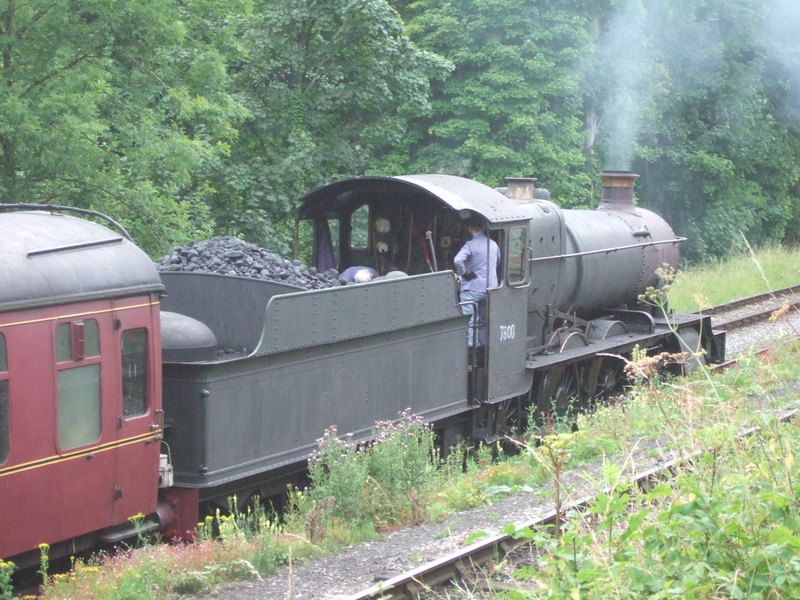 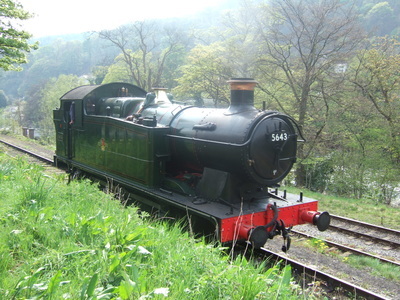 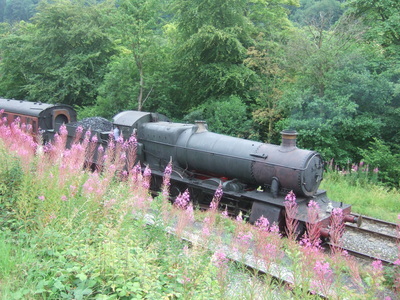 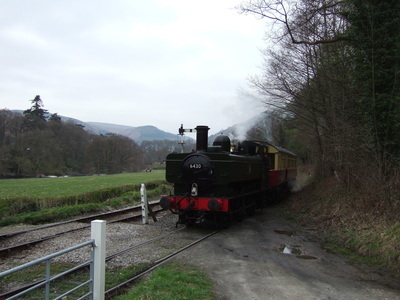 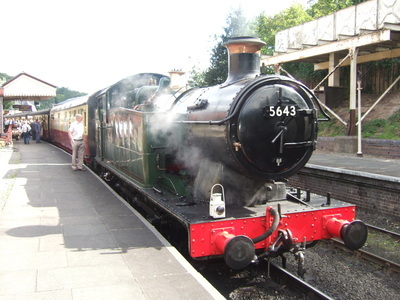 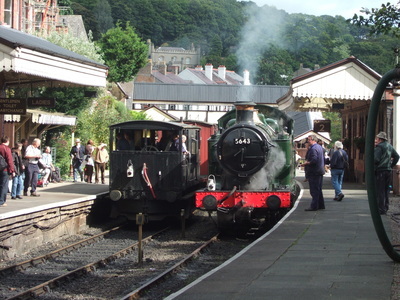 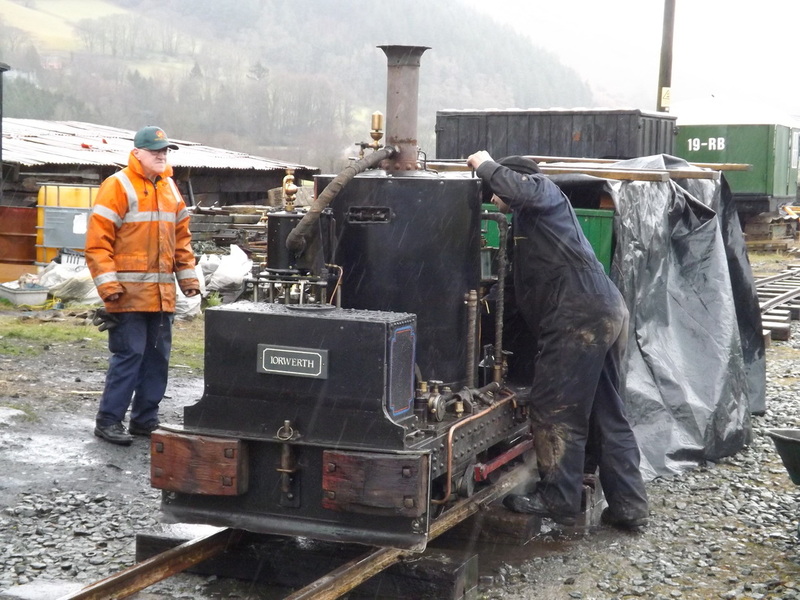 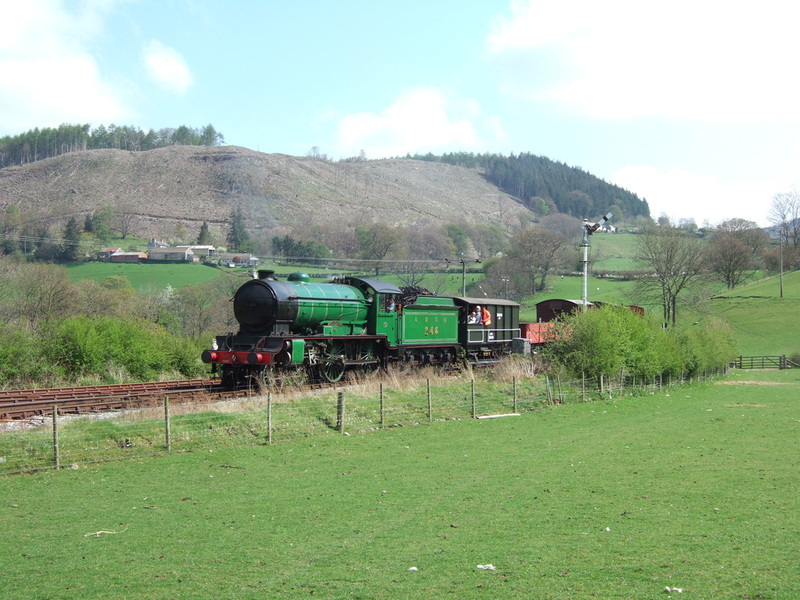 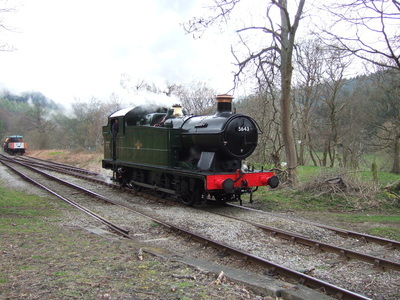 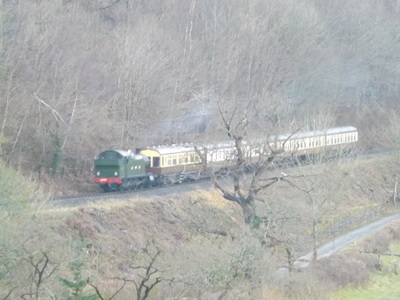 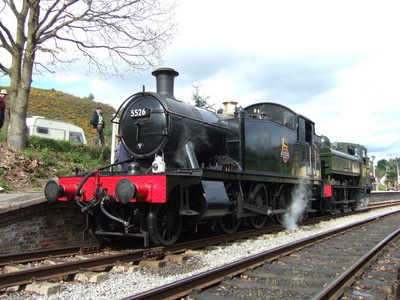 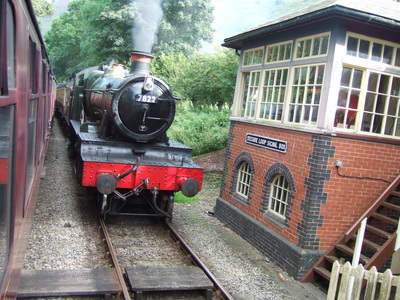 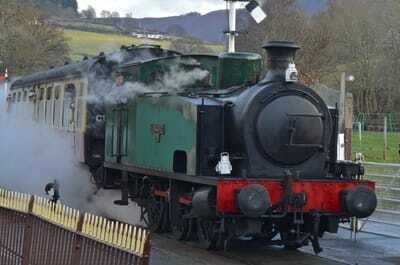 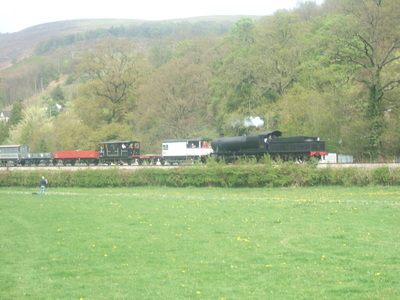 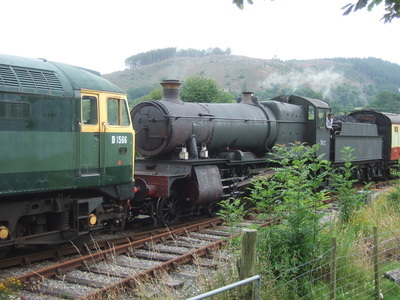 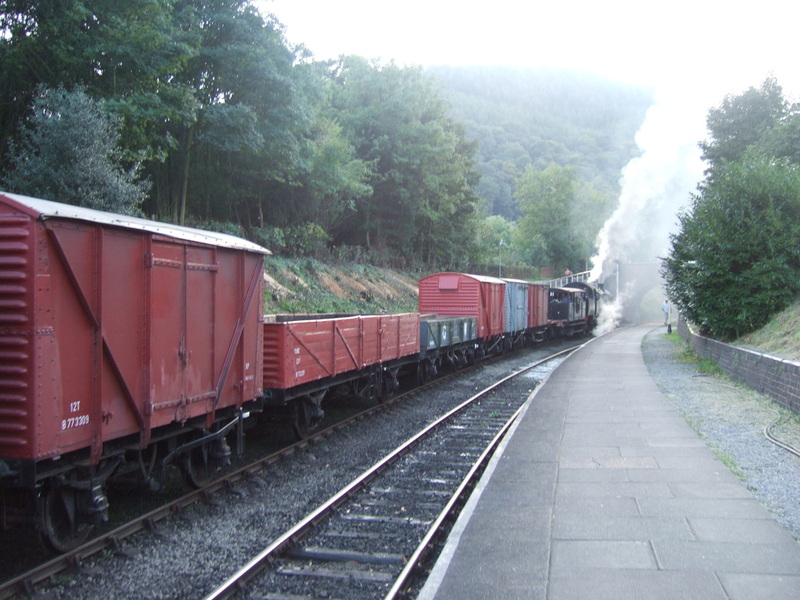 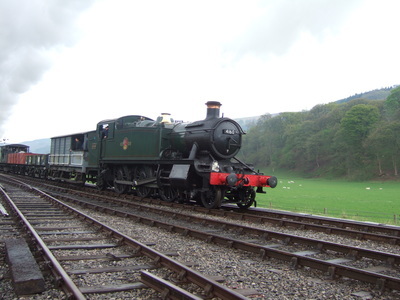 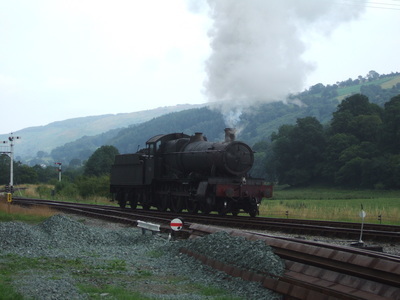 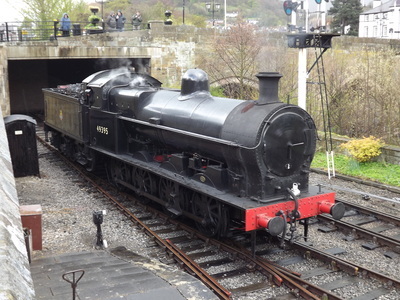 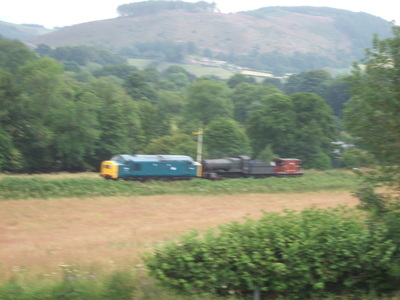 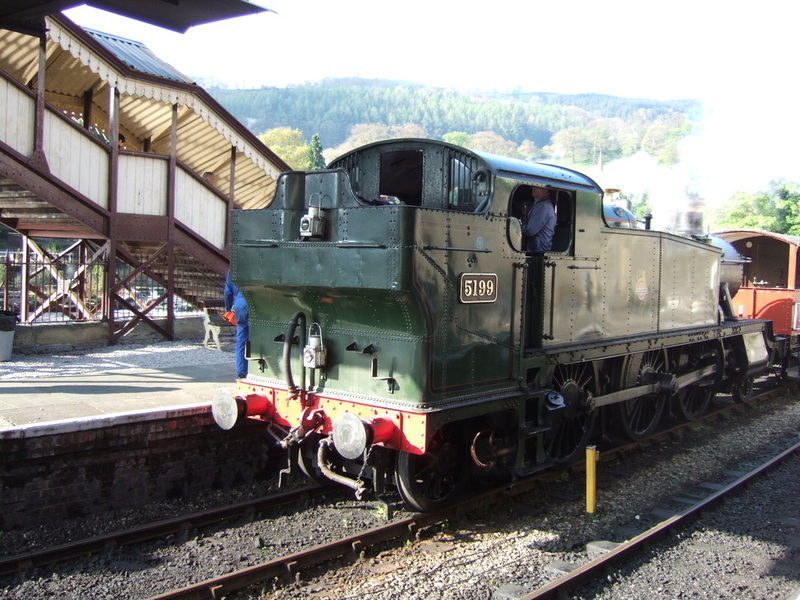 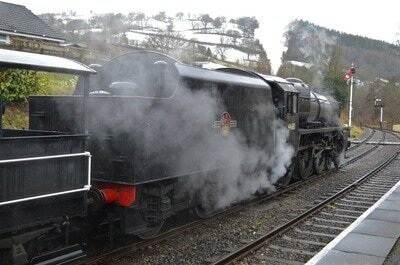 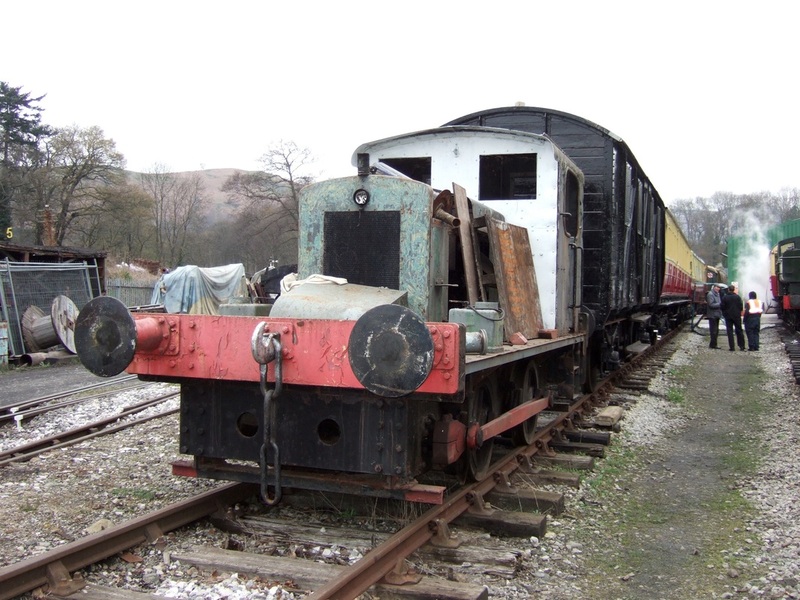 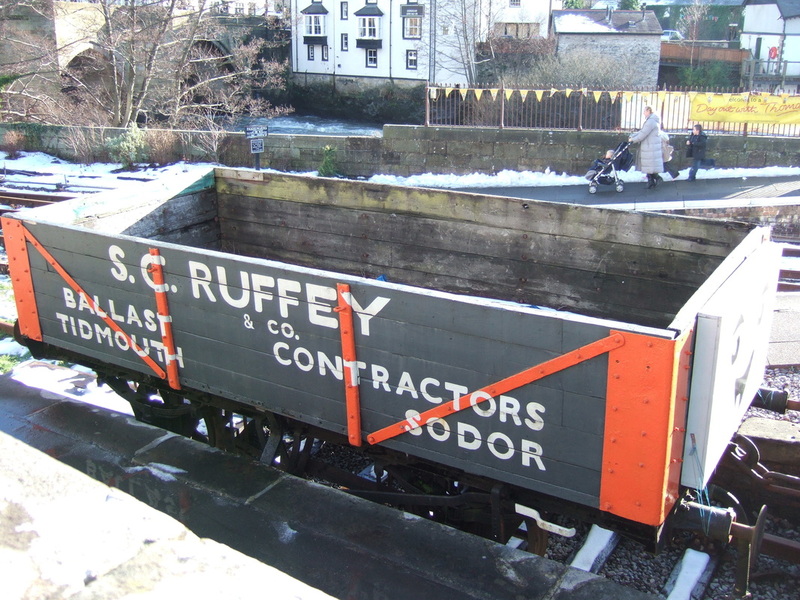 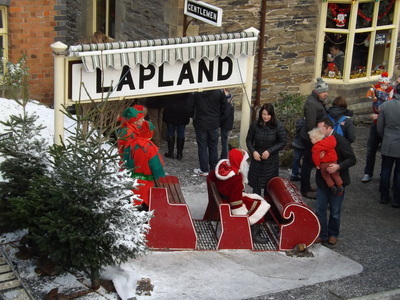 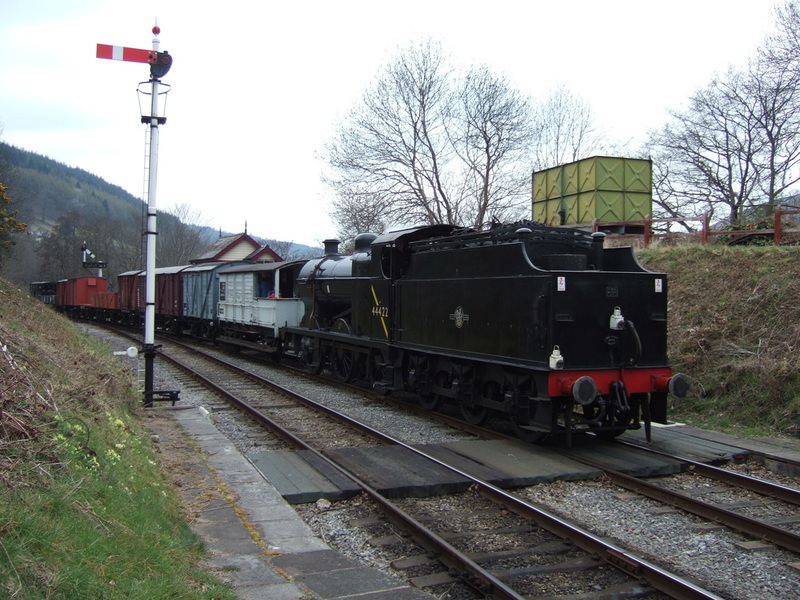 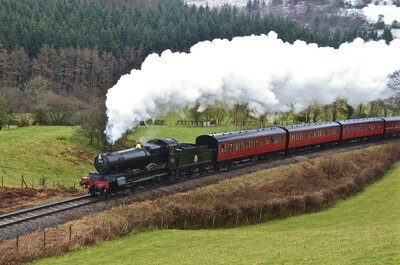 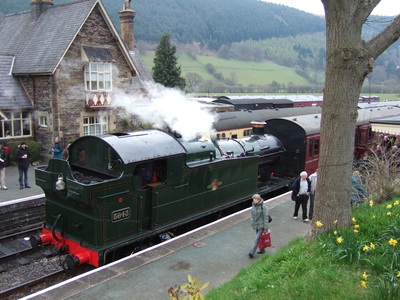 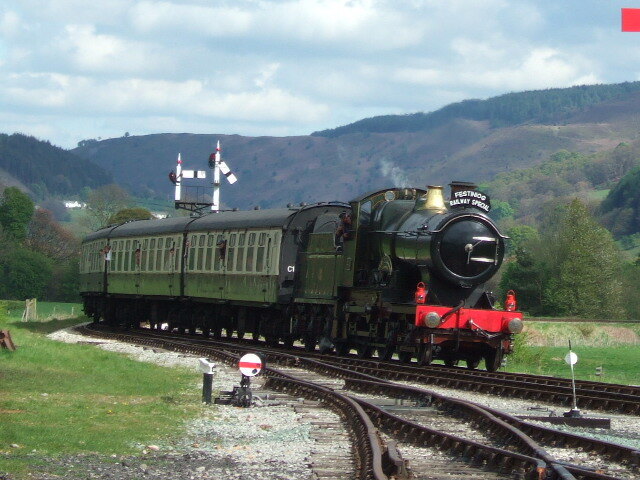 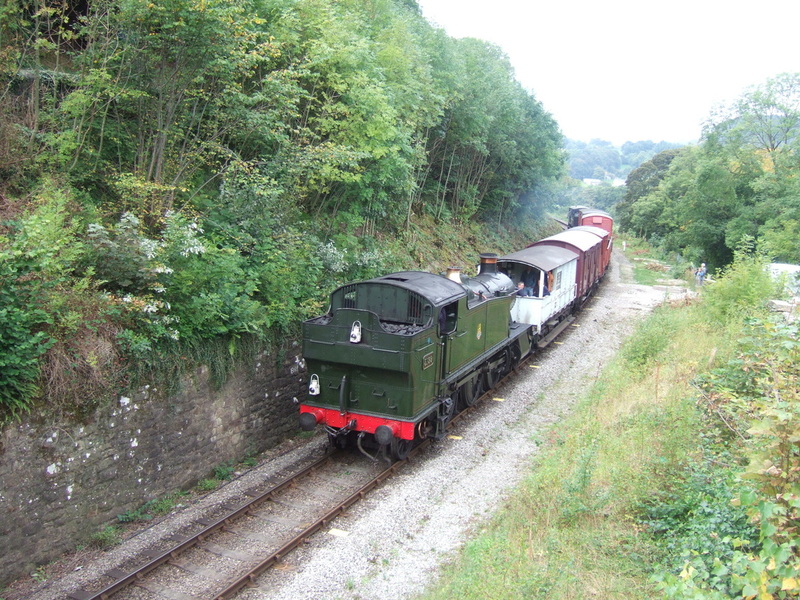 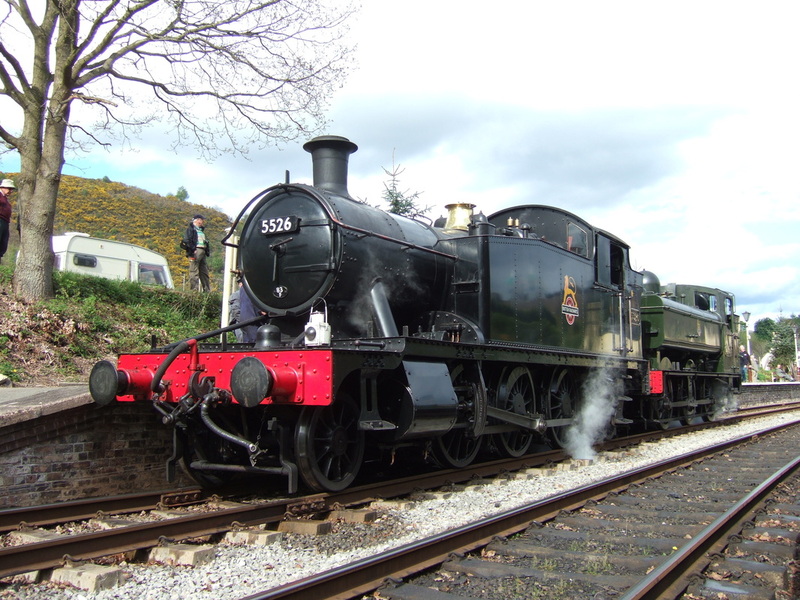 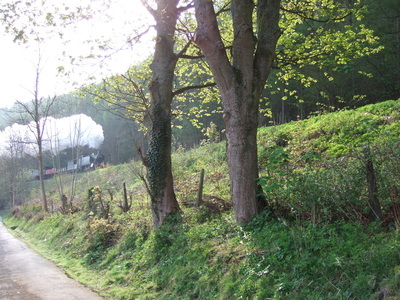 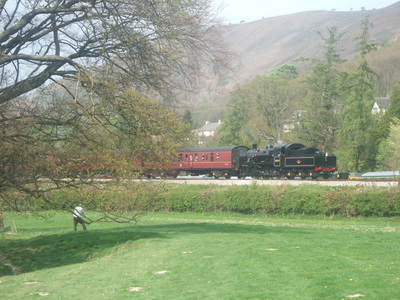 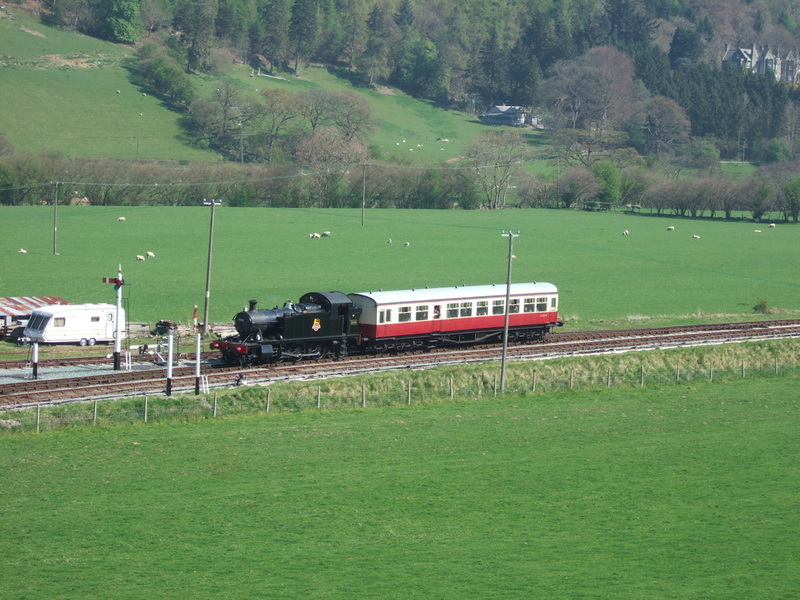 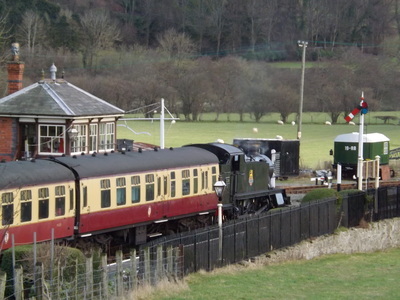 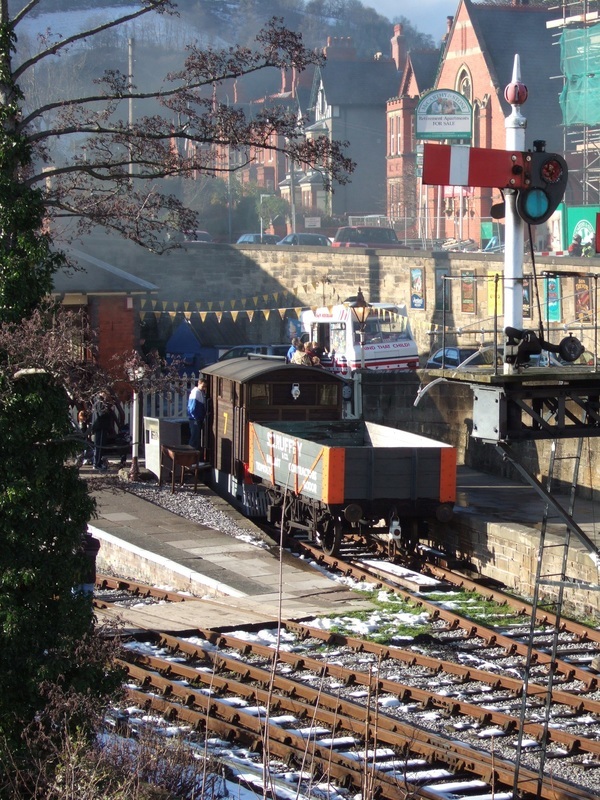 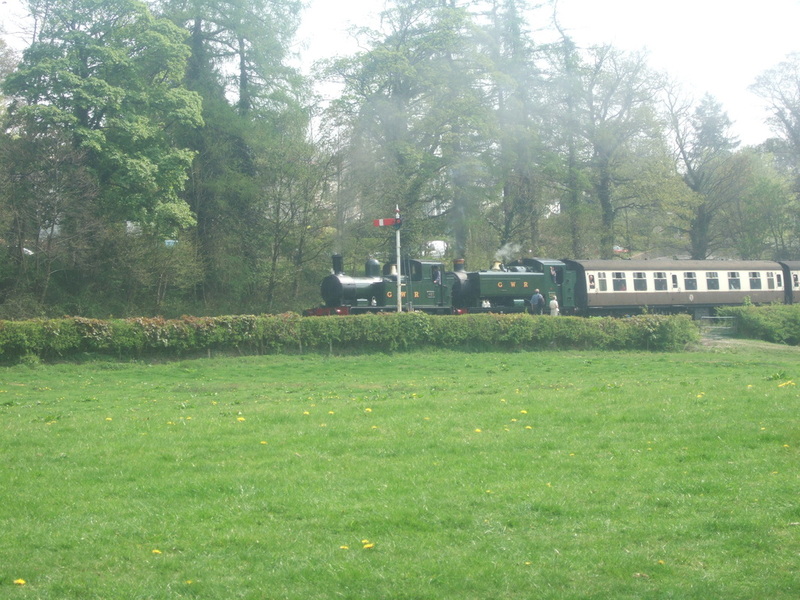 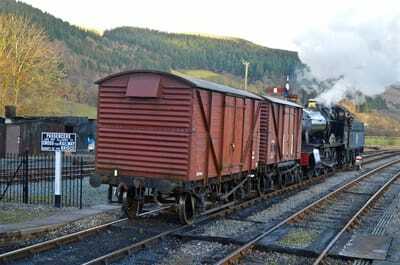 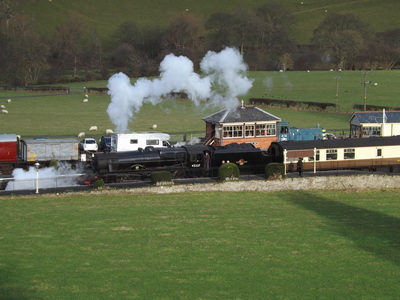 Back in 2008 the locomotive was still in Llangollen, and seen below at Pentrefelin yard. 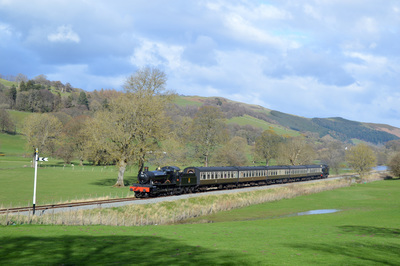 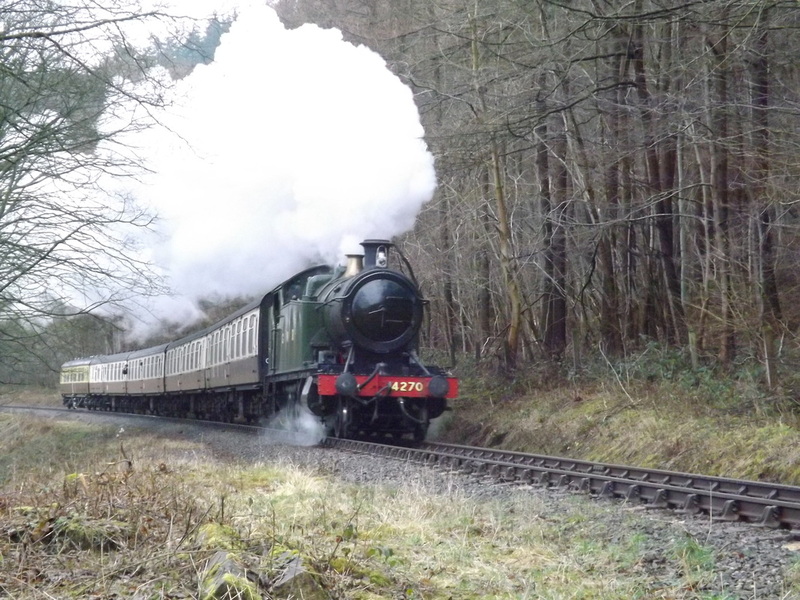 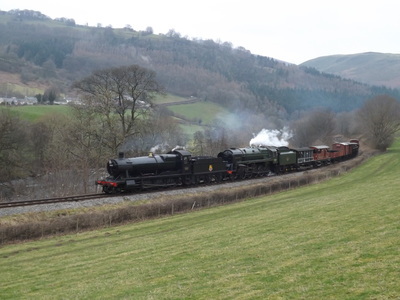 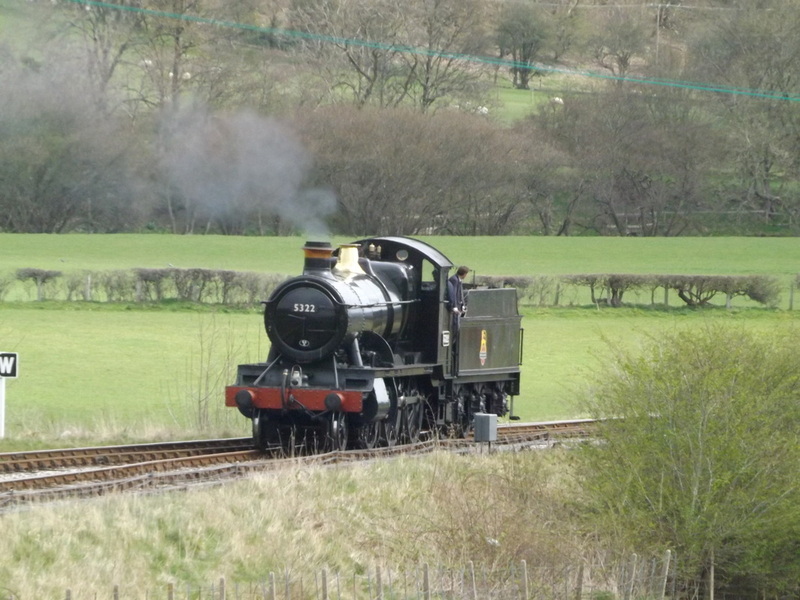 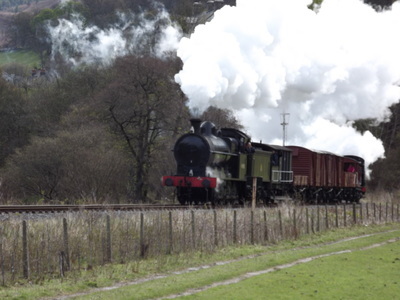 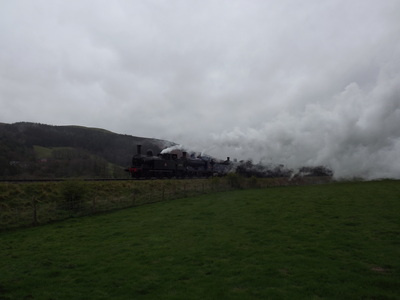 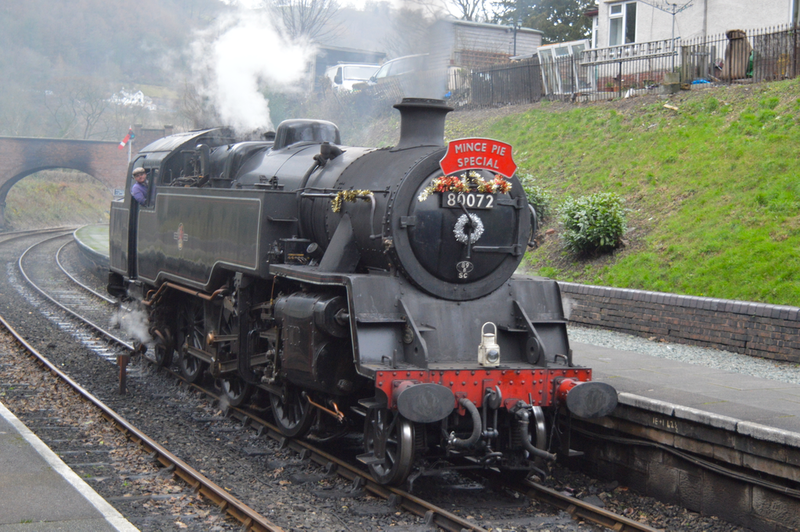 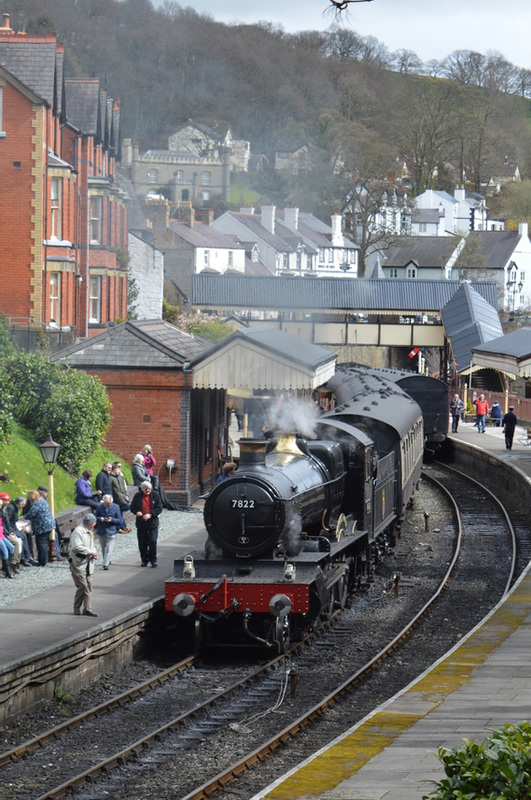 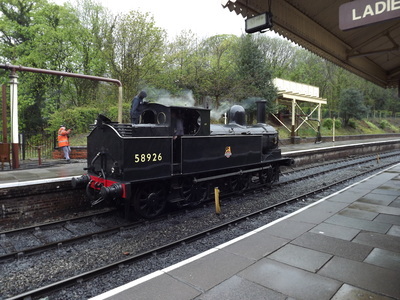 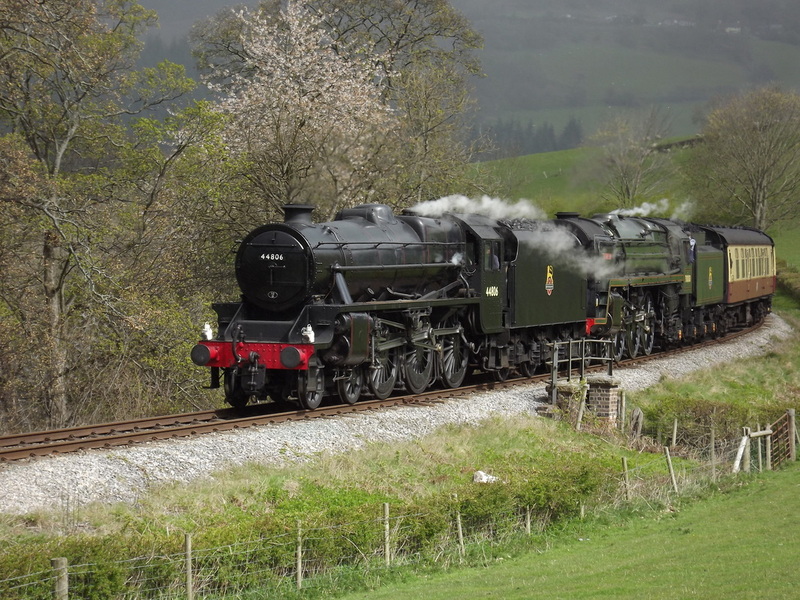 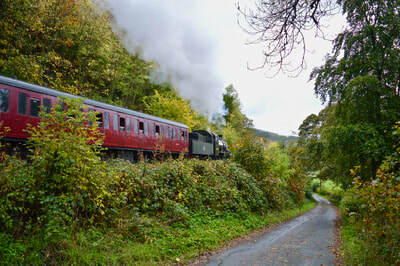 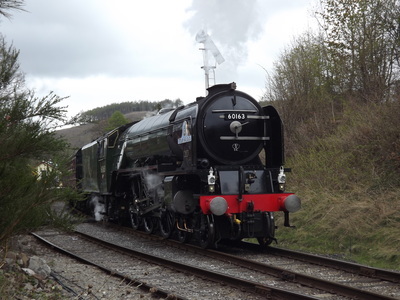 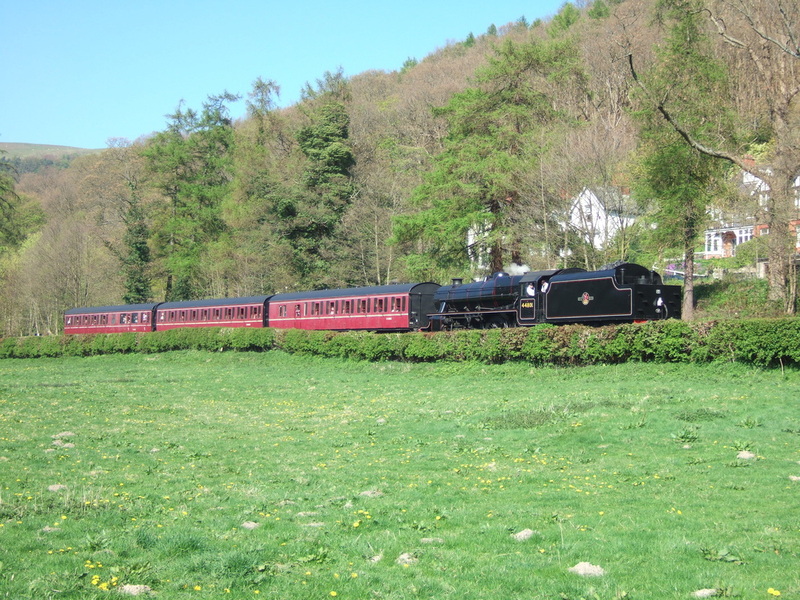 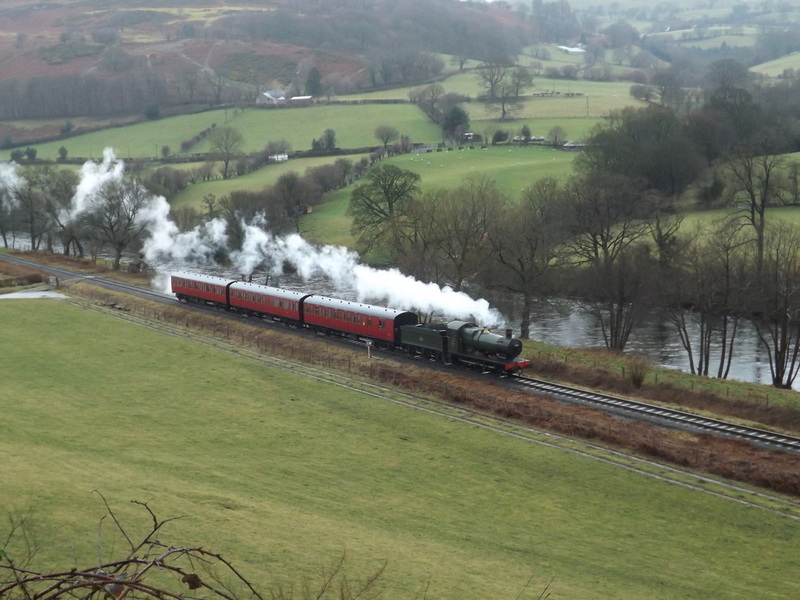 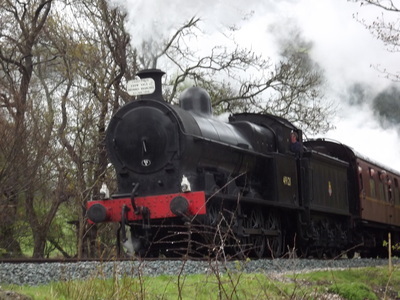 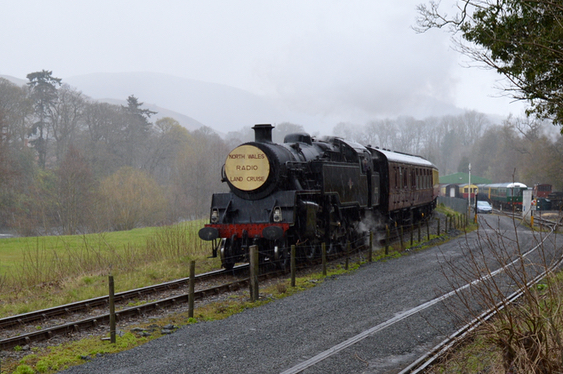 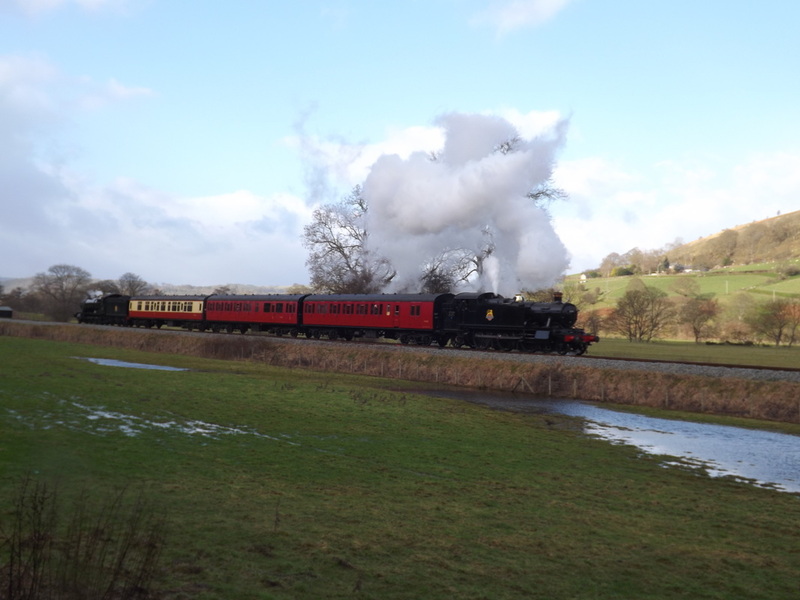 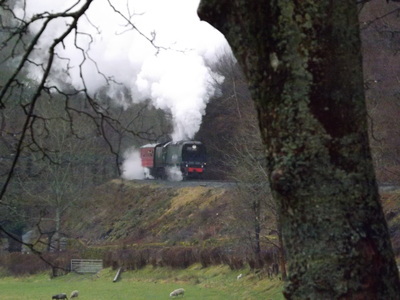 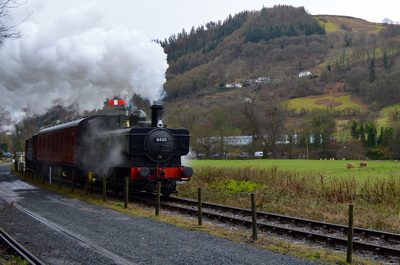 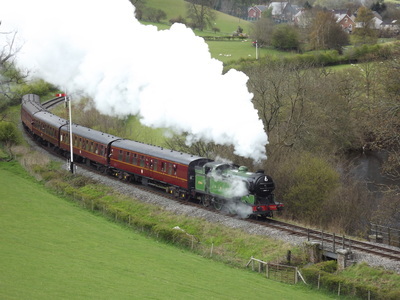 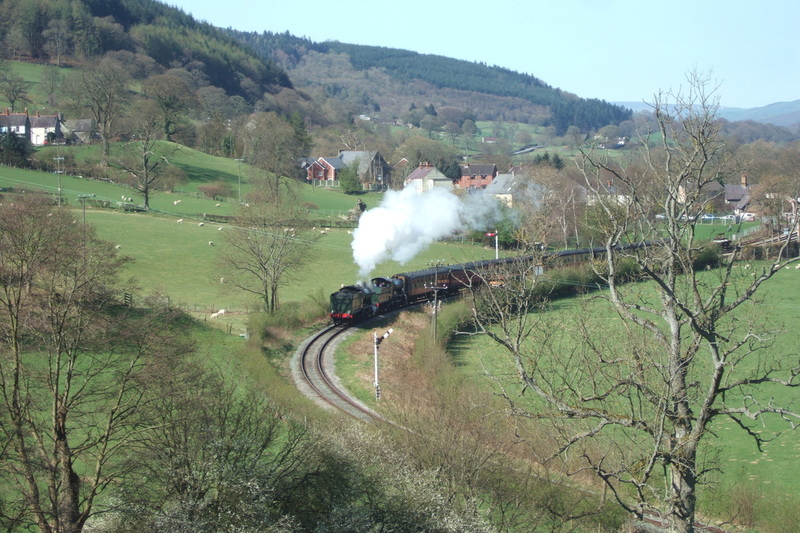 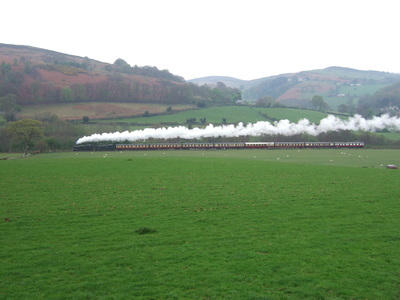 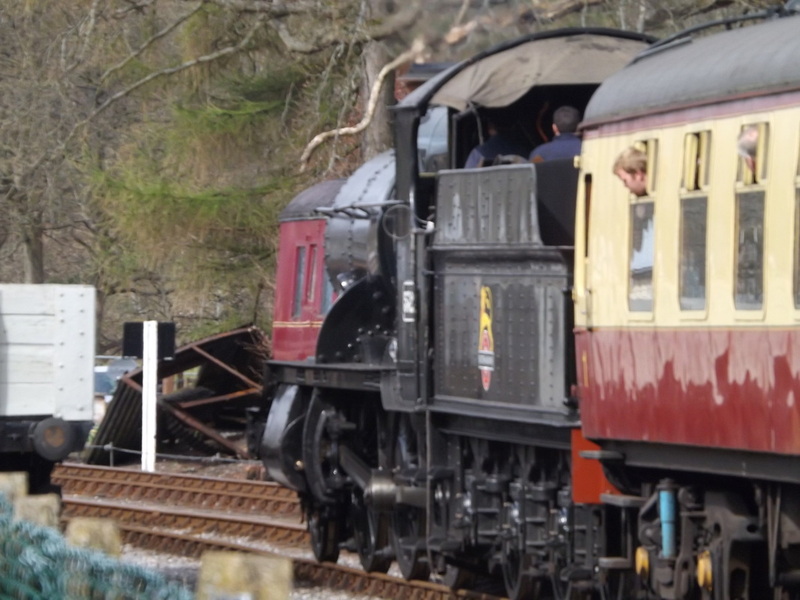 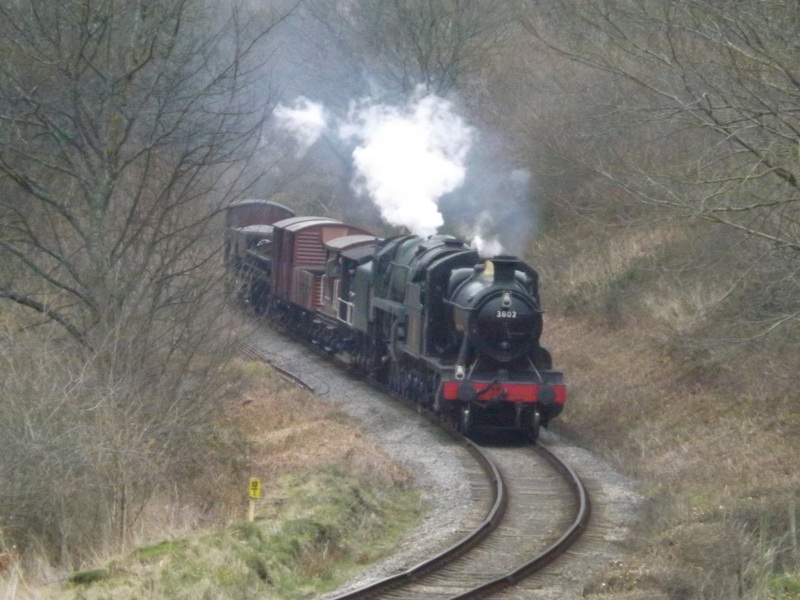 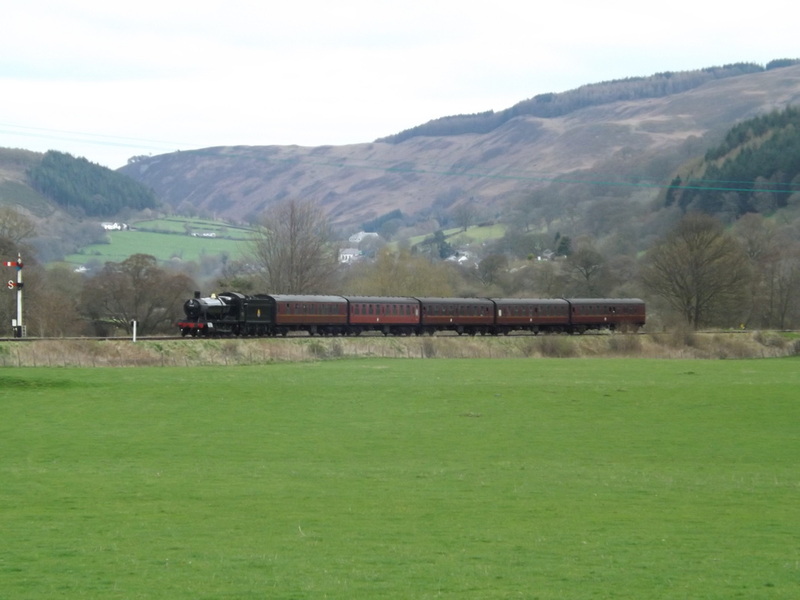 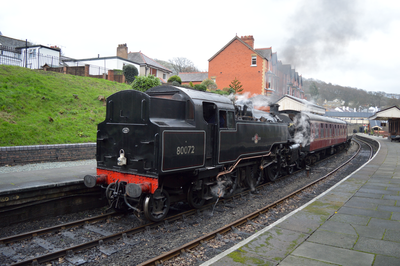 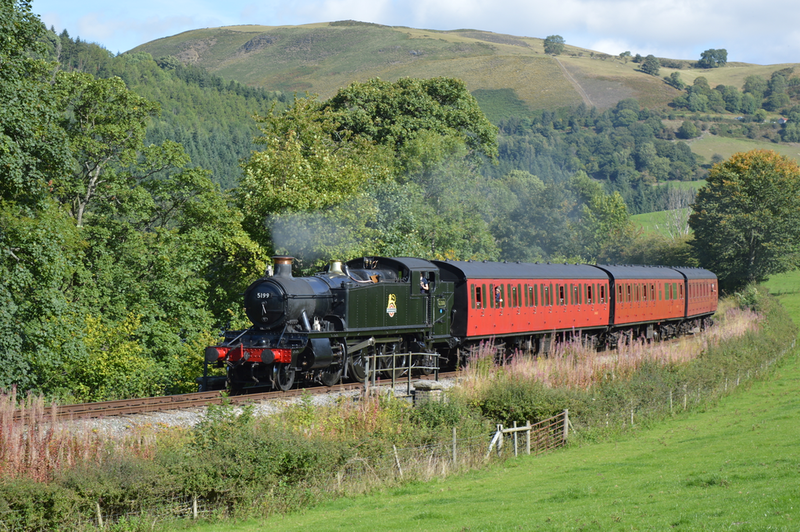 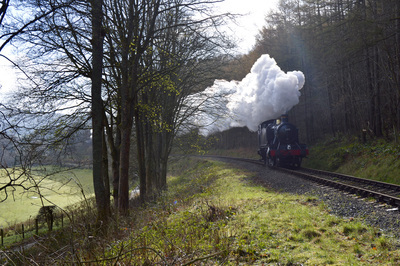 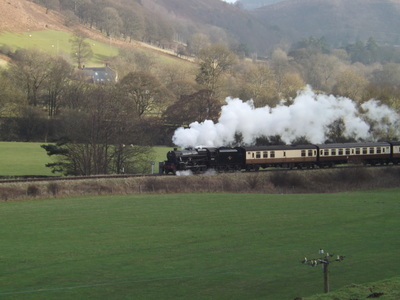 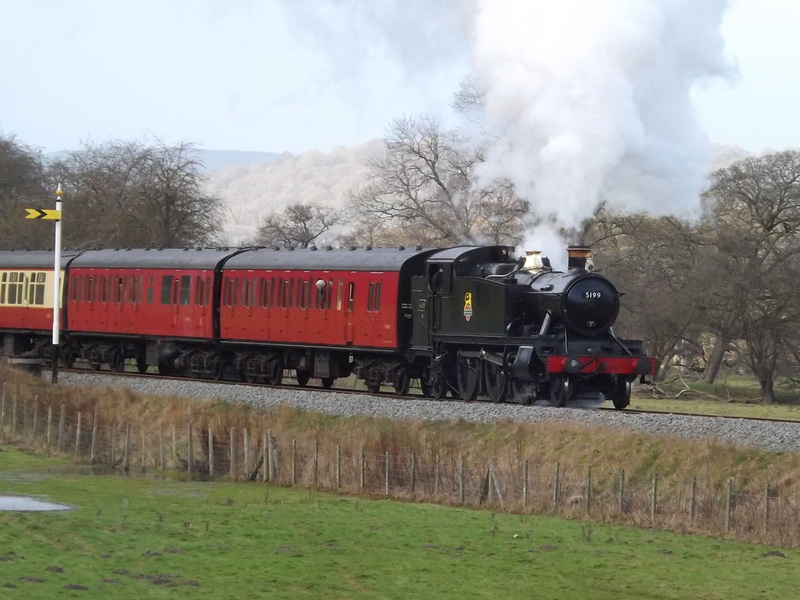 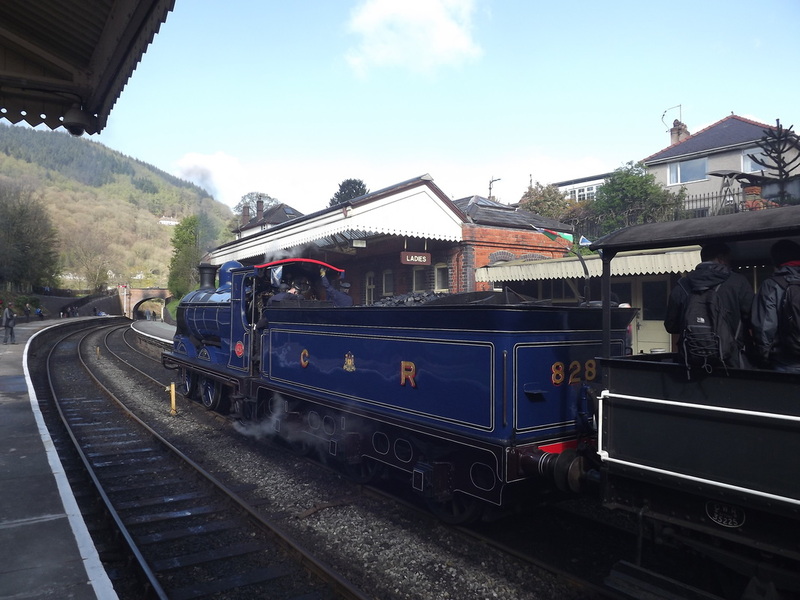 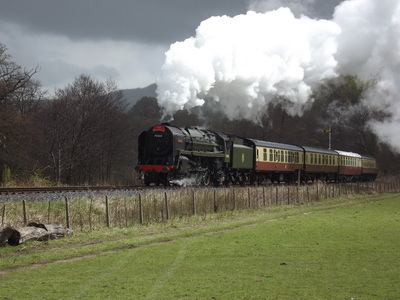 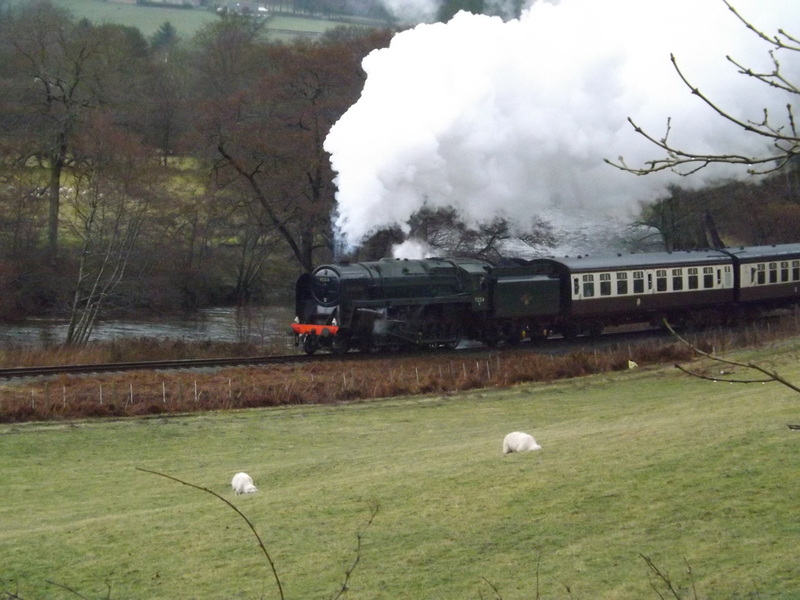 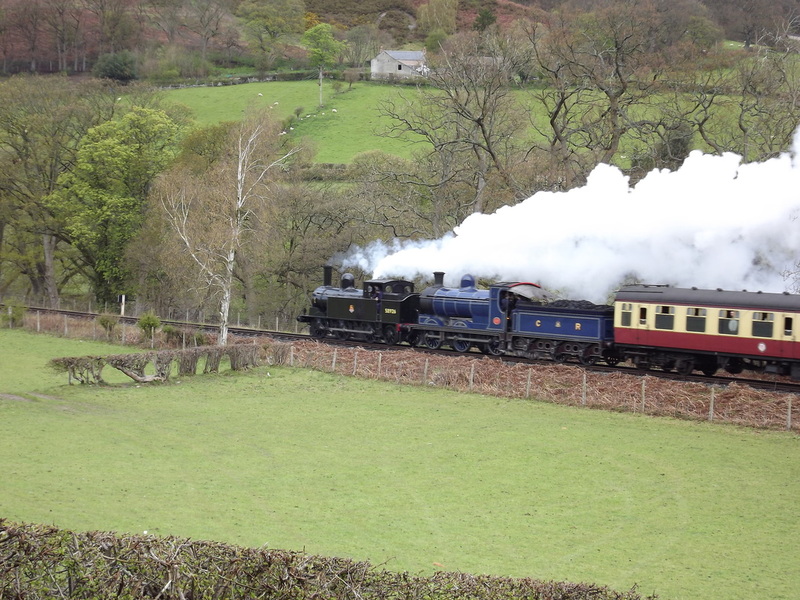 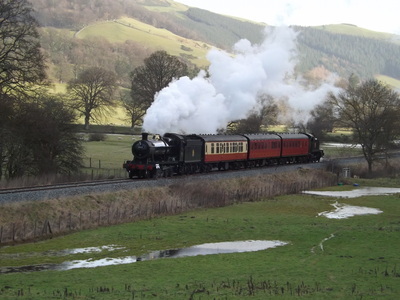 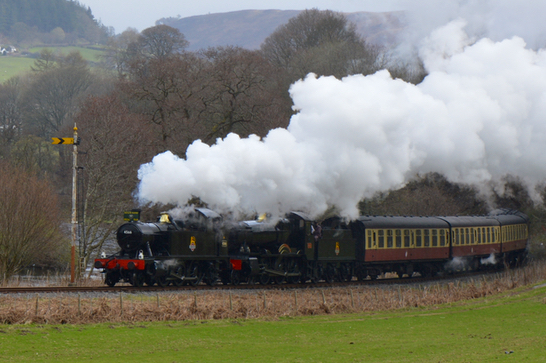 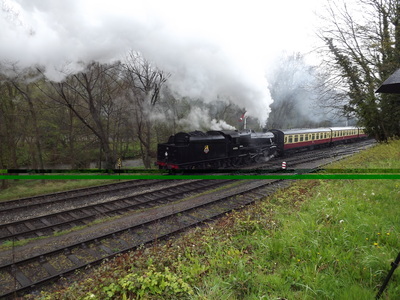 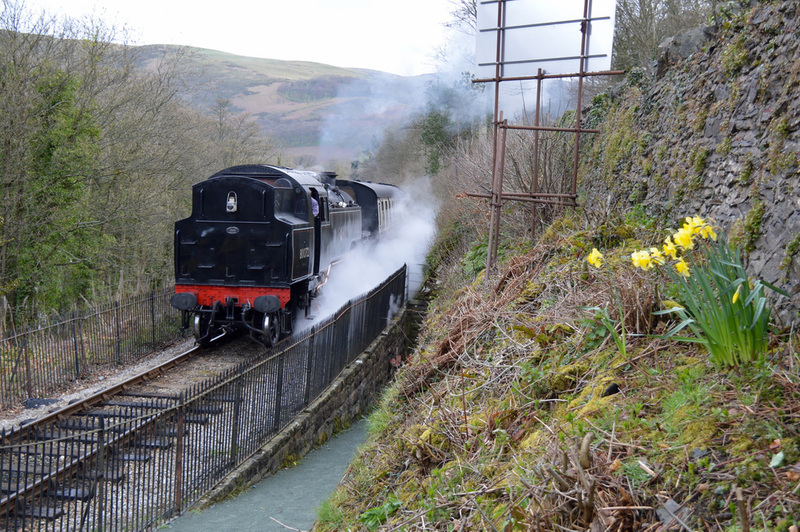 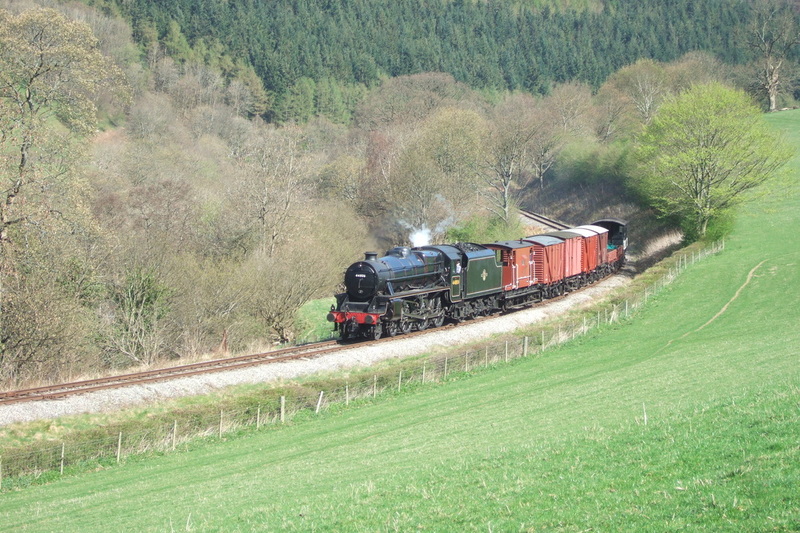 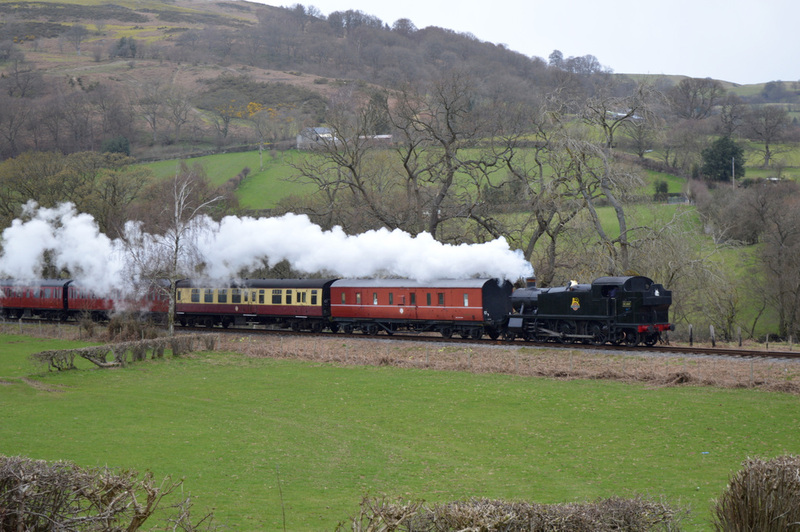 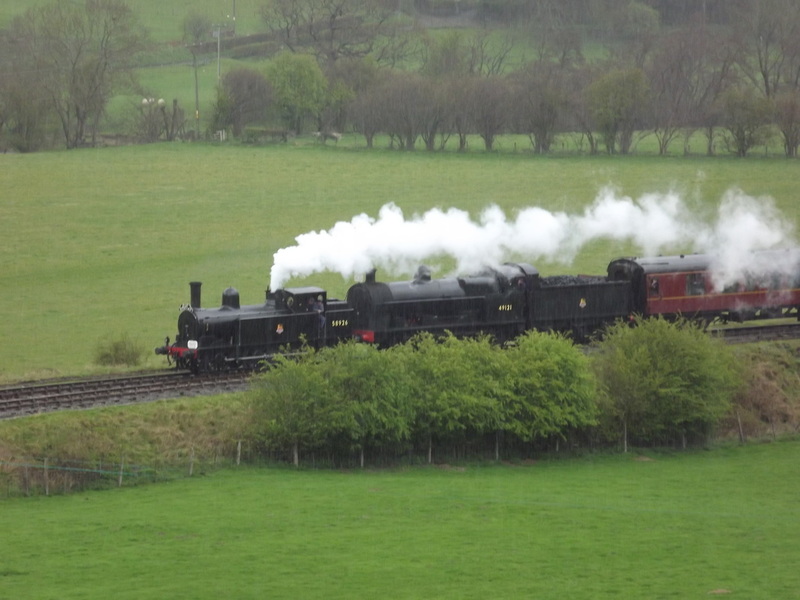 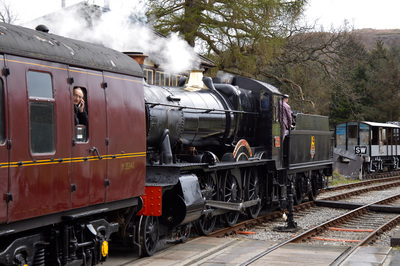 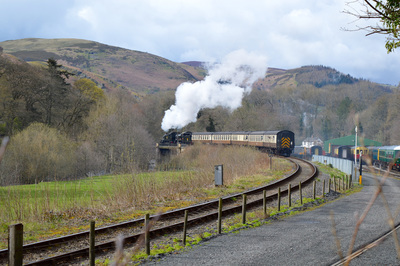 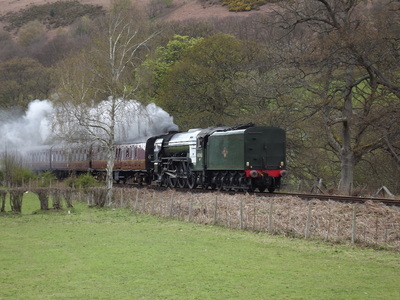 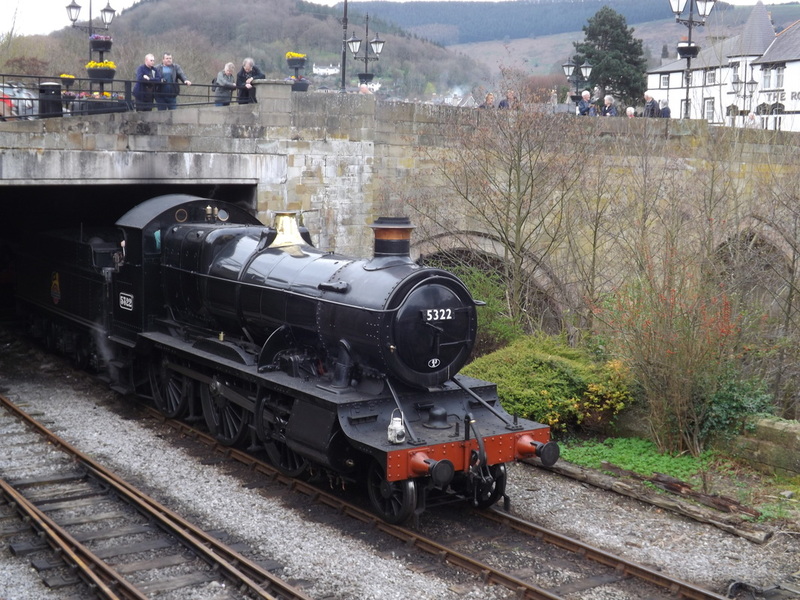 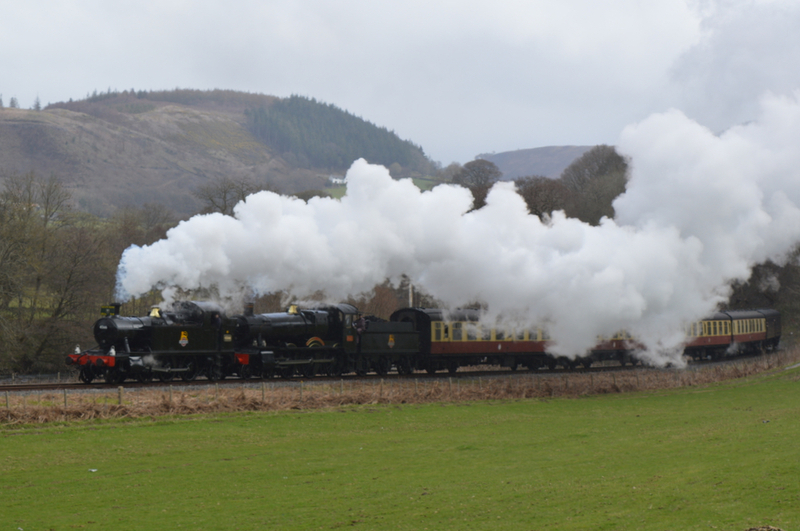 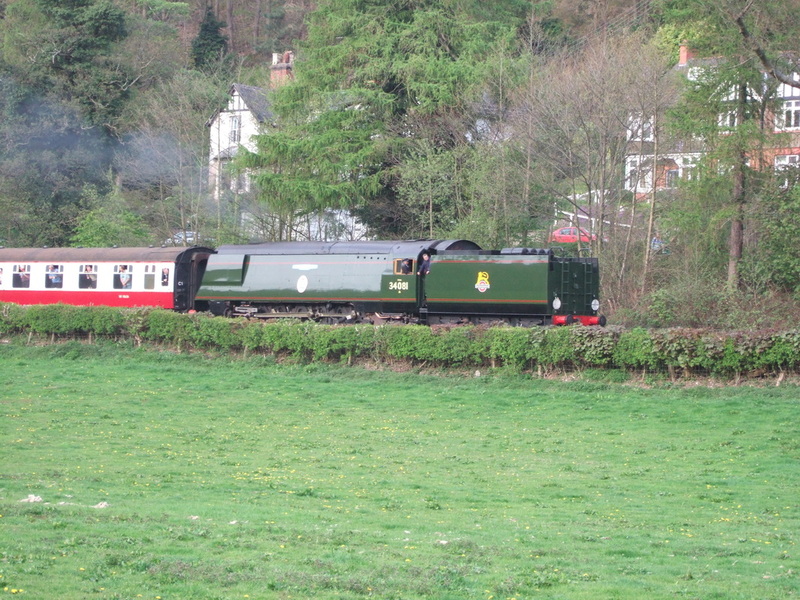 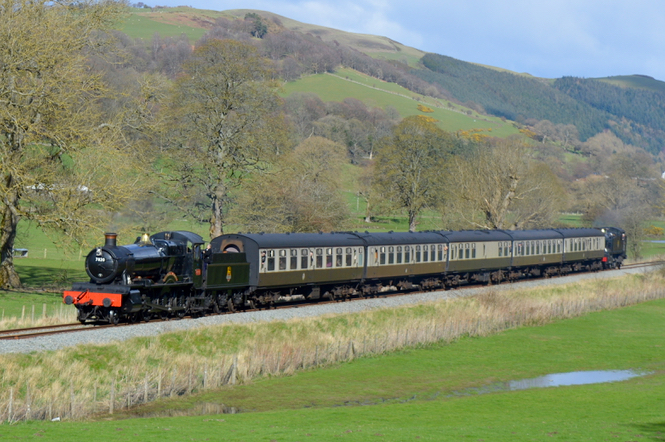 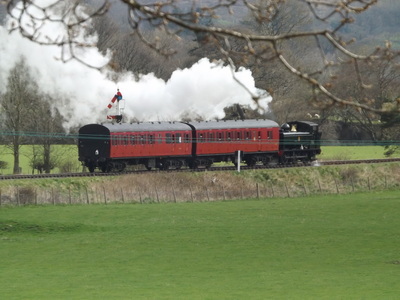 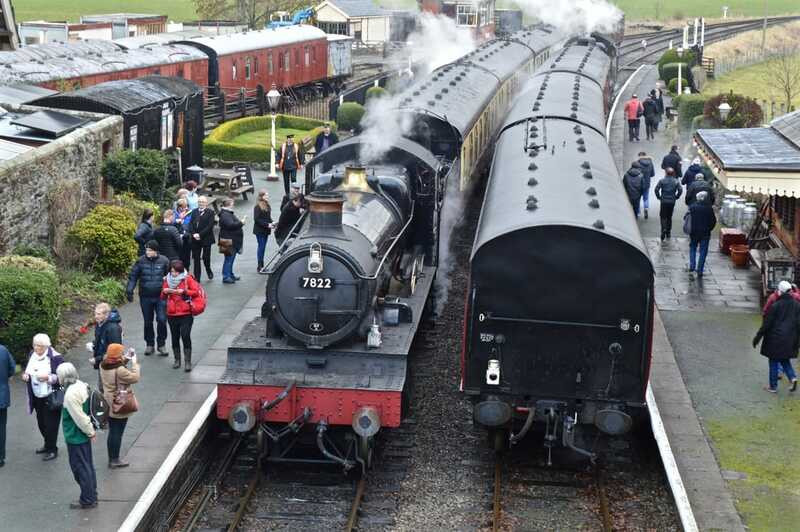 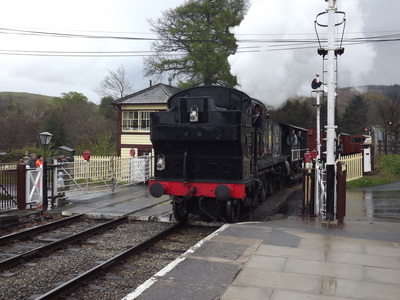 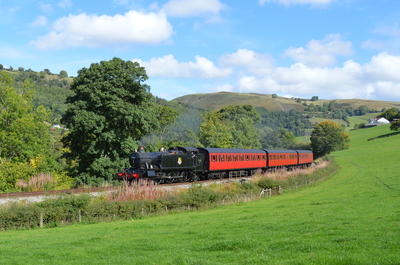 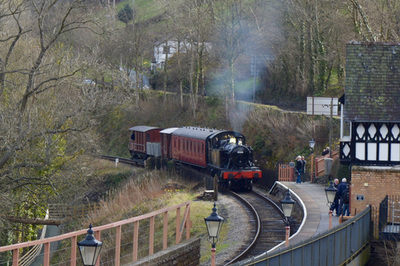 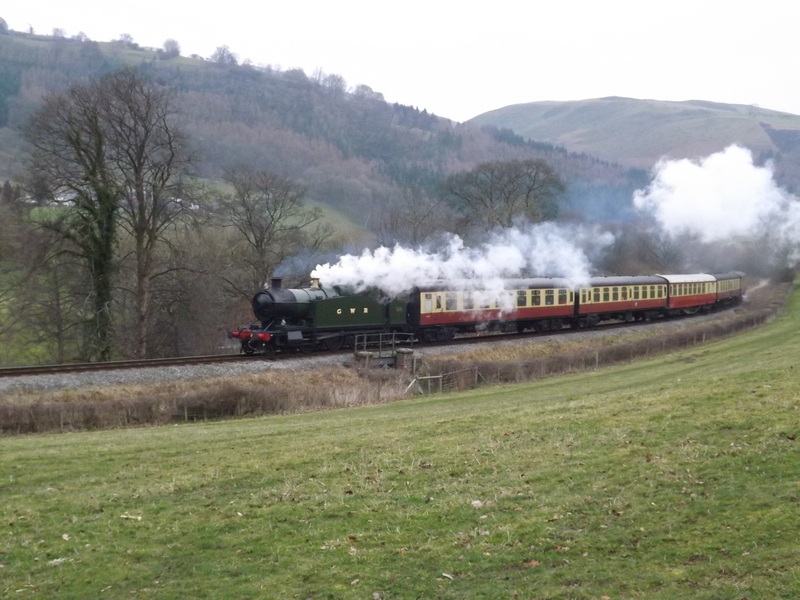 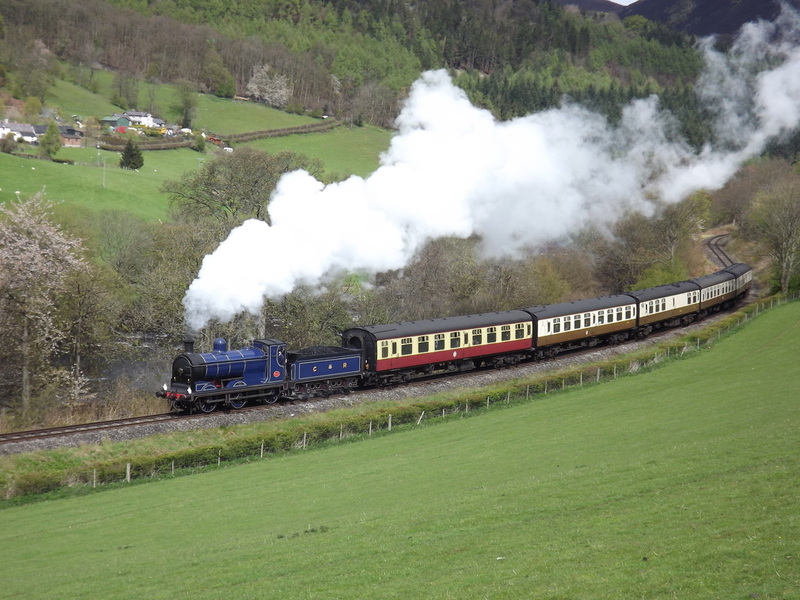 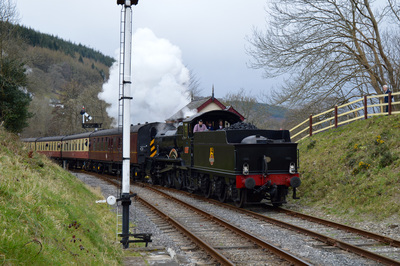 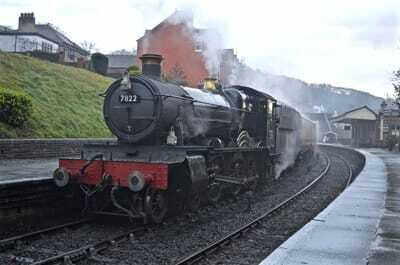 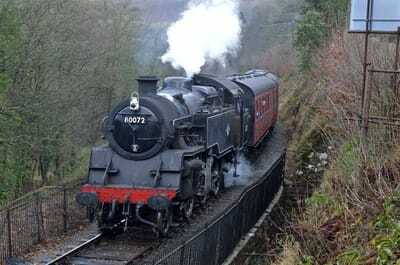 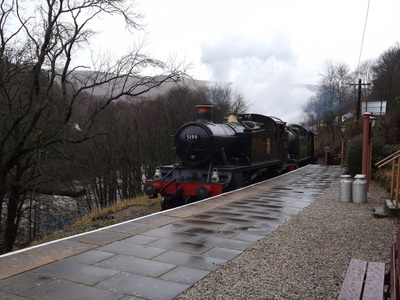 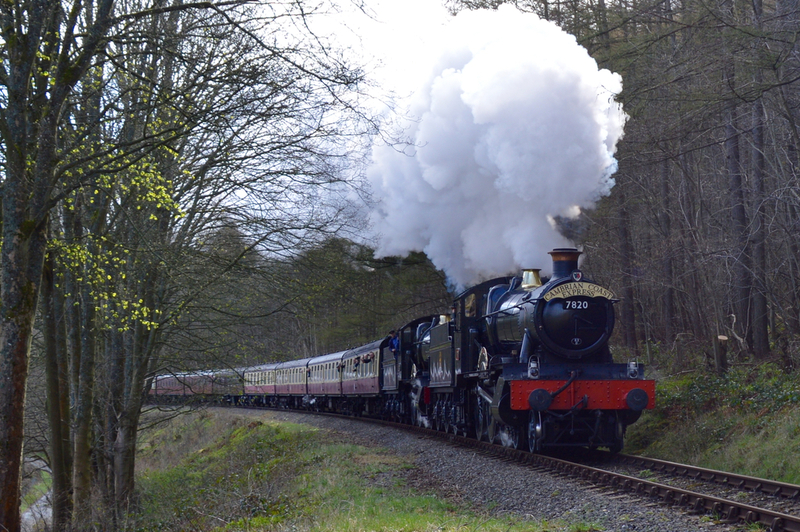 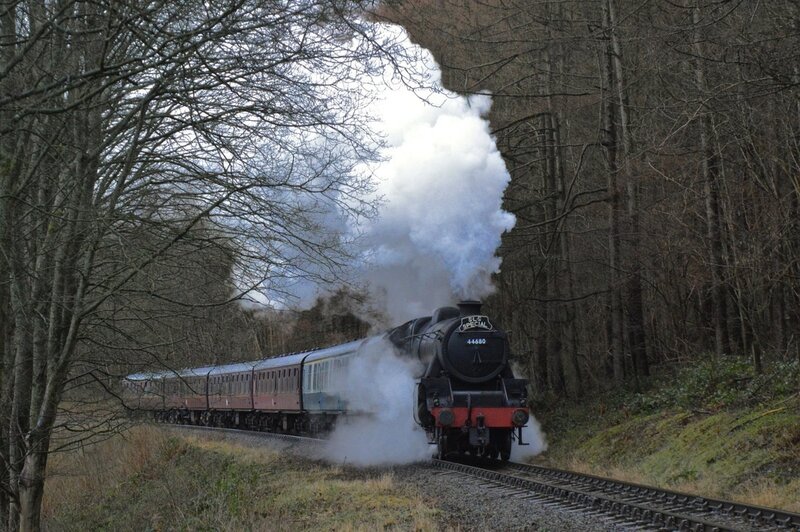 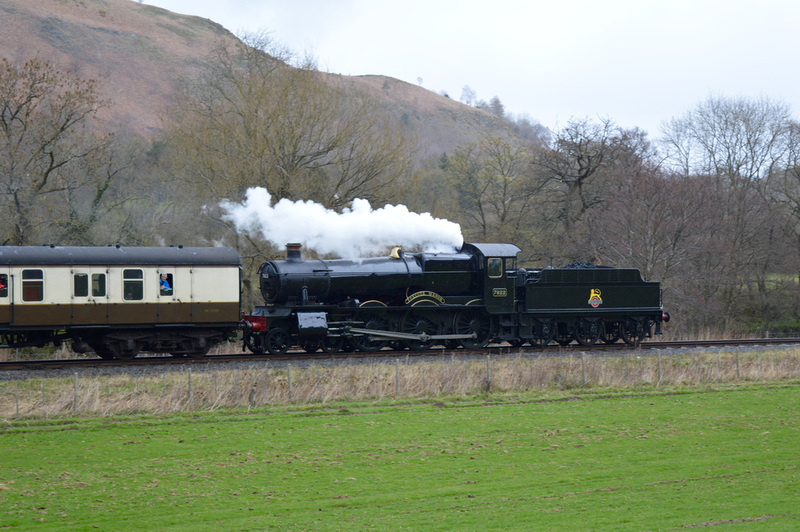 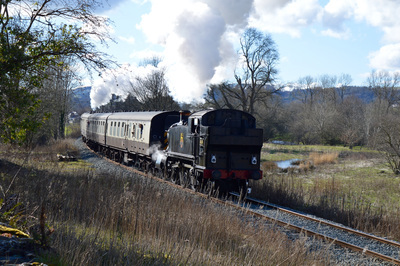 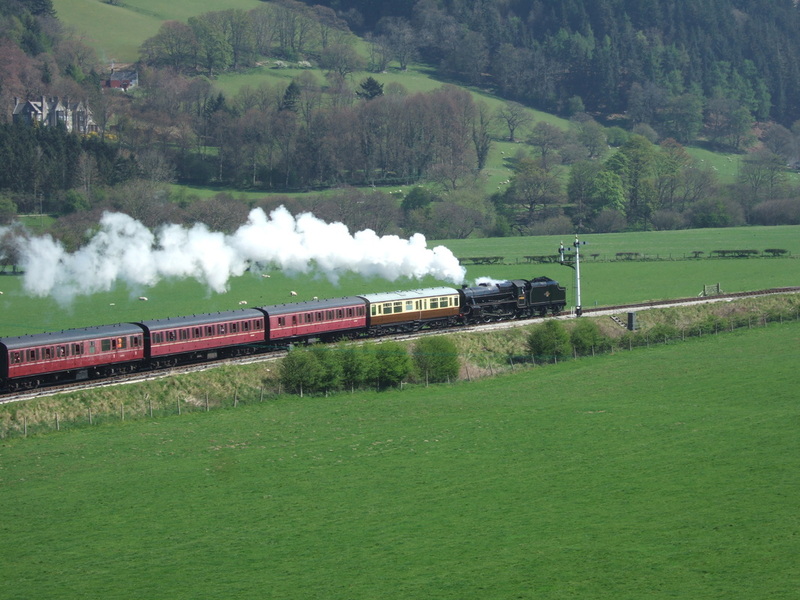 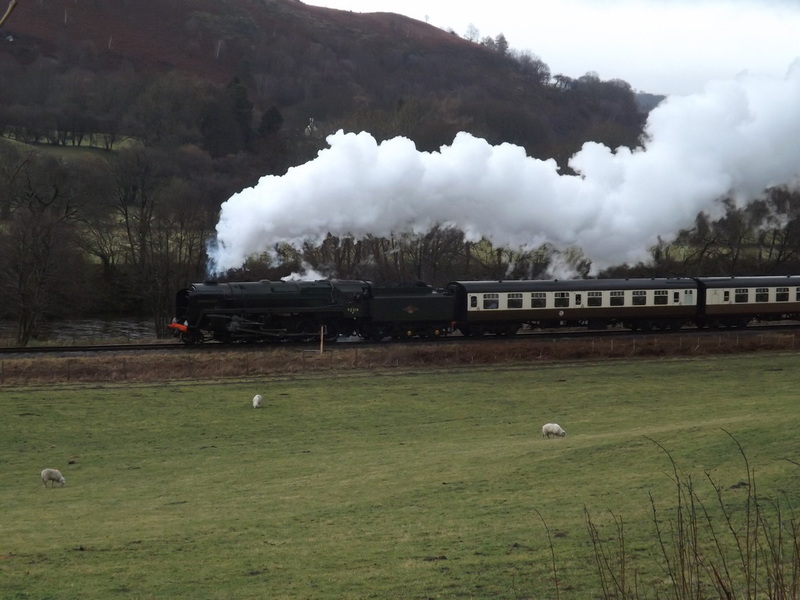 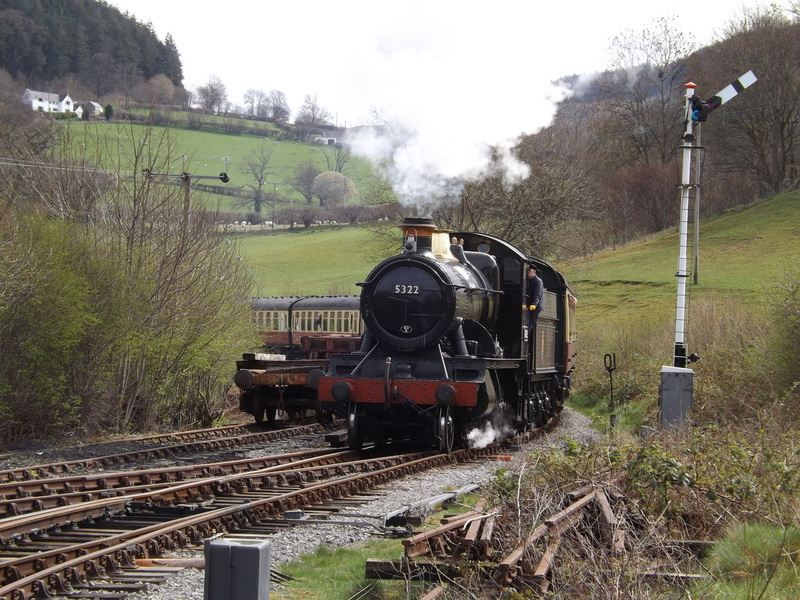 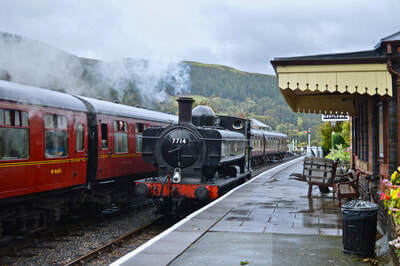 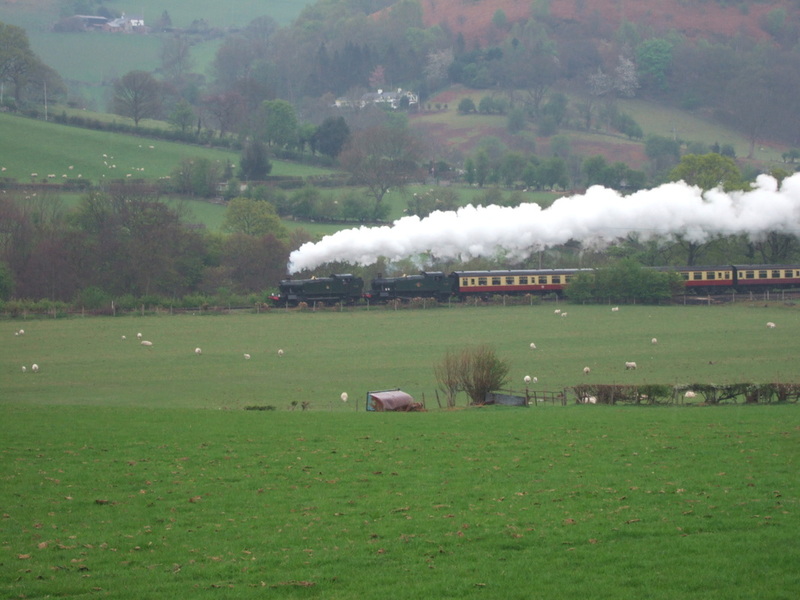 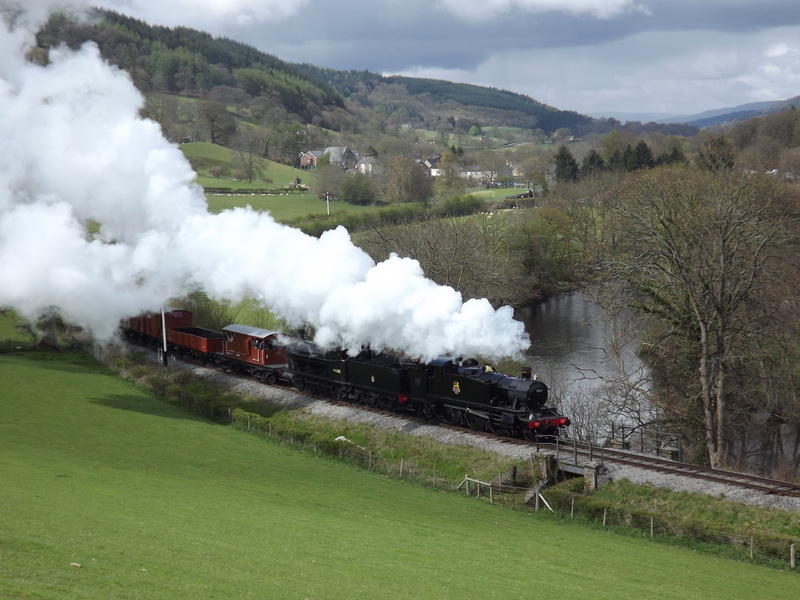 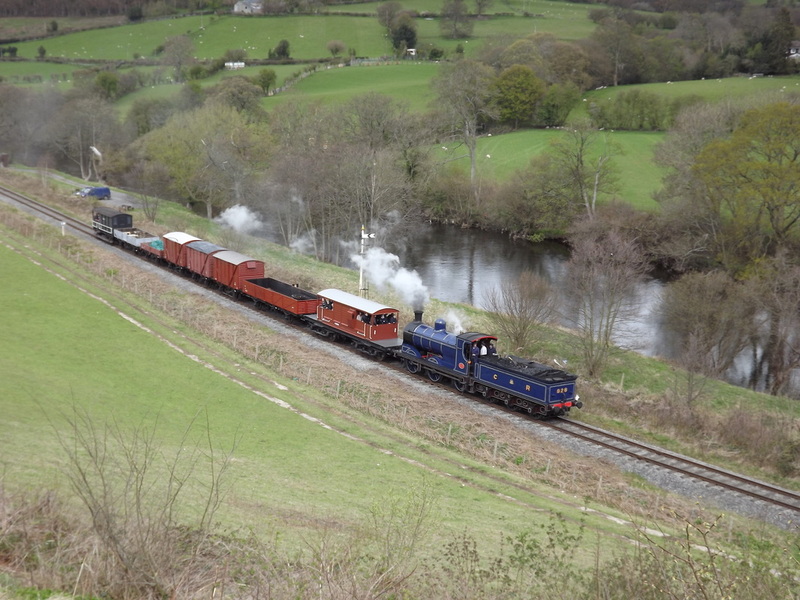 Featuring the return to steam of flagship locomotive, 7822 Foxcote Manor, which was appearing in BR black for the first time in preservation, the Llangollen Railway's Spring Steam Gala 2016 took the theme of 'Along Cambrian Lines'. 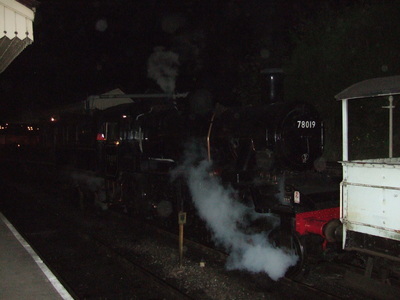 7820 Dinmore Manor, also in BR unlined black (a preservation first of a pairing of two unlined black manors) and 45xx 4566 were the guest locomotives, joining 7822, 5199 and 6430. 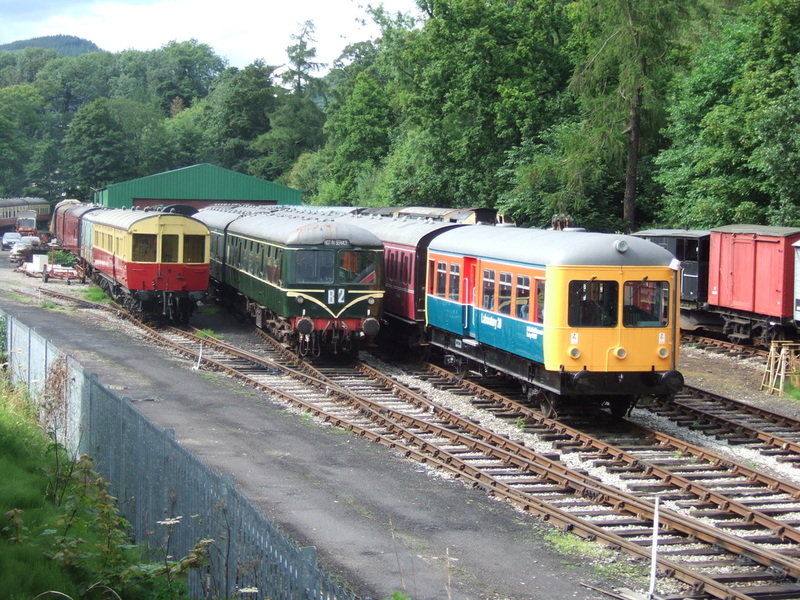 An intensive timetable ran with 4 sets in use, including a short mixed train formed of a Suburban Mk1, Van, Open Wagon and Toad Brake Van. 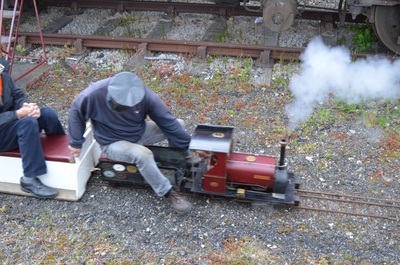 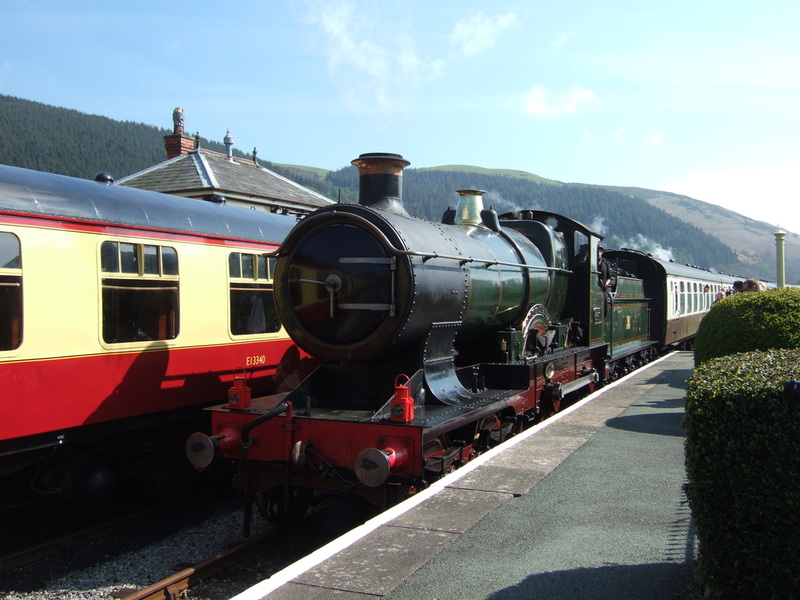 Named trains were recreated including double headed Manors on the 'Cambrian Coast Express' and Small Prairie/Manor combination on the 'Talyllyn Railway Preservation Society AGM Special'. 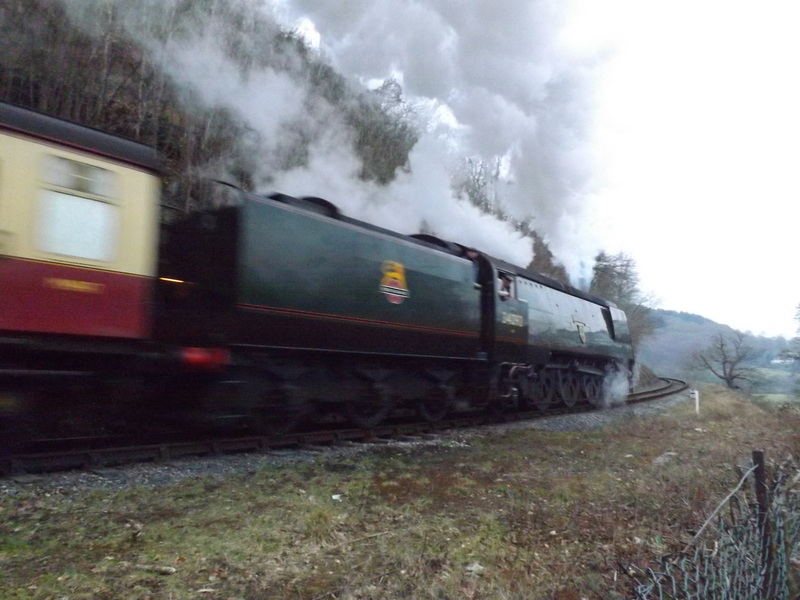 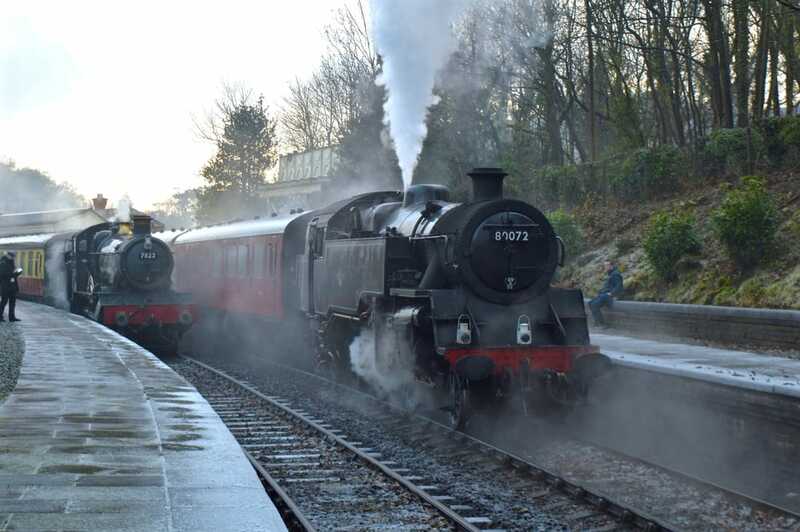 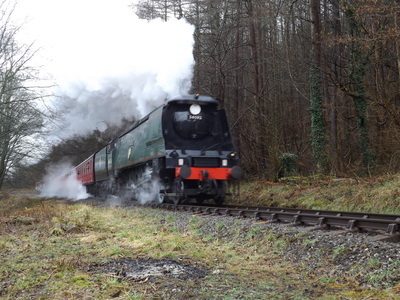 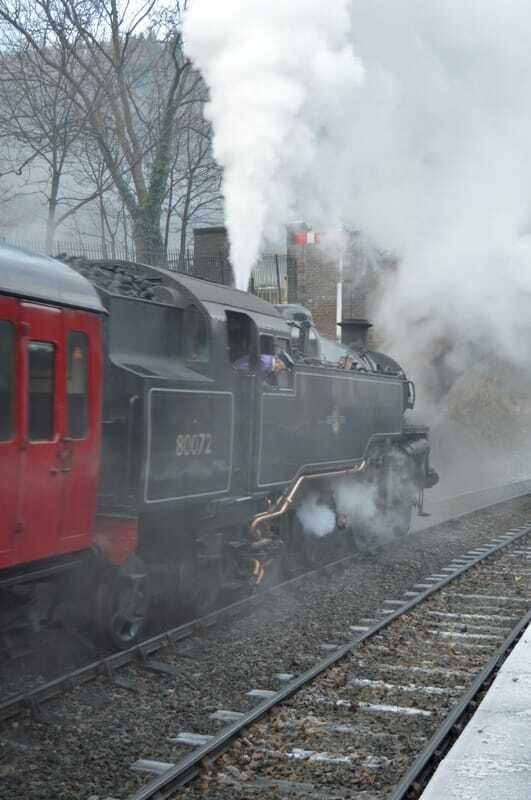 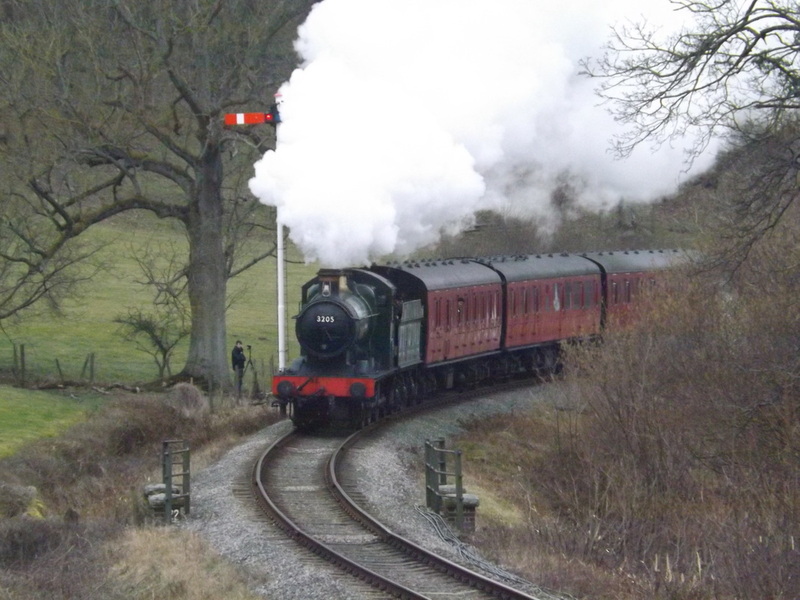 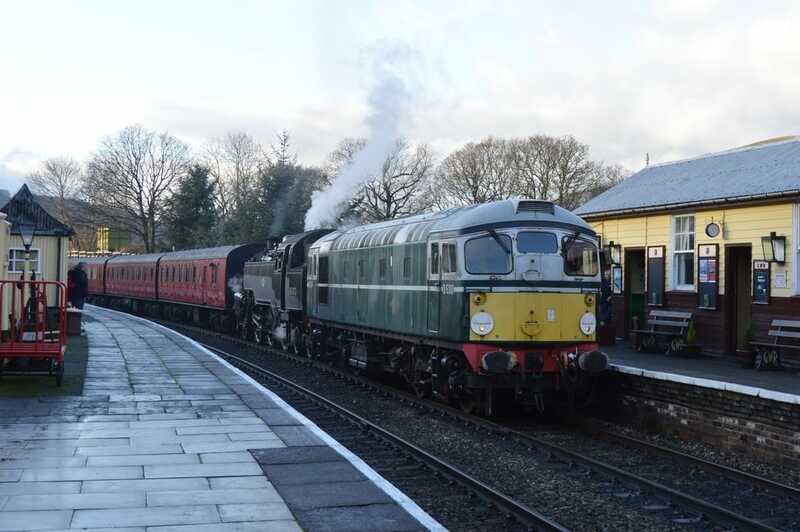 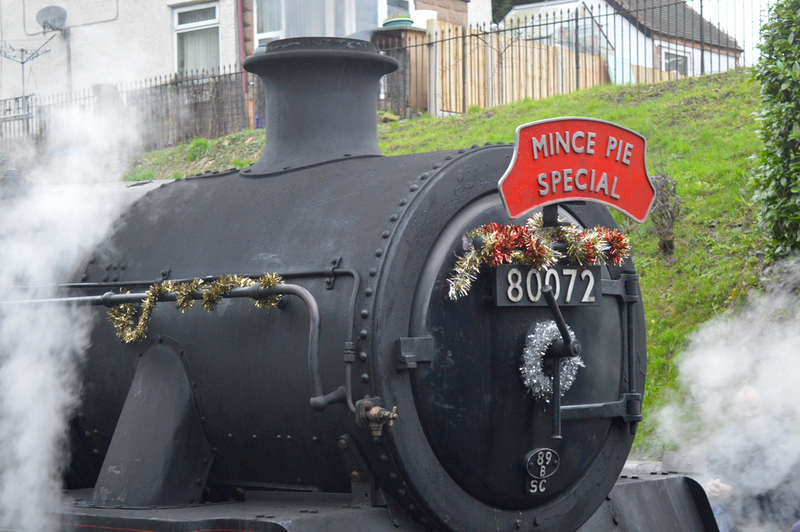 Standard 4MT 80072 was in action following a season out of traffic for boiler stay repairs on Boxing Day, hauling the popular Mince Pie Specials. 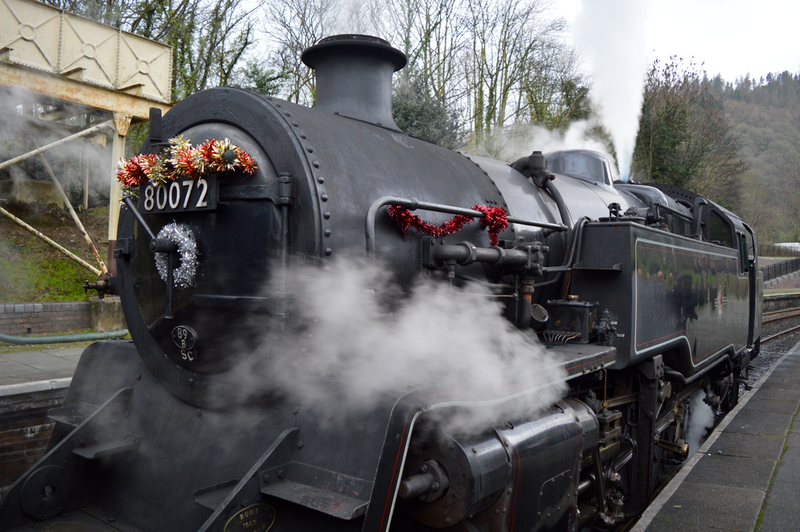 The locomotive returned in time for the busy Santa Specials season, with 80072 and 5199 sharing the duties. 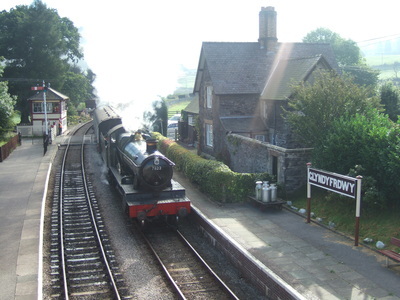 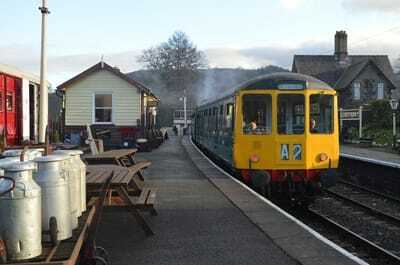 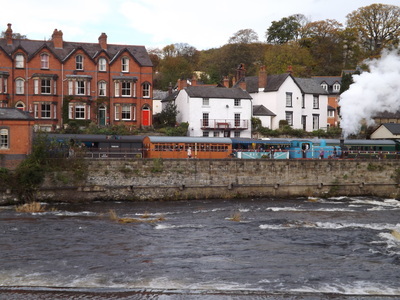 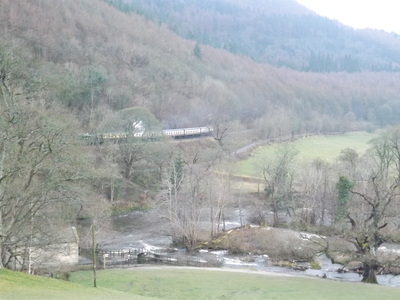 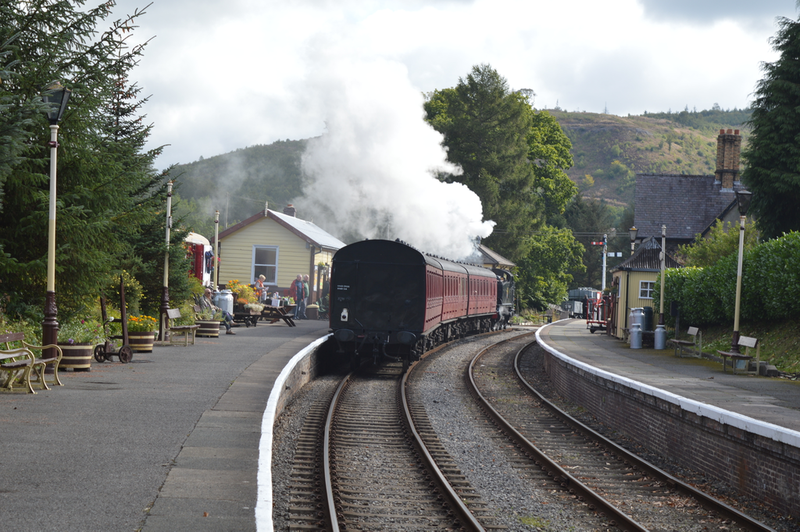 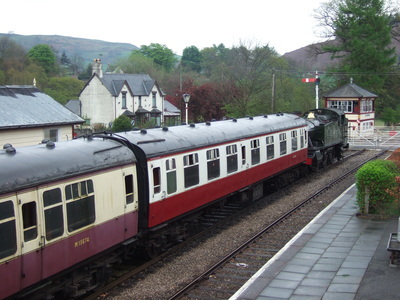 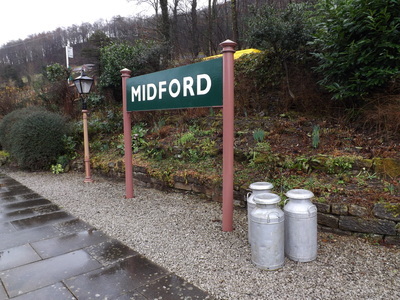 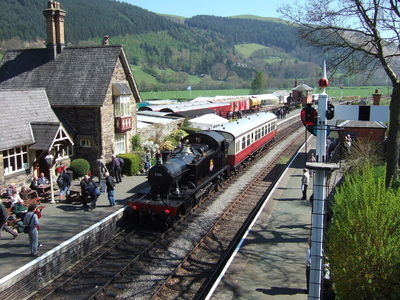 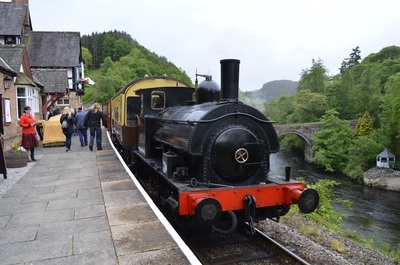 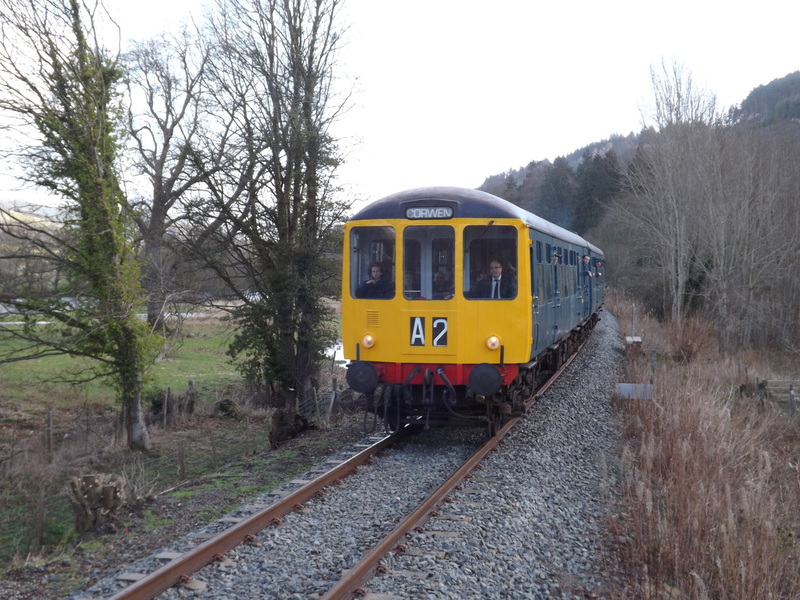 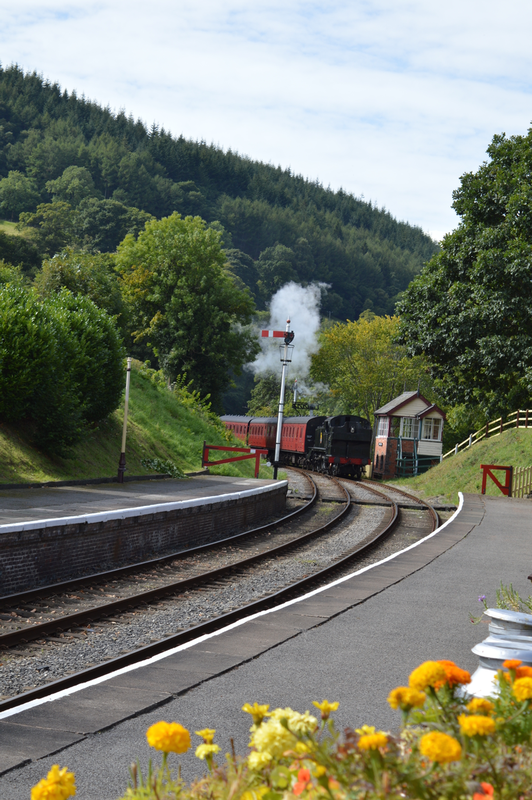 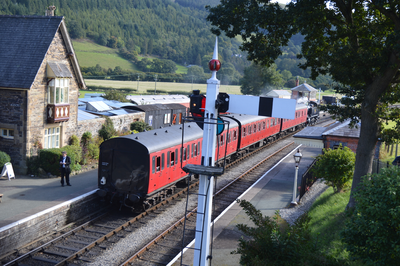 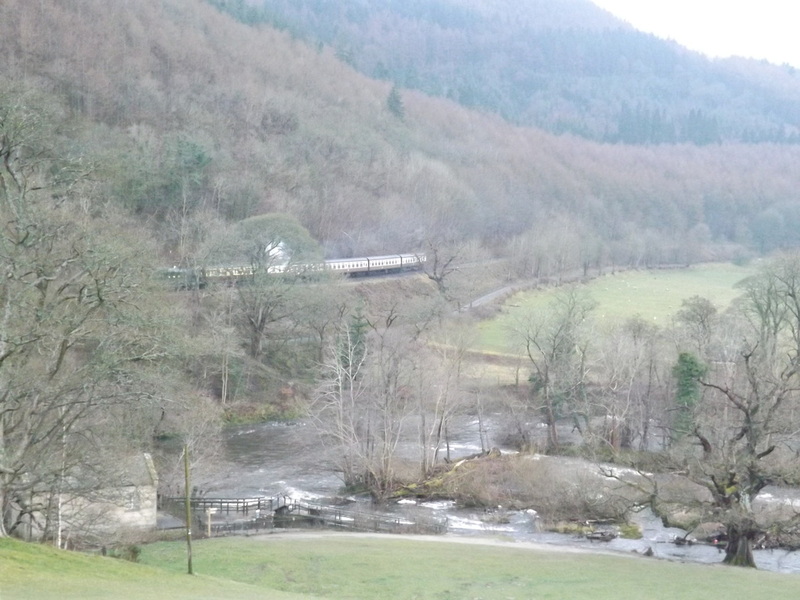 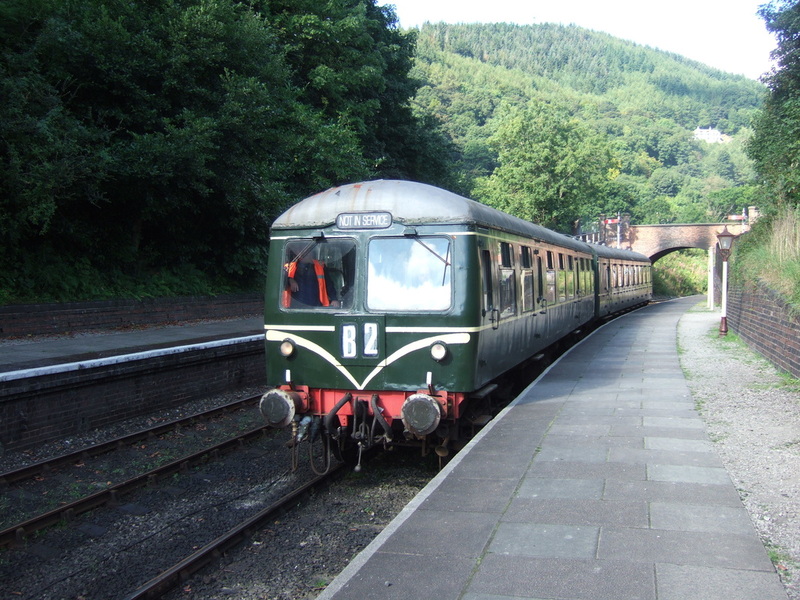 The first train of the day ran through the Corwen, but the river level, including Corwen East station being like a island in the middle of a lake, meant the last two trains of the day terminated at Corwen. 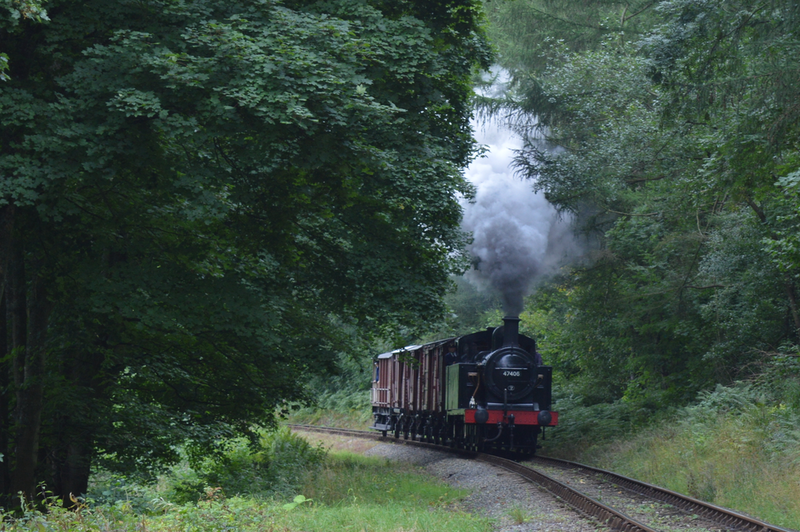 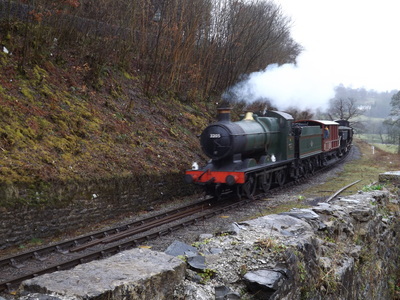 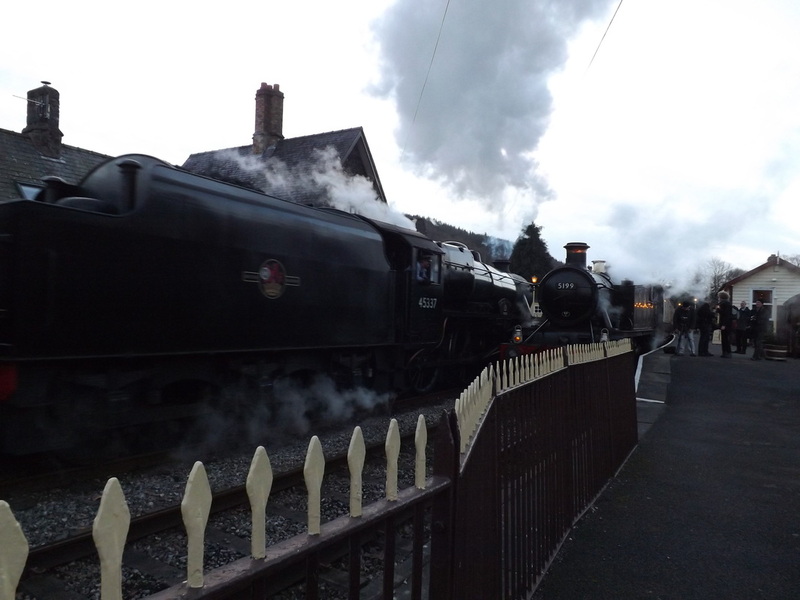 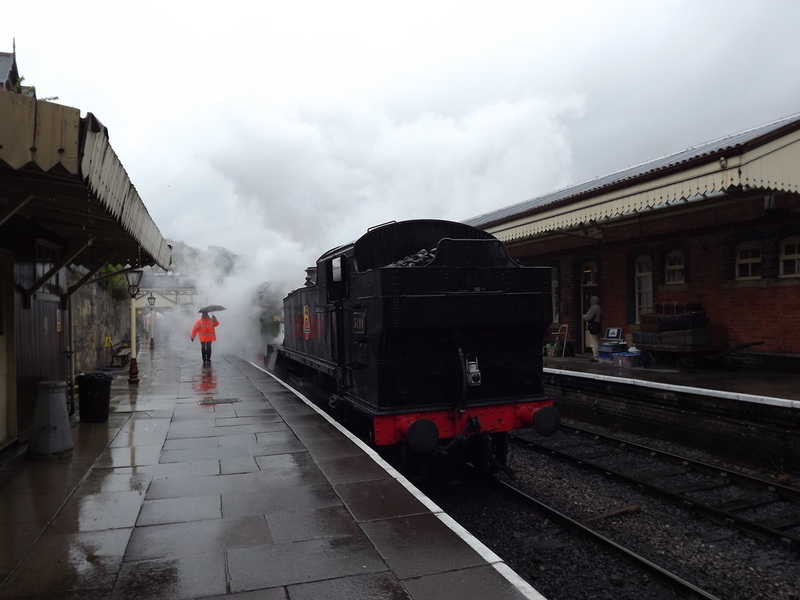 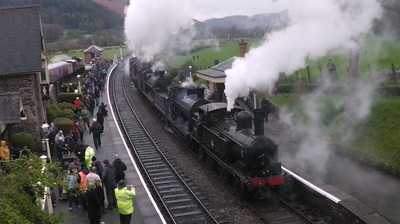 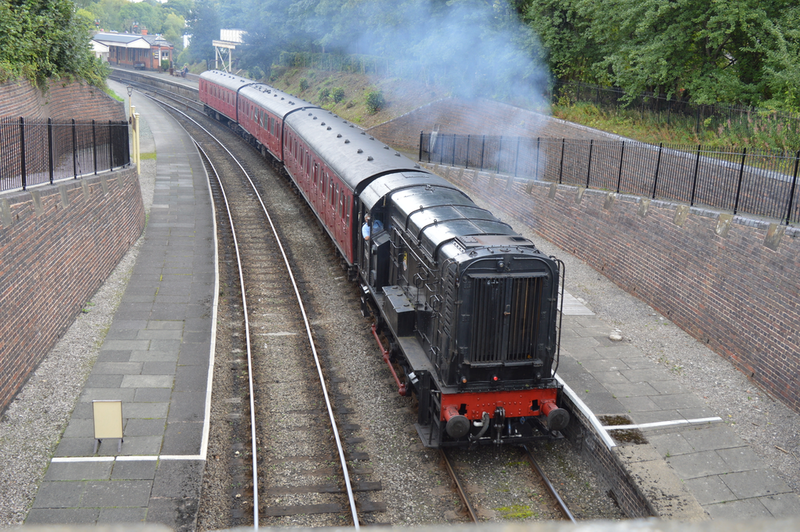 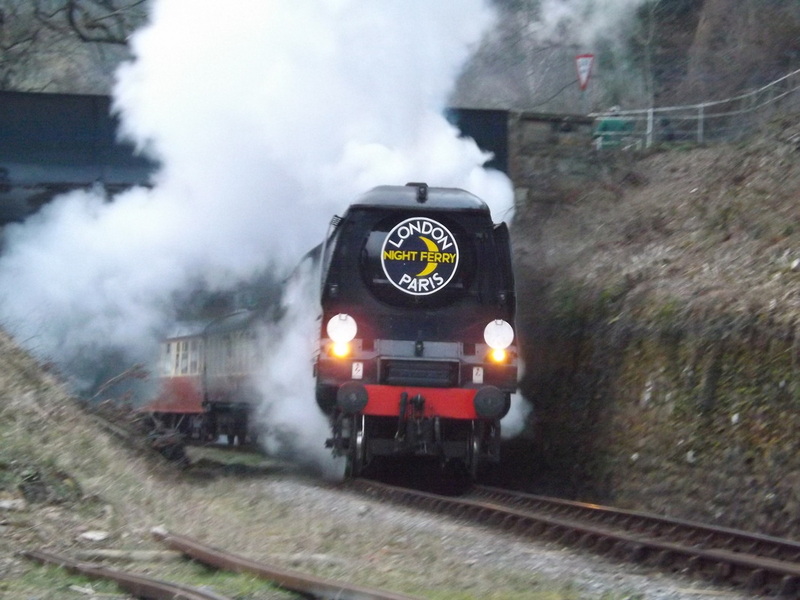 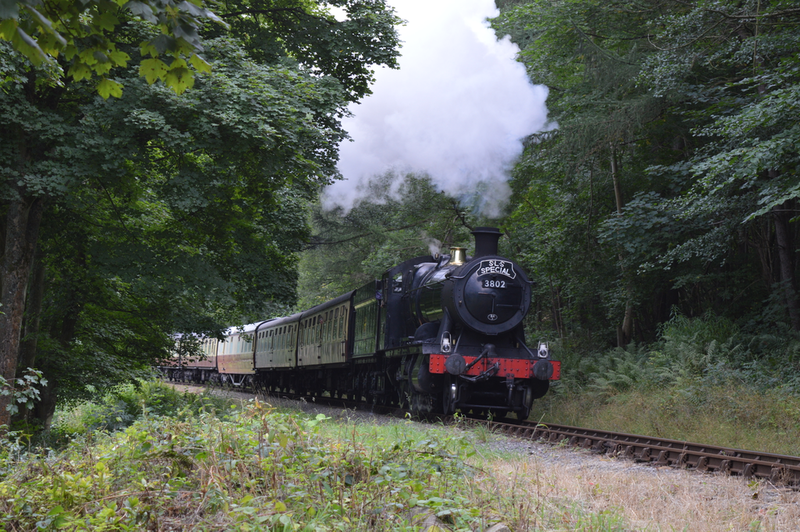 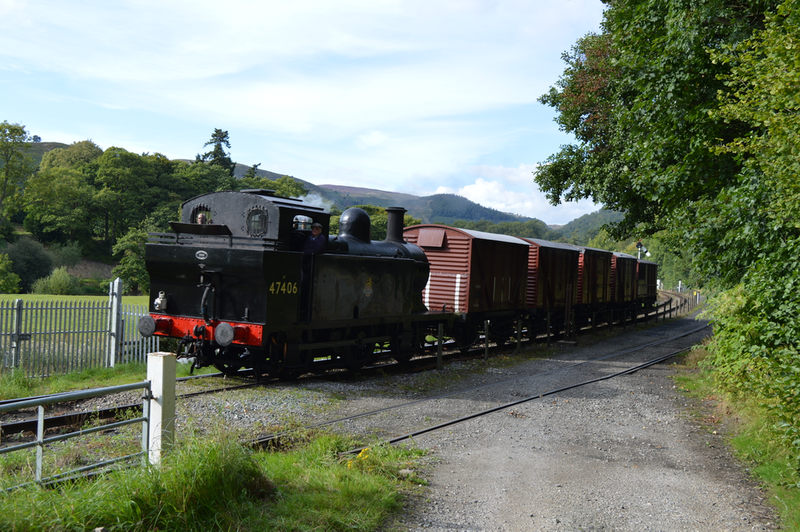 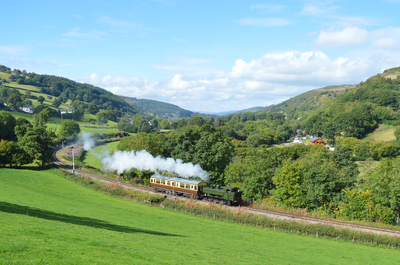 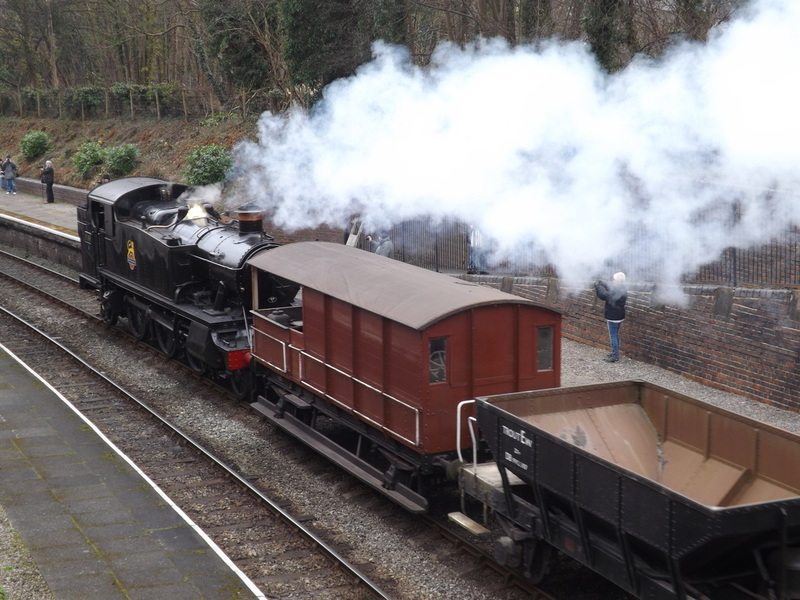 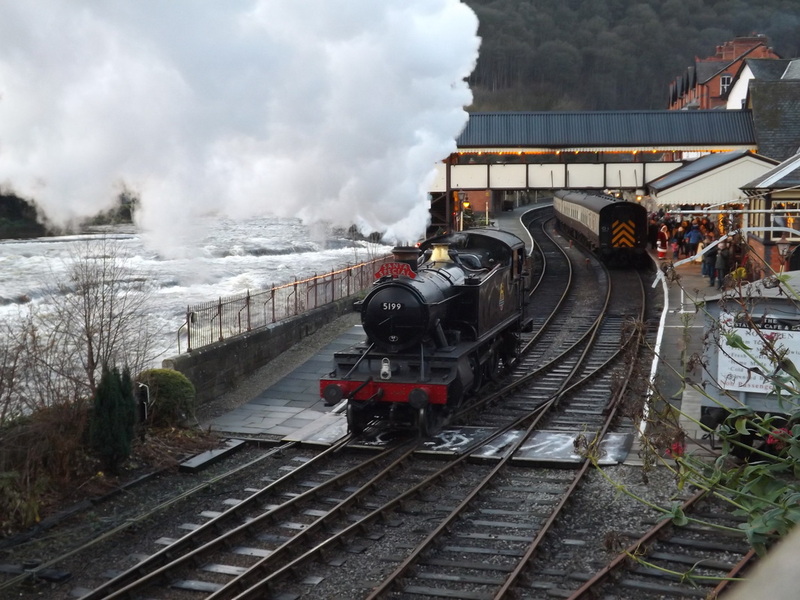 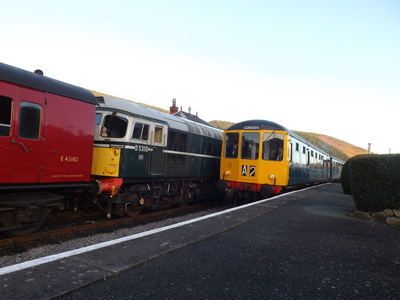 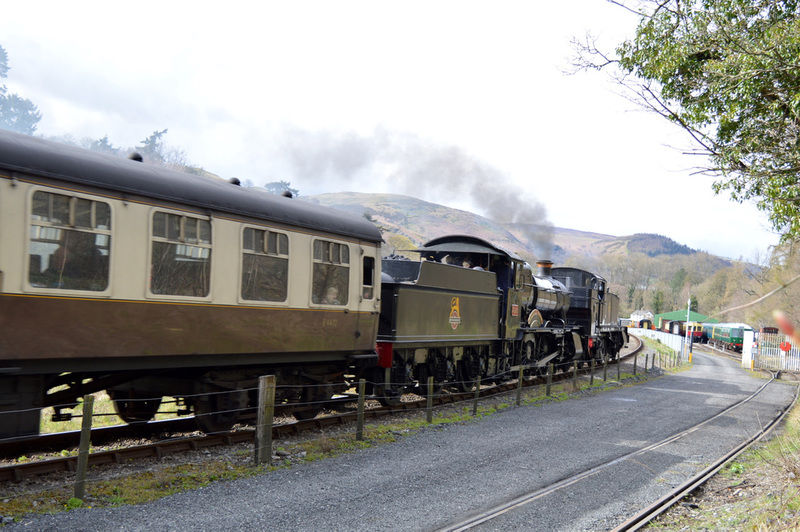 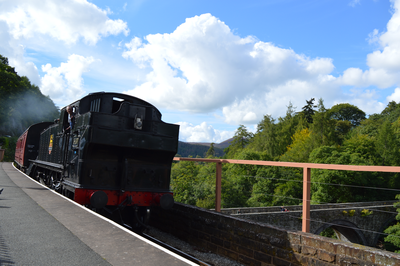 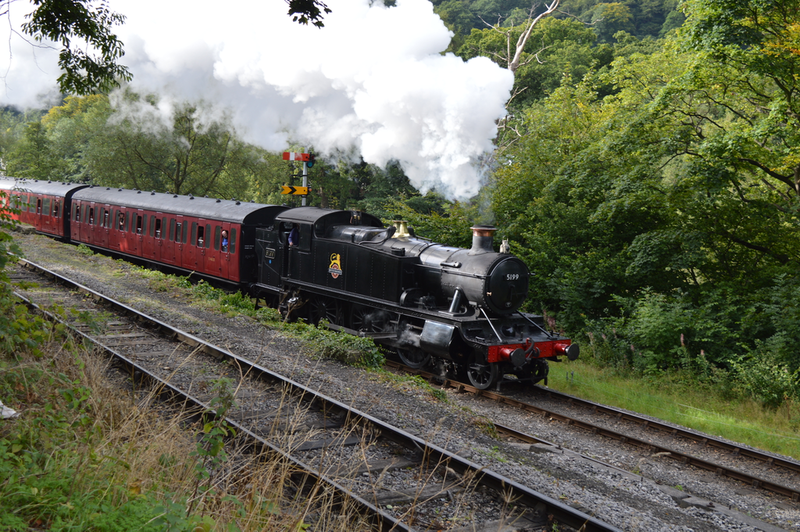 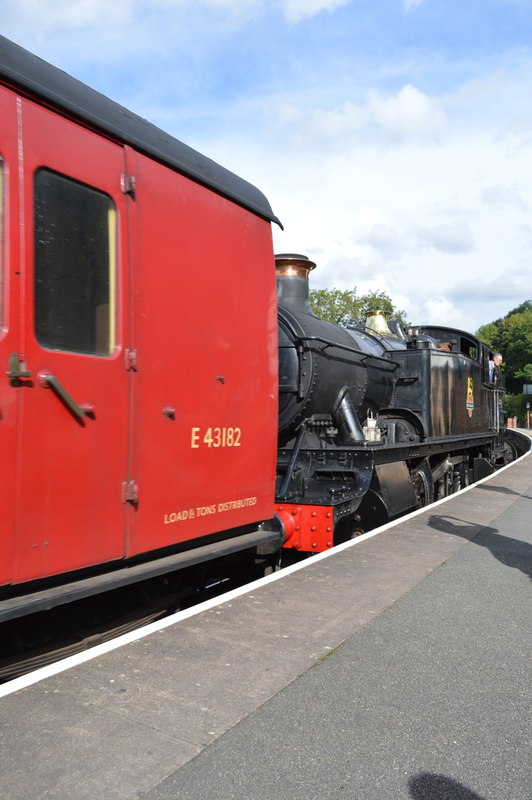 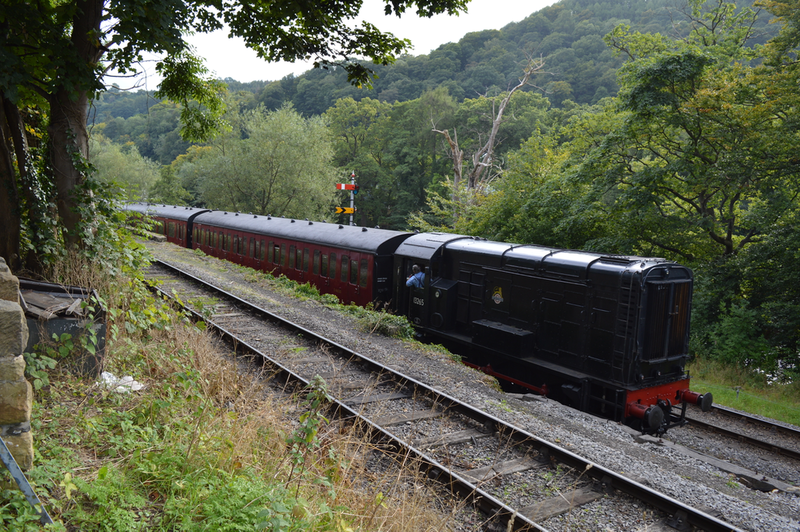 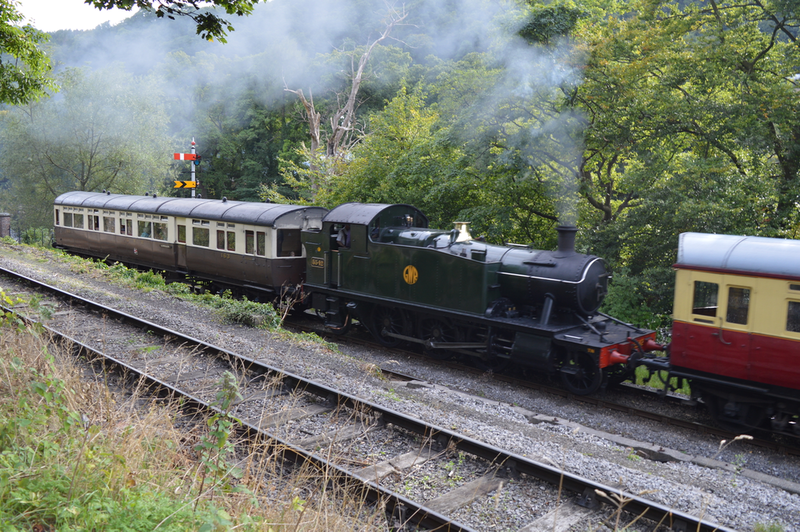 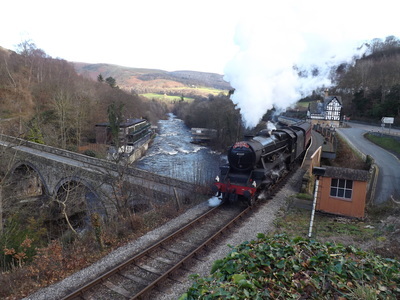 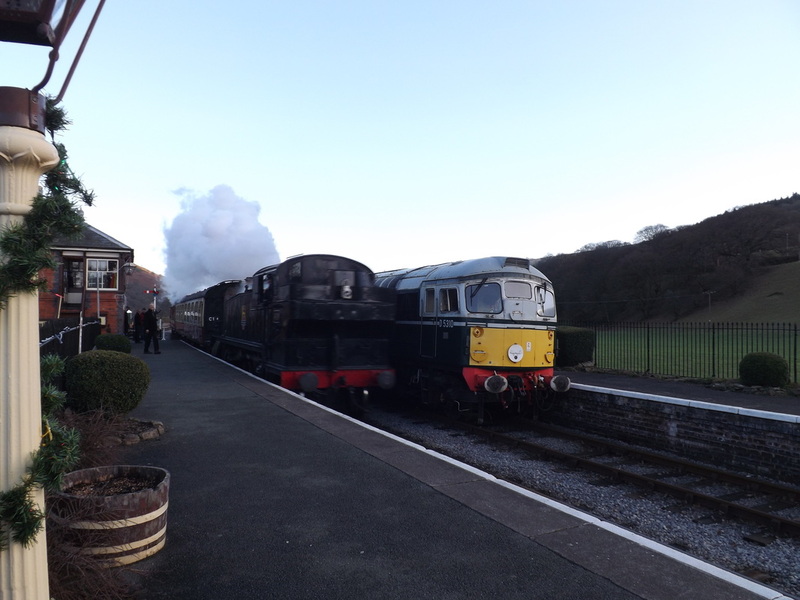 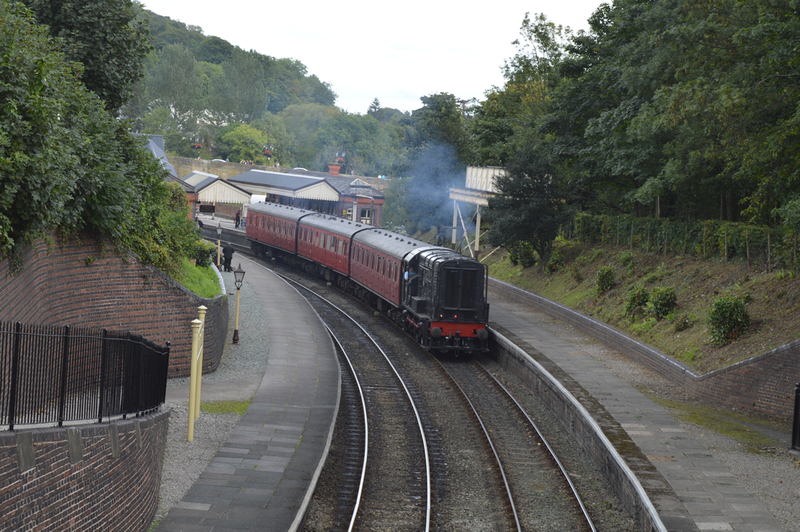 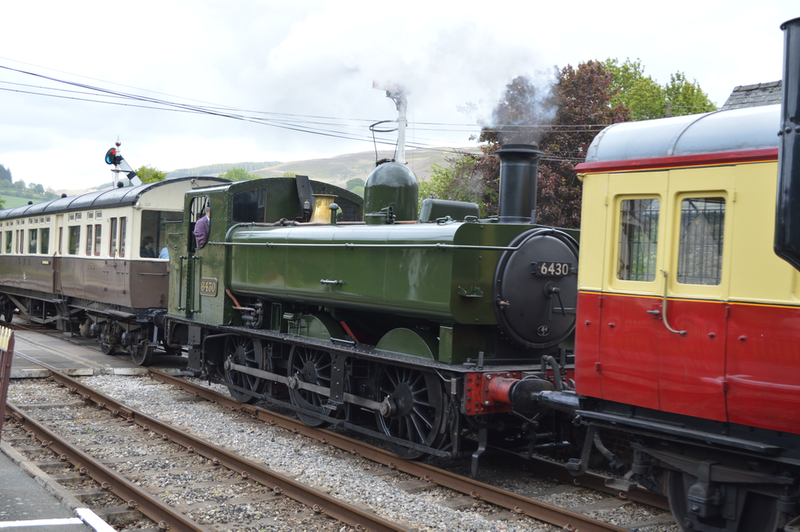 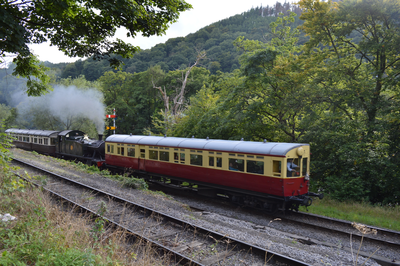 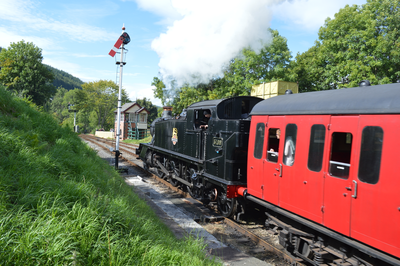 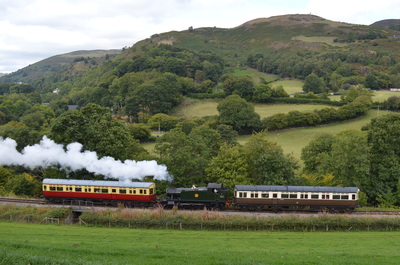 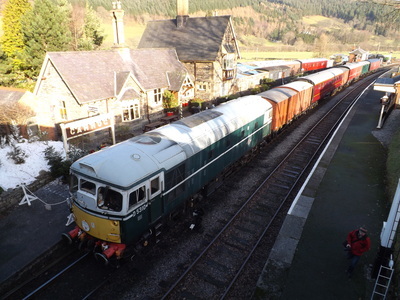 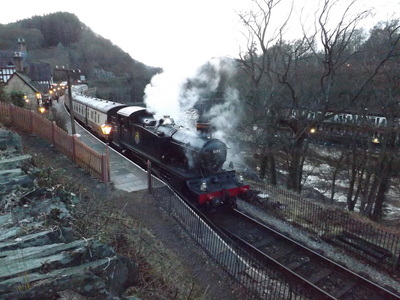 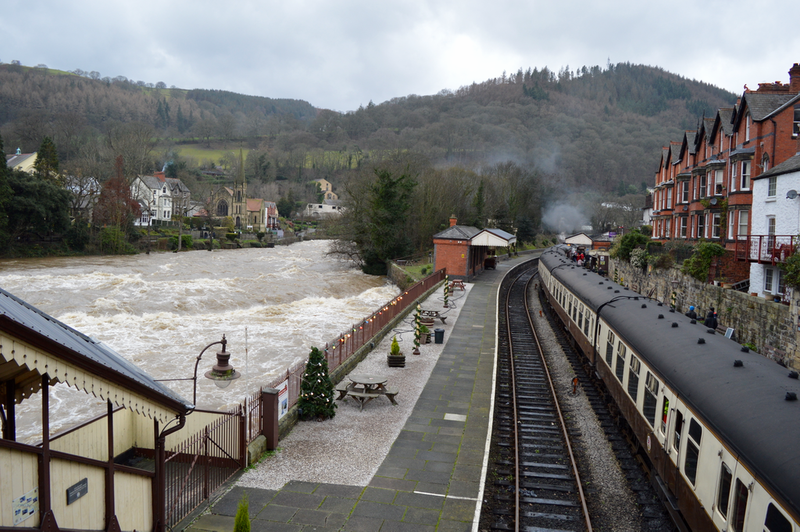 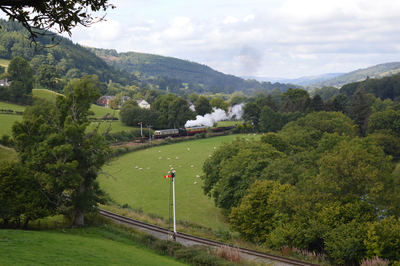 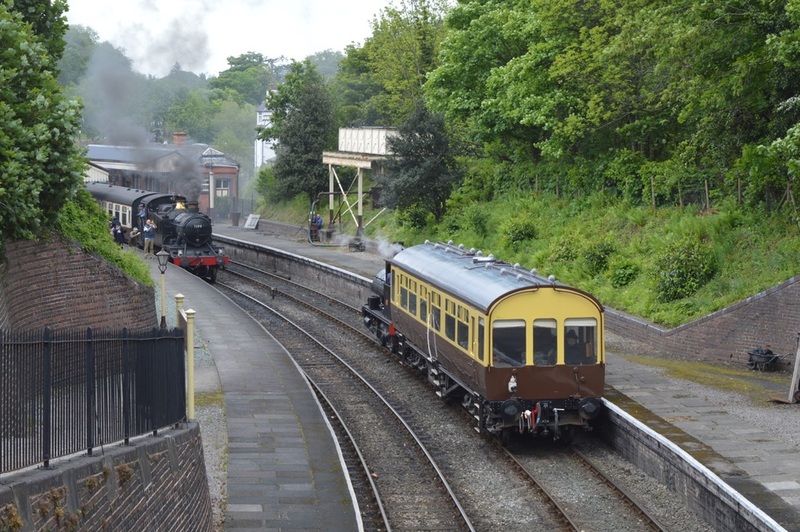 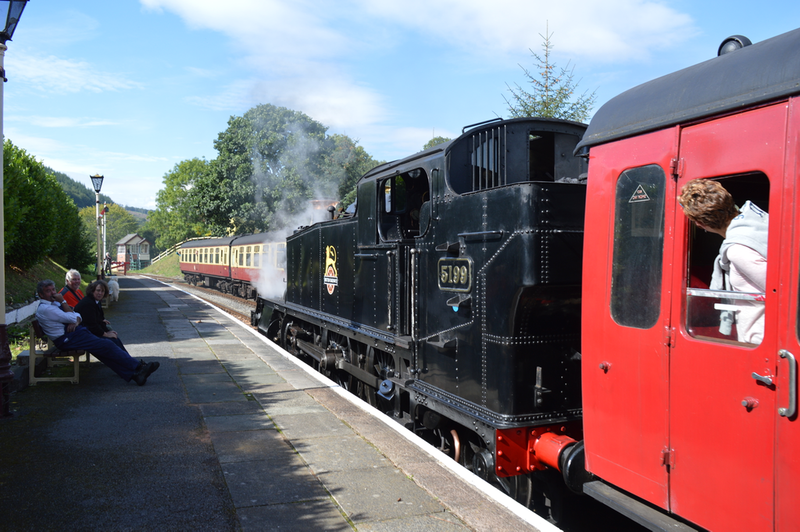 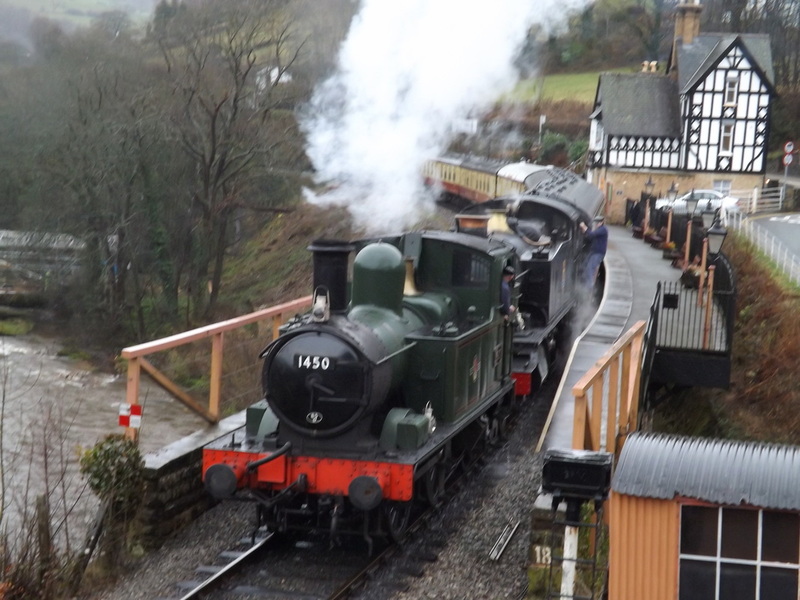 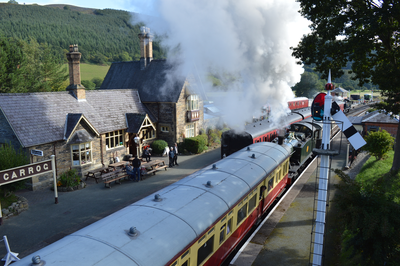 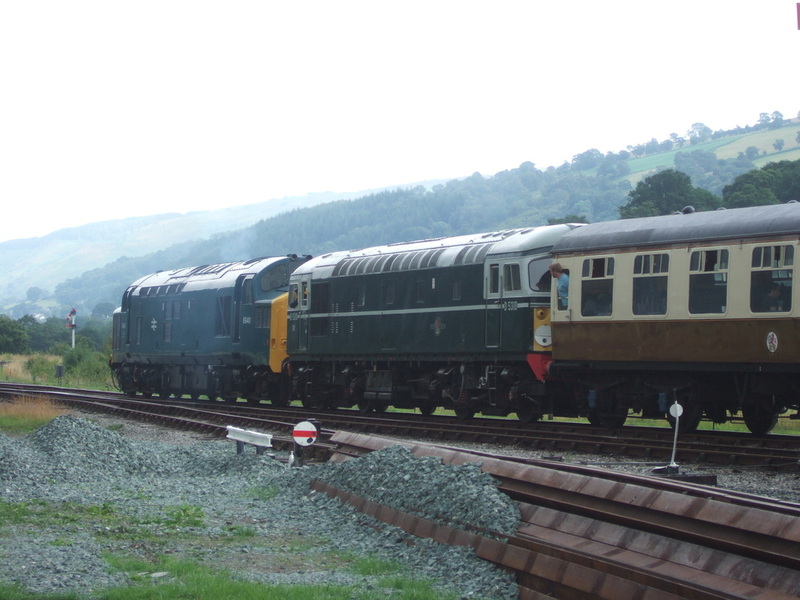 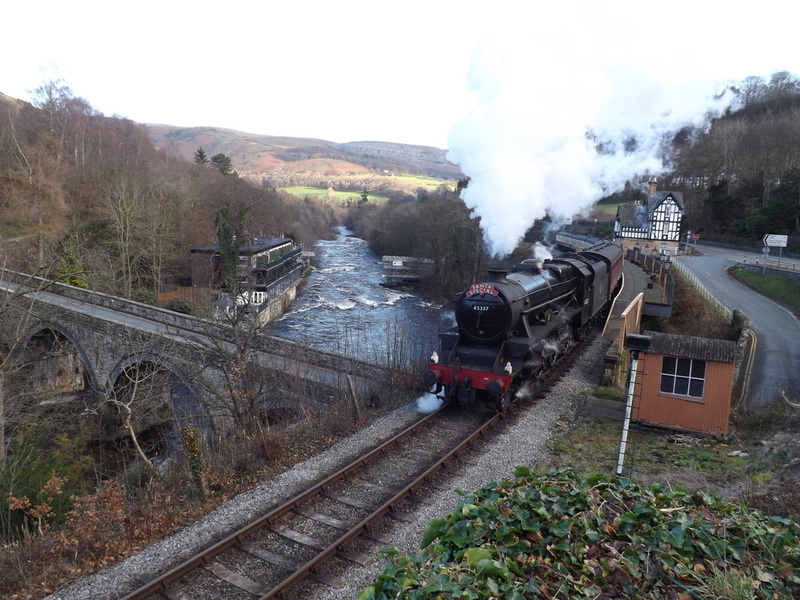 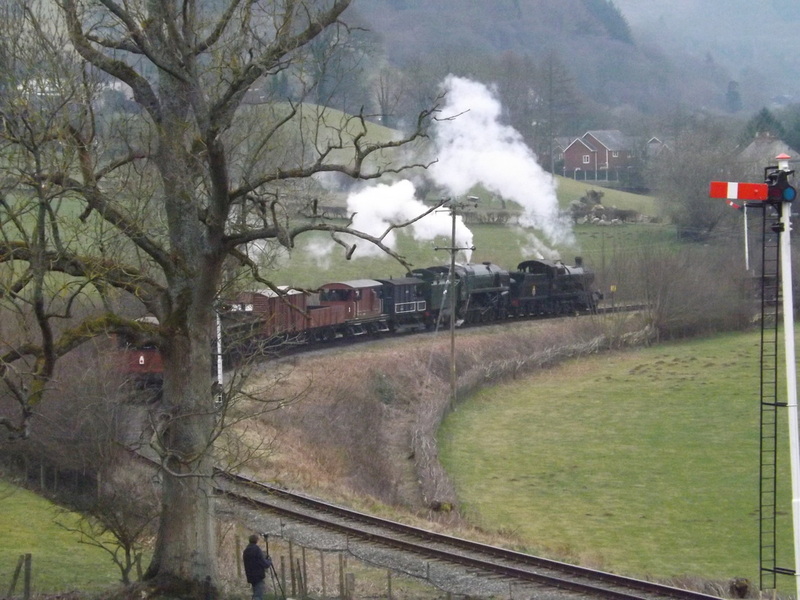 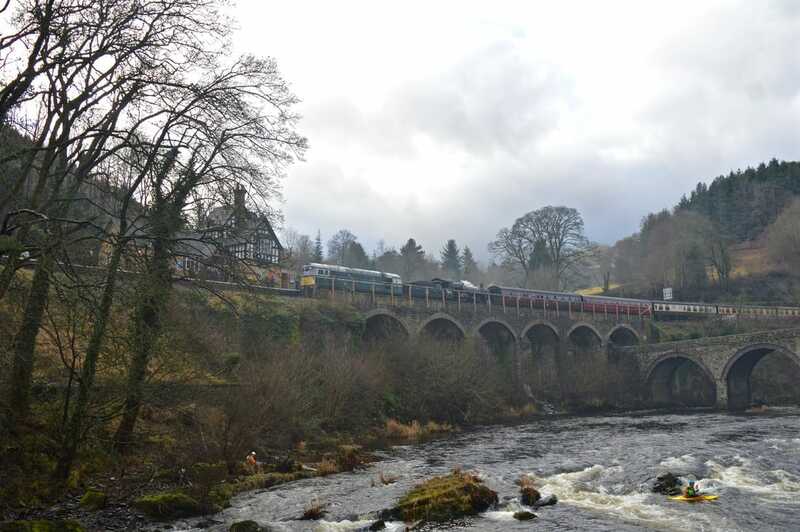 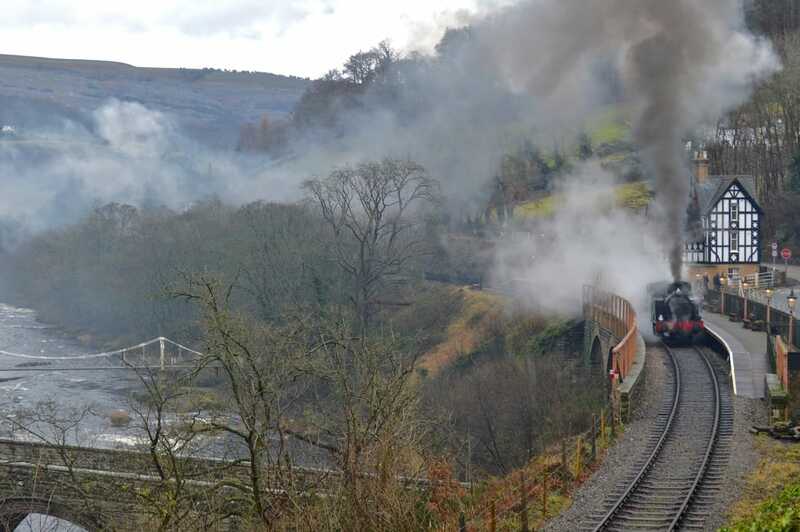 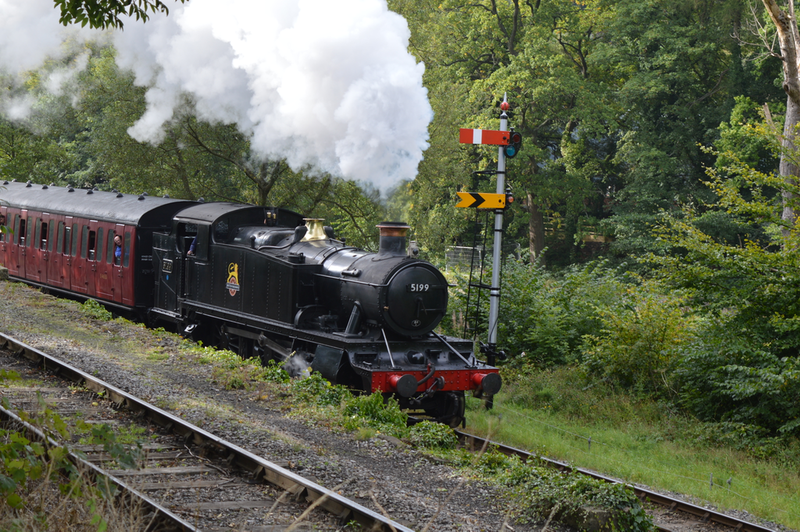 Llangollen's first gala of 2015, was a mixed traction affair which was also the first gala with trains through to Corwen. 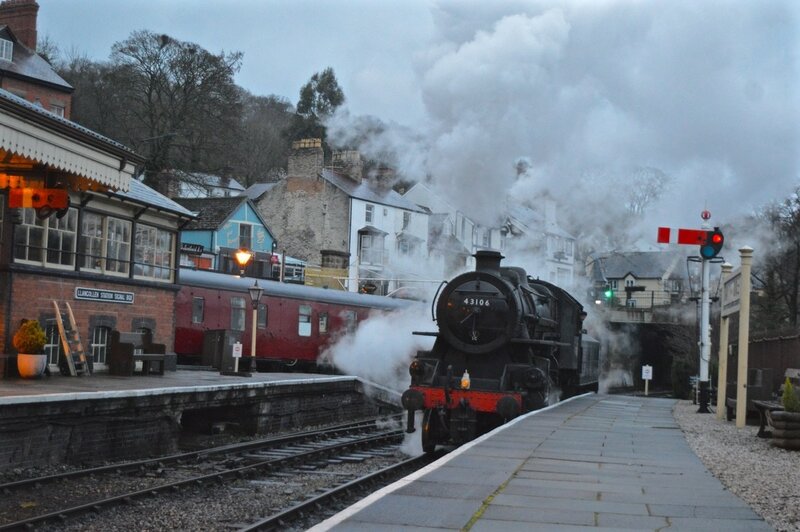 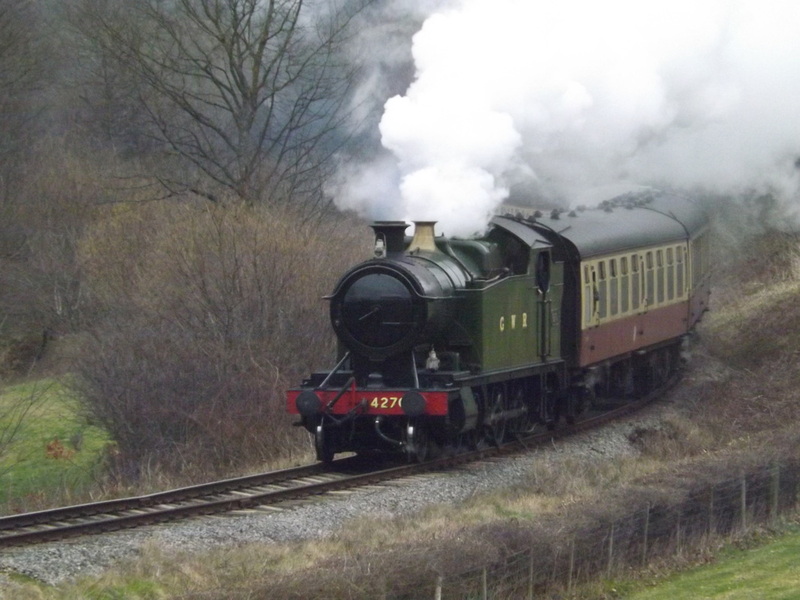 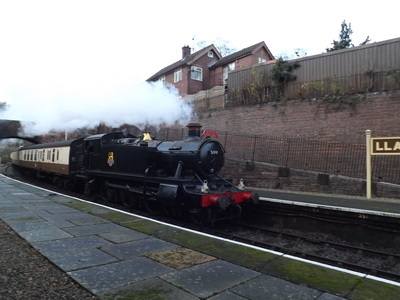 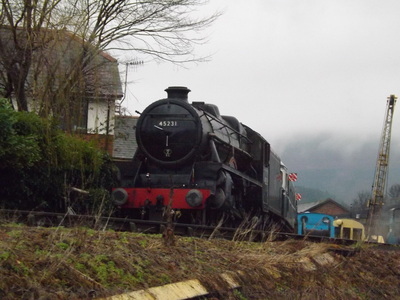 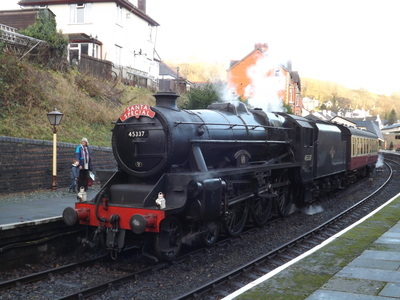 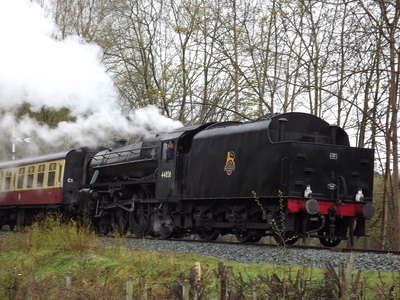 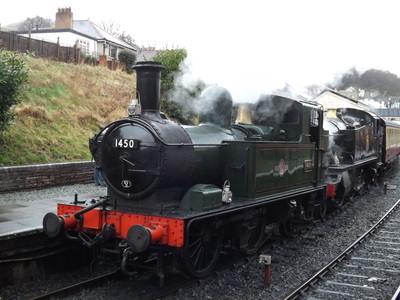 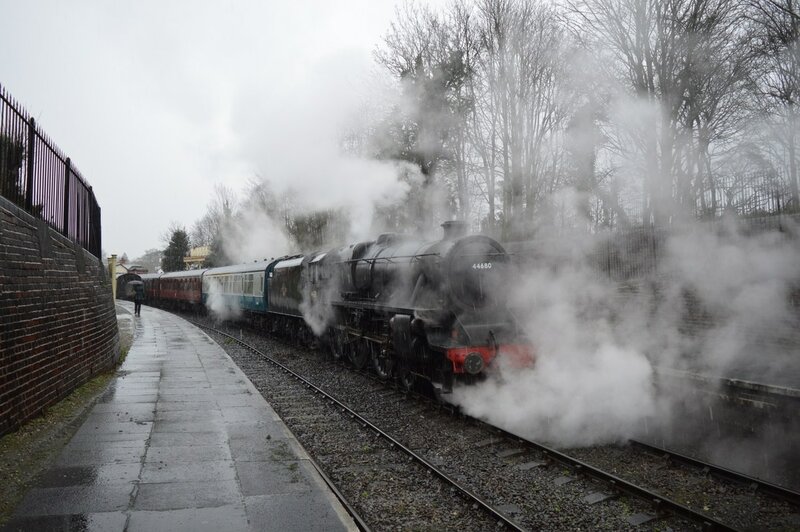 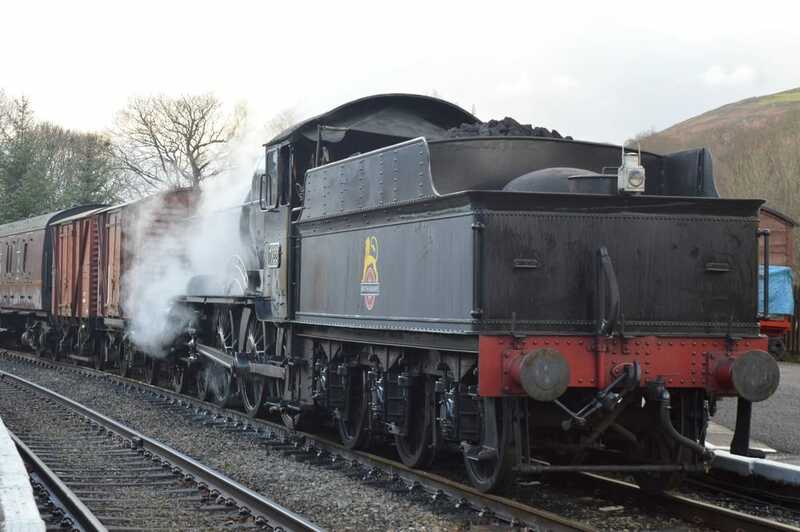 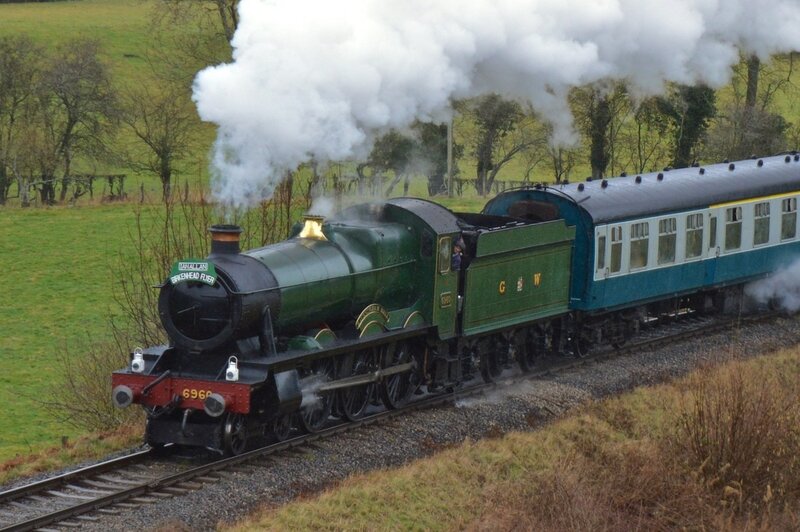 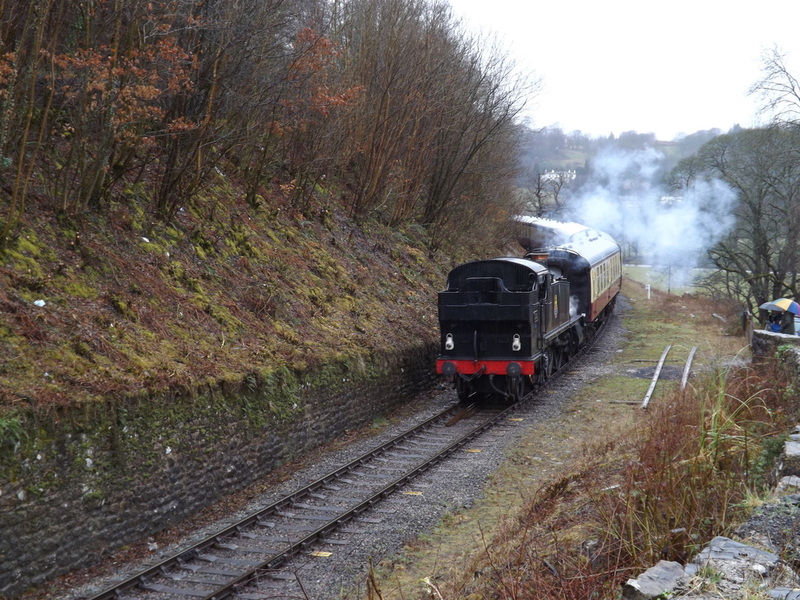 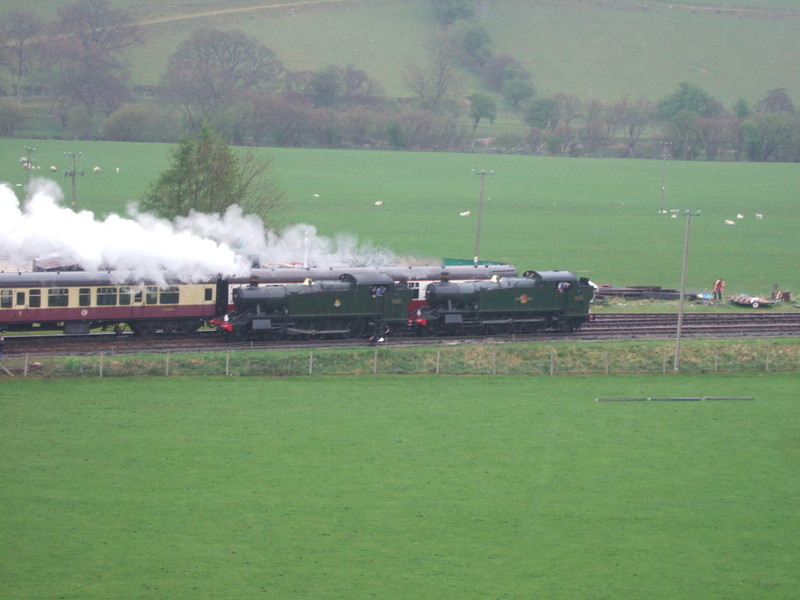 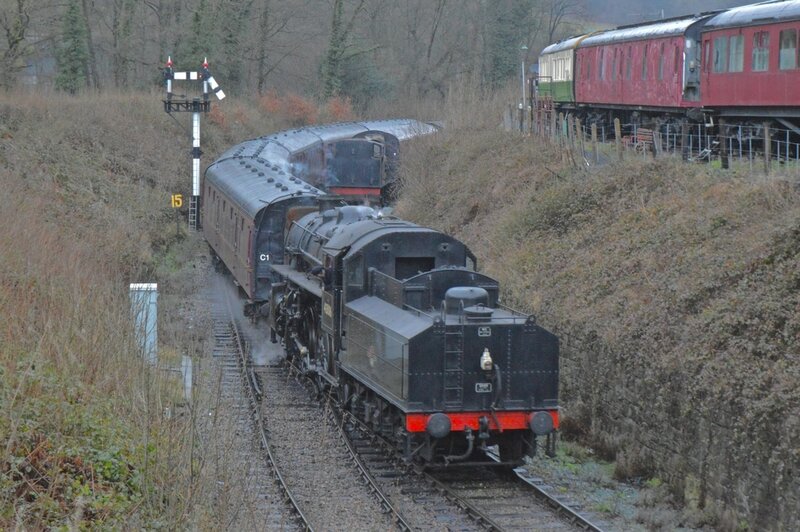 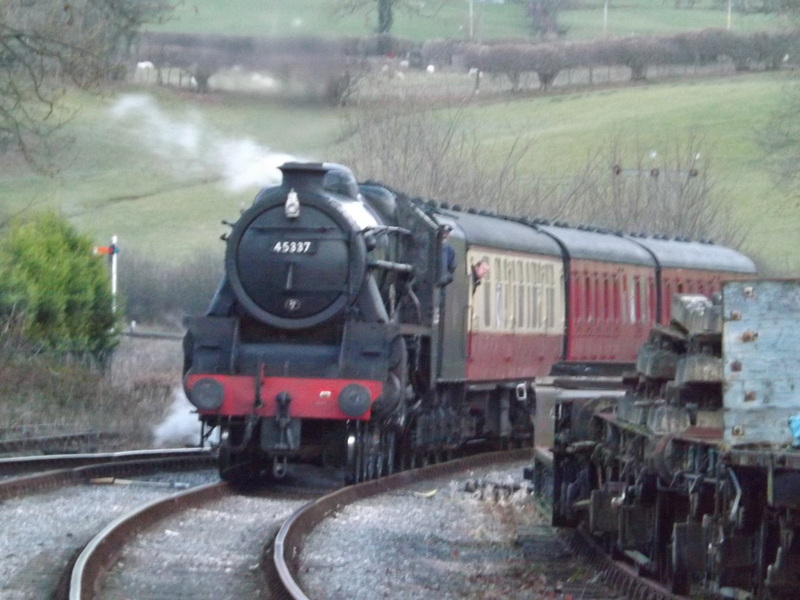 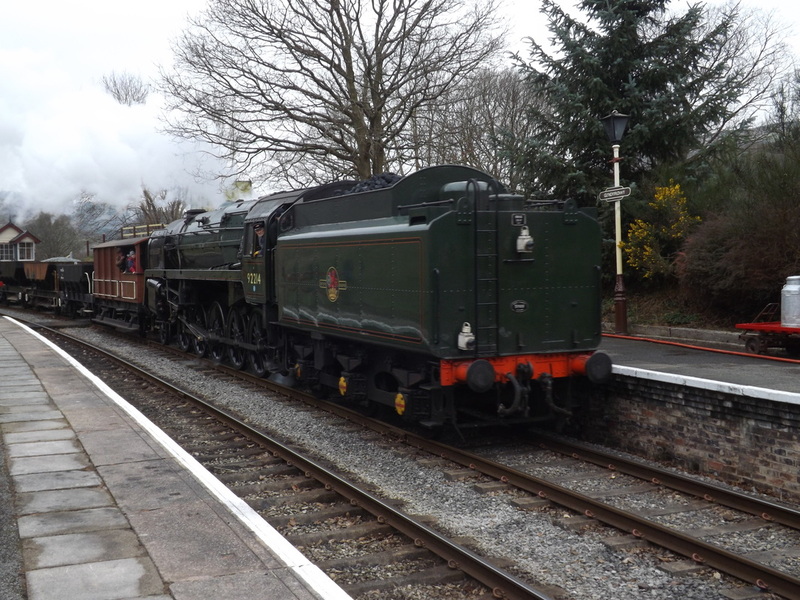 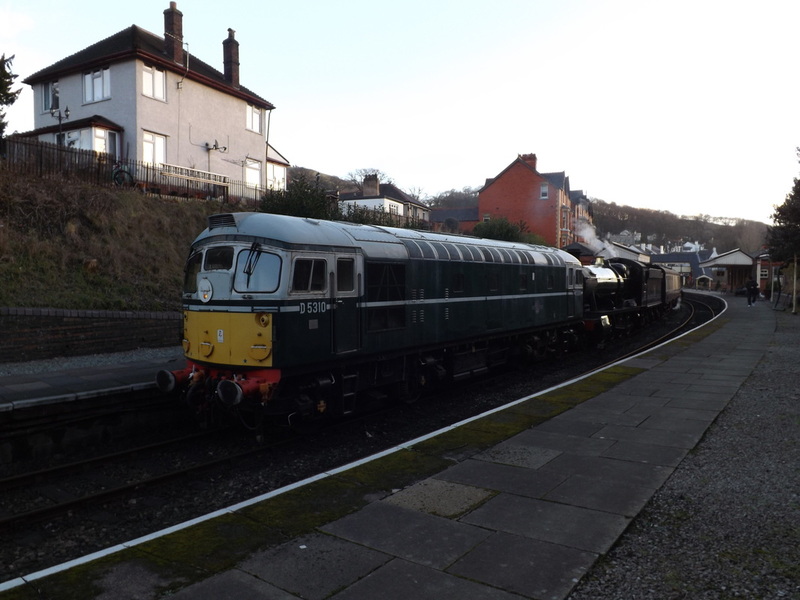 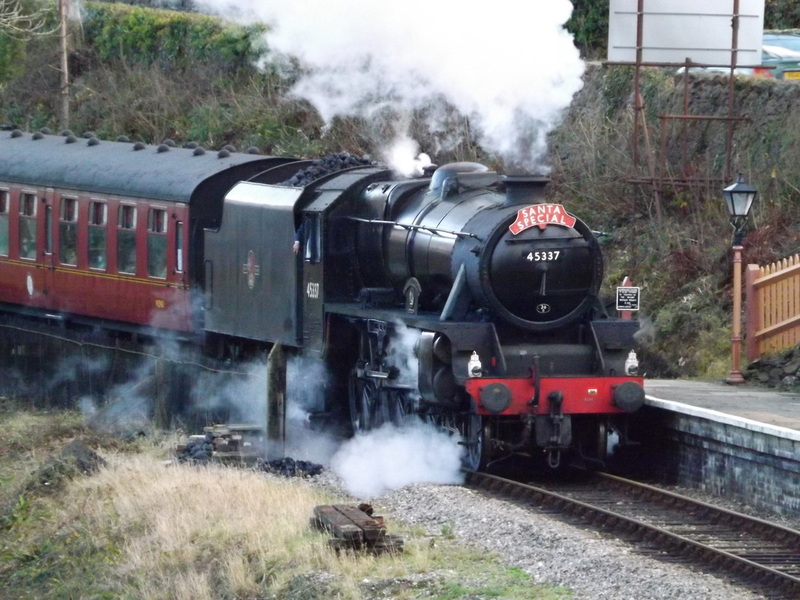 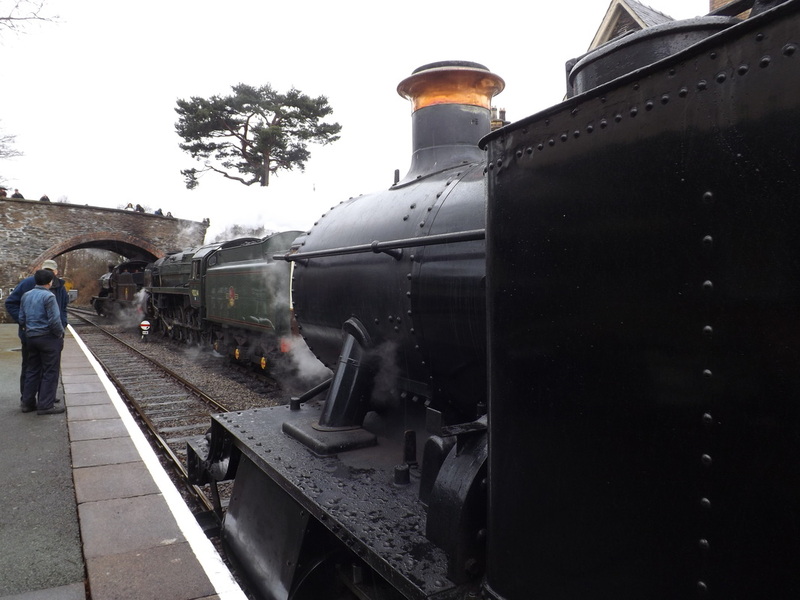 Large Prairie 5199 returned to steam during December 2014 and shared Santa Special duties with 45337 and 3802. 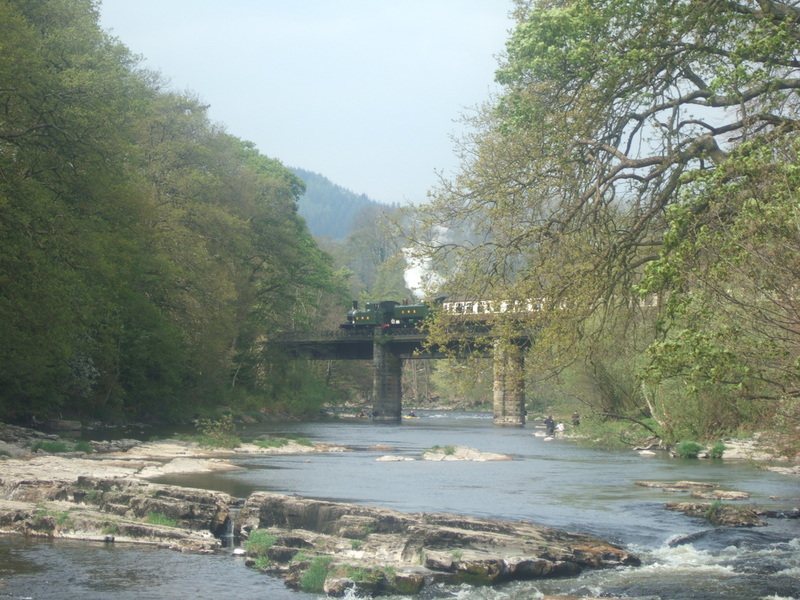 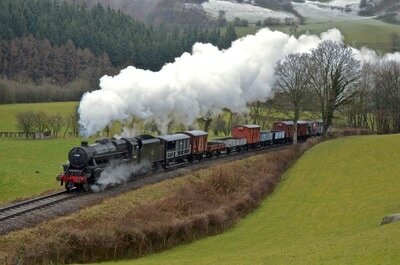 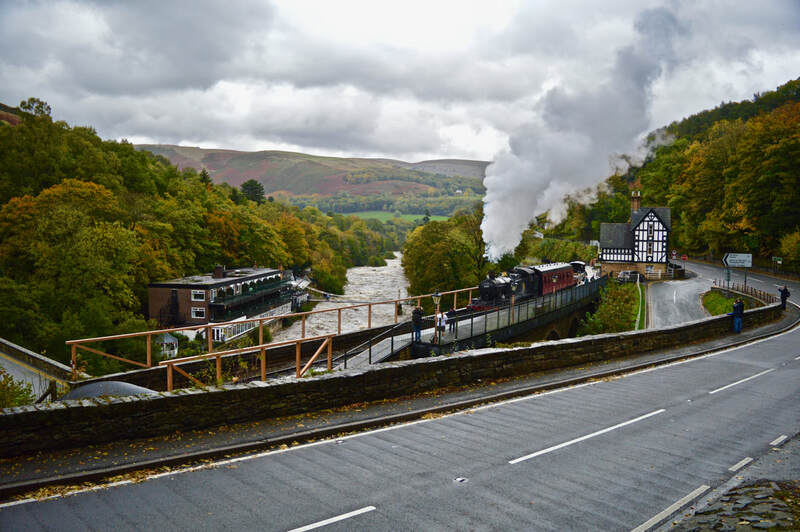 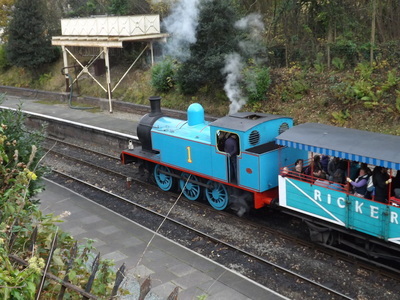 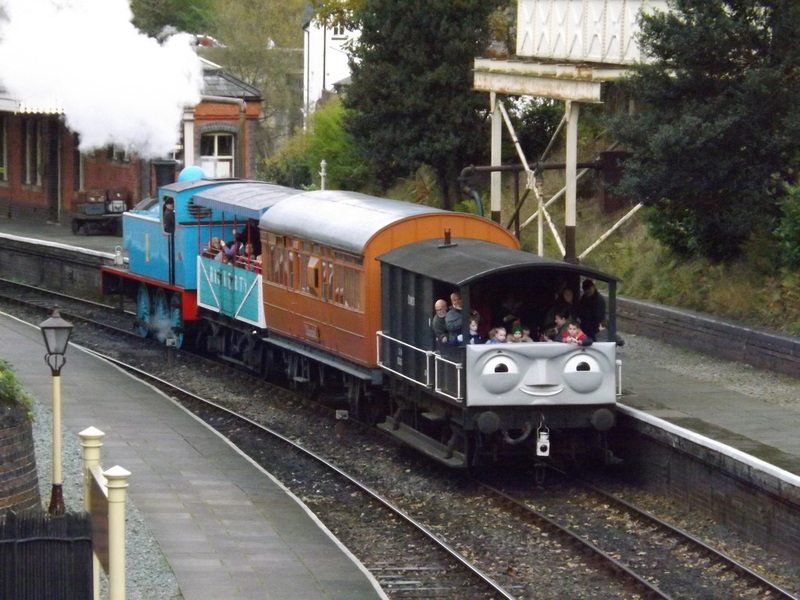 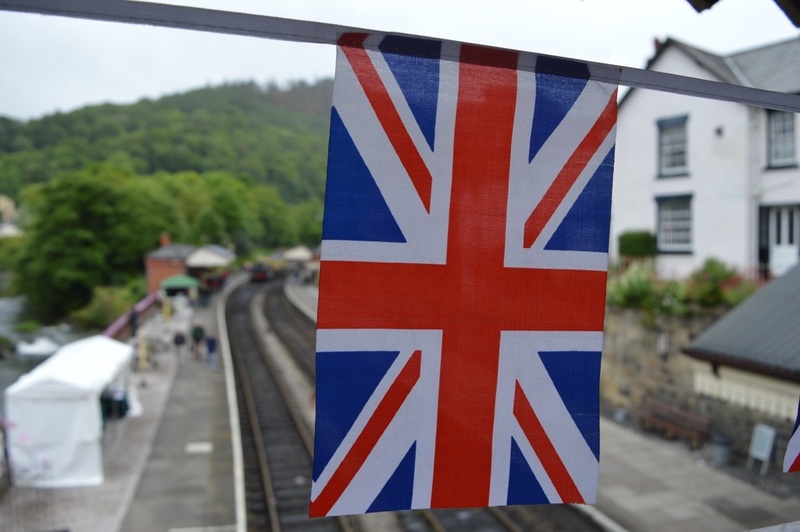 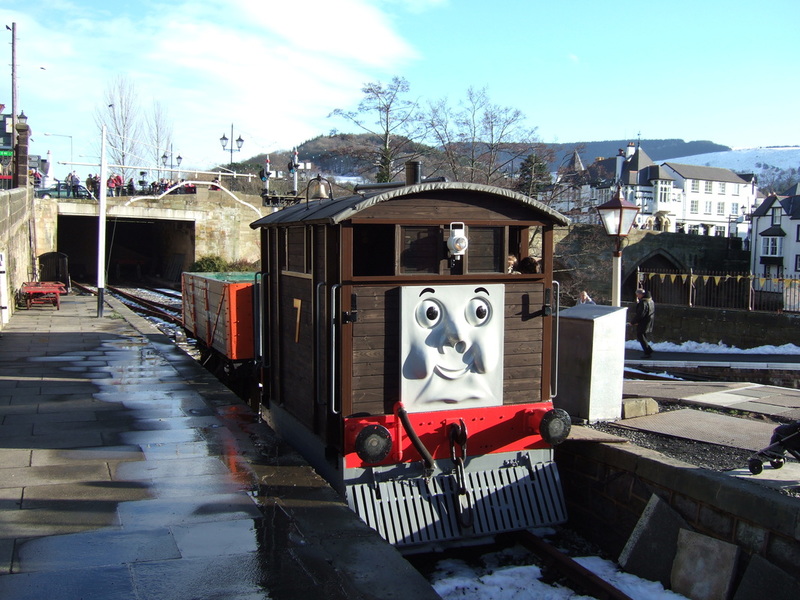 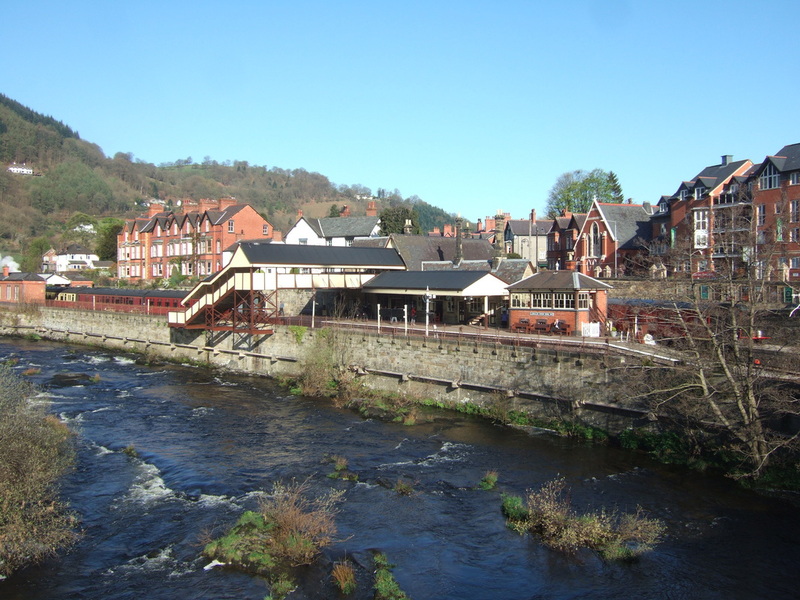 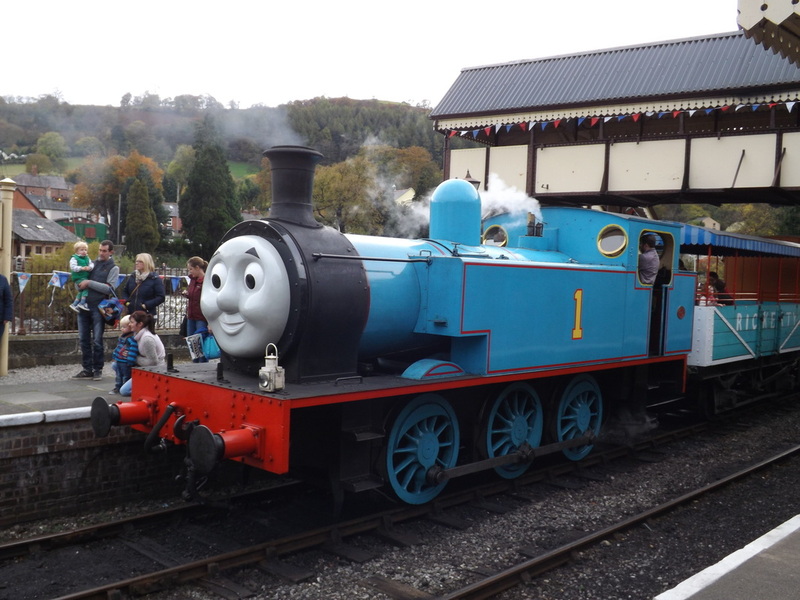 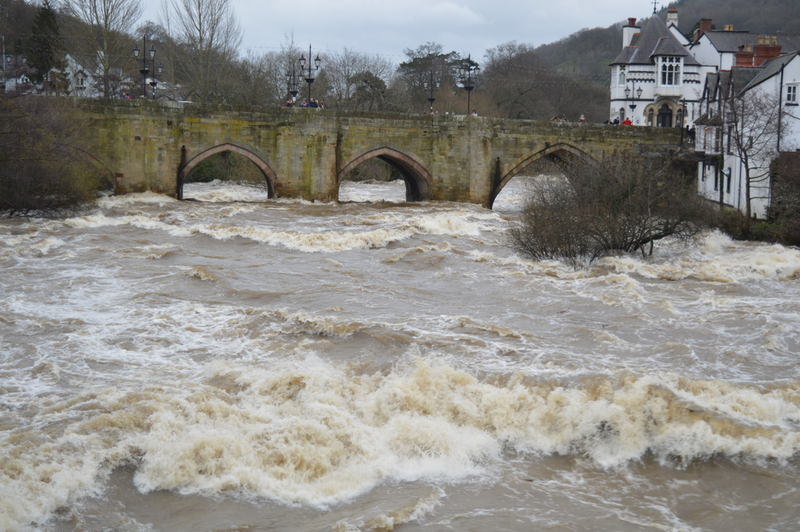 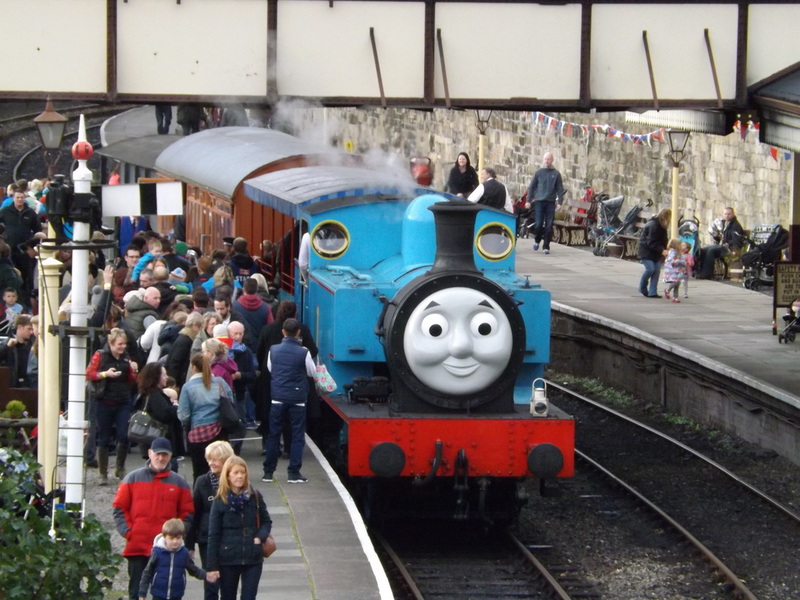 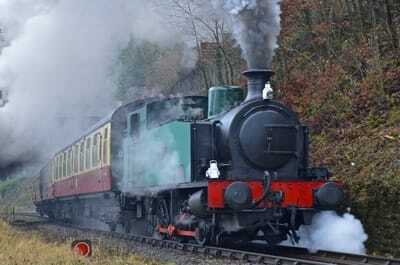 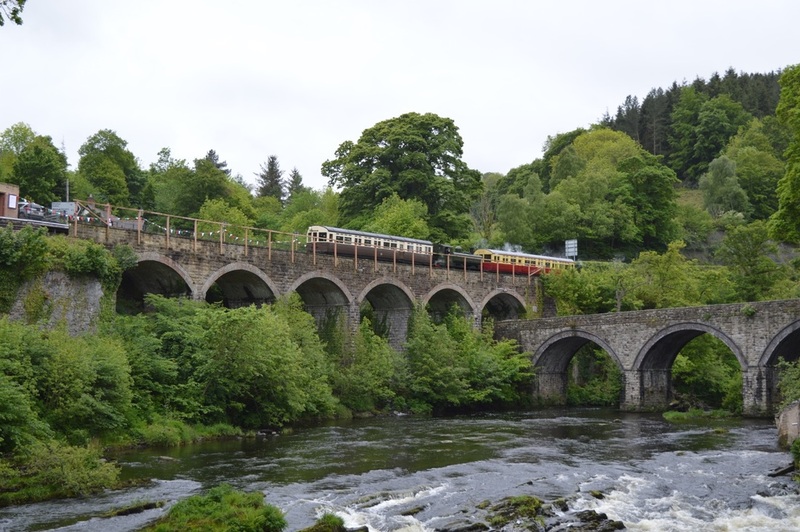 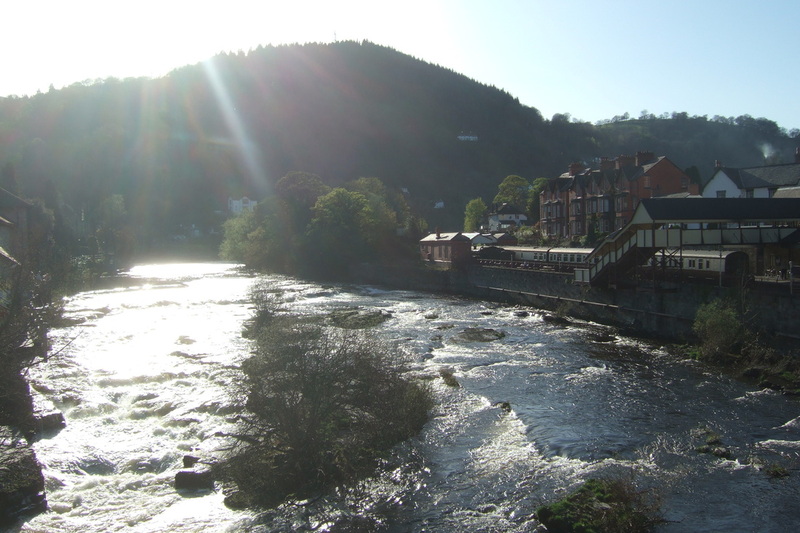 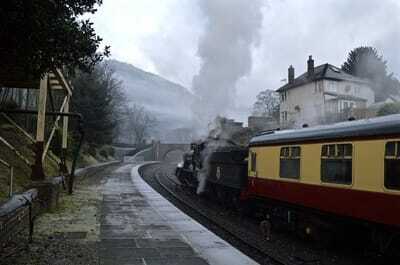 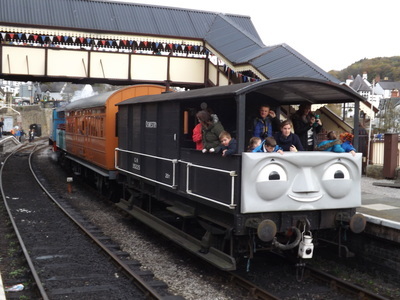 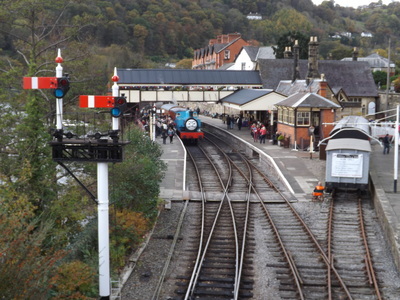 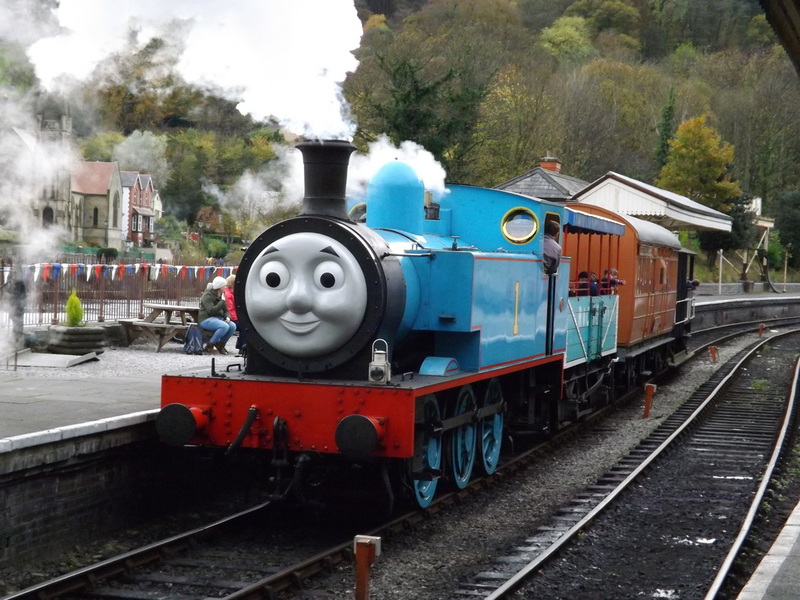 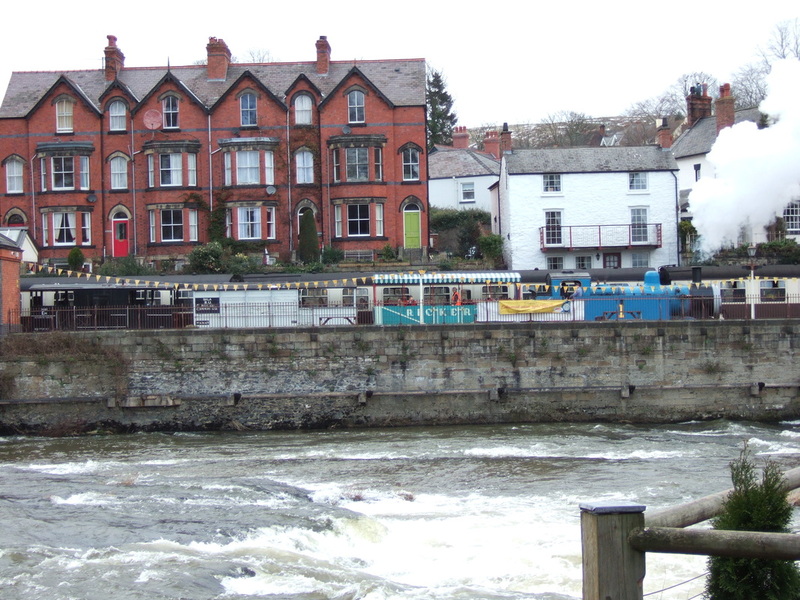 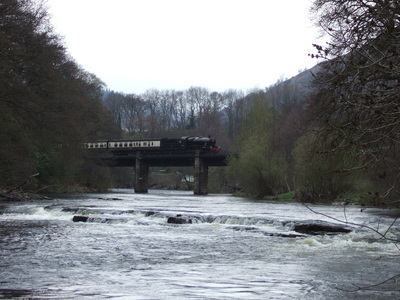 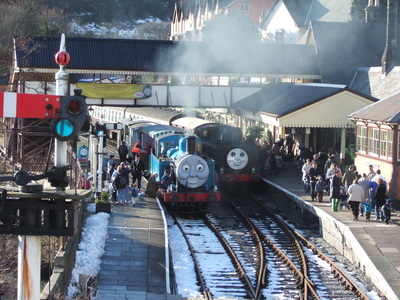 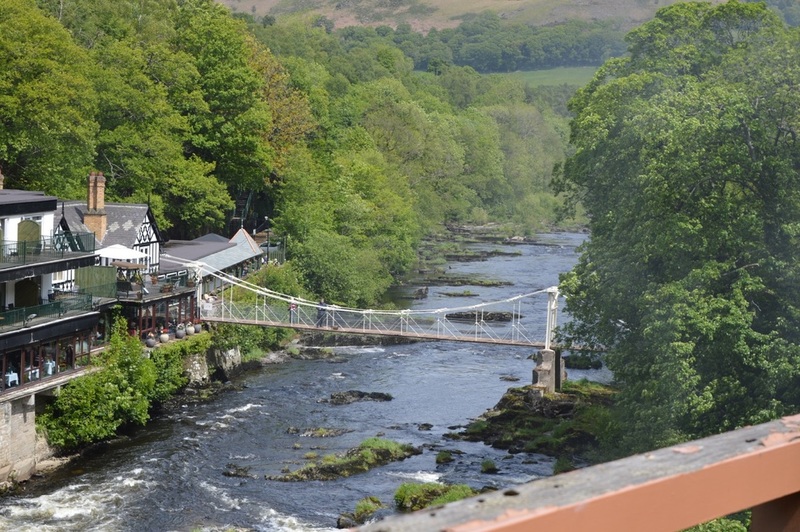 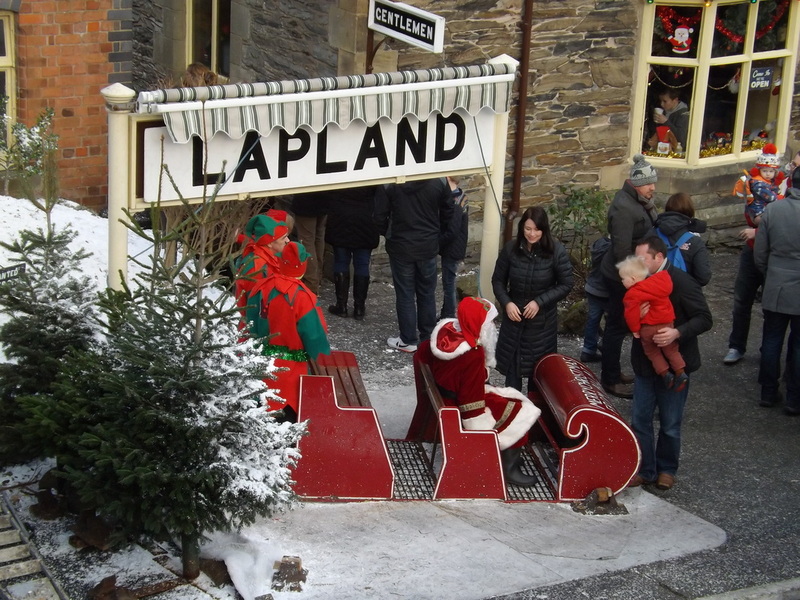 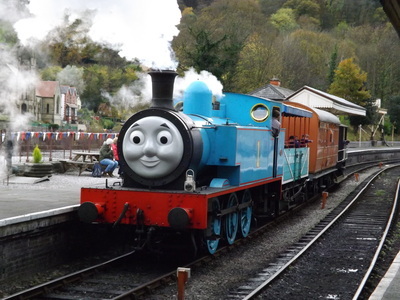 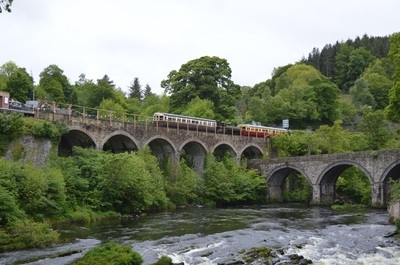 Thomas the tank engine and friends visit Llangollen four times a year, each February, June, August and October. 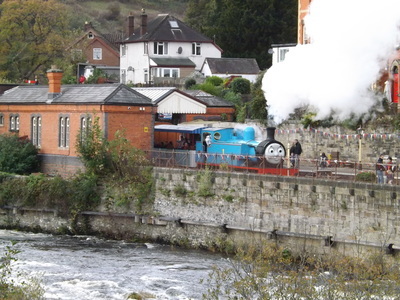 Thomas (usually played the lines converted saddle tank 'Jessie') runs shuttle journeys up and down Llangollen station, while Daisy the DMU and a steam locomotive (usually either 3802 playing Goliath, which was named by local school children or a Black Five playing Douglas) pull trains between Llangollen and Carrog. On 26th October 2014, I passed by Llangollen were Jessie was taking up her Thomas duties at the station with 45337 and the lines DMU running the main line service. 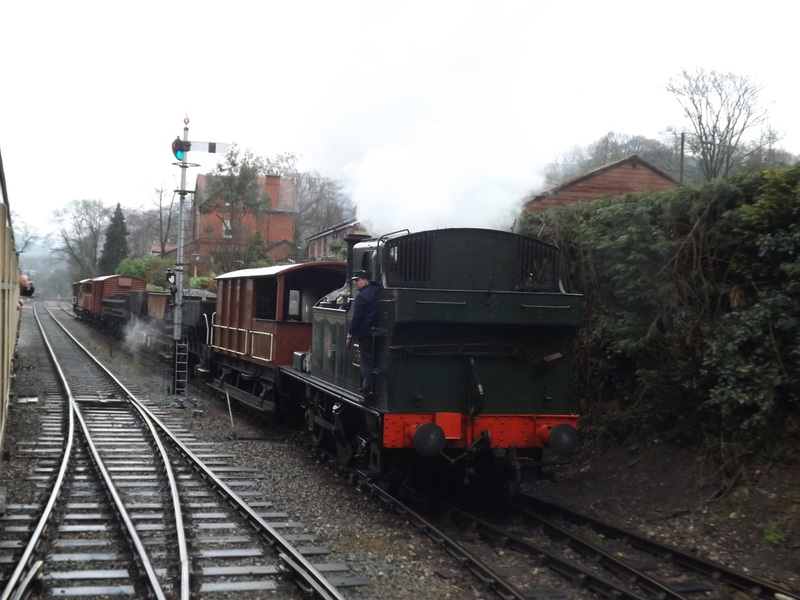 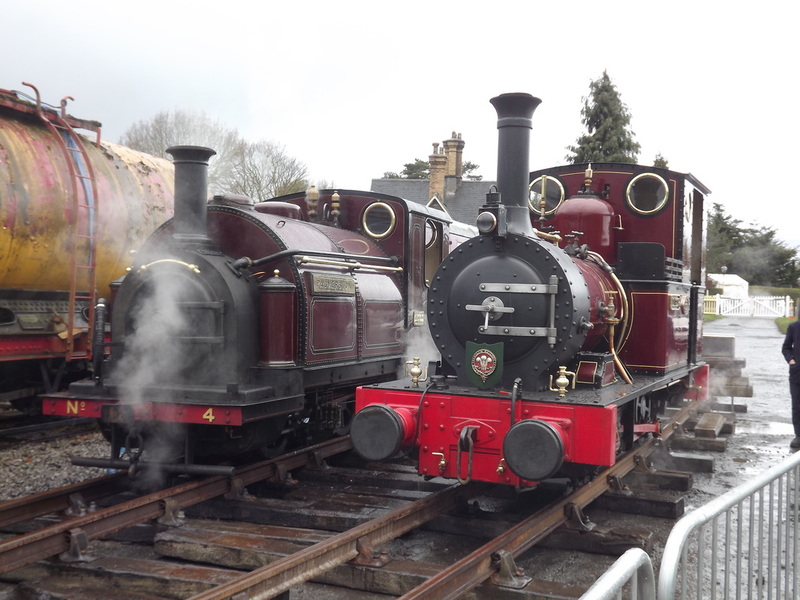 While only having four locomotives in action (and three on Sunday following a failure), a strong theme lead this to be a really enjoyable event. 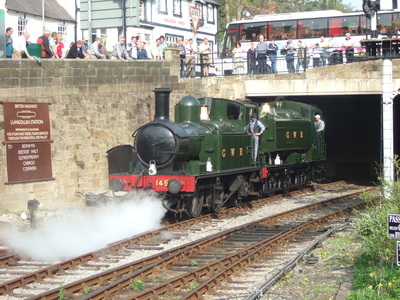 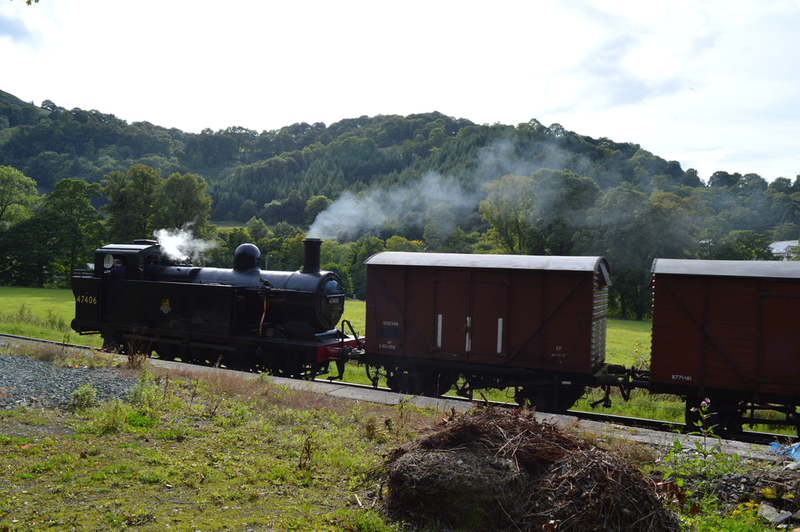 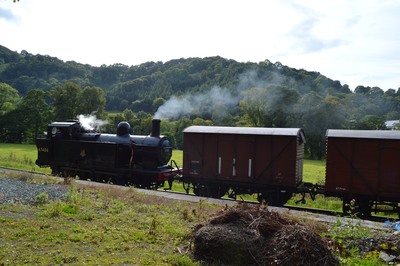 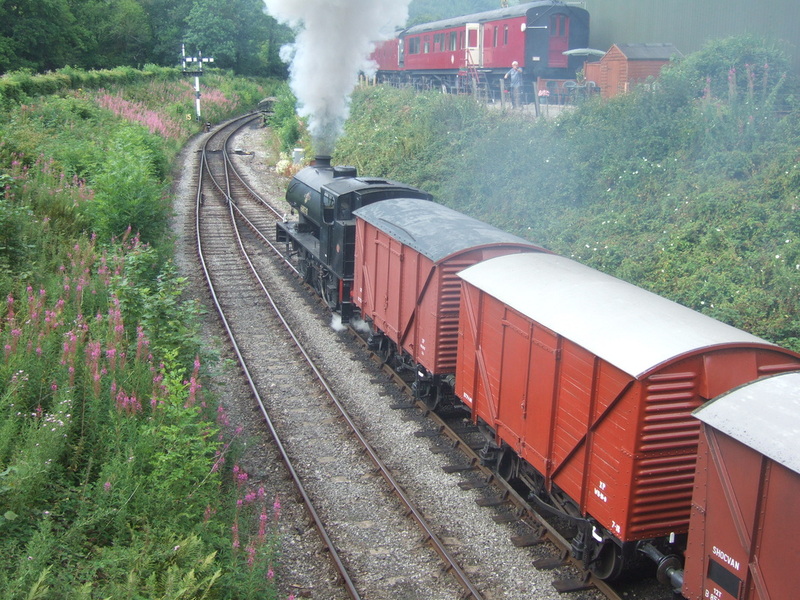 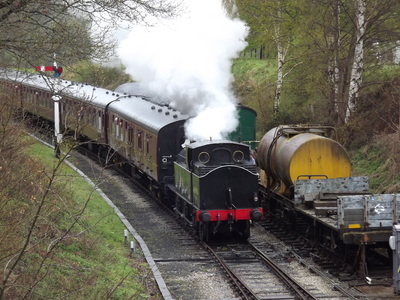 Each afternoon a short goods ran, calling at Berwyn to pick up goods, with the visiting Pannier tank 1638 (from Kent and East Sussex Railway). 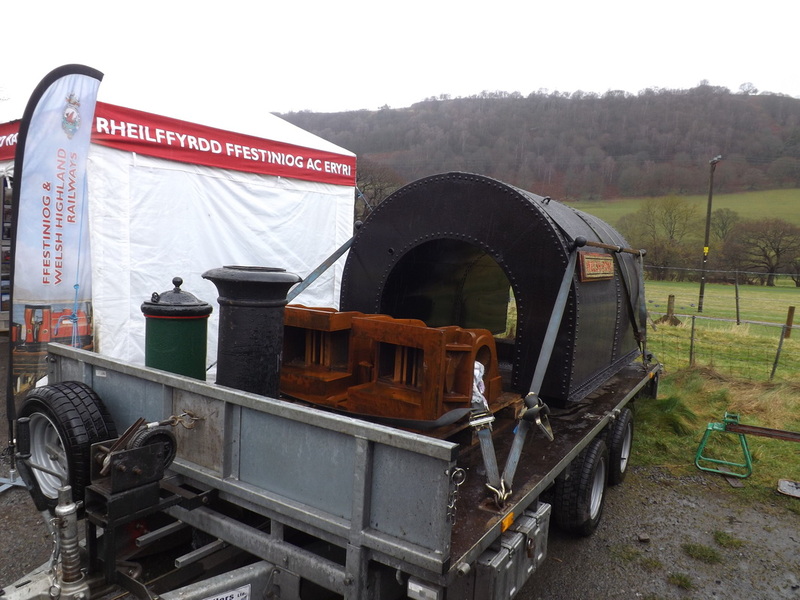 The event had a theme of Croes Neywdd shed. 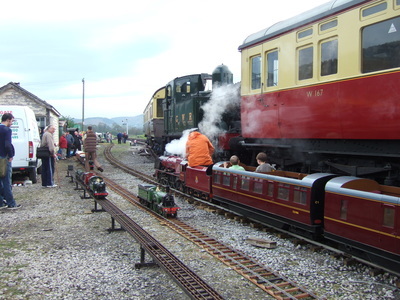 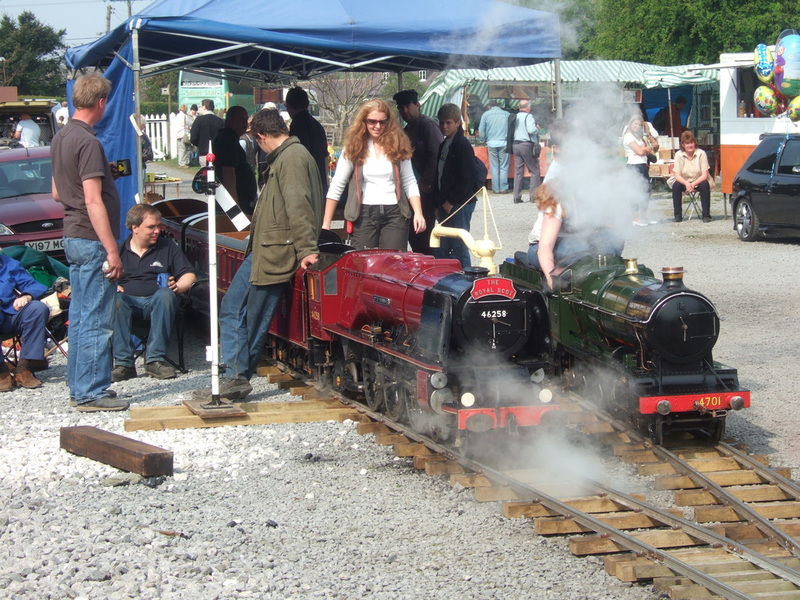 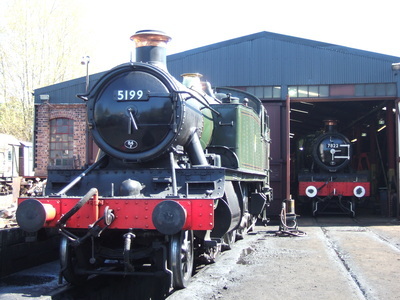 The Wrexham shed is a perfect theme for the railway, with locomotives often serving the Barmouth road. 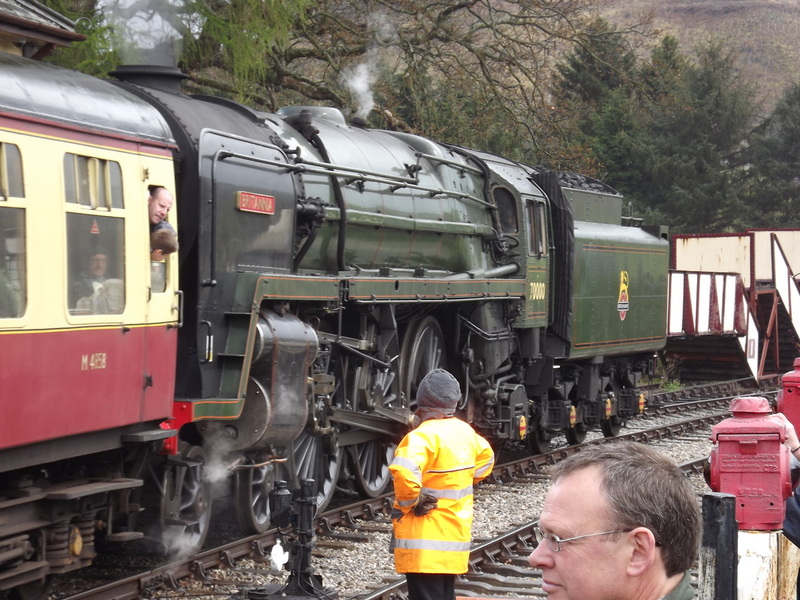 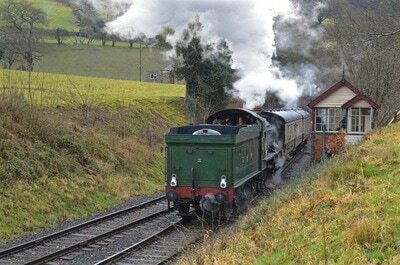 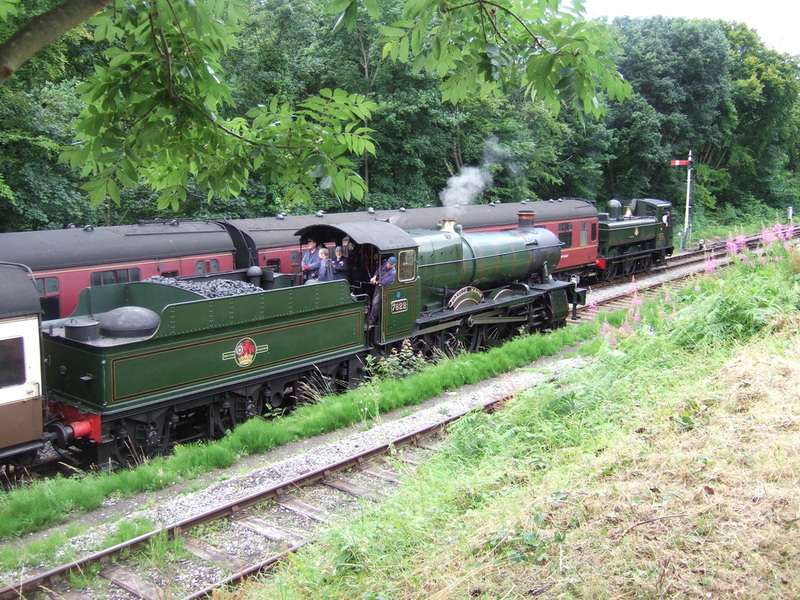 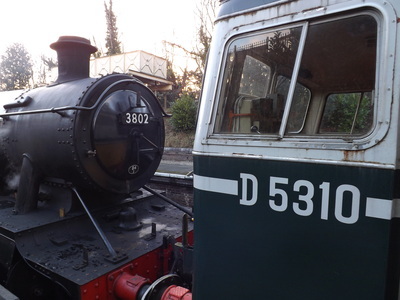 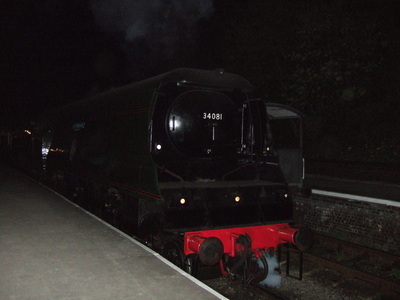 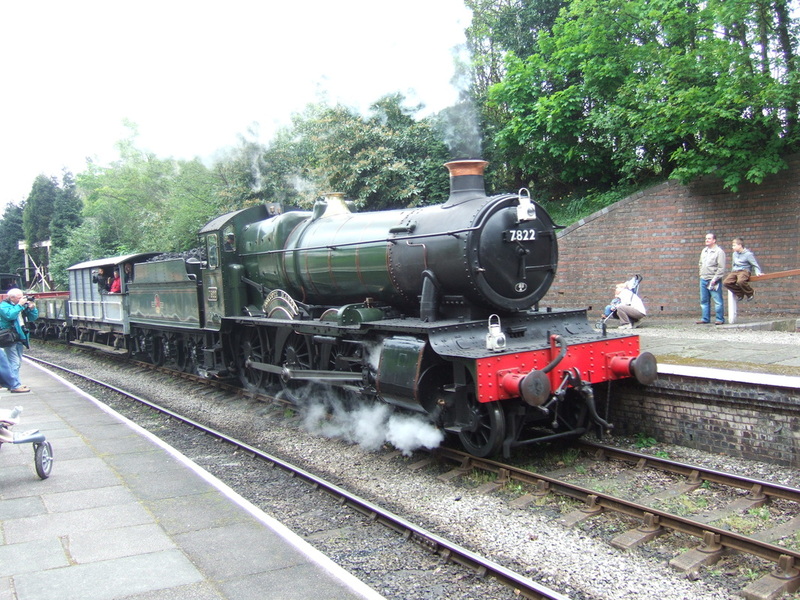 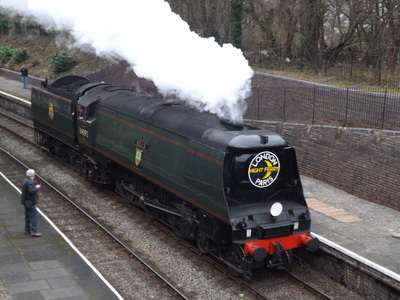 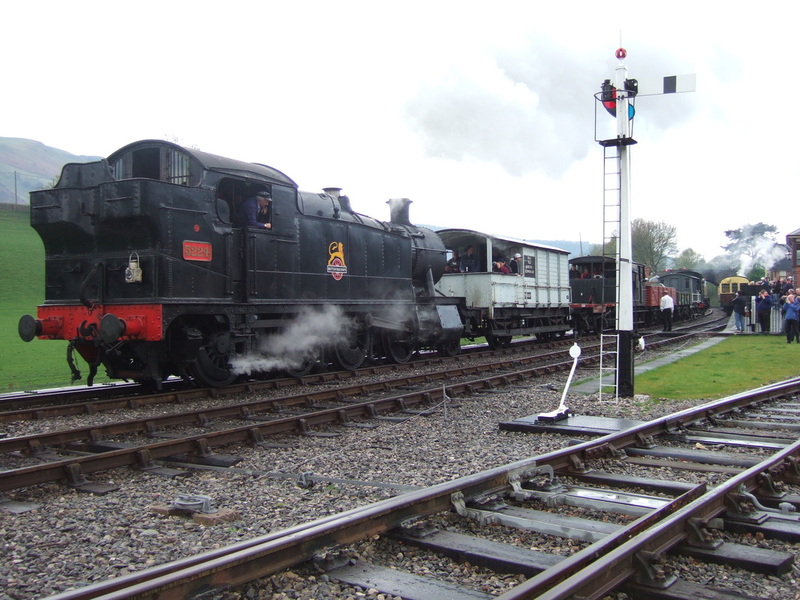 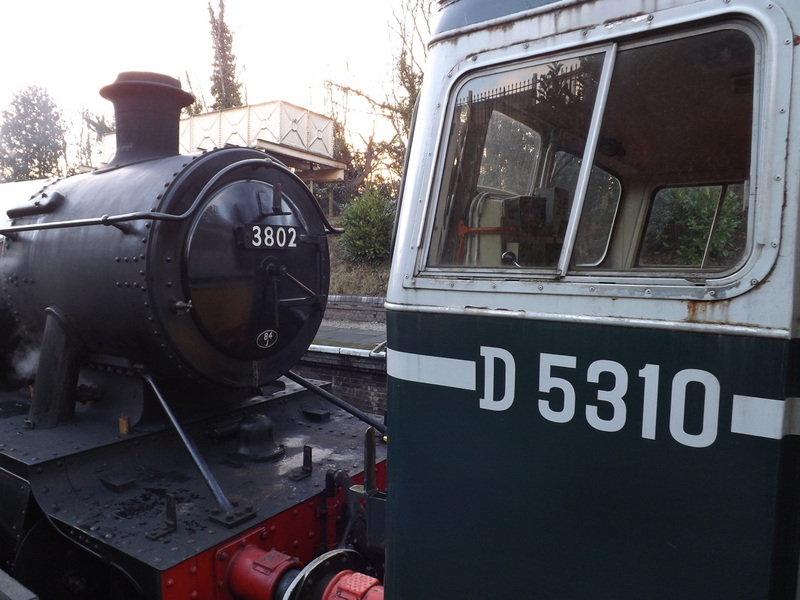 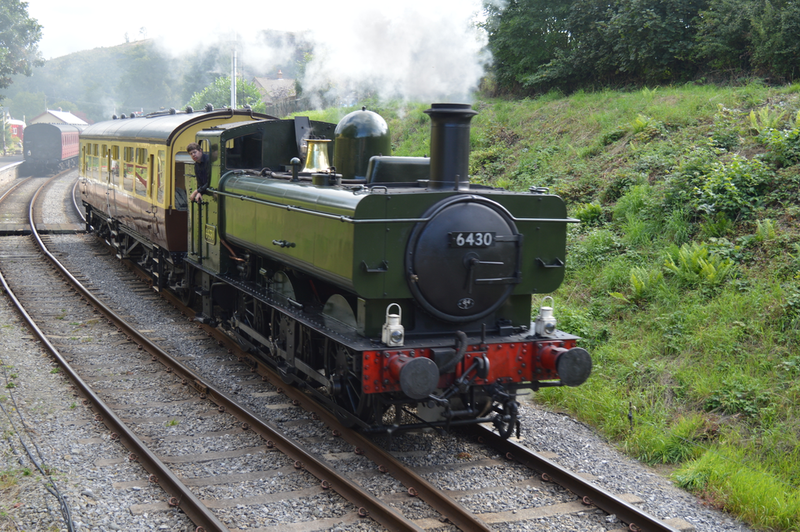 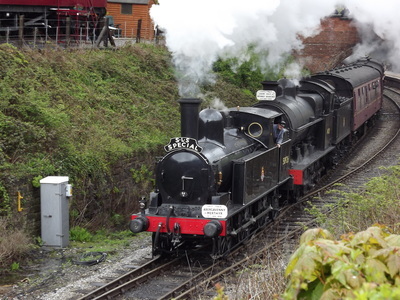 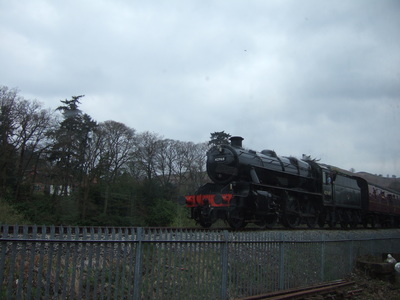 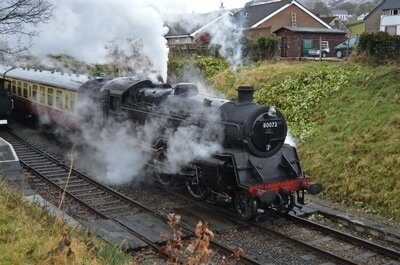 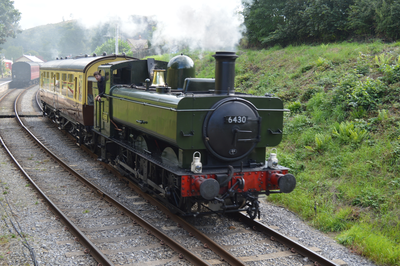 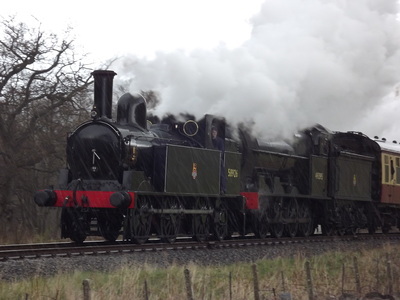 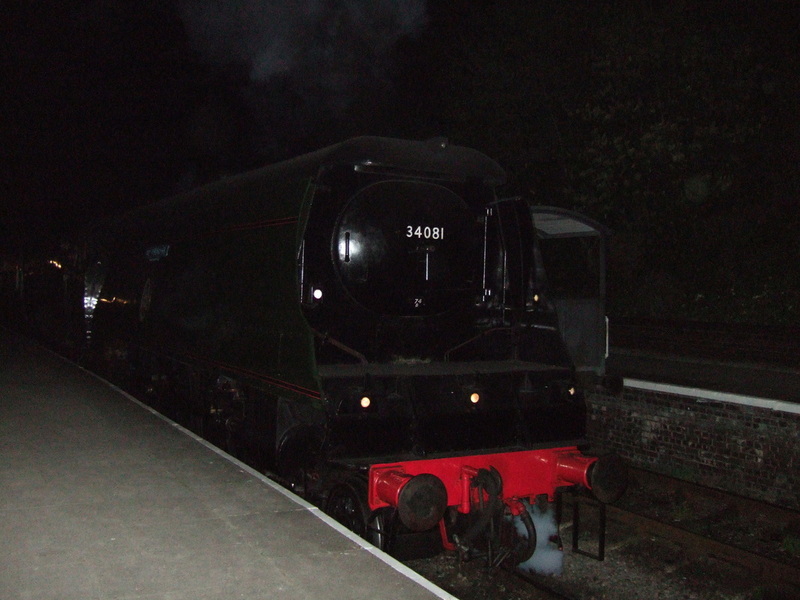 The event saw two visitors, the Pannier mentioned above, alongside 5322 from Didcot. These joined home fleet members 3802 and 80072 (masquerading as 80096). The 1960s, a period when steam was on the way out and diesels were on the way in, at Llangollen they remember this period each July. 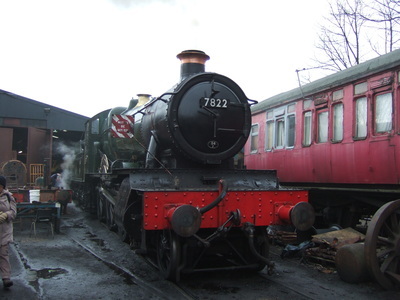 In 2011, Manor 4-6-0 7822 Foxcote Manor was cosmetically weathered for the event to appear in a run down 1960s period. 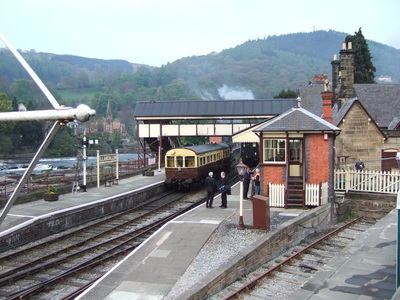 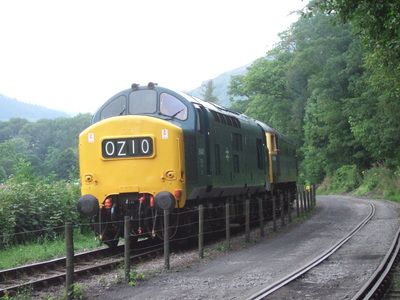 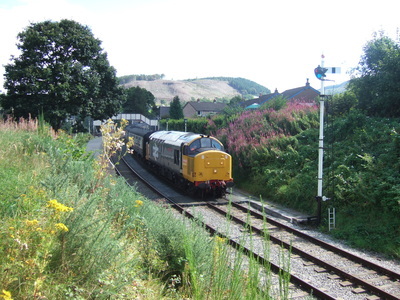 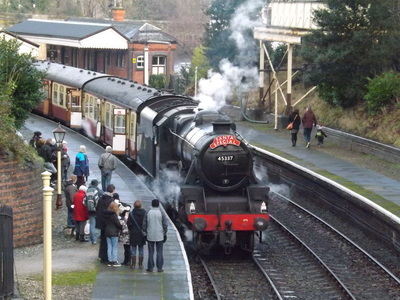 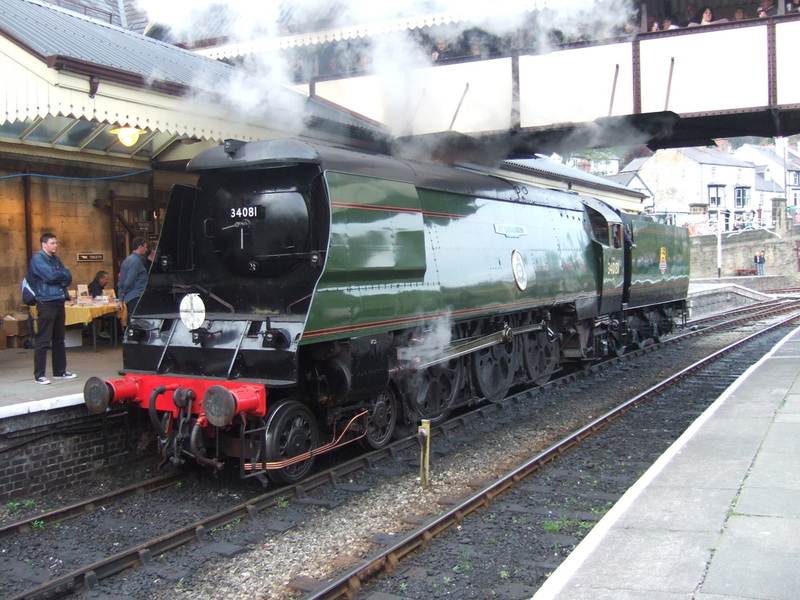 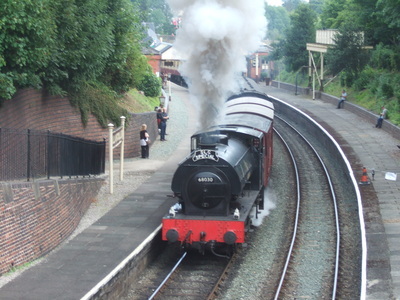 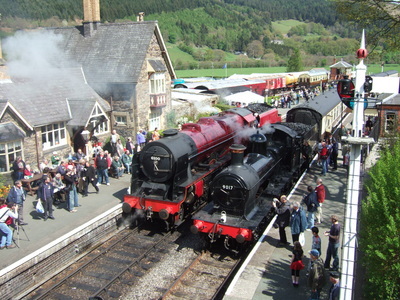 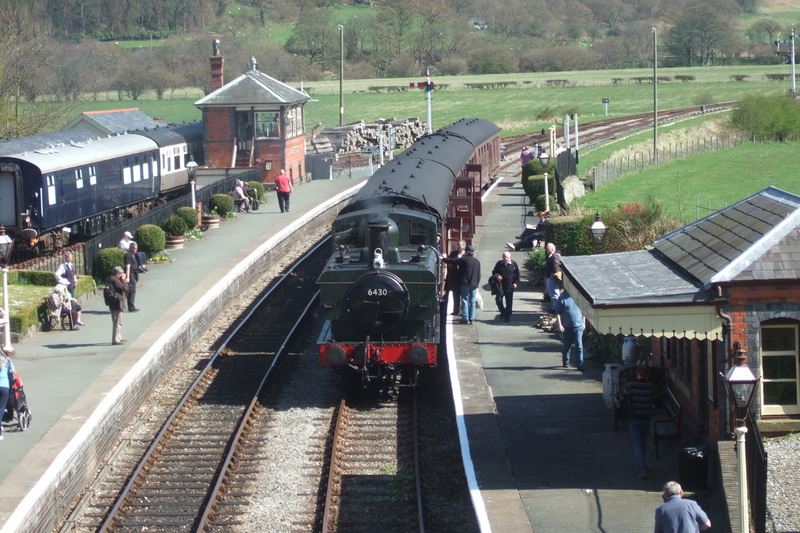 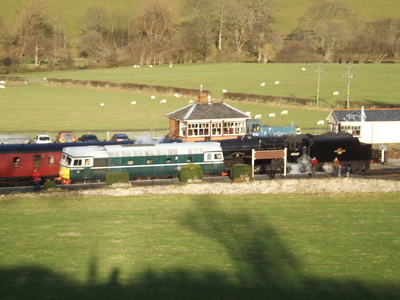 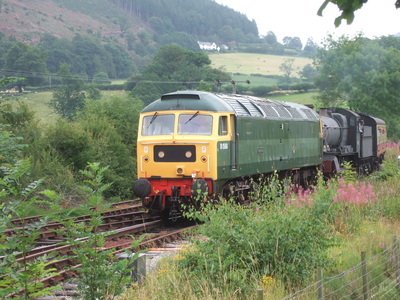 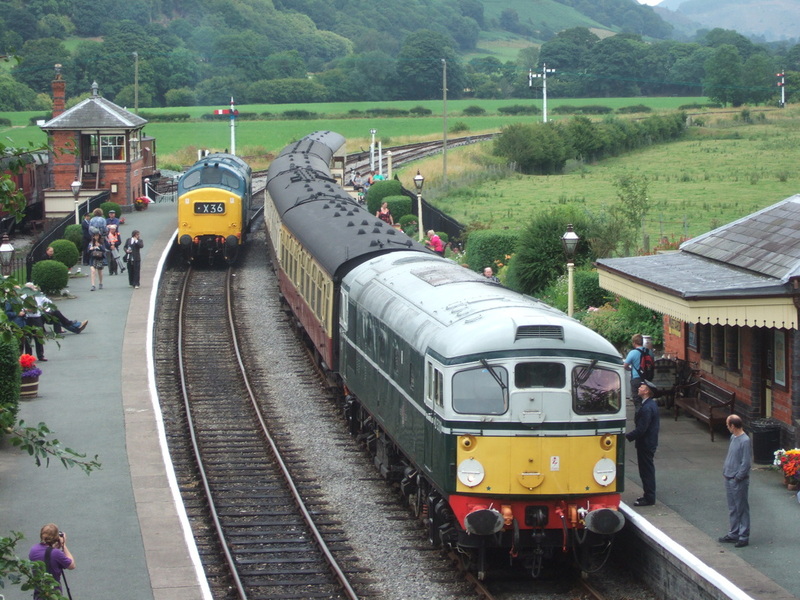 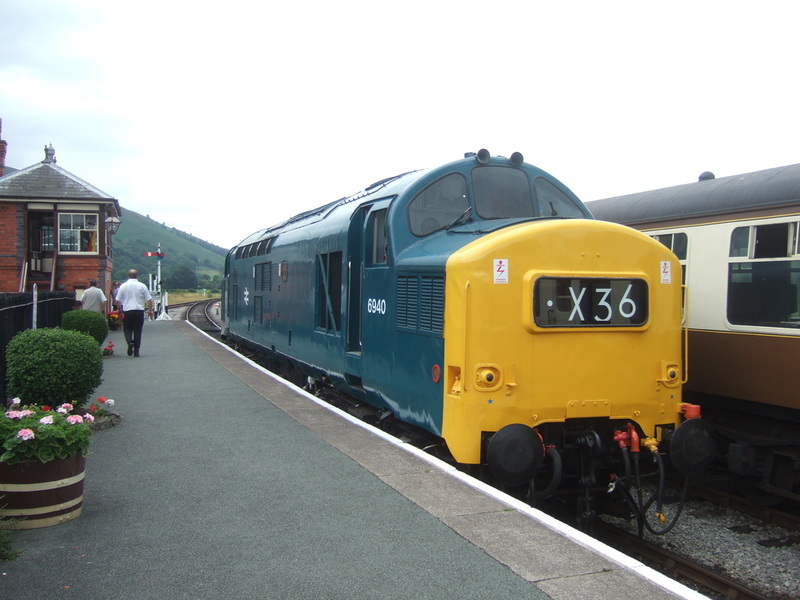 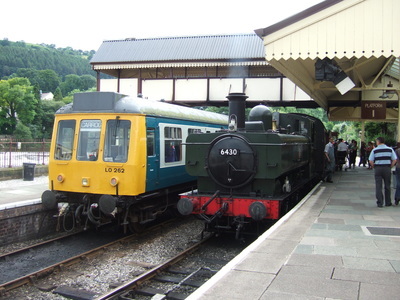 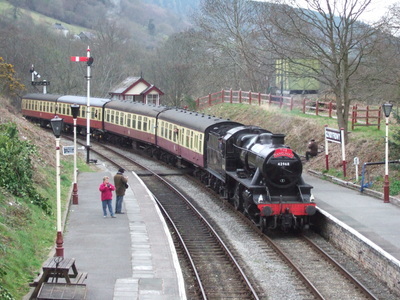 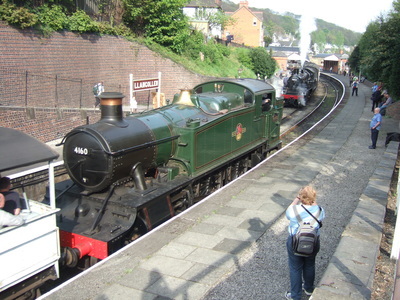 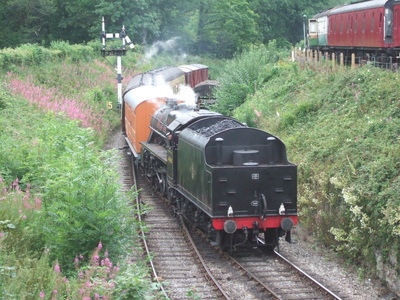 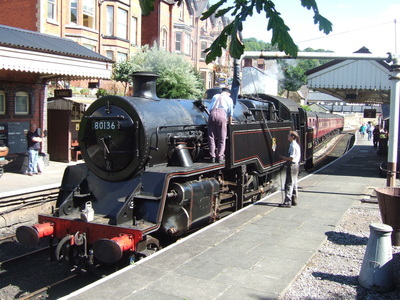 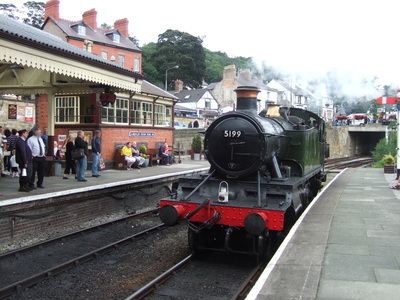 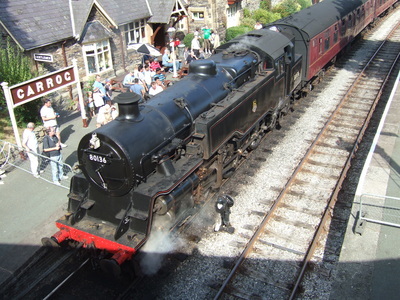 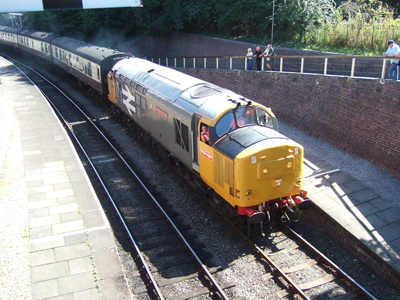 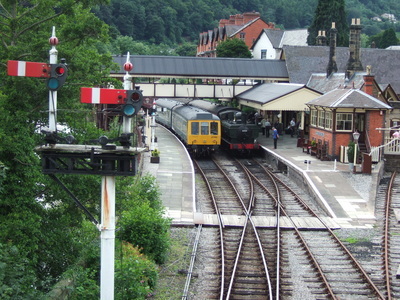 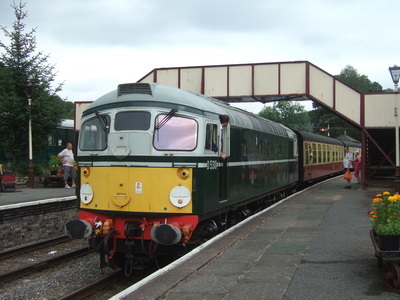 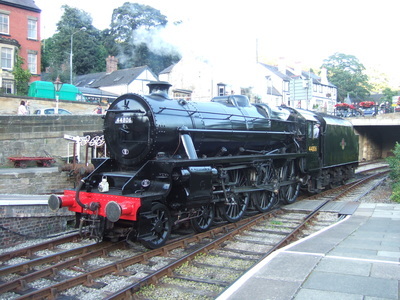 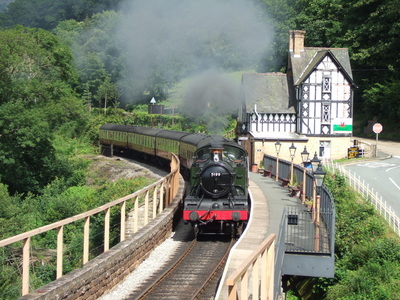 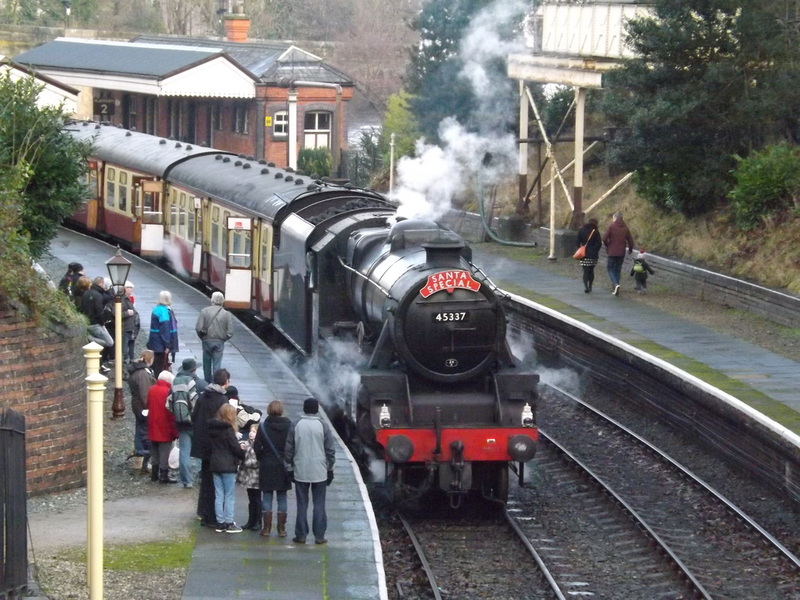 The event featured live music at Llangollen station, mixed trains, a visiting locomotive in the form of Austerity 68030 which had been at the line for engineering works, double heading between steam and diesel, and Foxcote Manor being dragged by the lines Class 37 to recreate a locomotive being dragged for scrap. 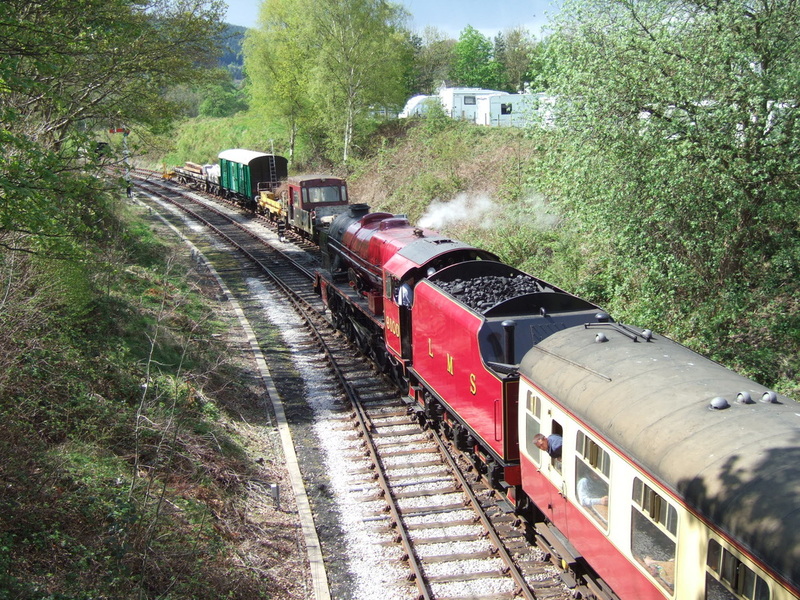 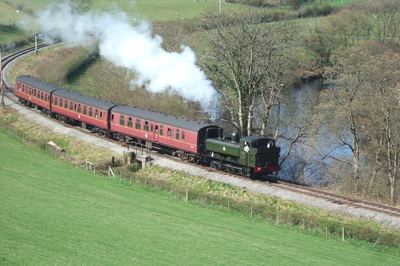 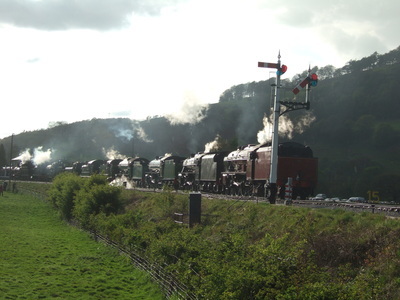 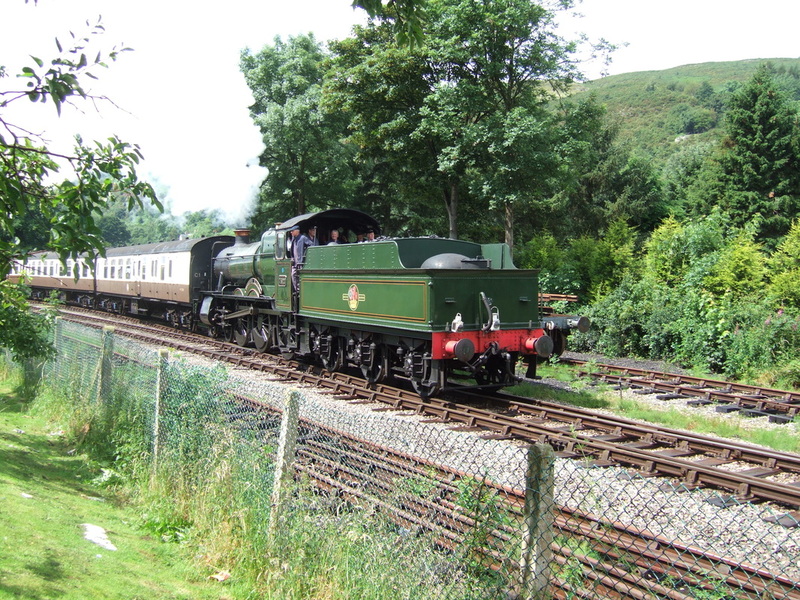 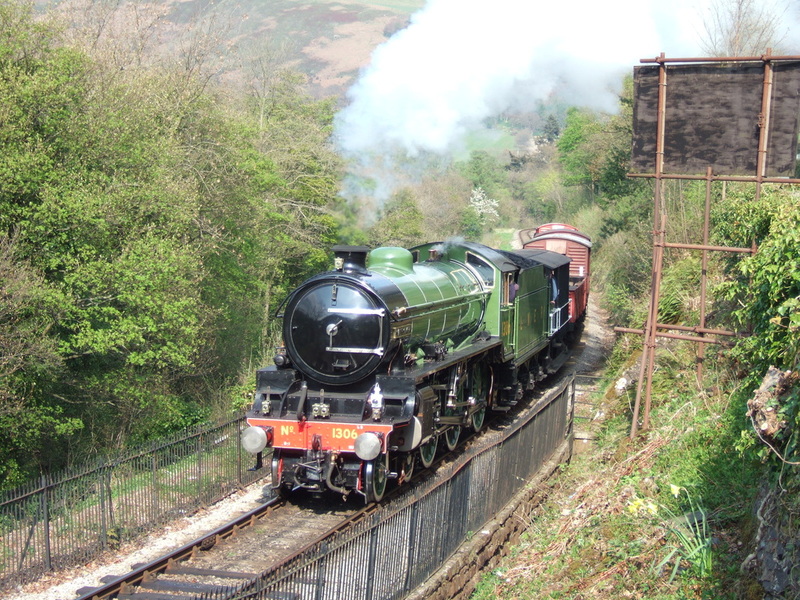 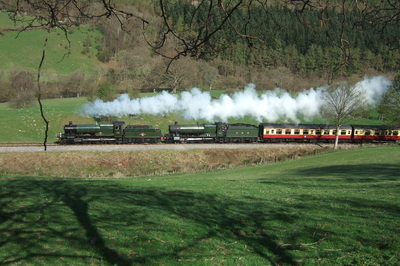 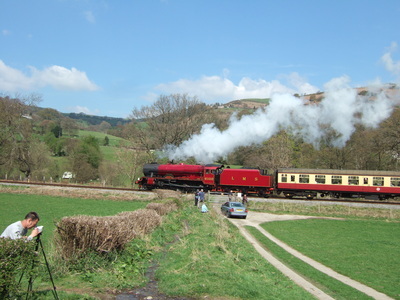 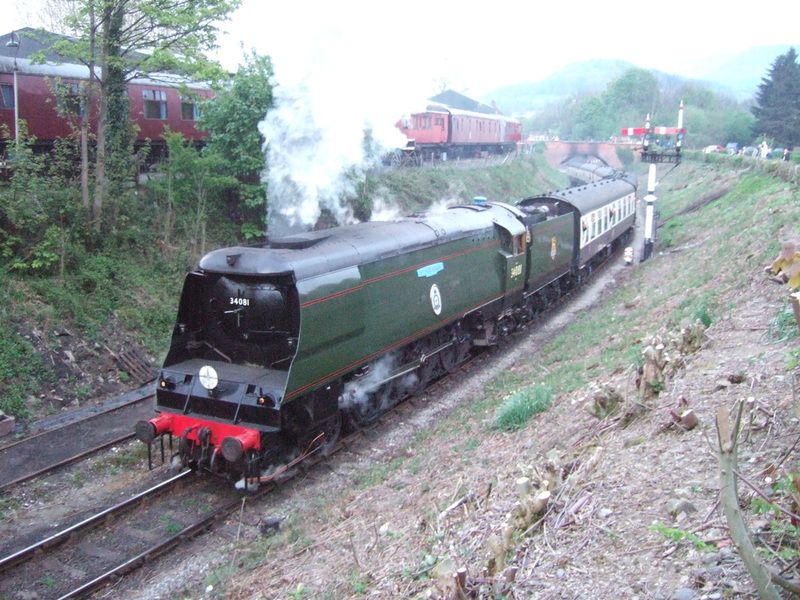 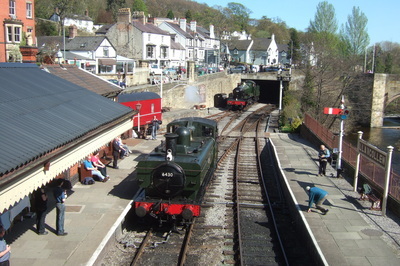 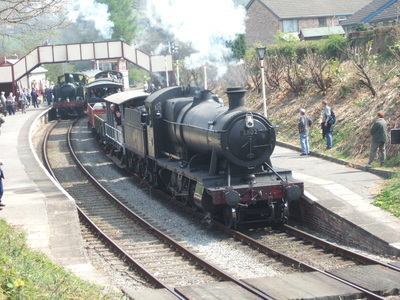 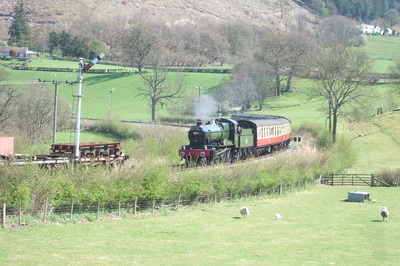 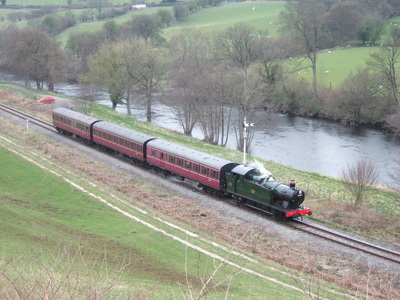 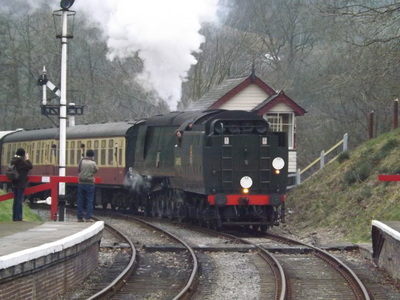 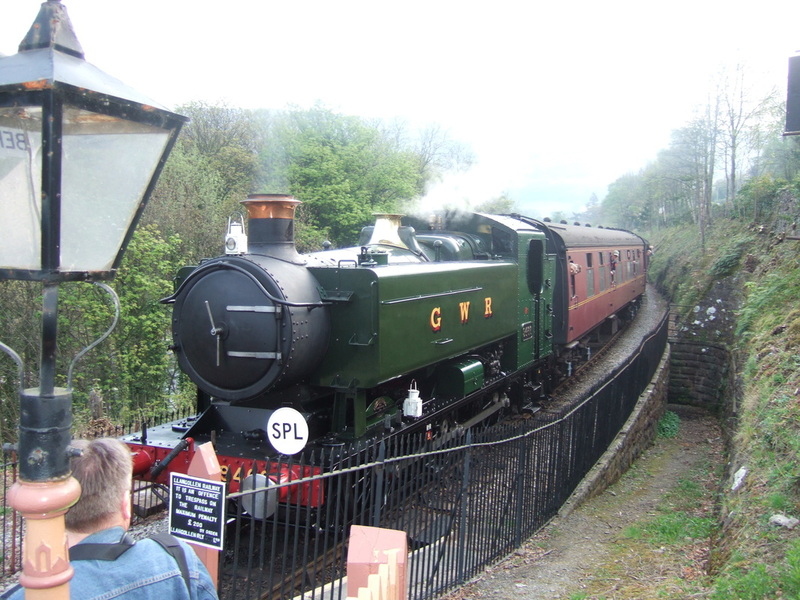 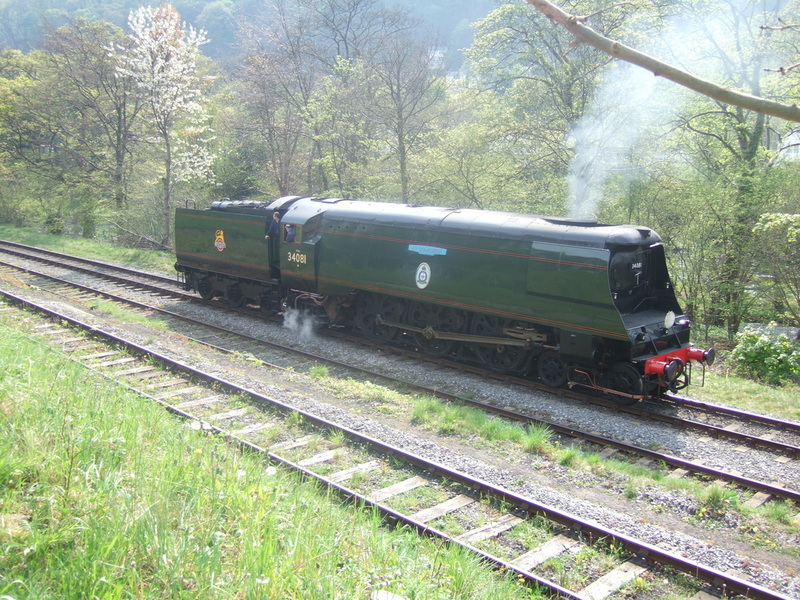 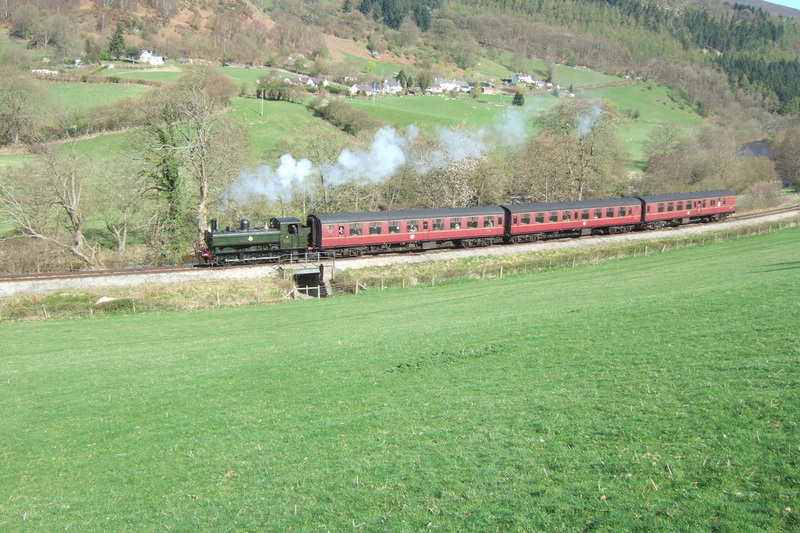 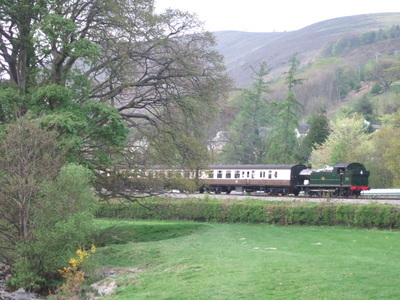 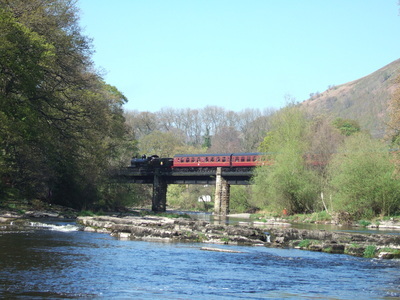 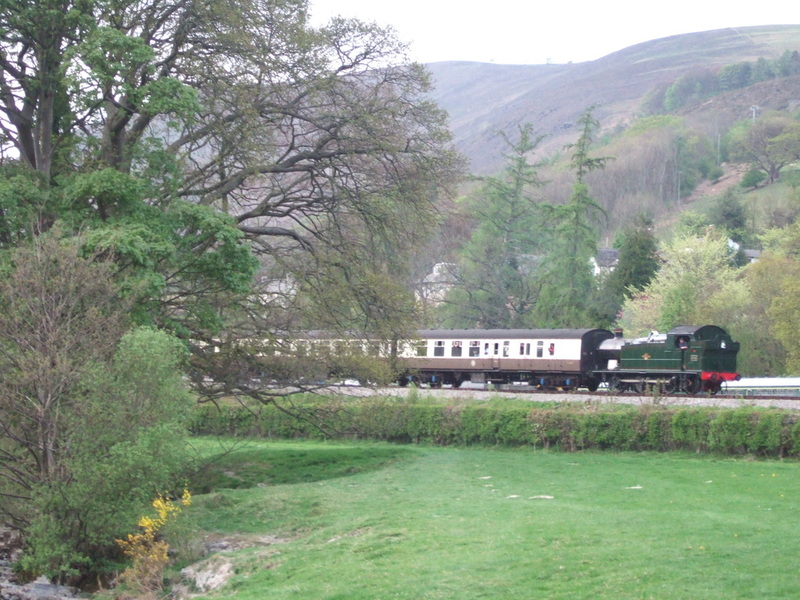 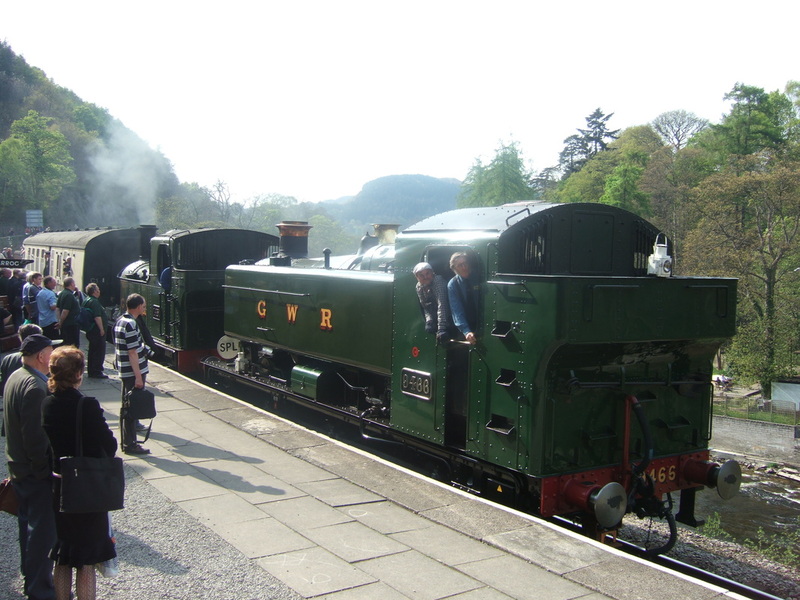 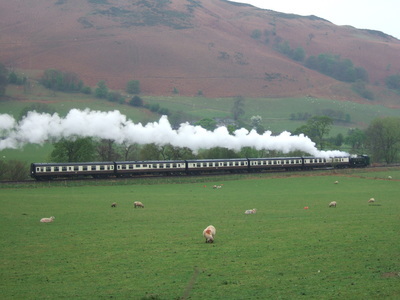 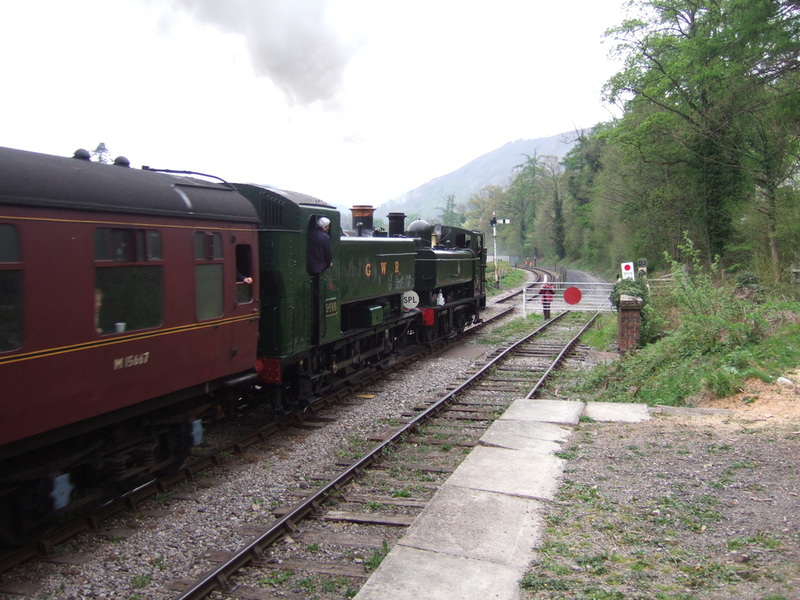 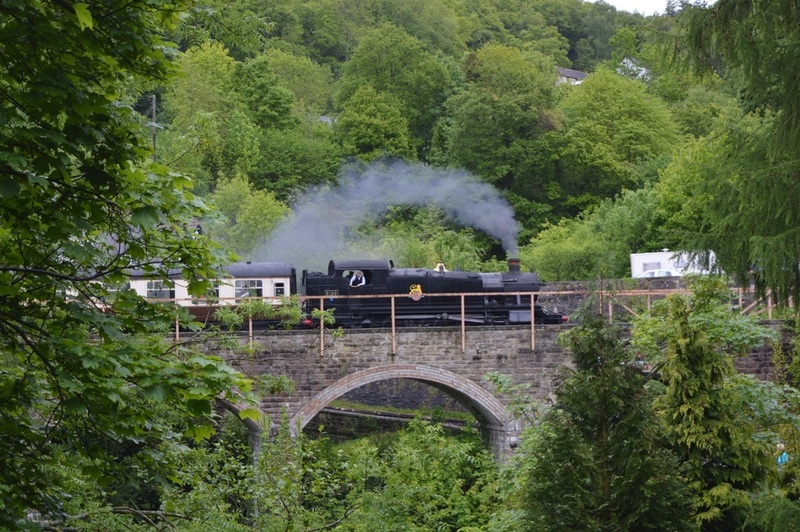 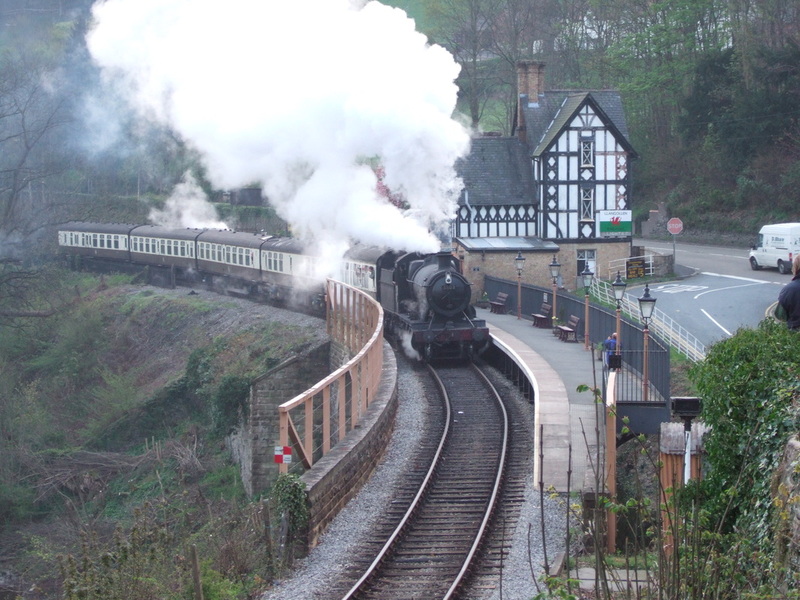 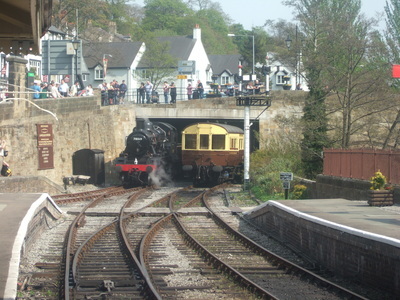 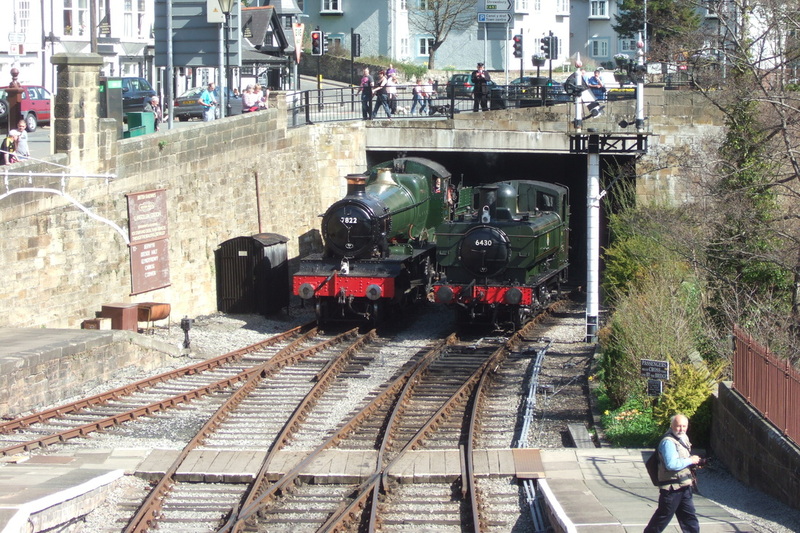 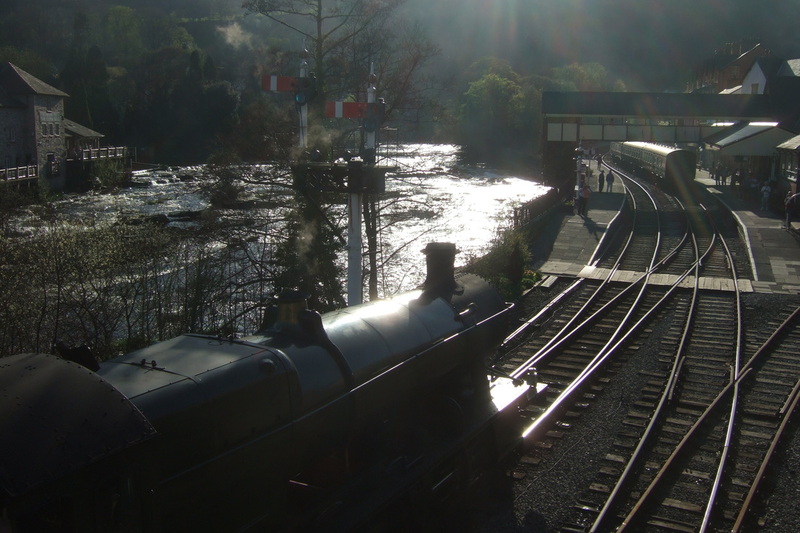 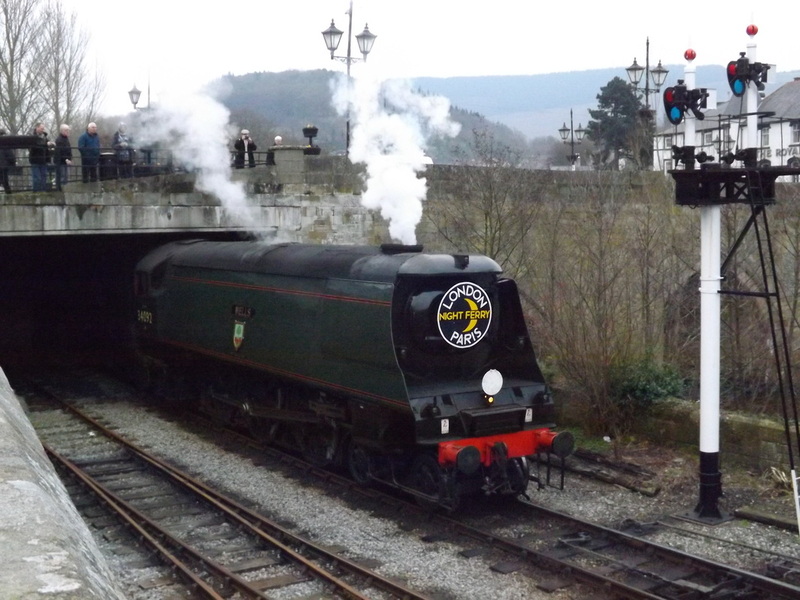 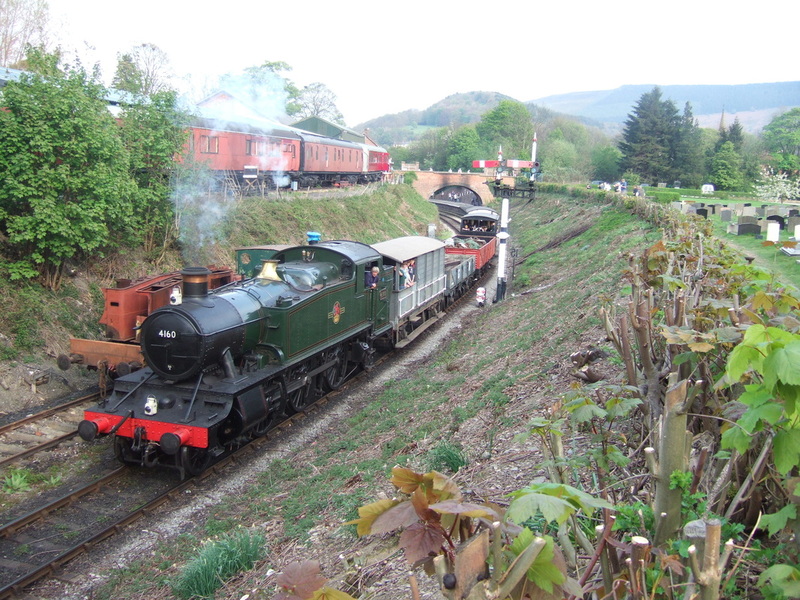 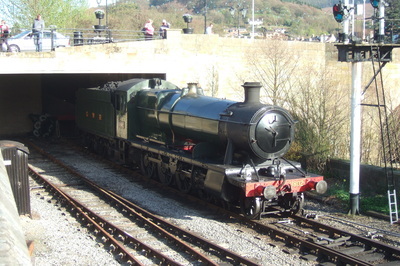 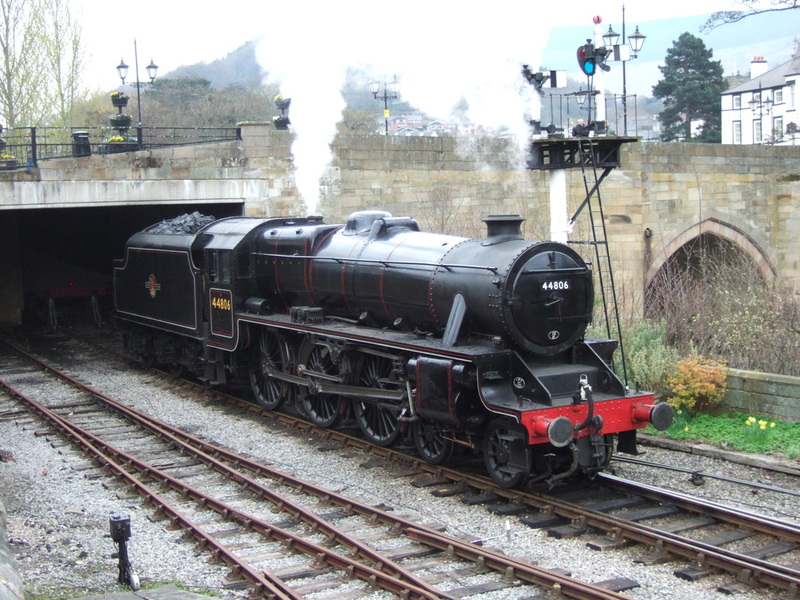 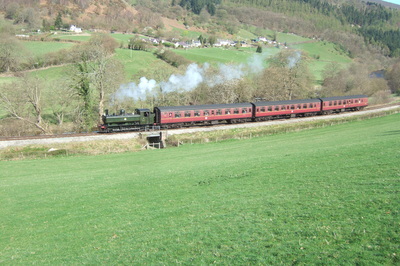 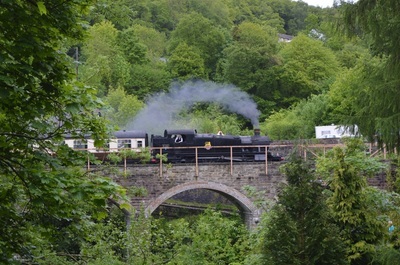 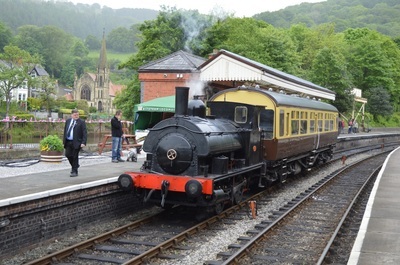 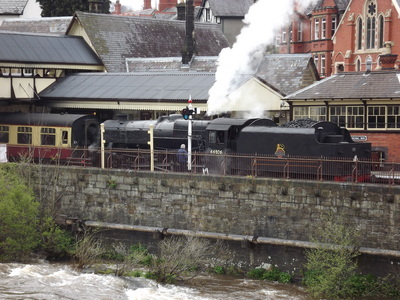 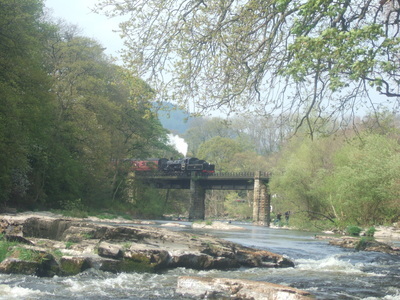 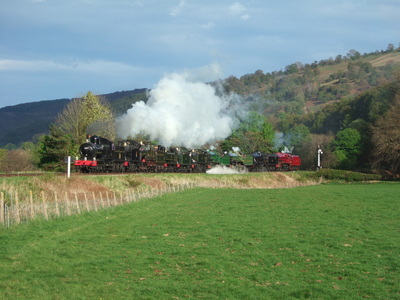 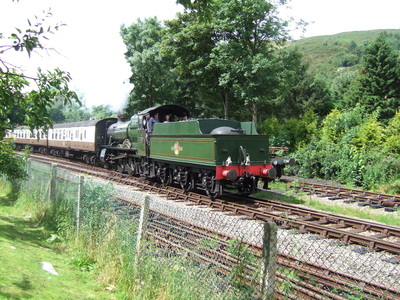 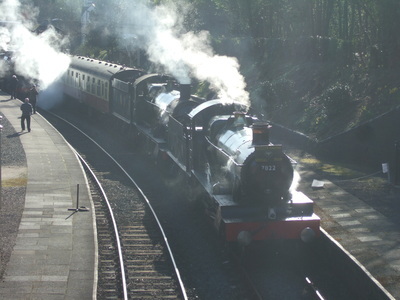 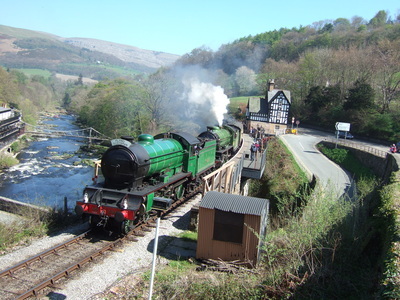 The Spring Steam Gala in 2011 at Llangollen, featured the home fleet with five locomotives in steam on a mix of passenger and freight trains. 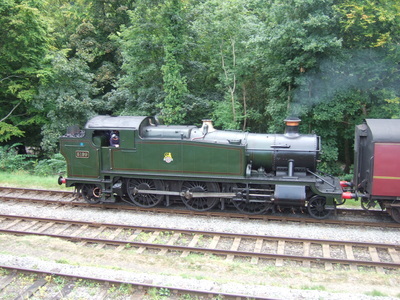 Foxcote Manor was the star of the show with the weekend being her first turns since overhaul. 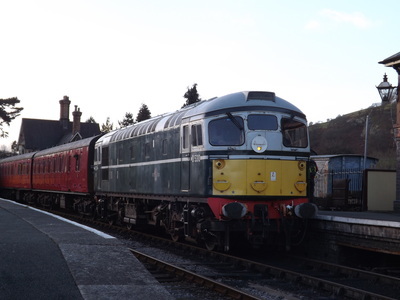 It was due to be joined by 7812 Erlestoke Manor, but this did not end up visiting, the crew of 3802, which double headed with the Manor on its first train, took the spirit of the event by putting some tape to make 3802 to read 7812. 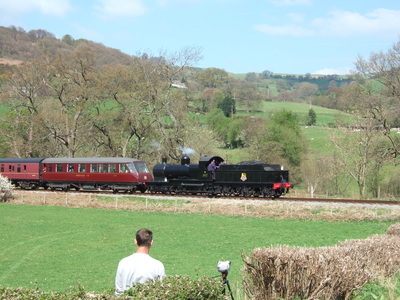 Glorious weather graced the event on the day I visited, with the day generally running to plan, although 6430 had to stop shortly after departing Berwyn for about 5-10minutes as she was running low on steam. 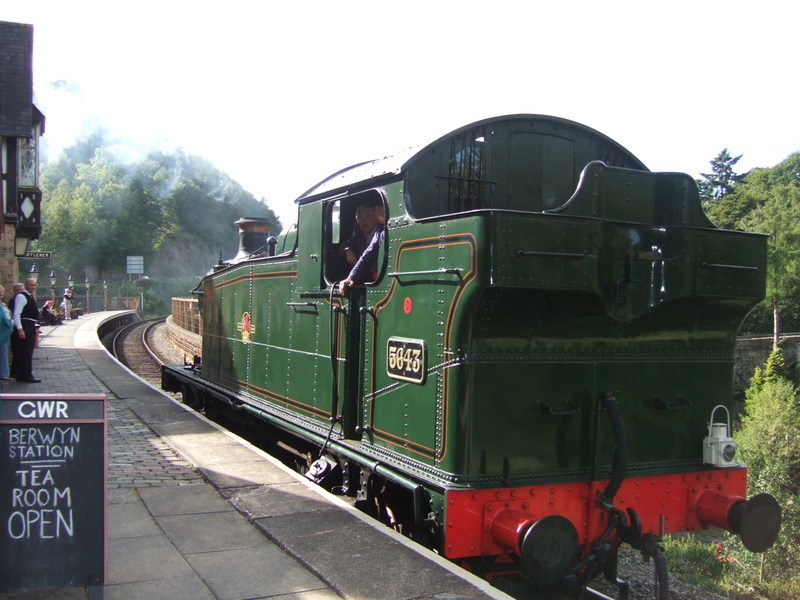 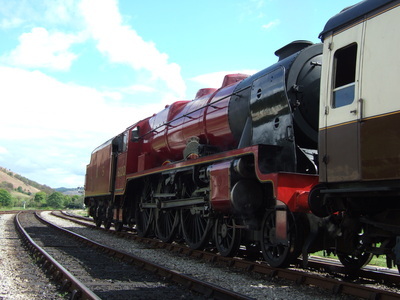 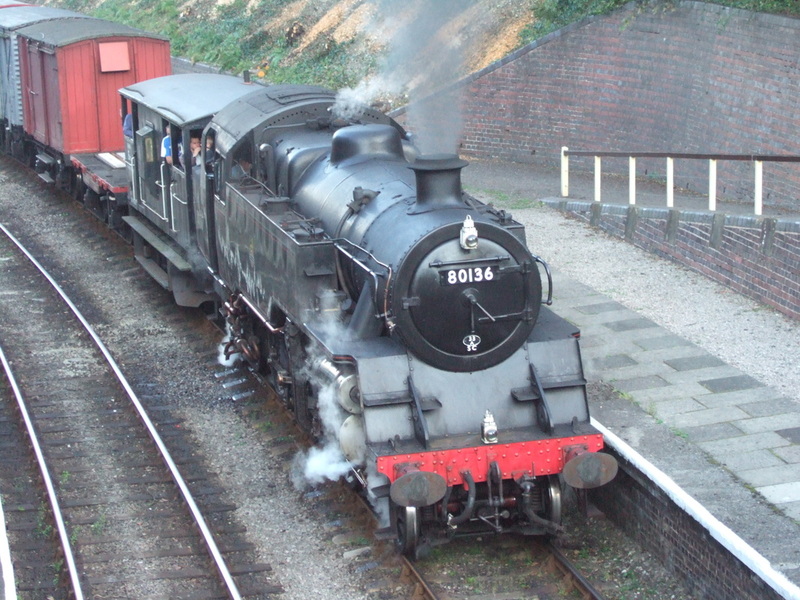 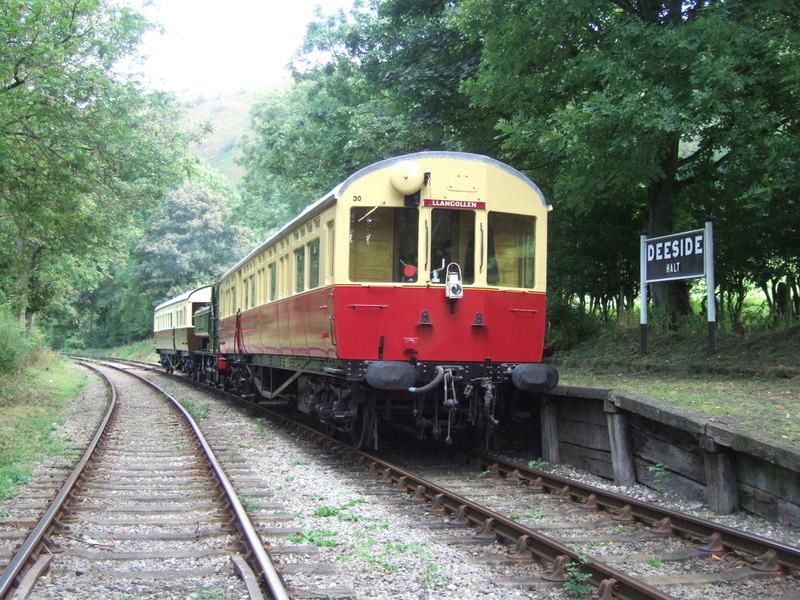 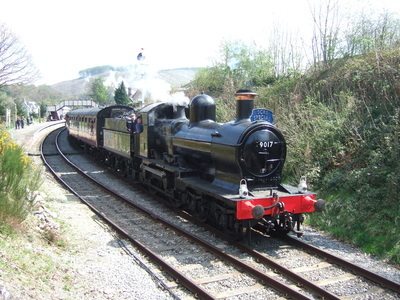 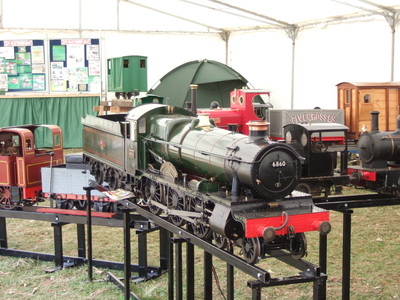 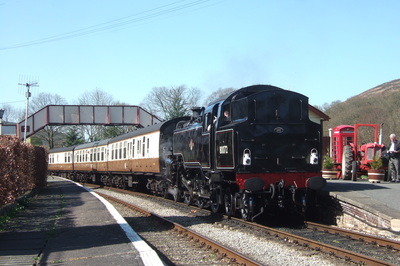 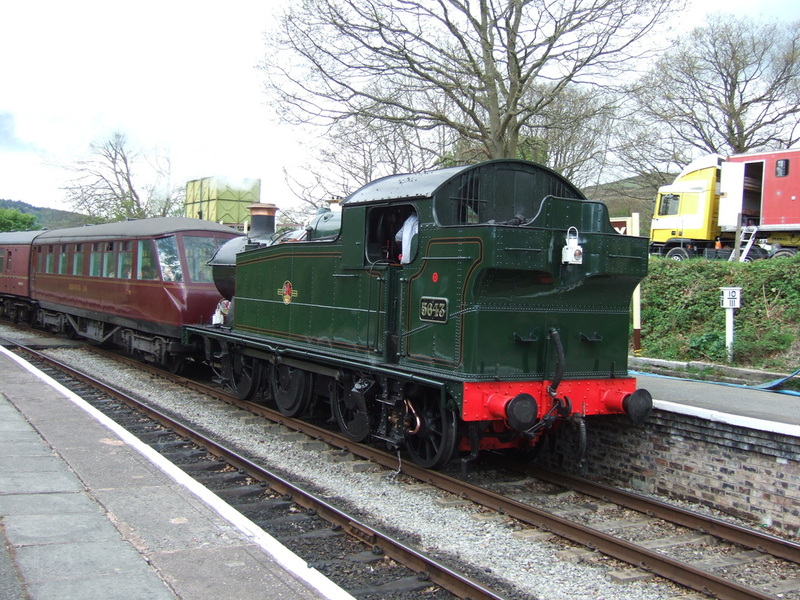 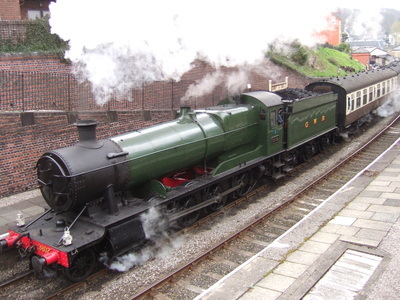 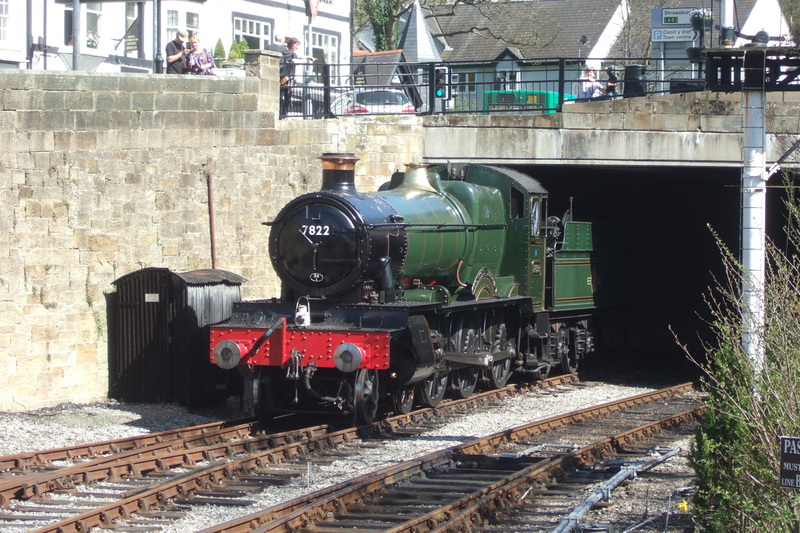 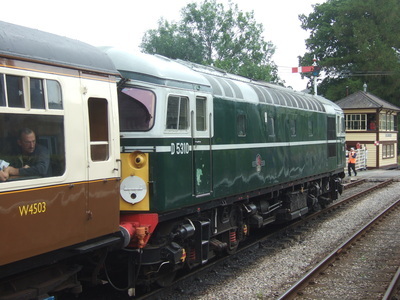 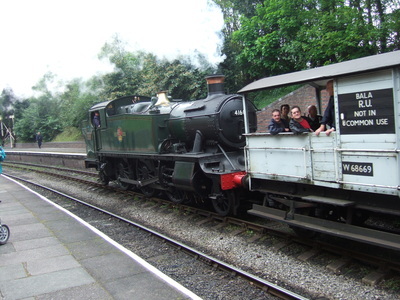 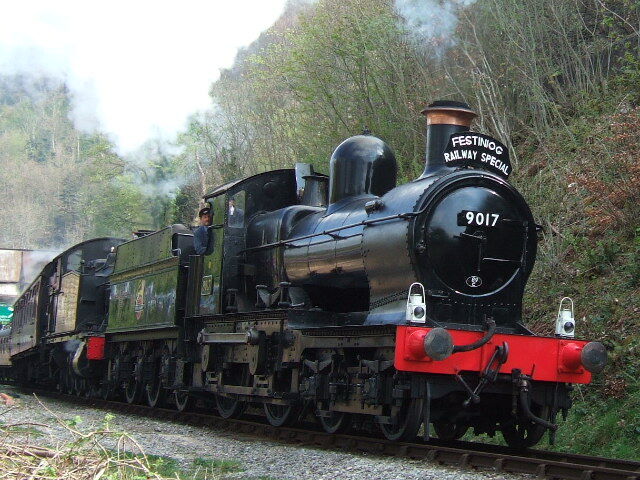 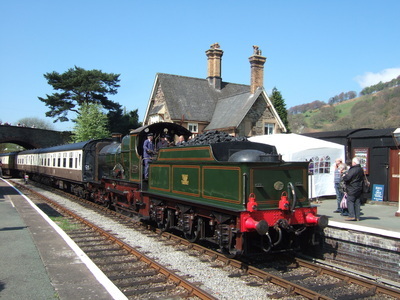 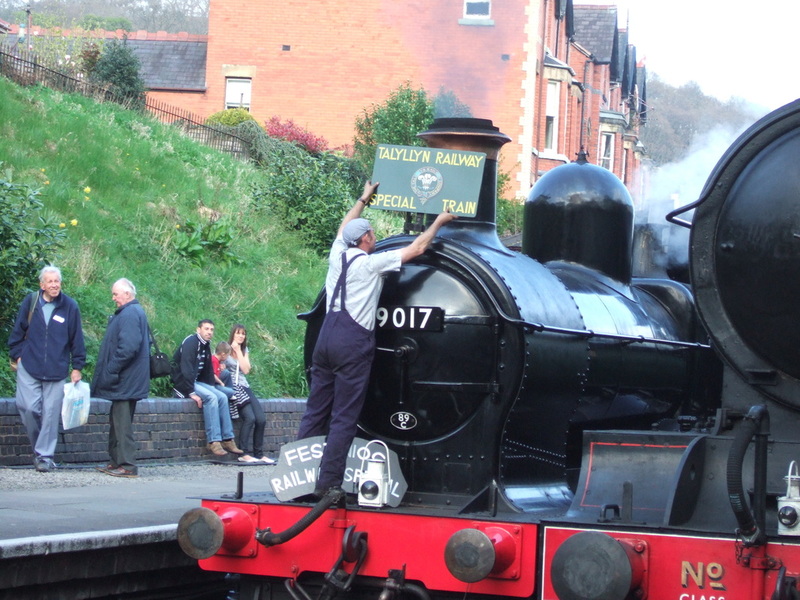 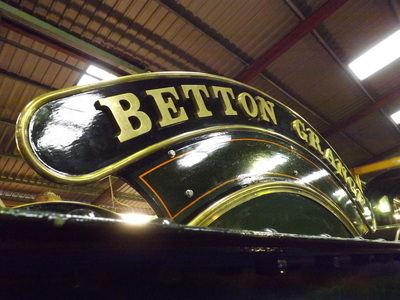 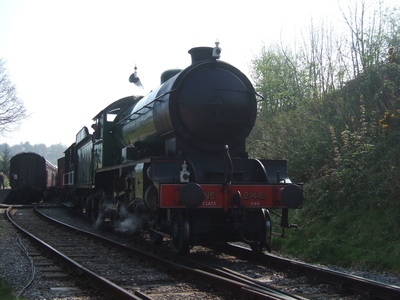 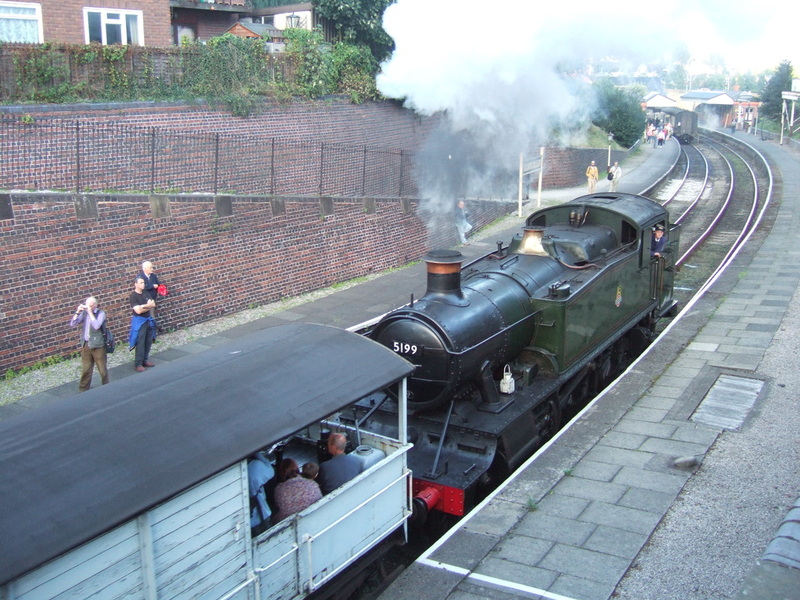 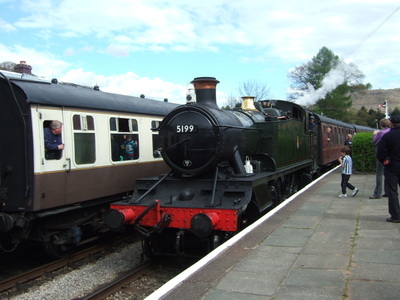 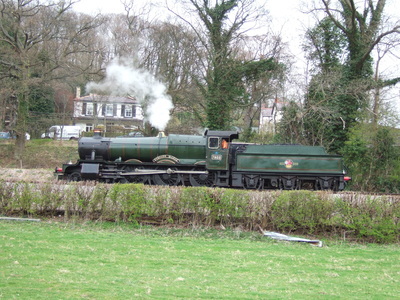 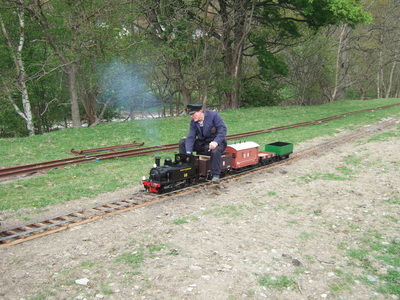 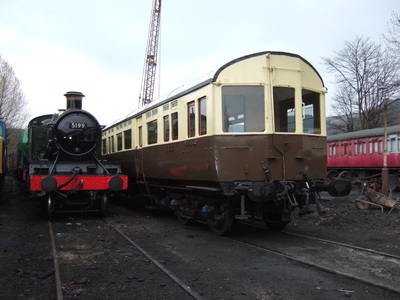 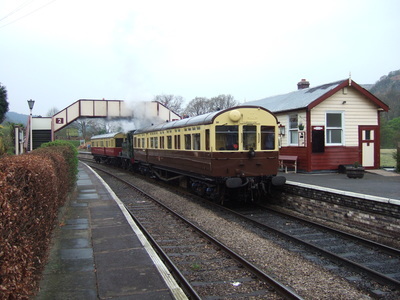 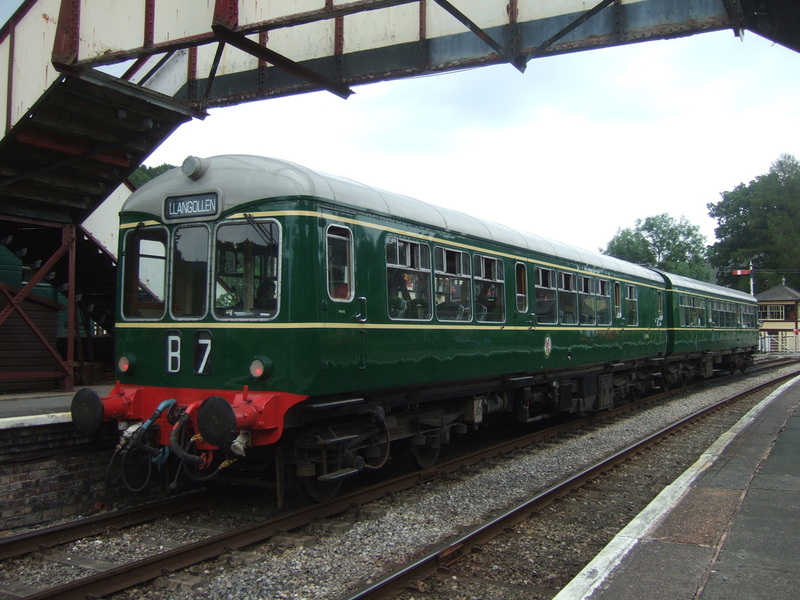 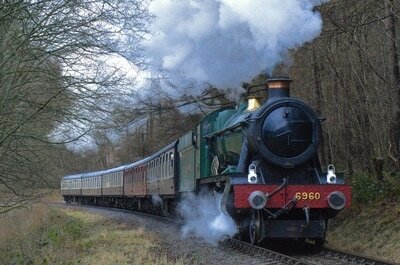 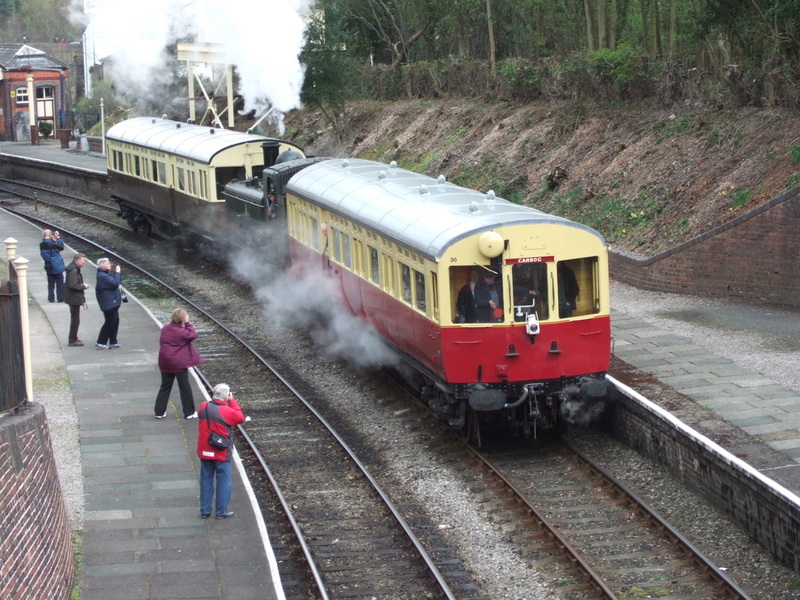 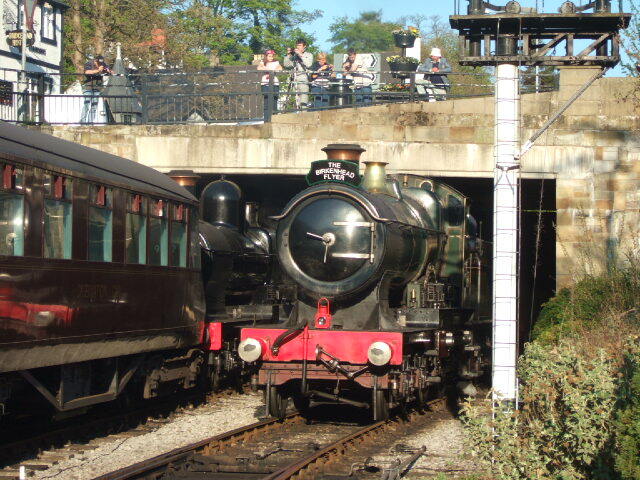 The Betton Grange Group secured the loan of Dukedog 9017 from the Bluebell Railway for the second Steel Steam and Stars gala in 2009. 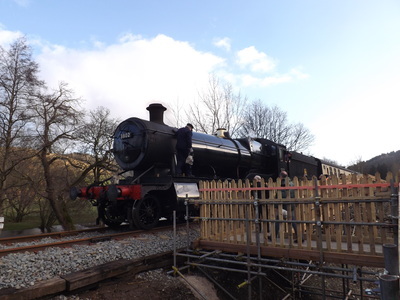 The locomotive was turned out in BR black for the first time in preservation, recreating scenes not seen in Wales since the 1960s. 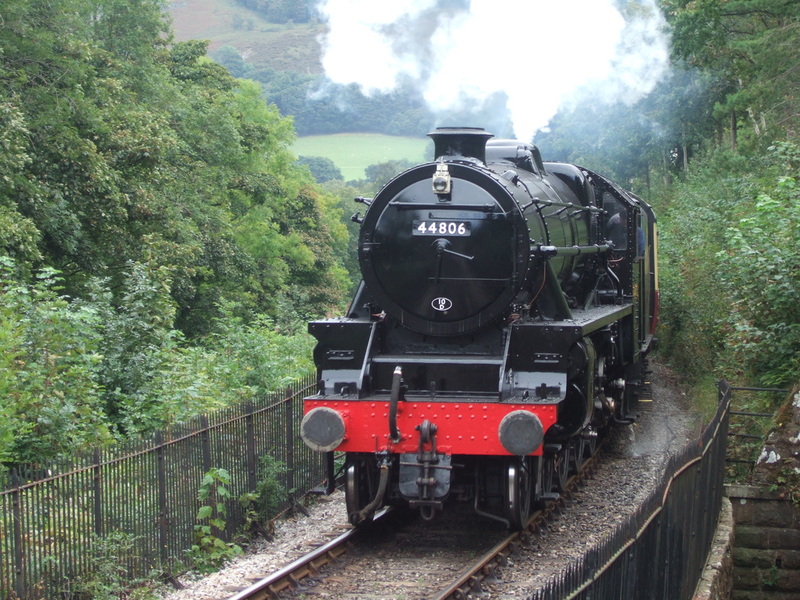 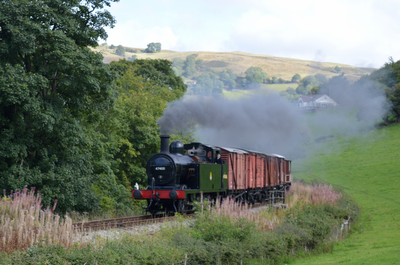 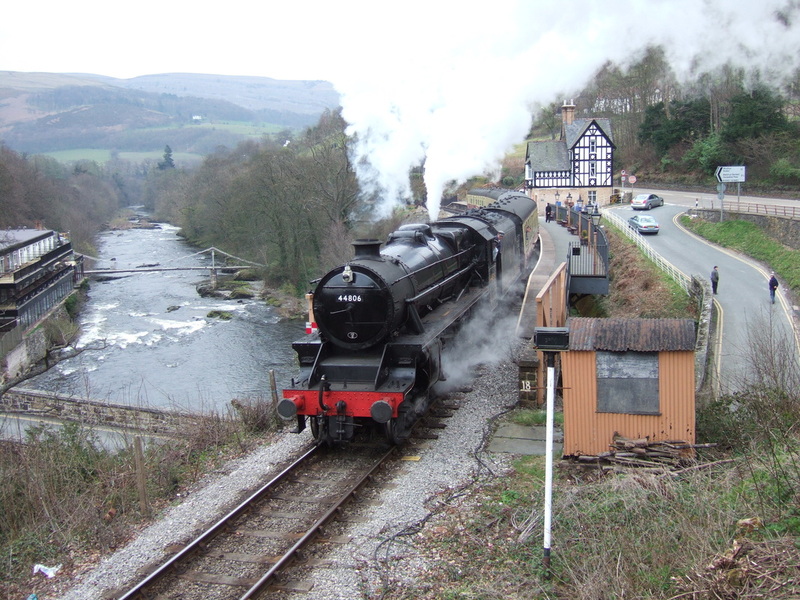 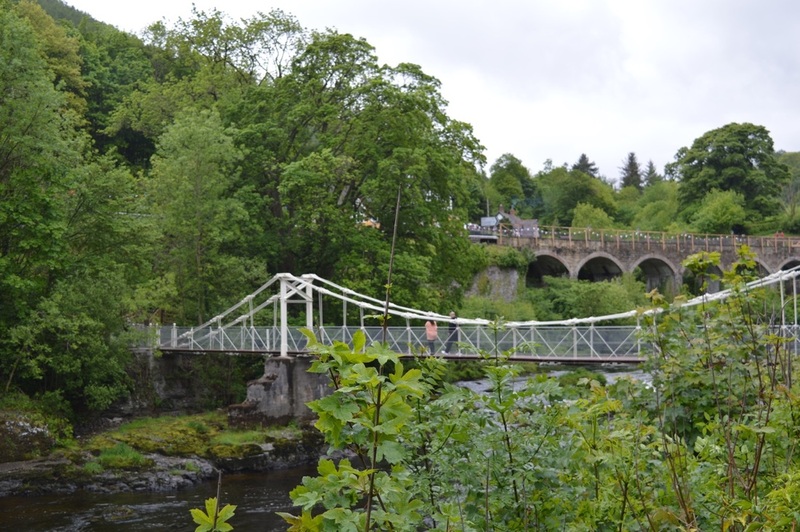 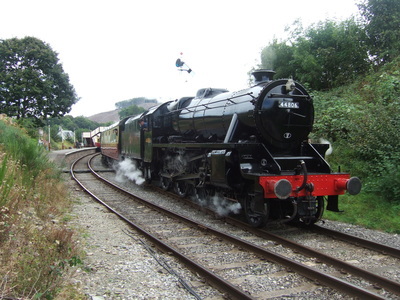 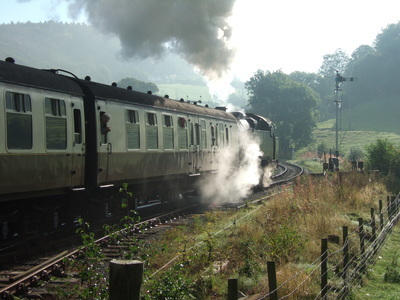 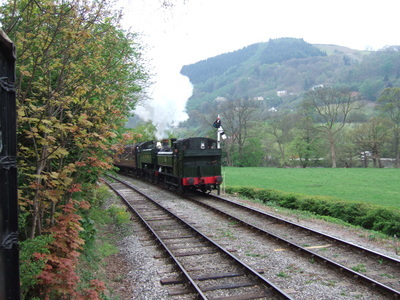 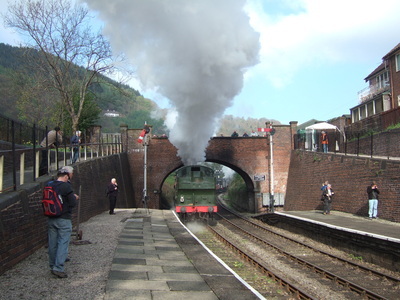 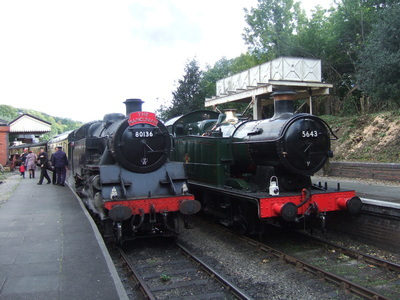 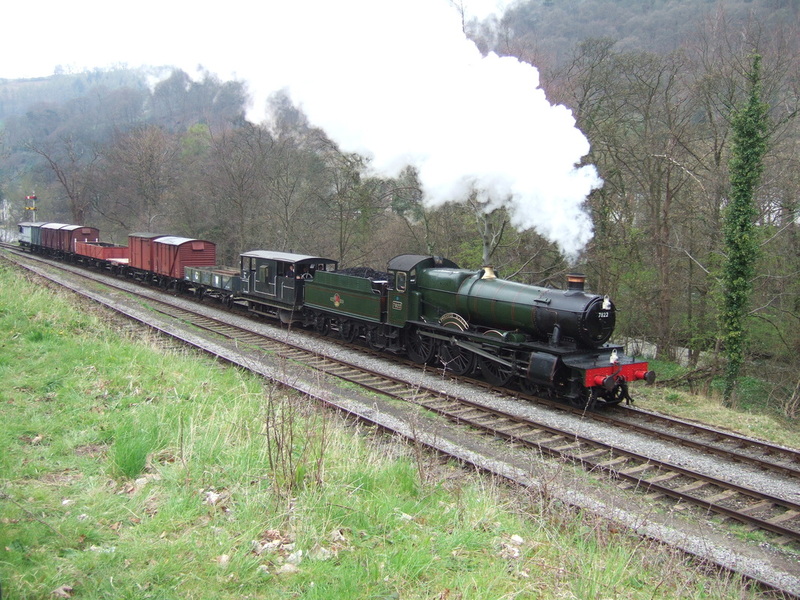 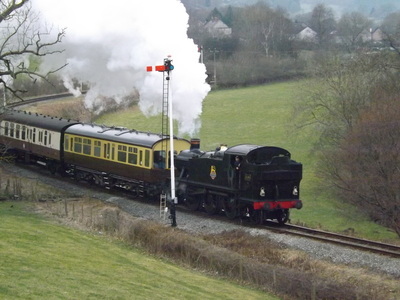 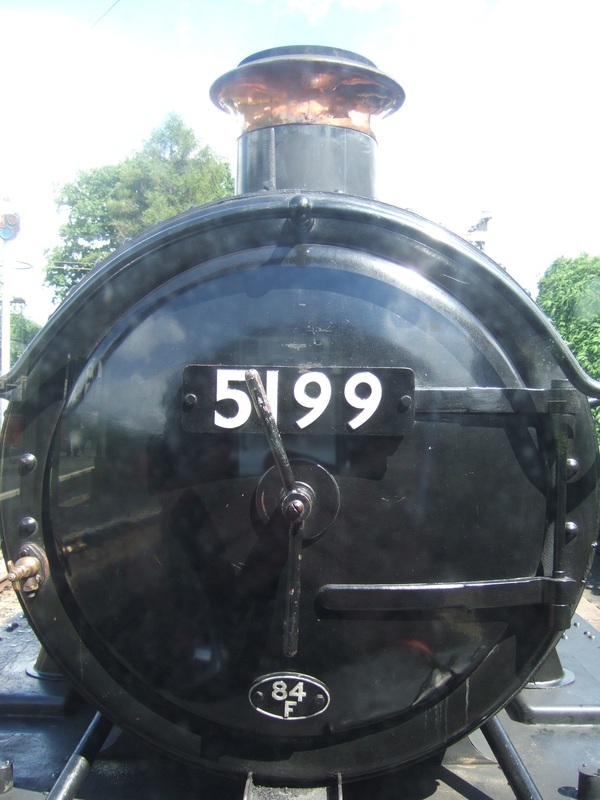 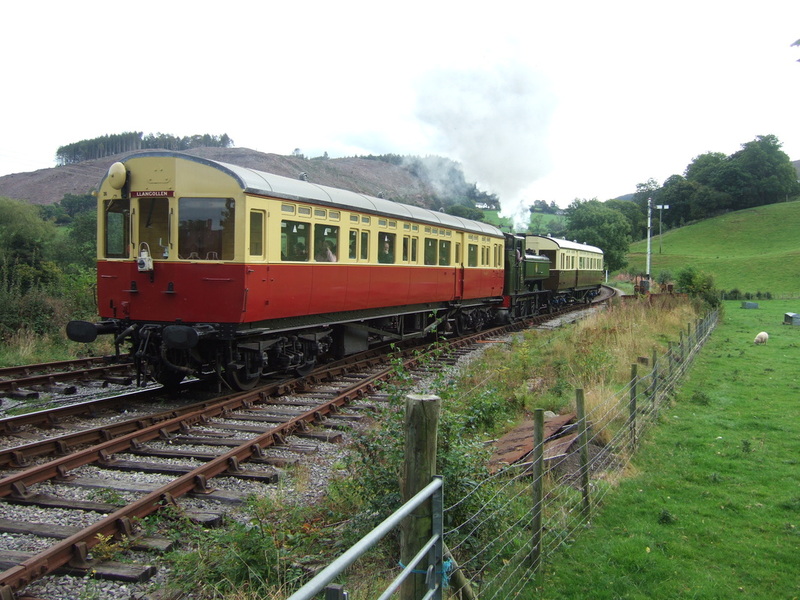 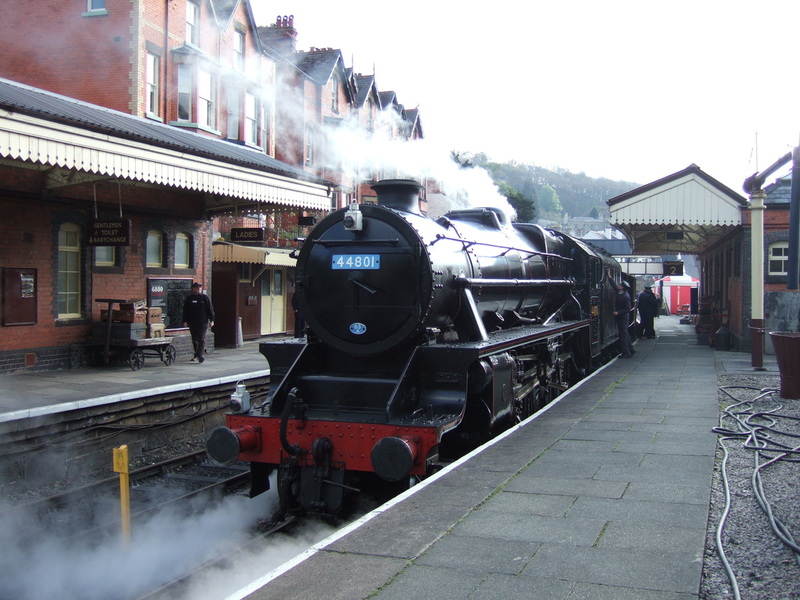 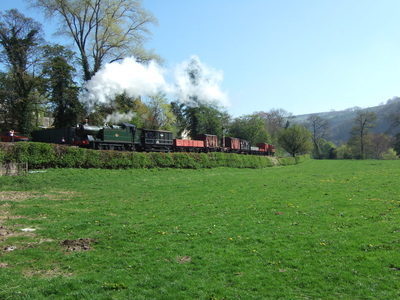 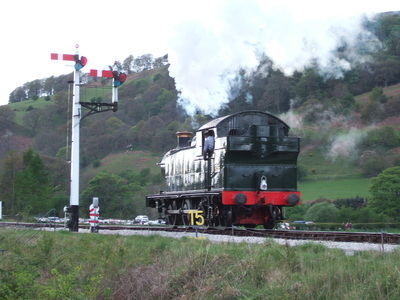 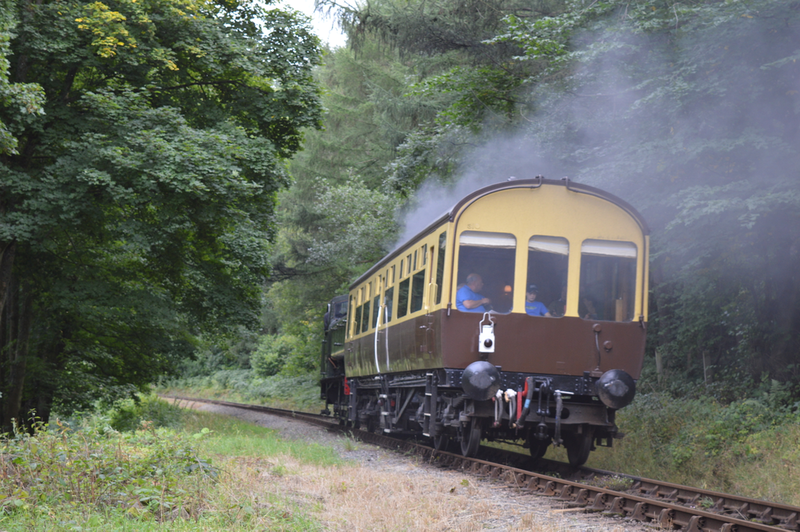 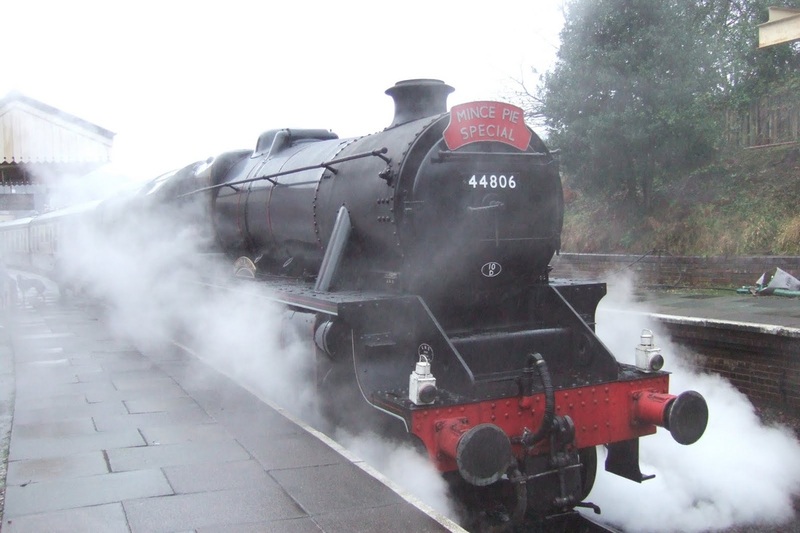 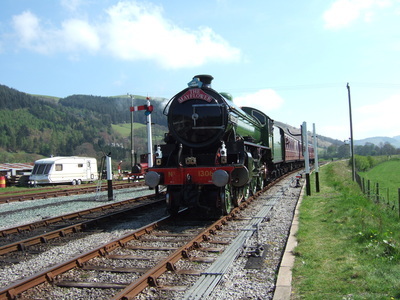 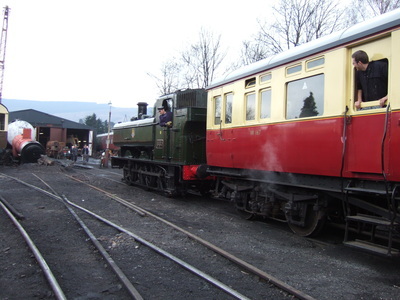 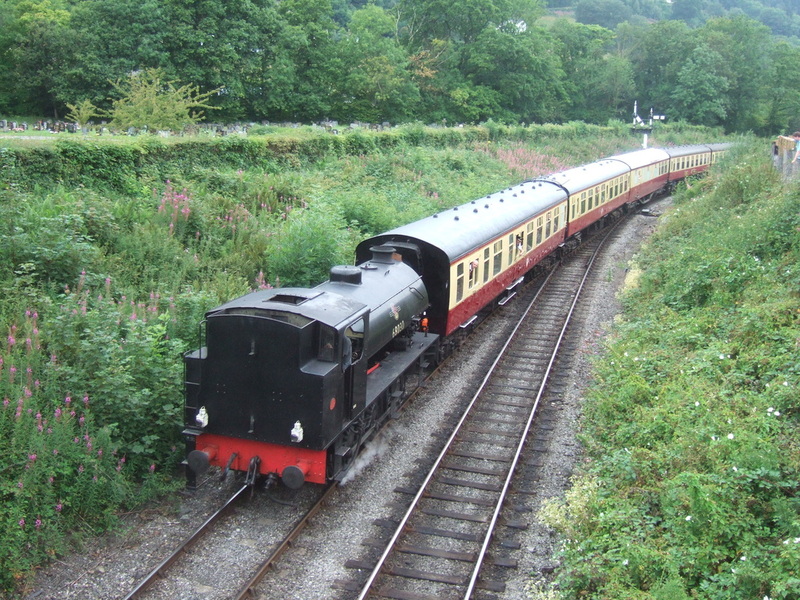 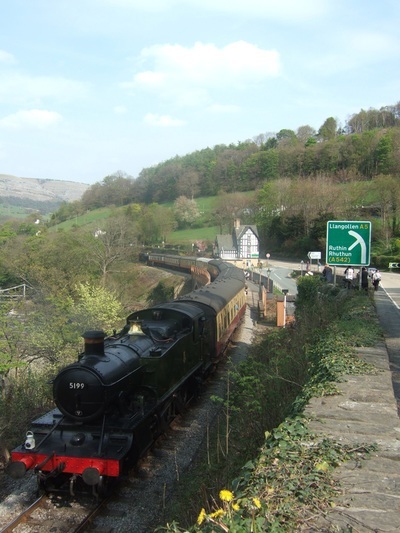 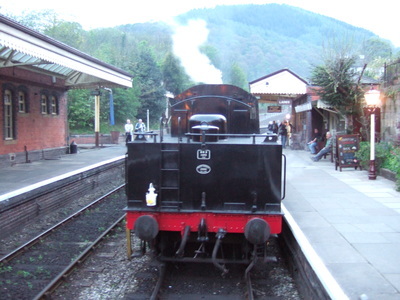 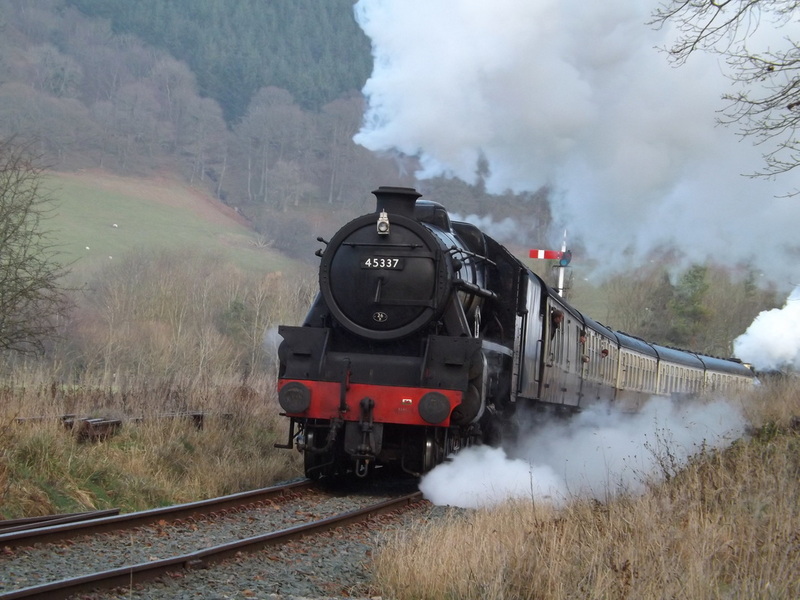 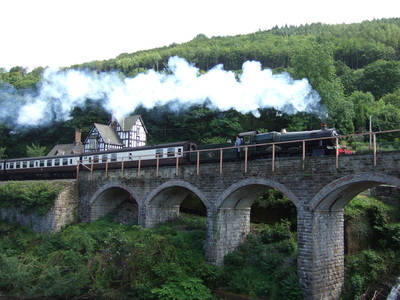 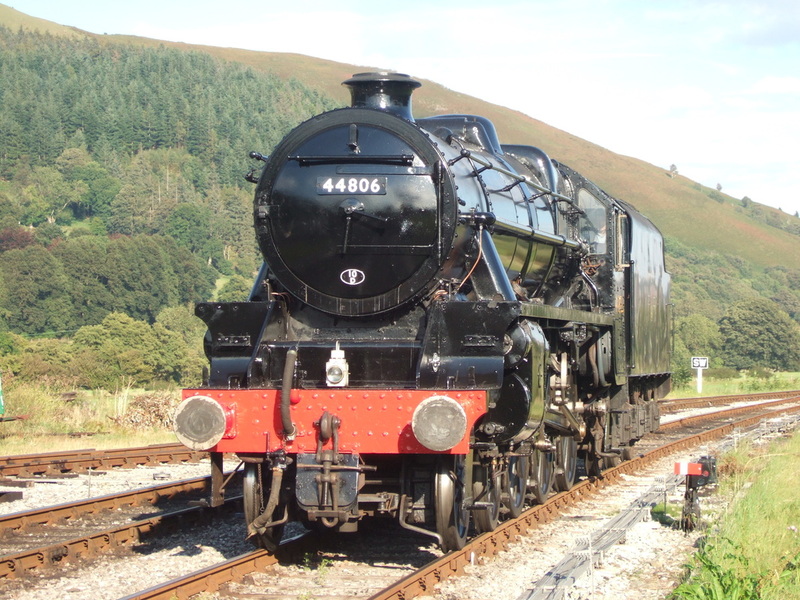 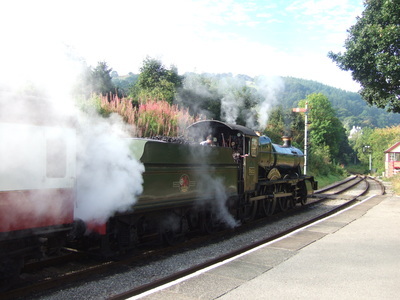 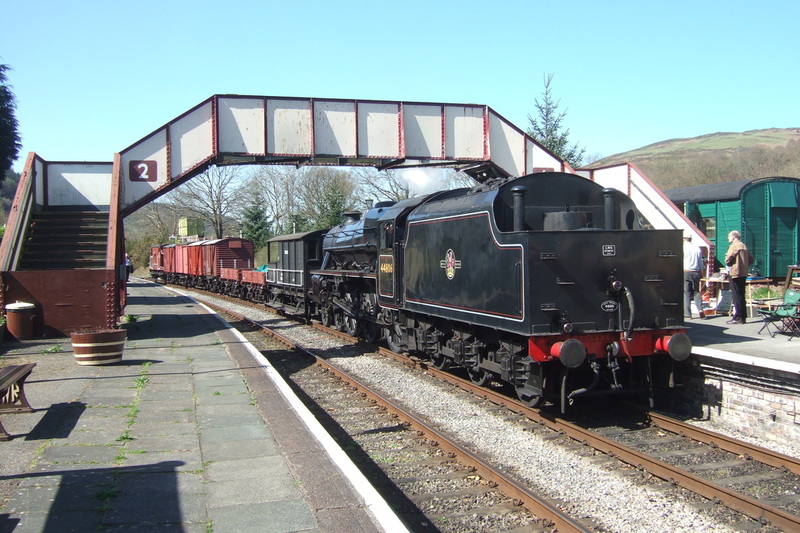 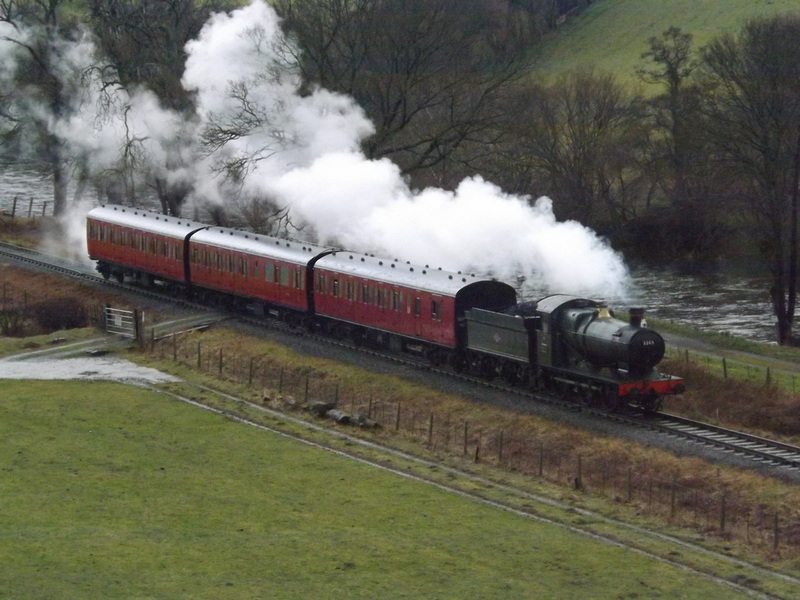 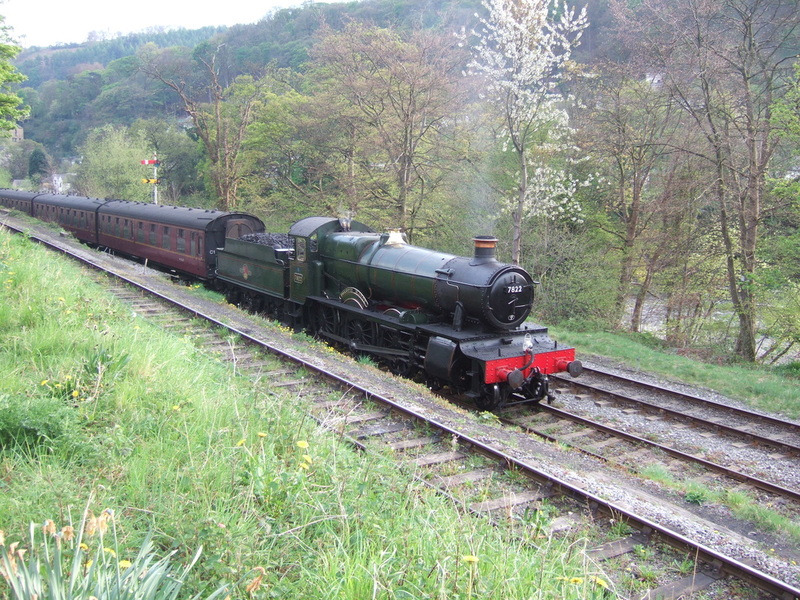 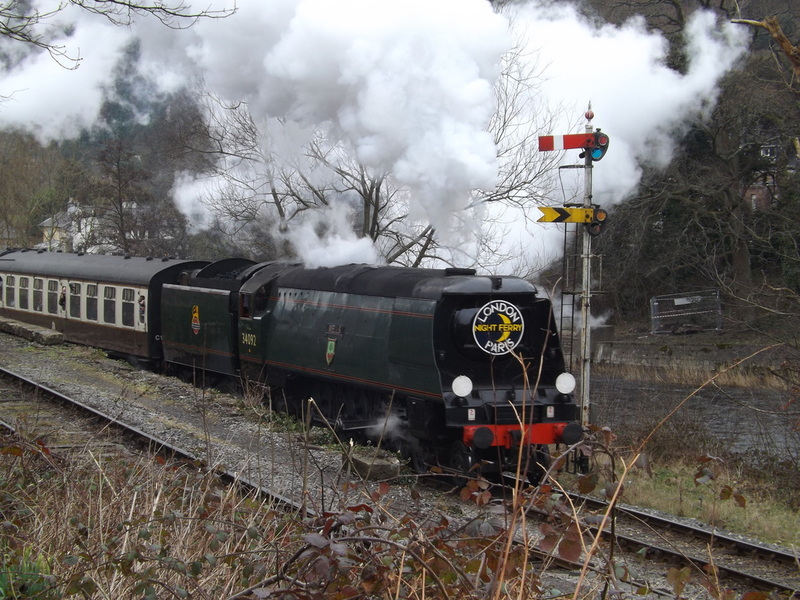 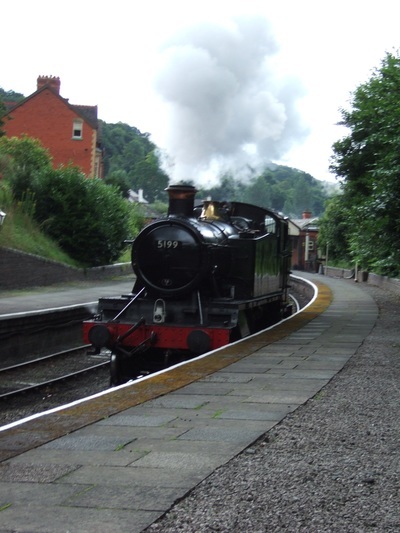 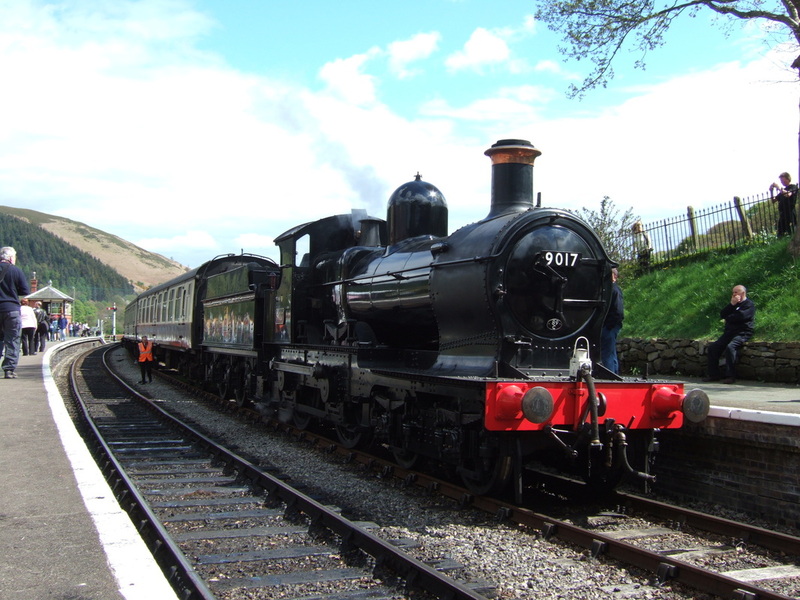 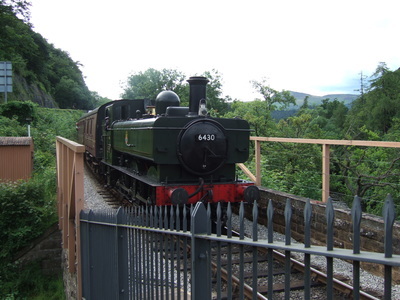 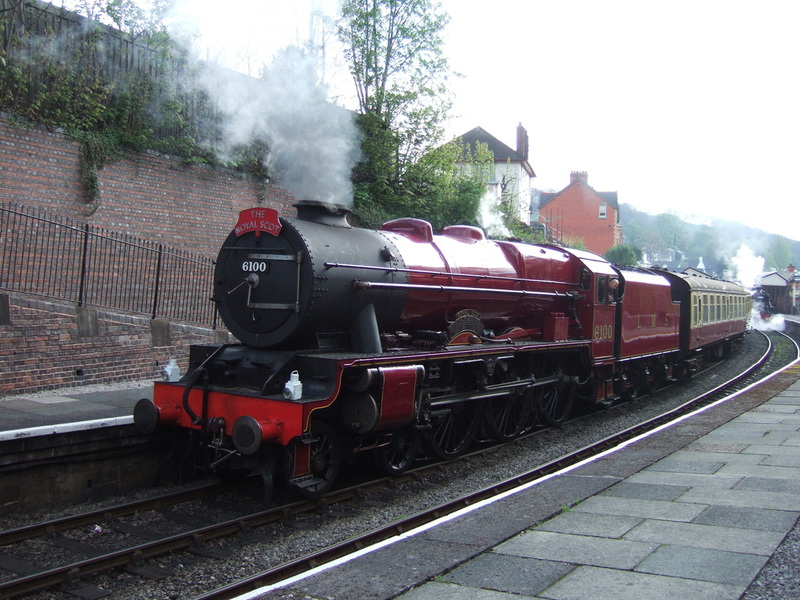 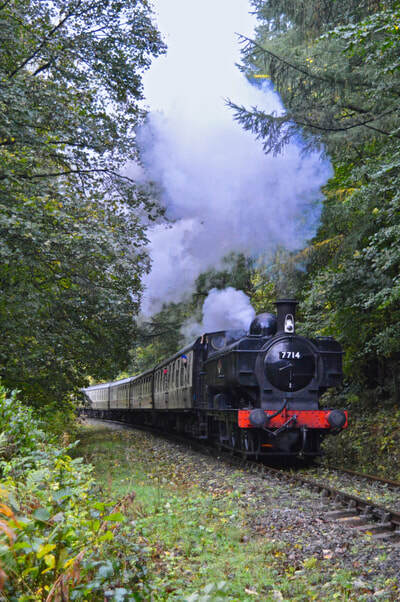 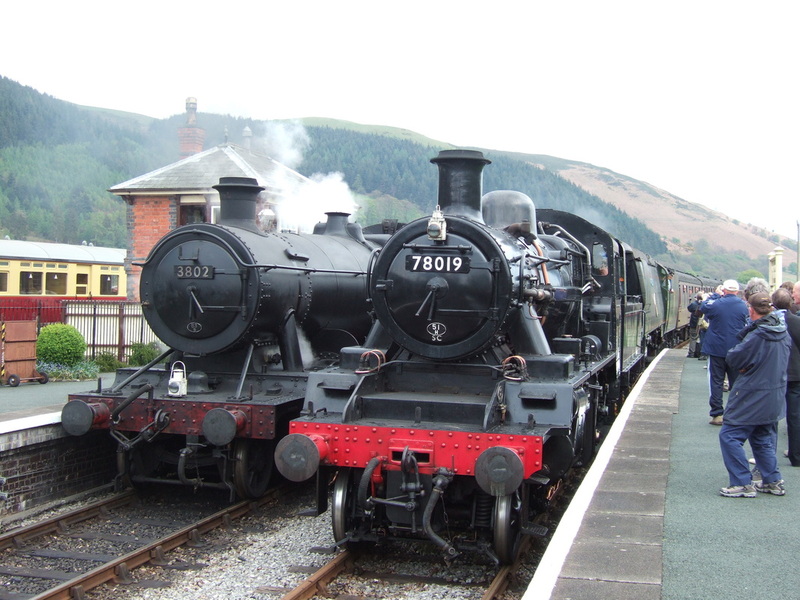 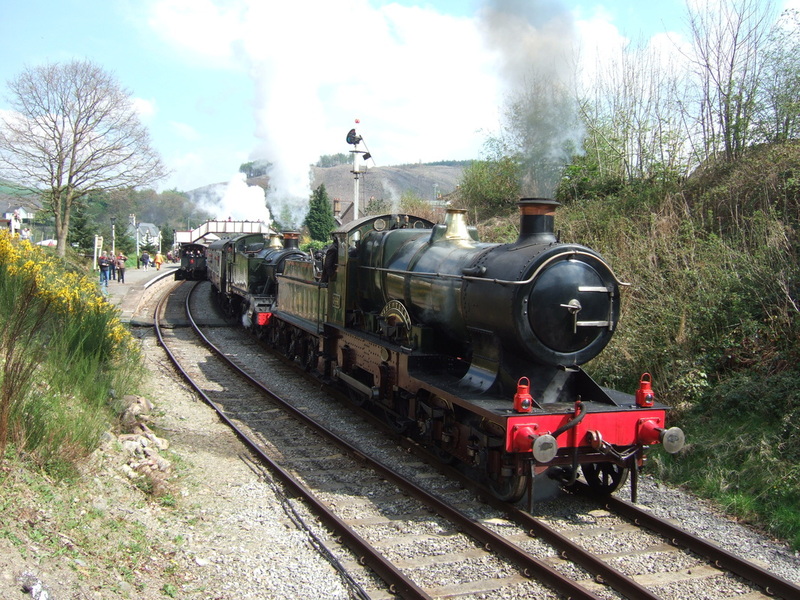 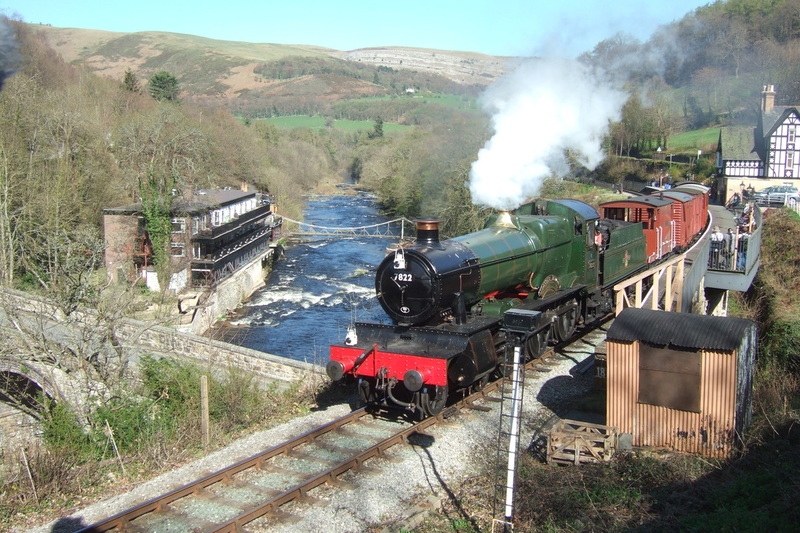 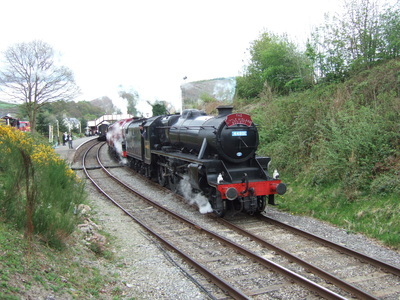 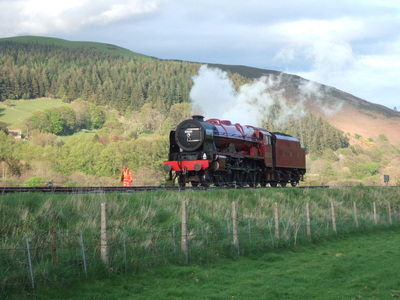 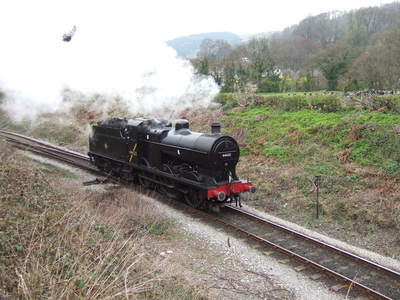 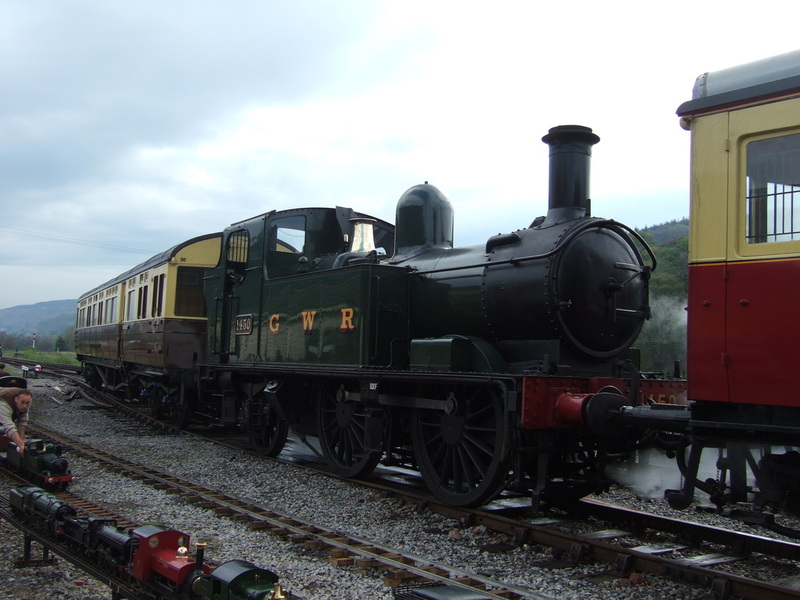 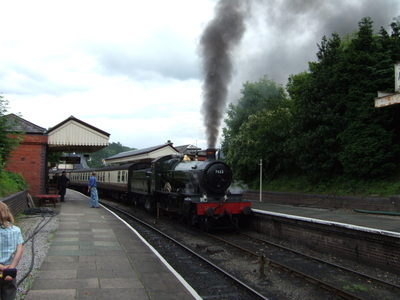 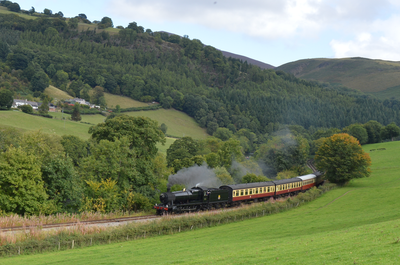 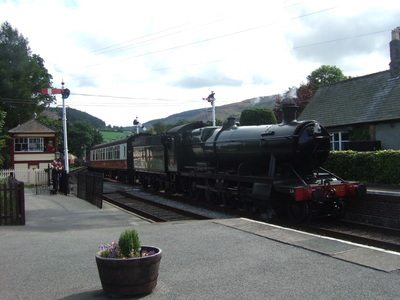 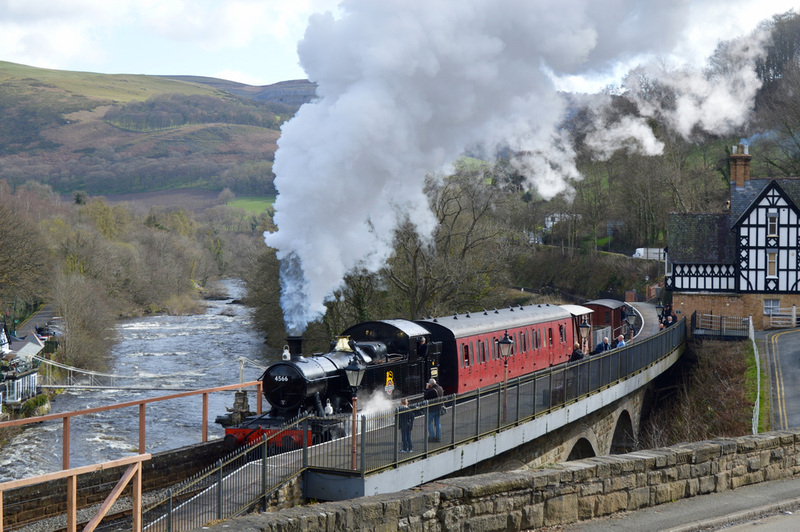 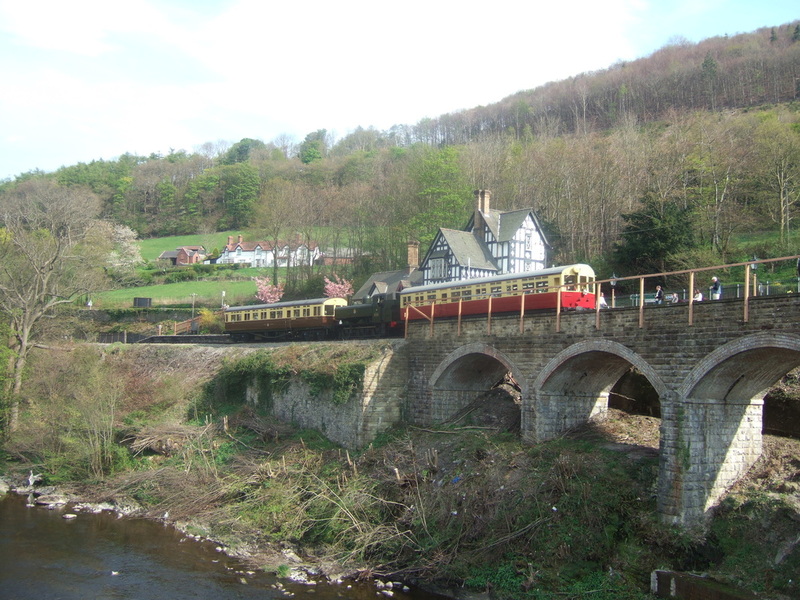 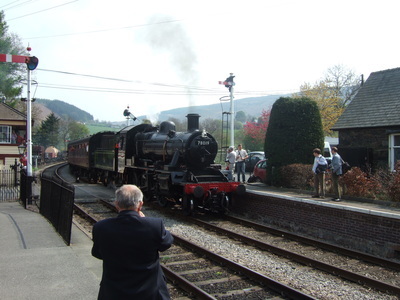 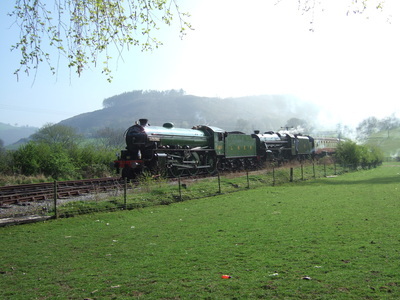 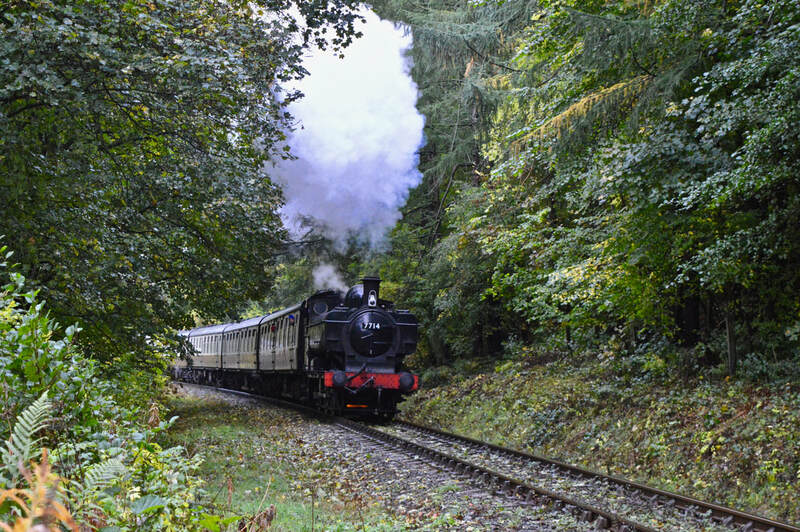 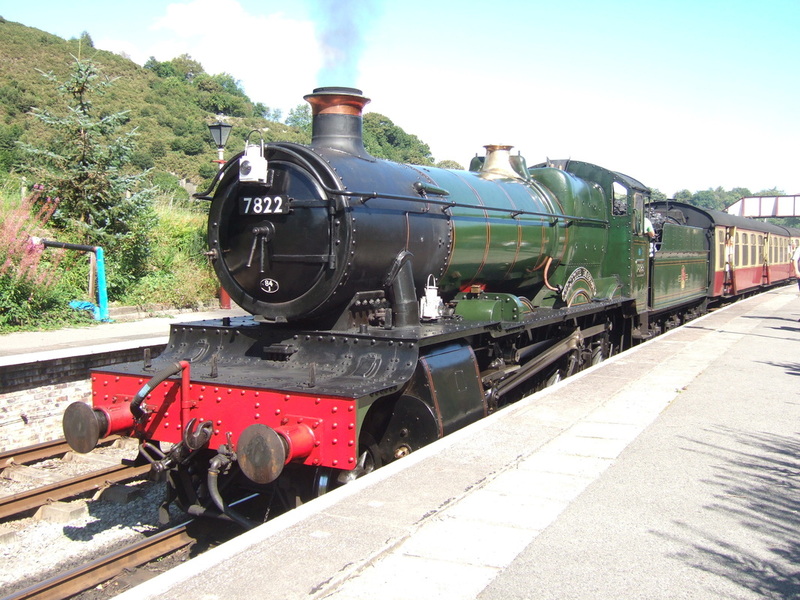 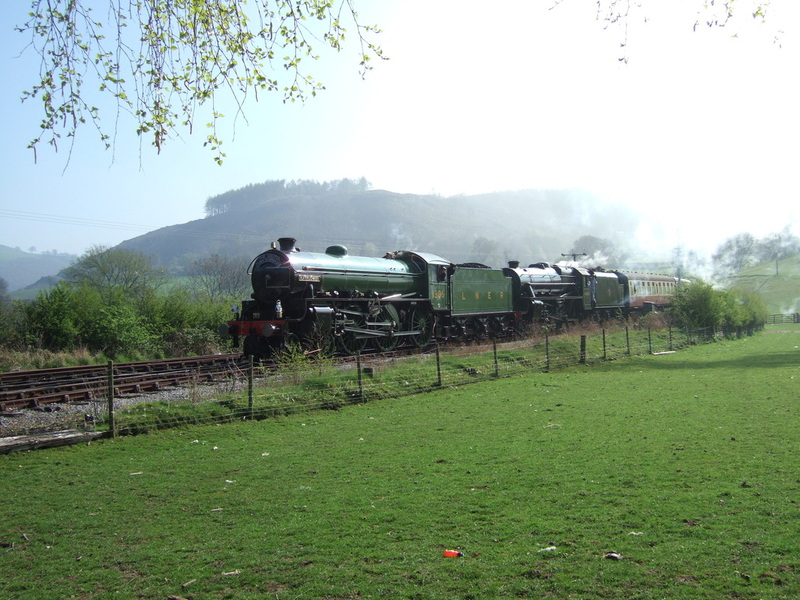 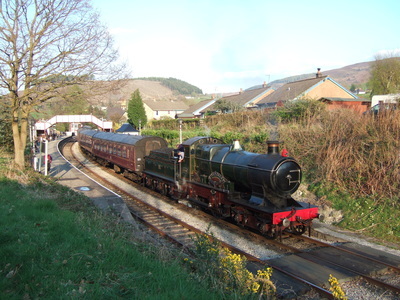 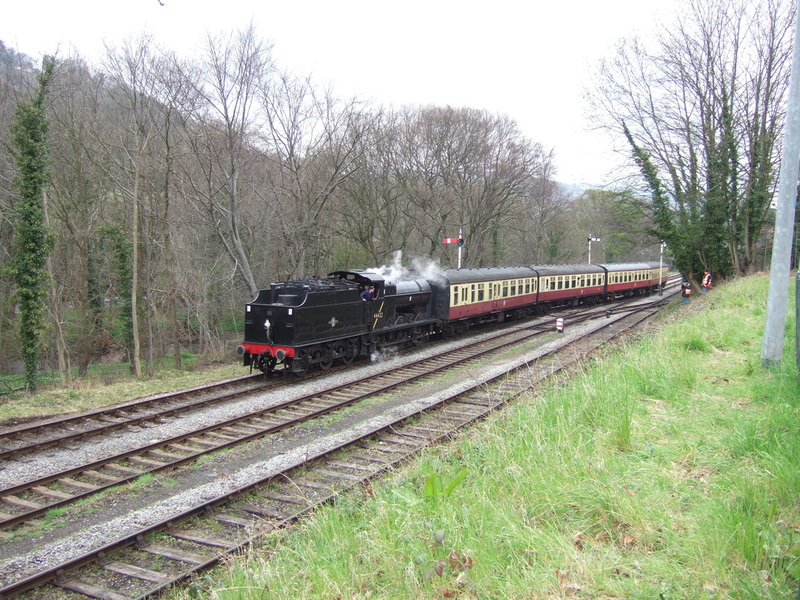 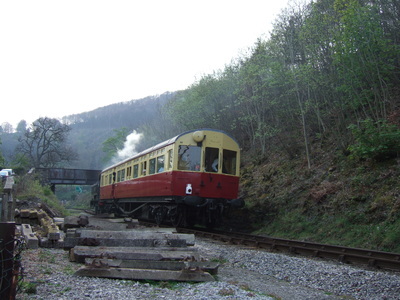 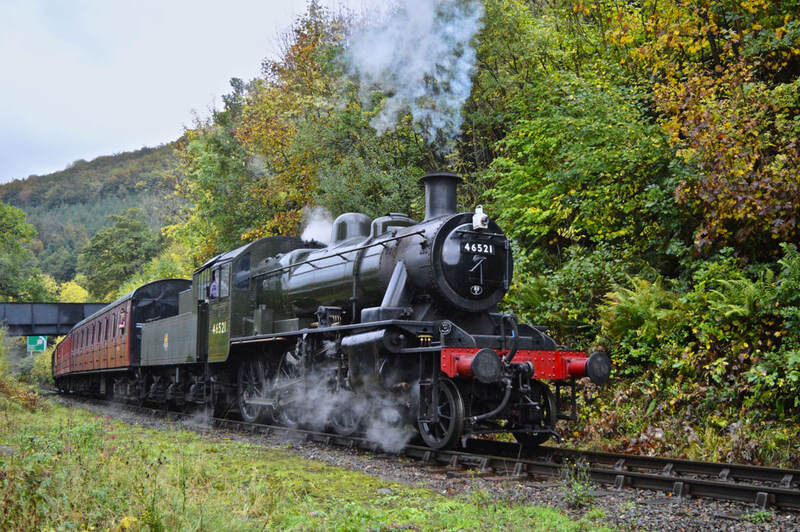 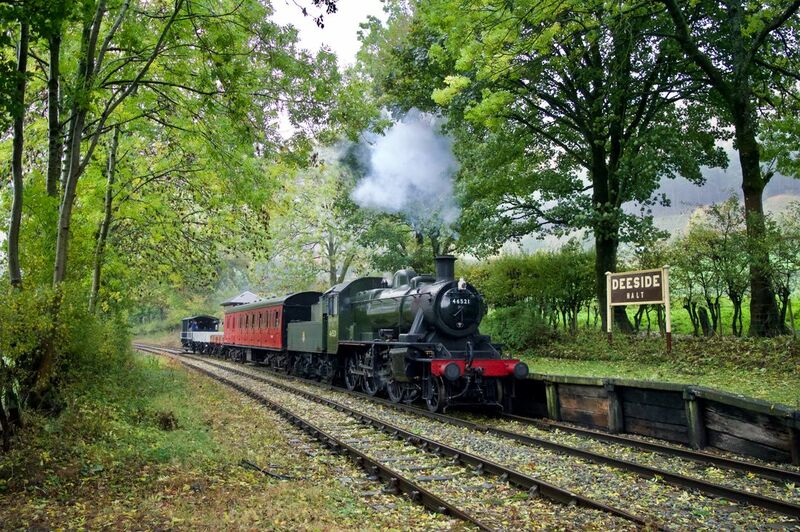 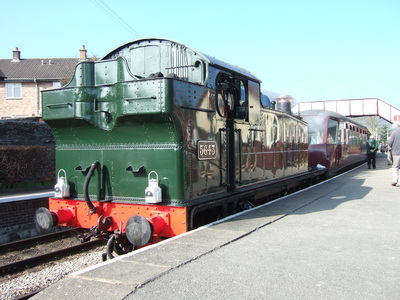 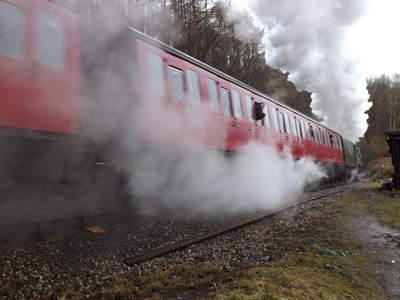 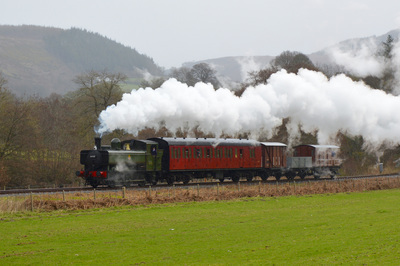 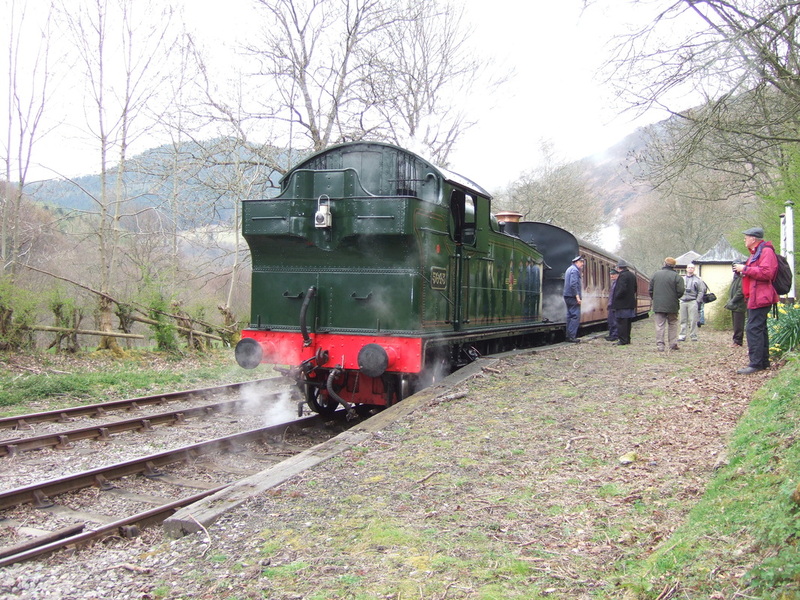 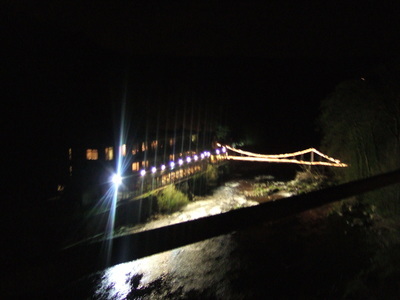 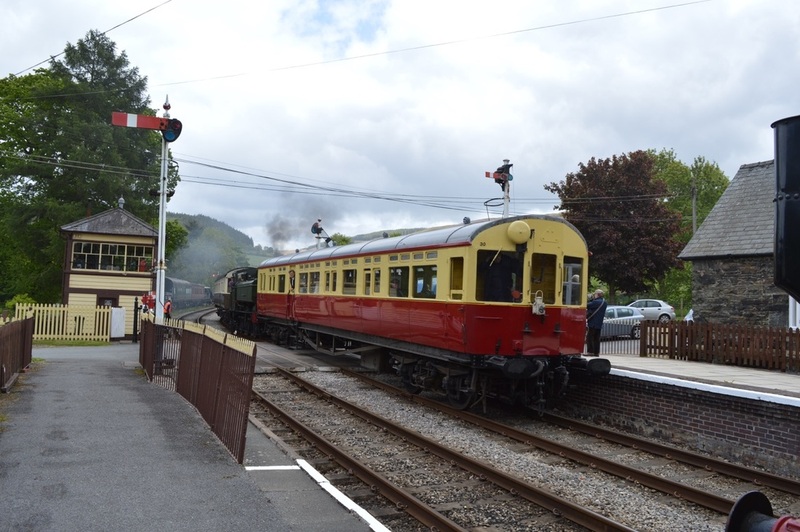 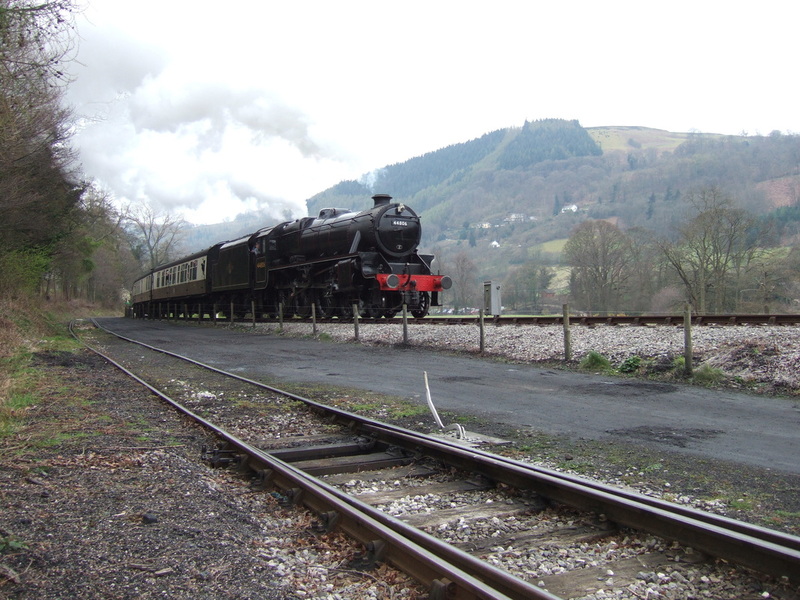 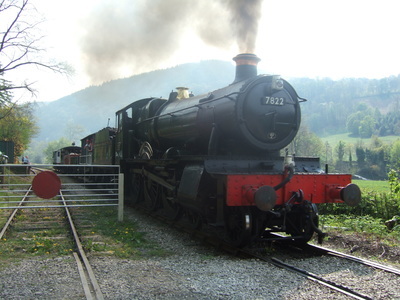 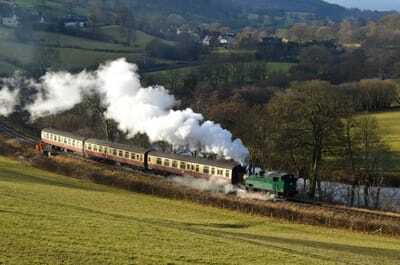 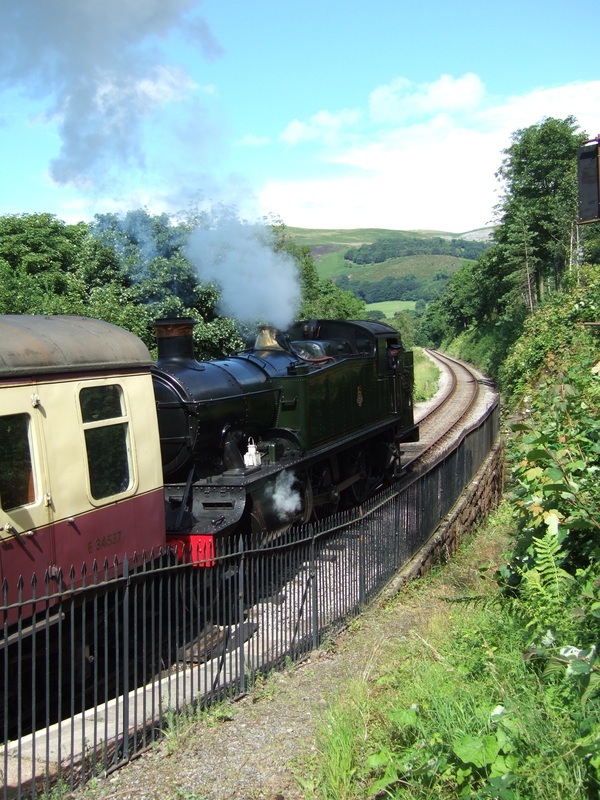 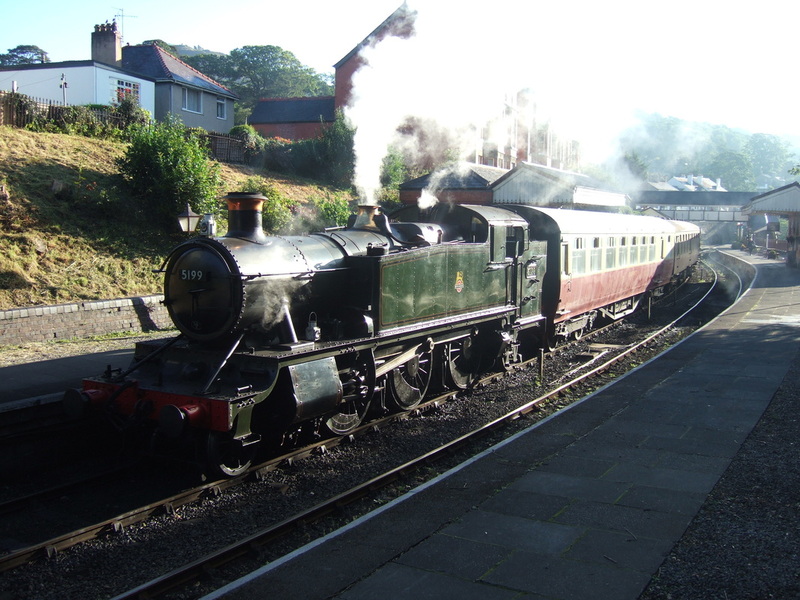 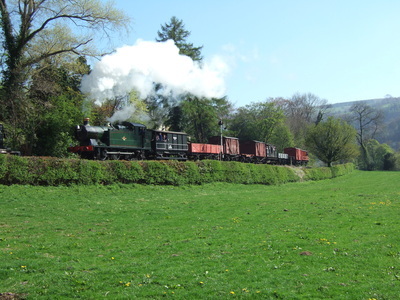 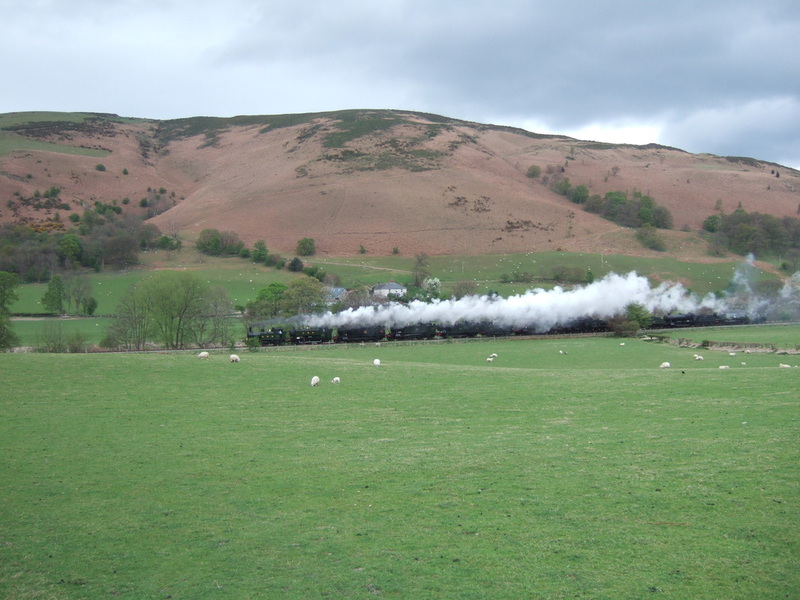 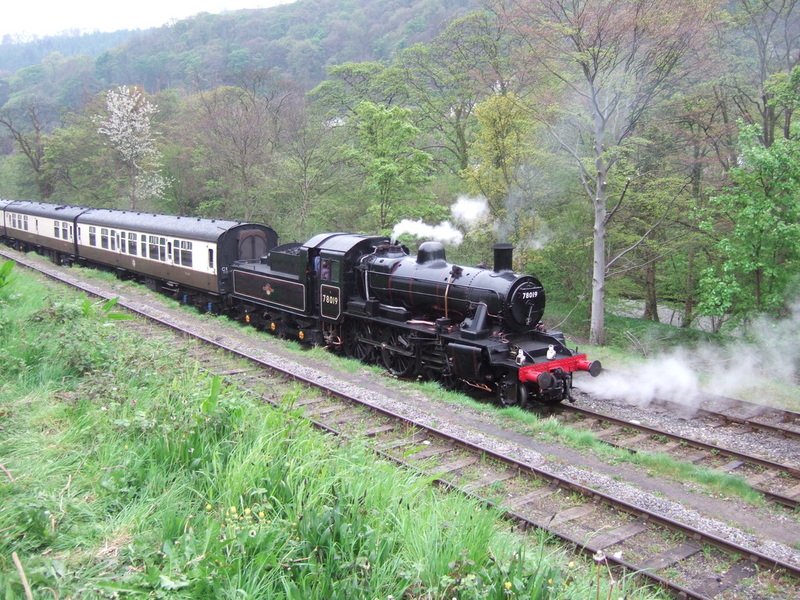 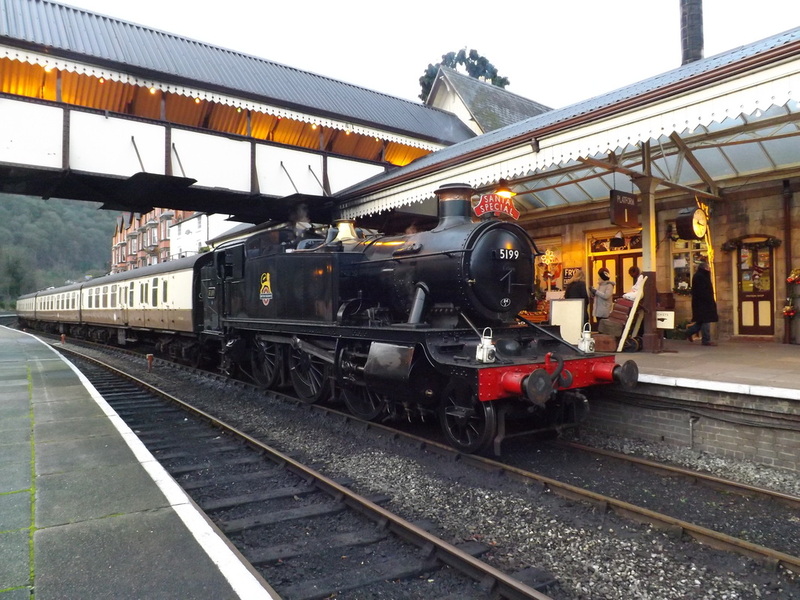 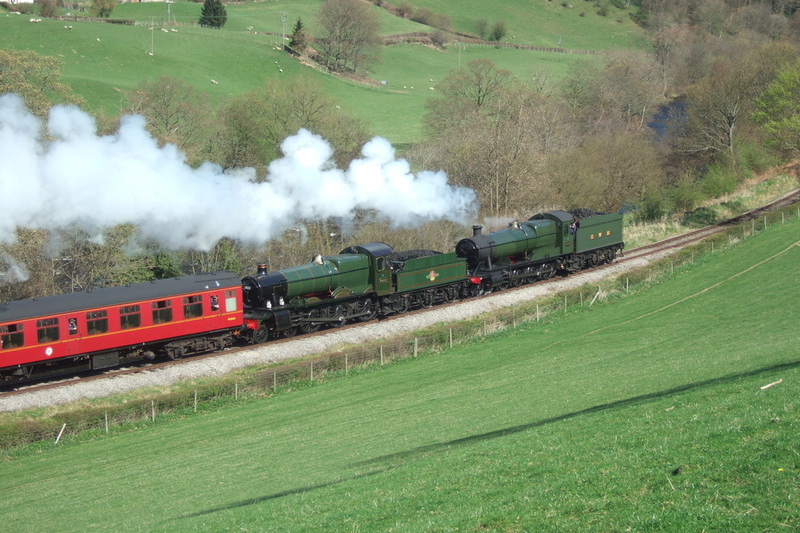 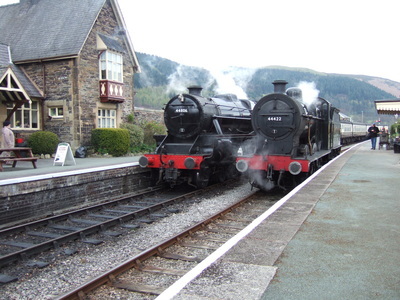 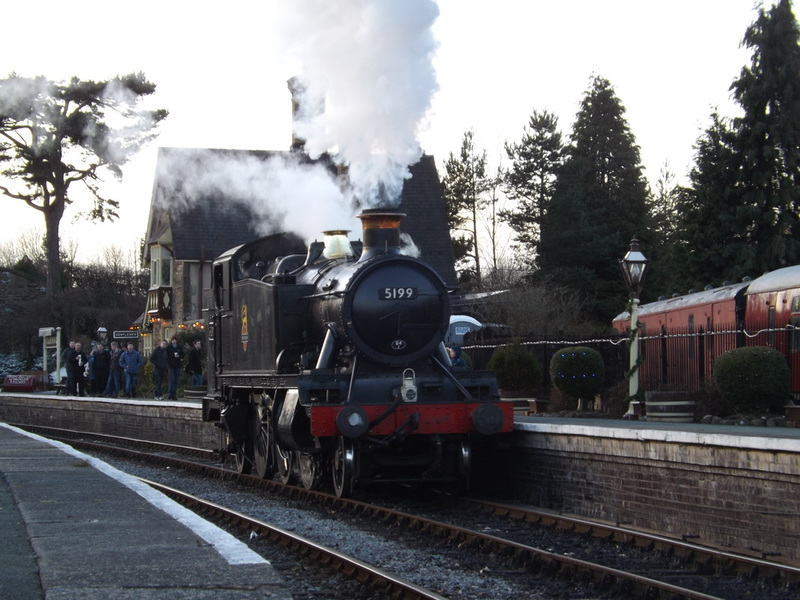 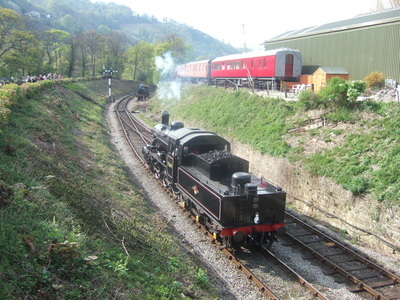 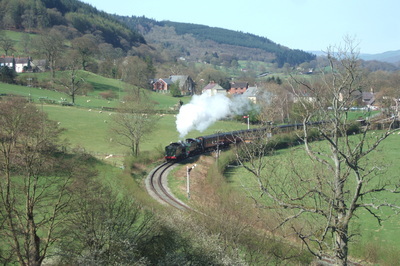 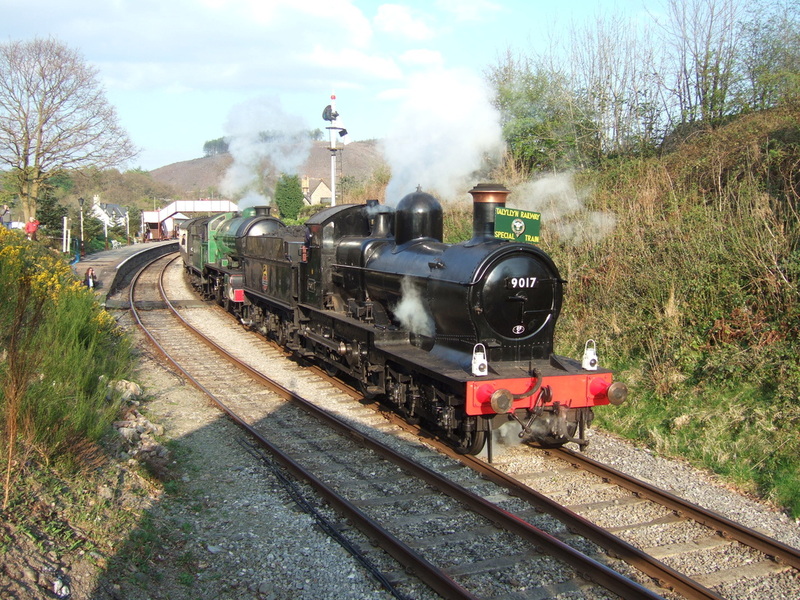 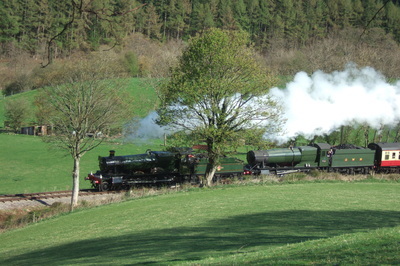 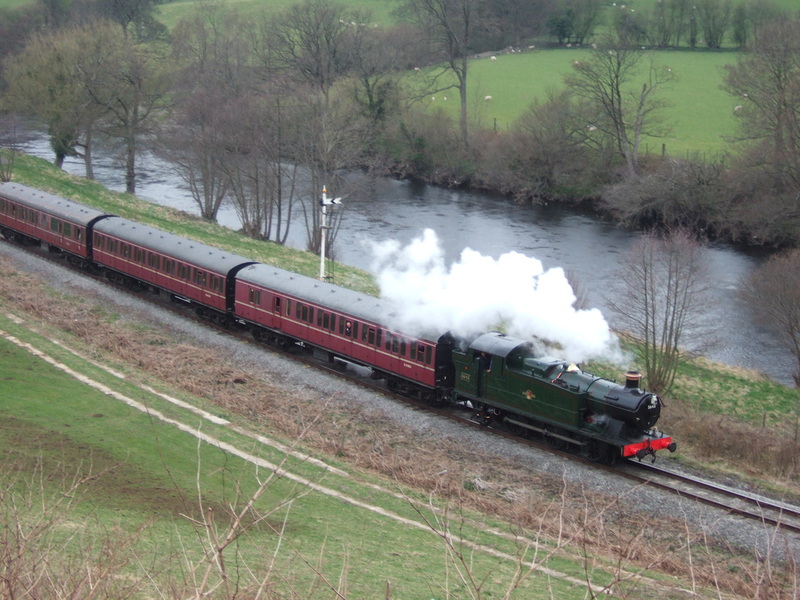 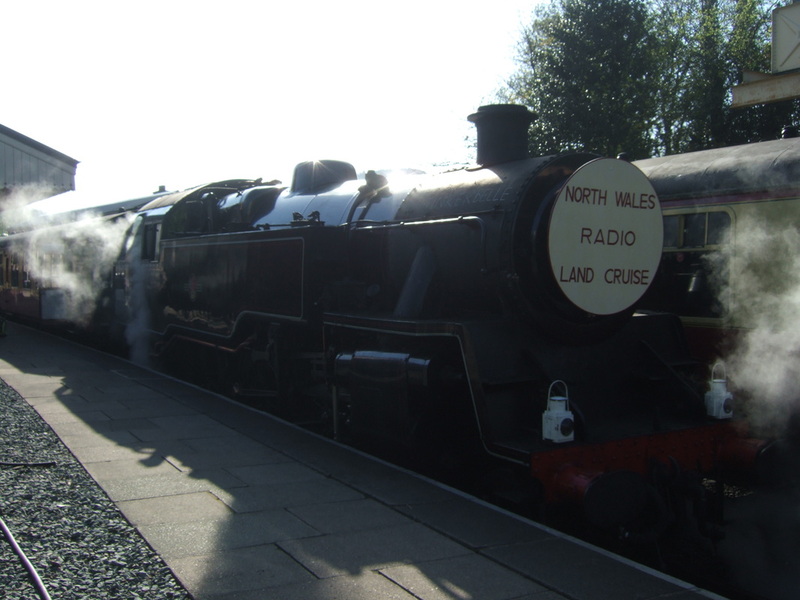 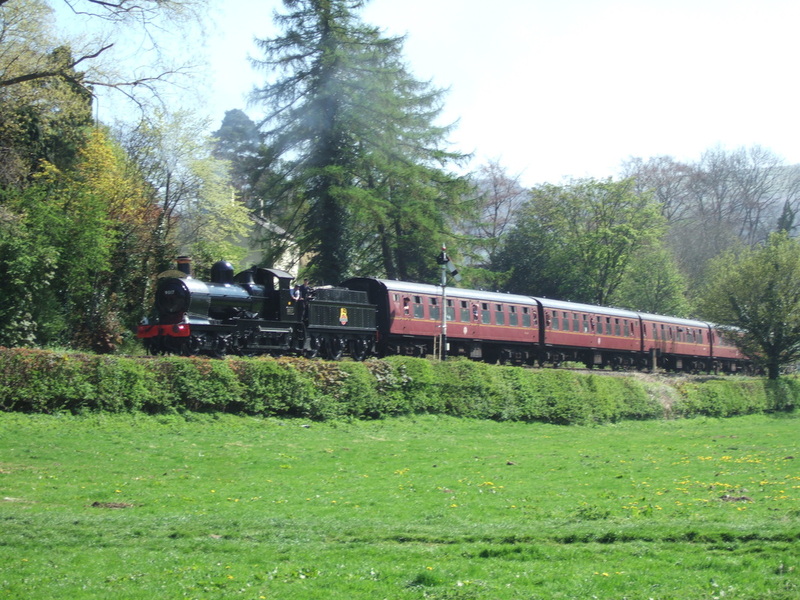 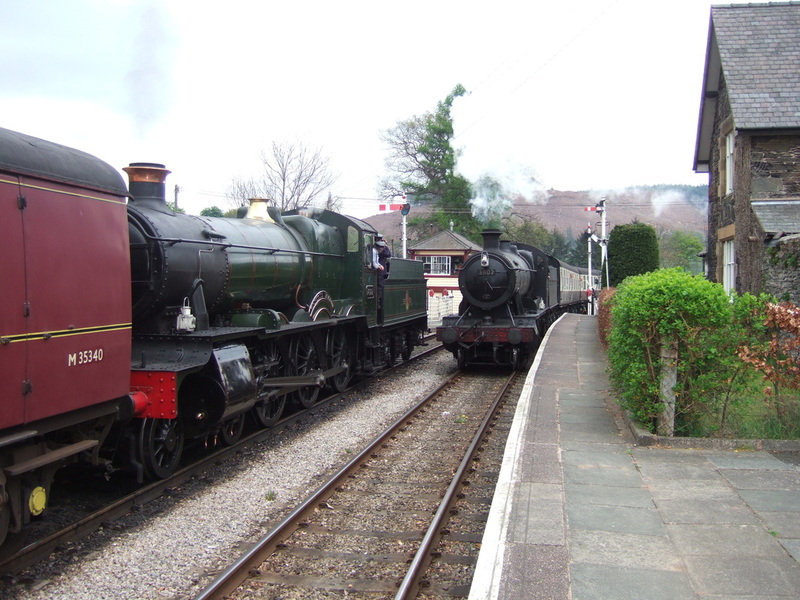 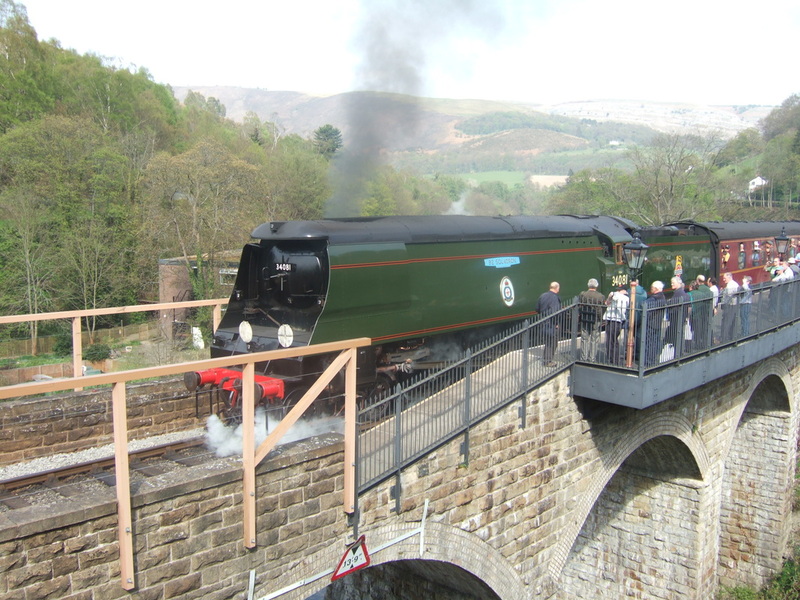 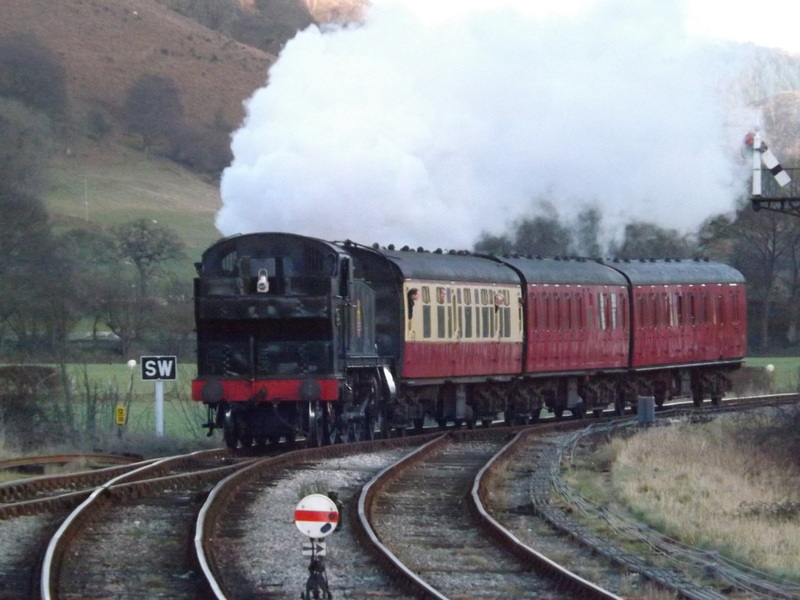 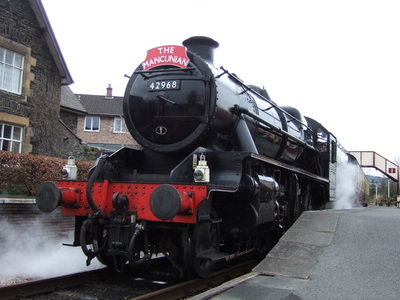 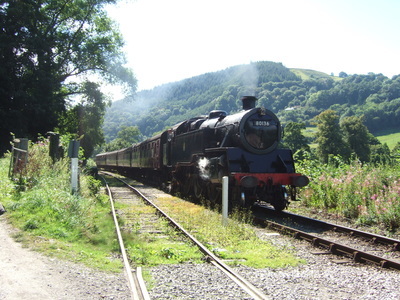 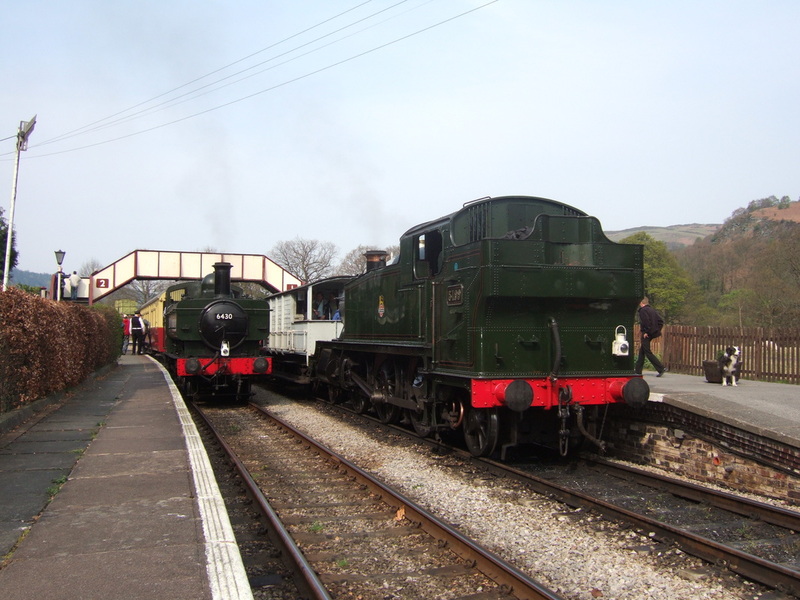 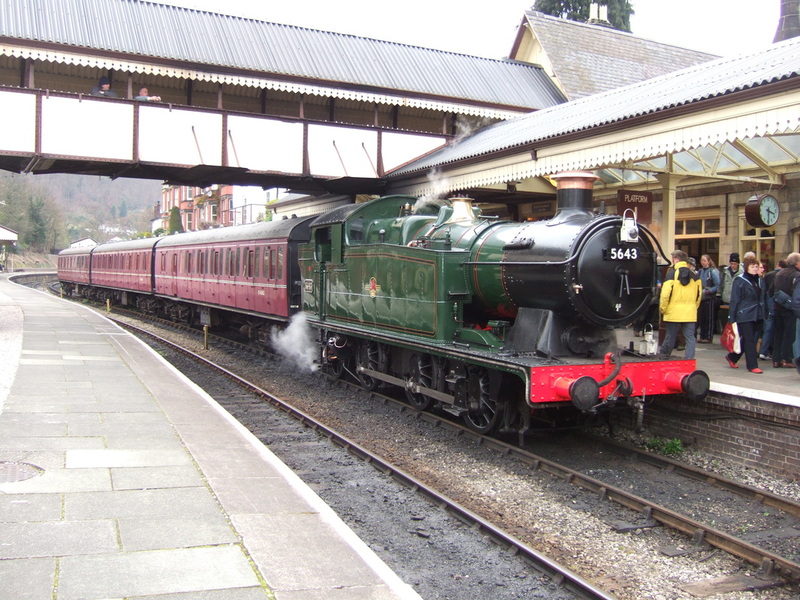 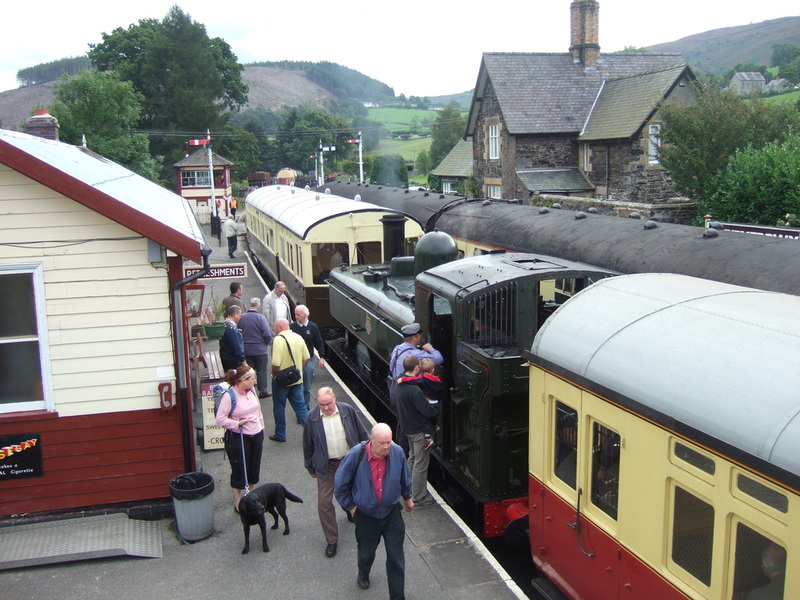 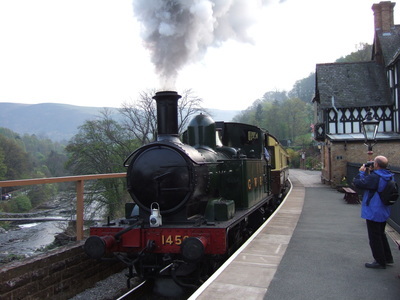 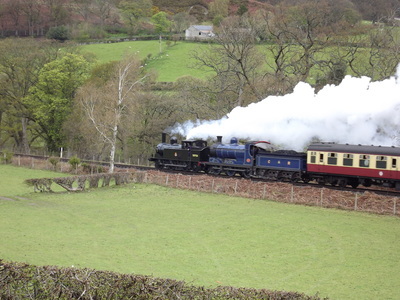 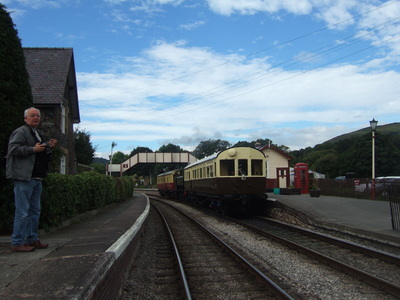 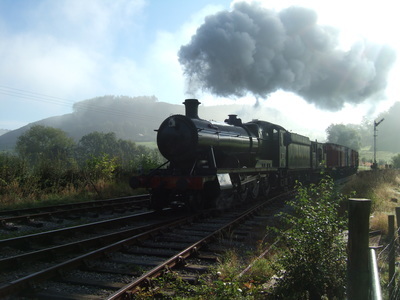 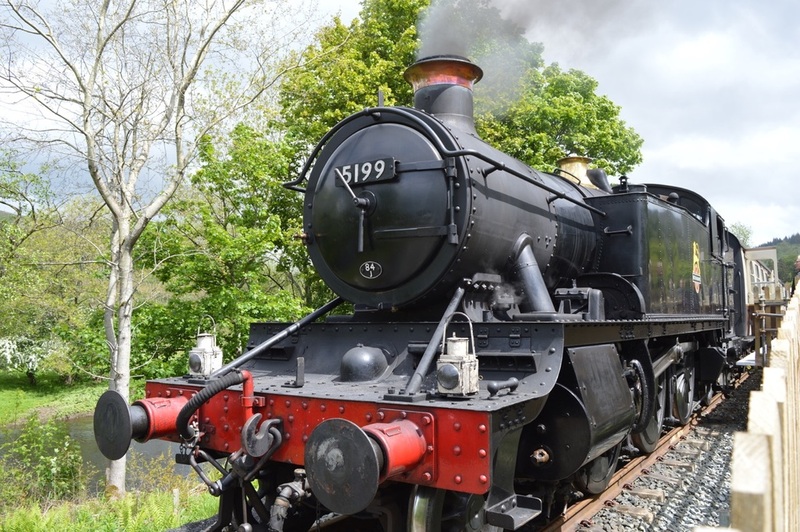 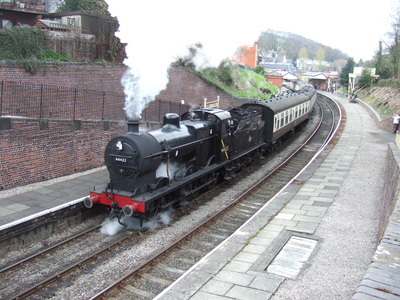 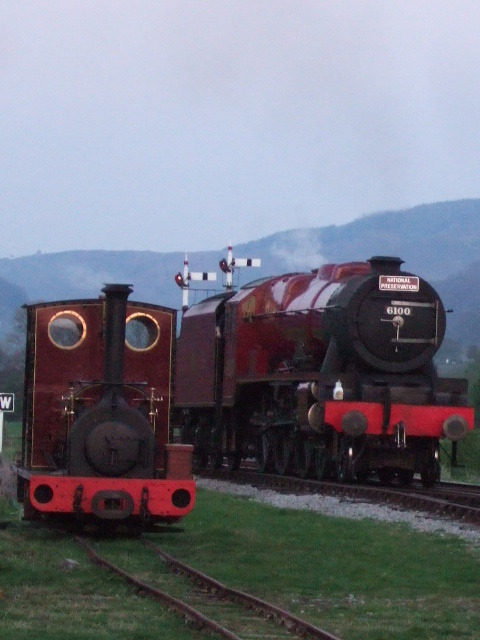 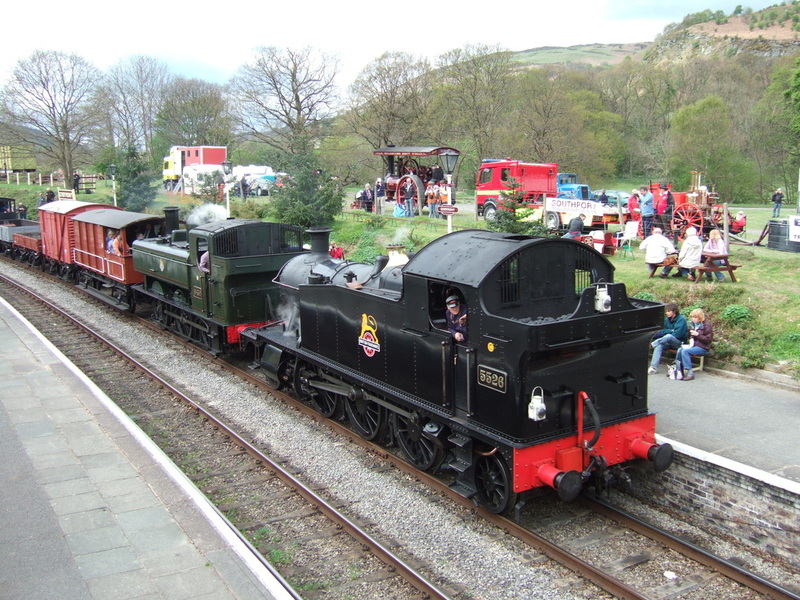 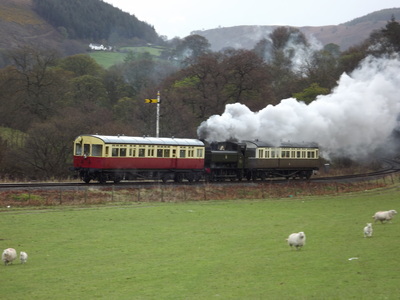 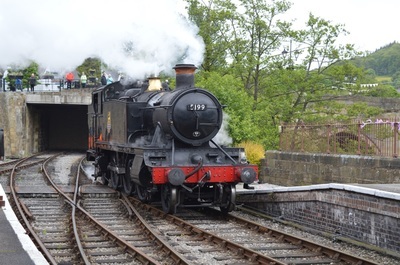 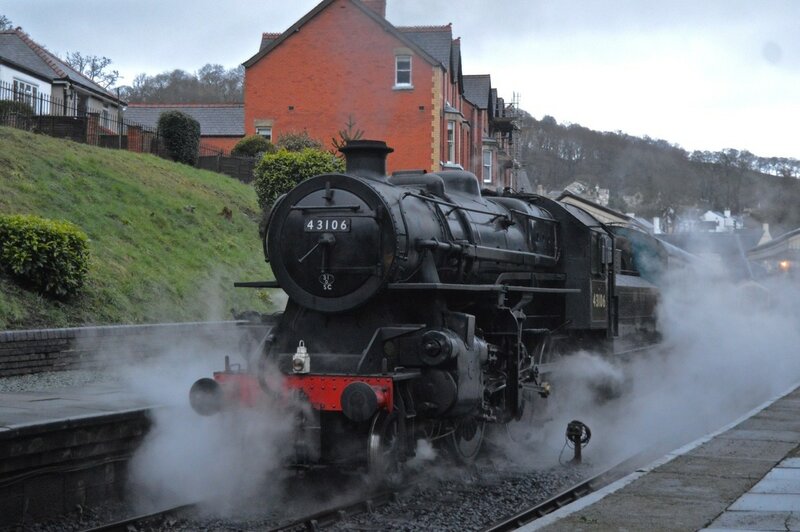 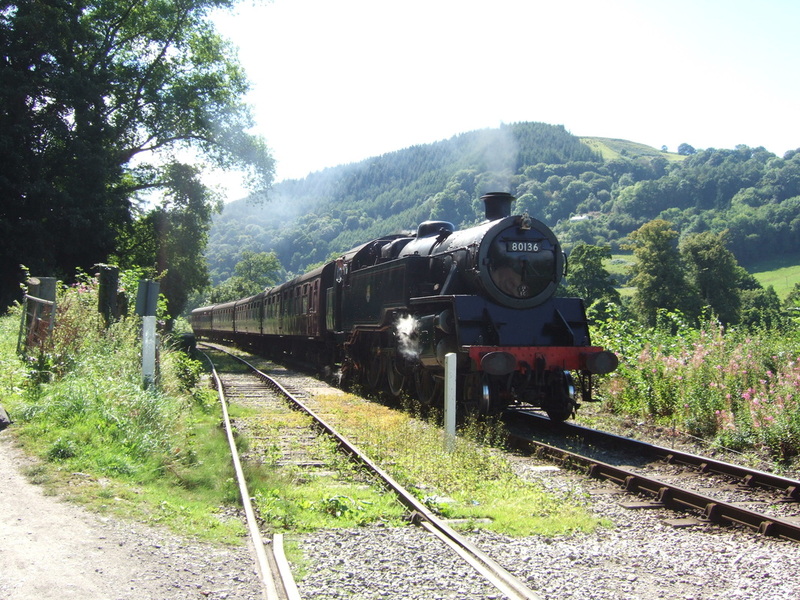 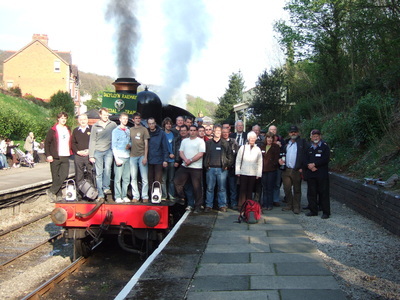 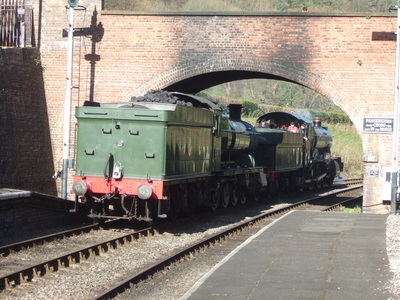 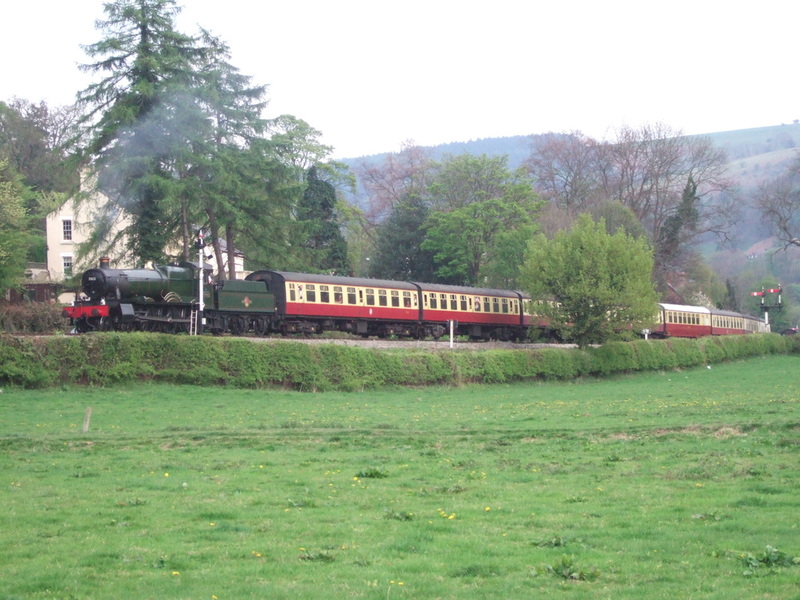 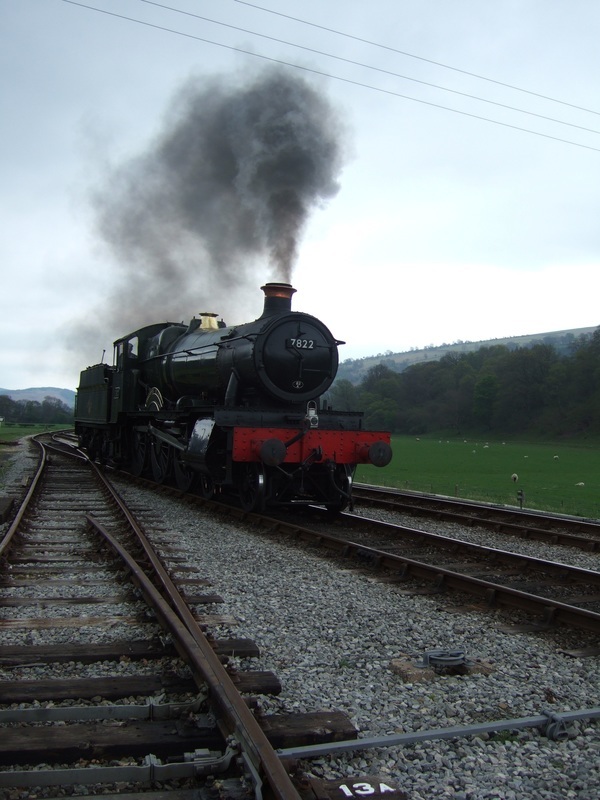 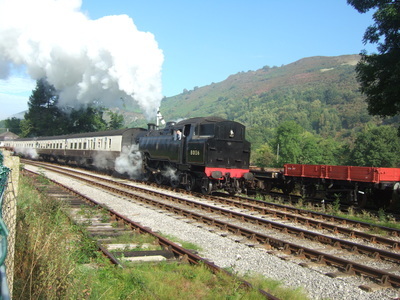 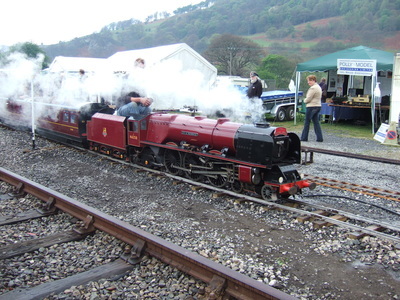 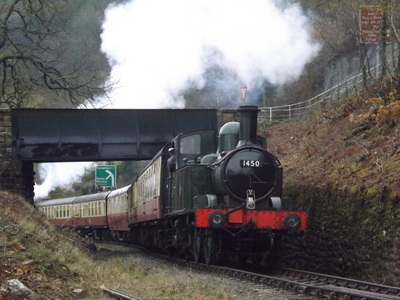 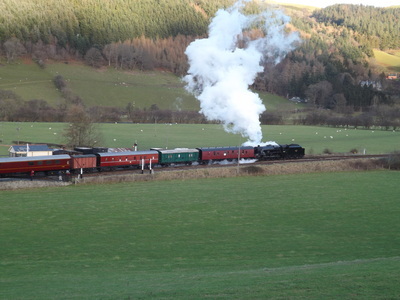 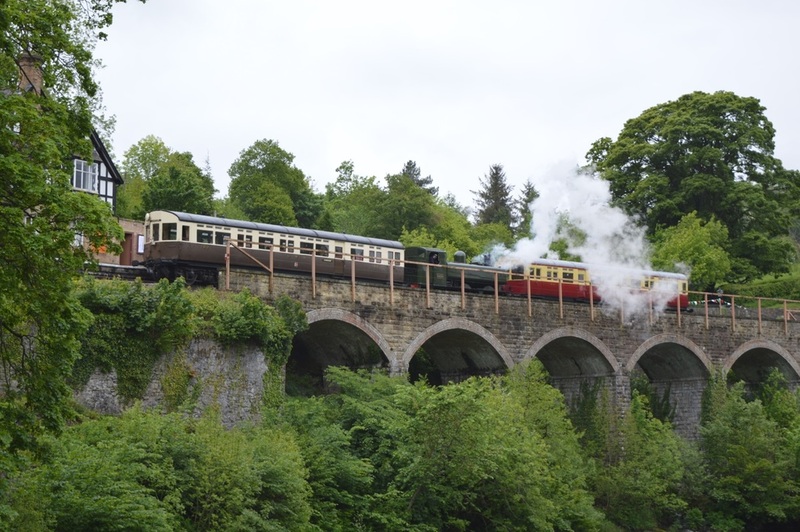 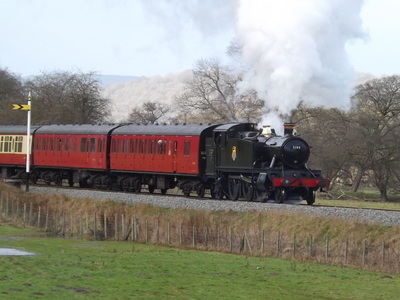 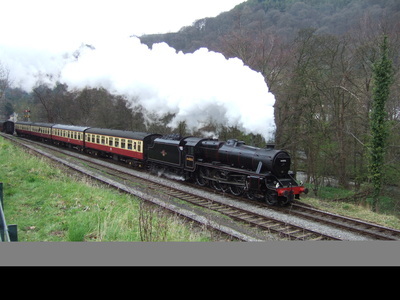 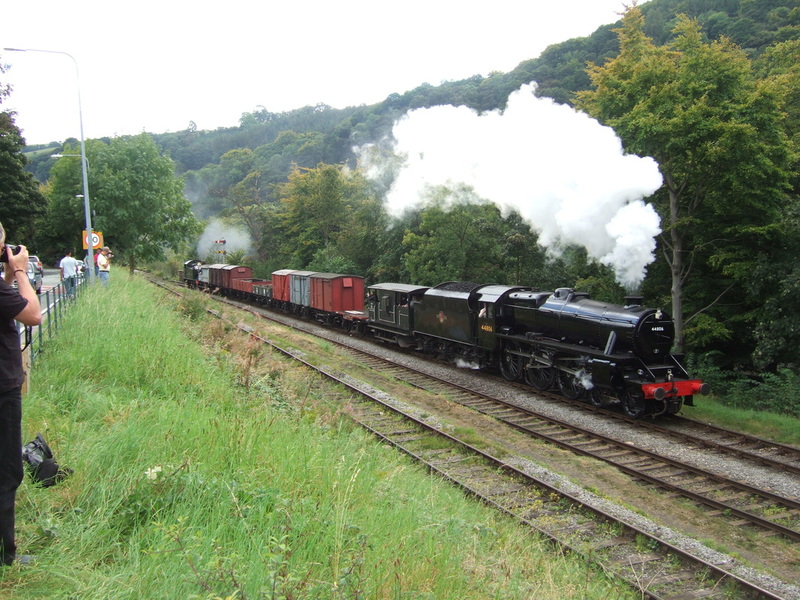 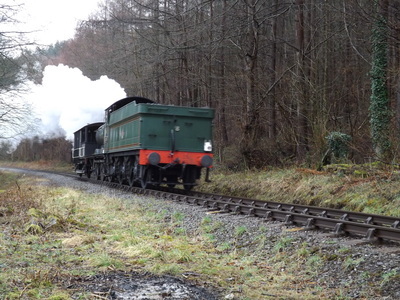 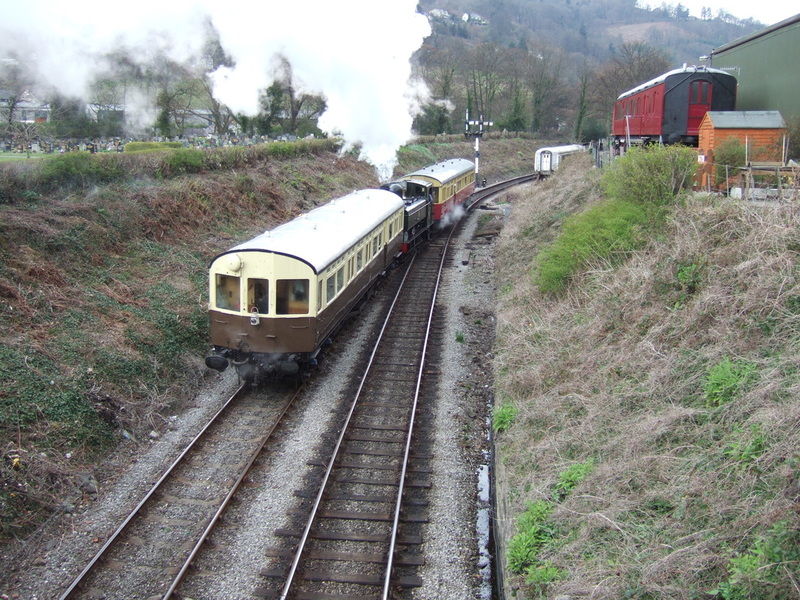 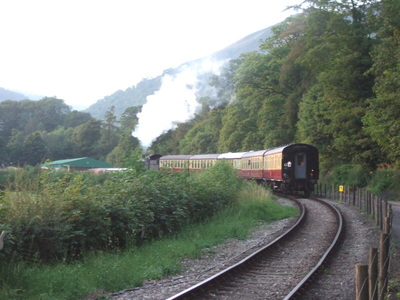 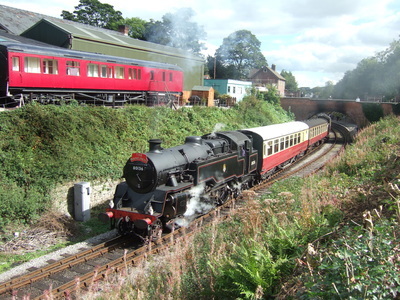 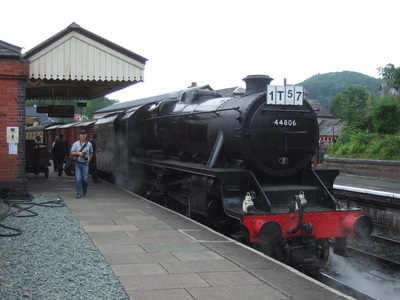 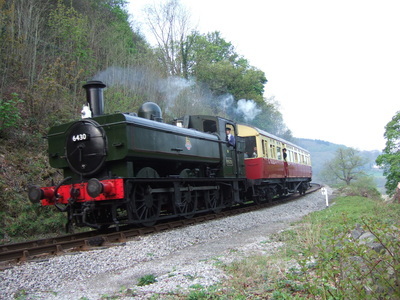 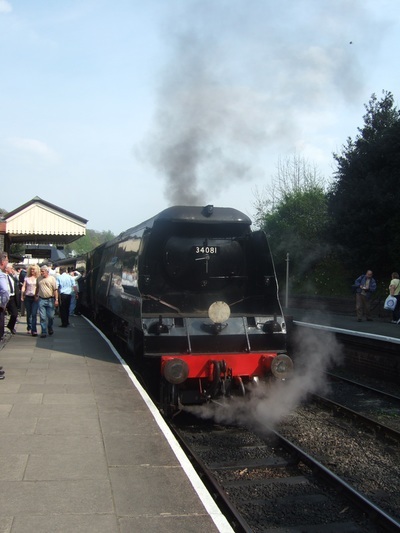 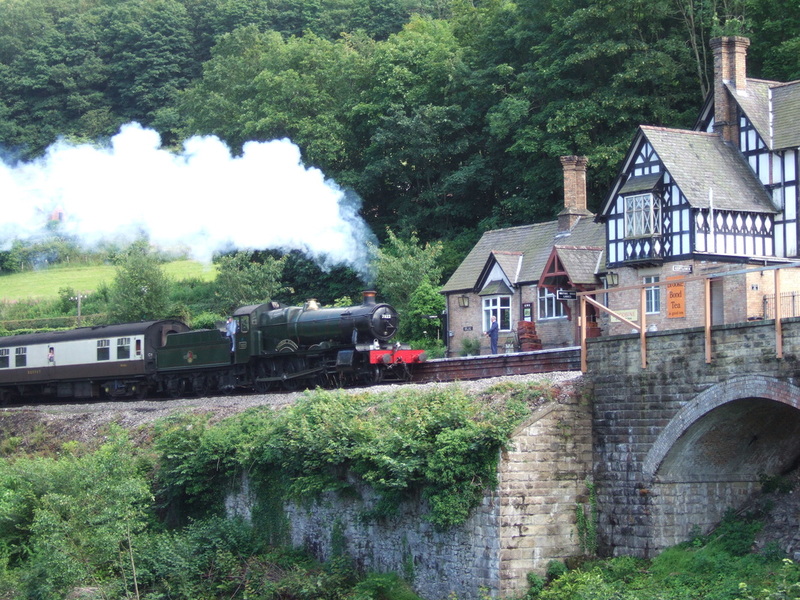 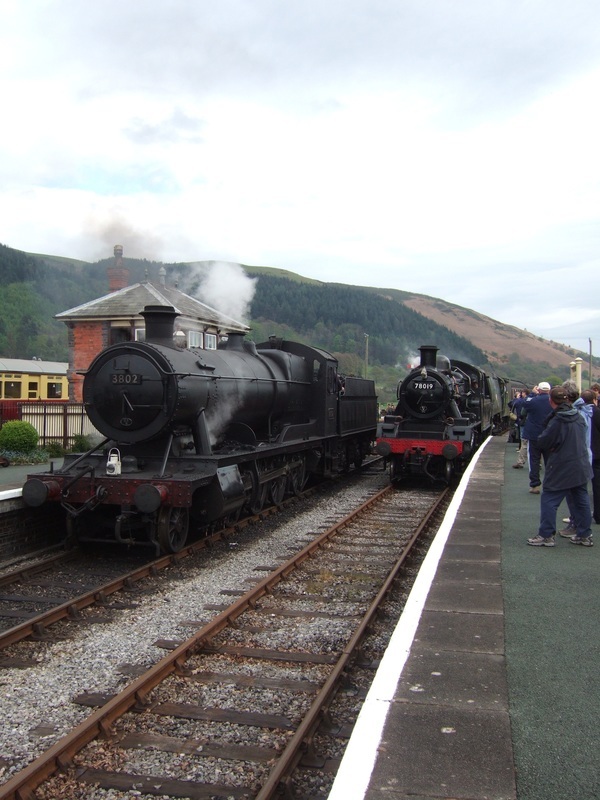 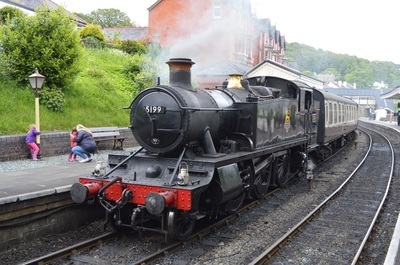 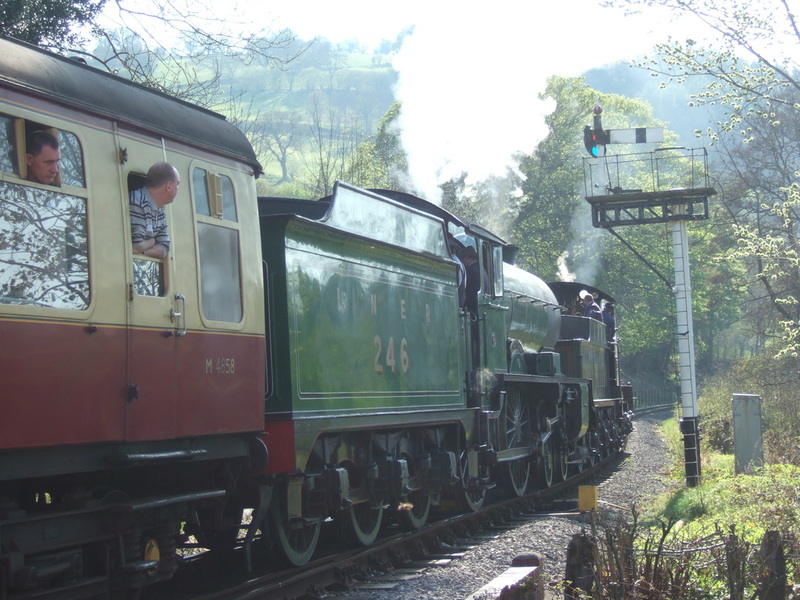 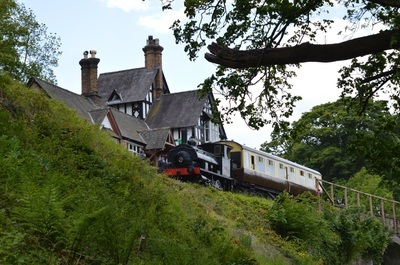 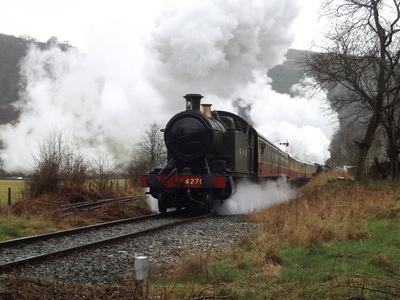 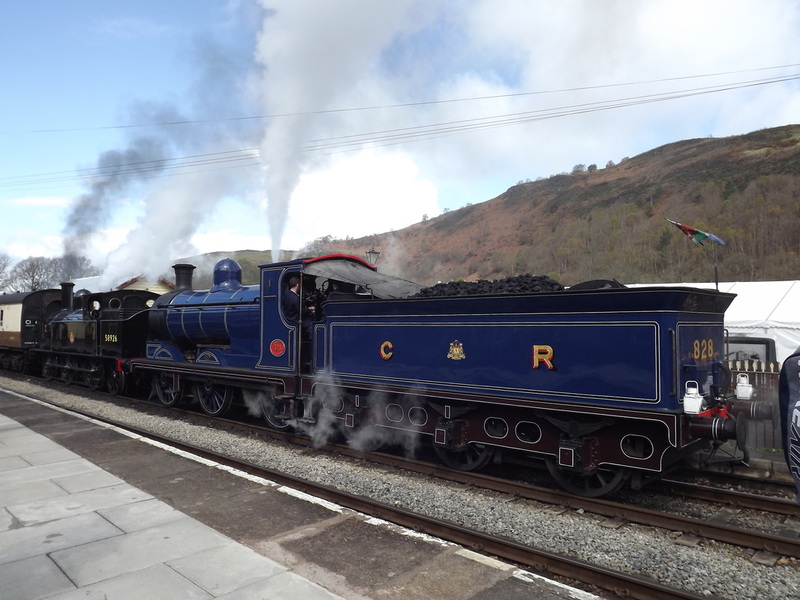 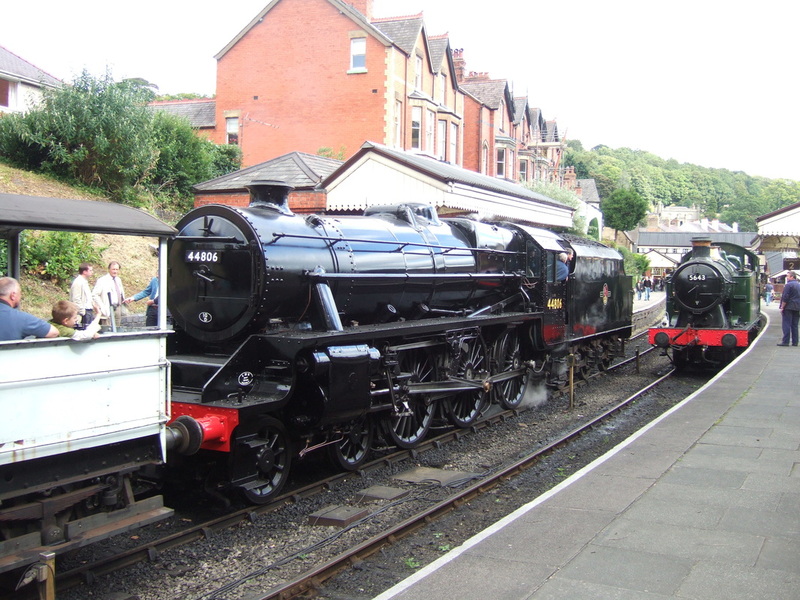 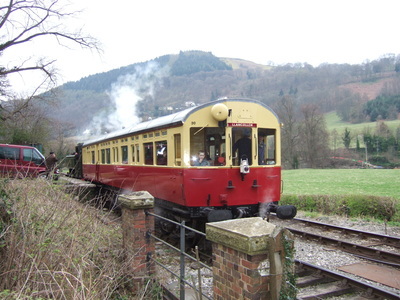 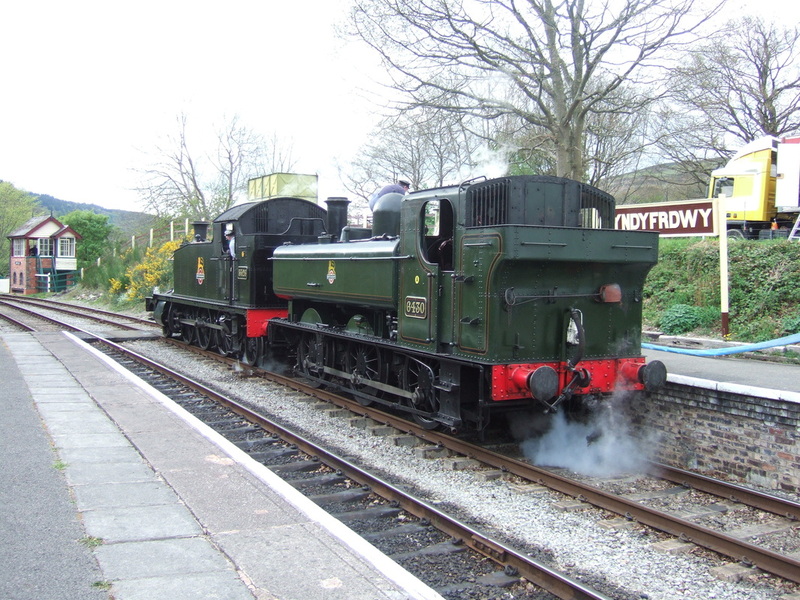 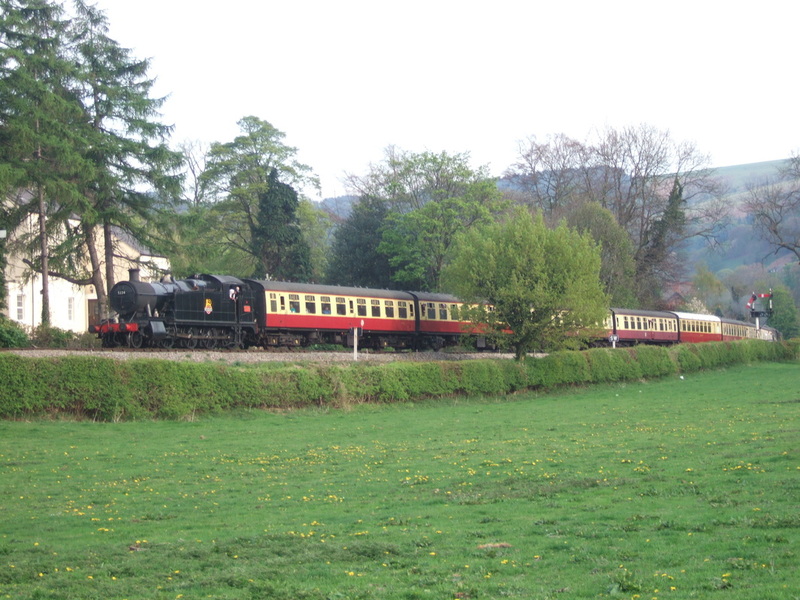 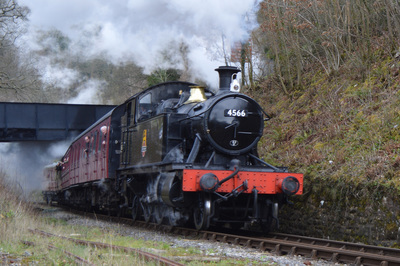 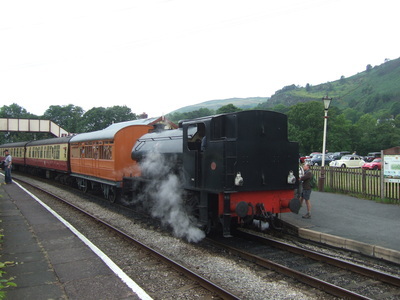 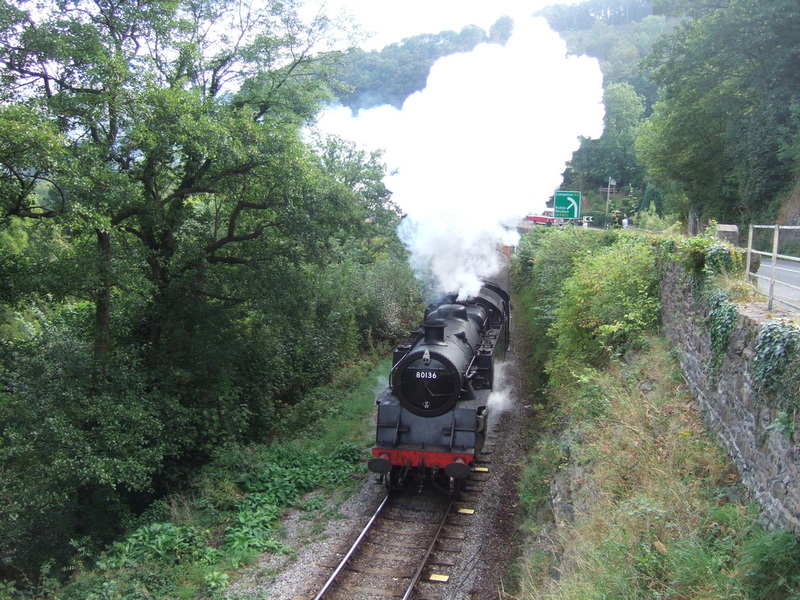 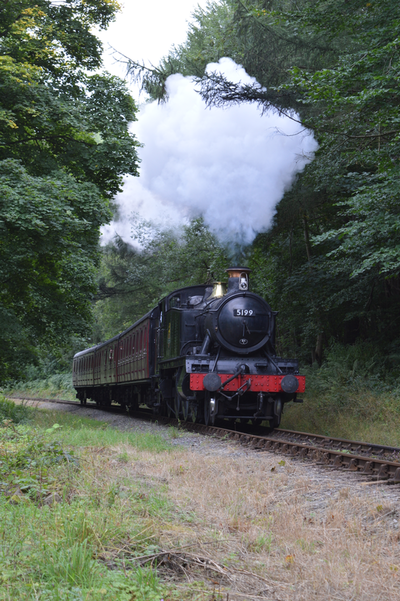 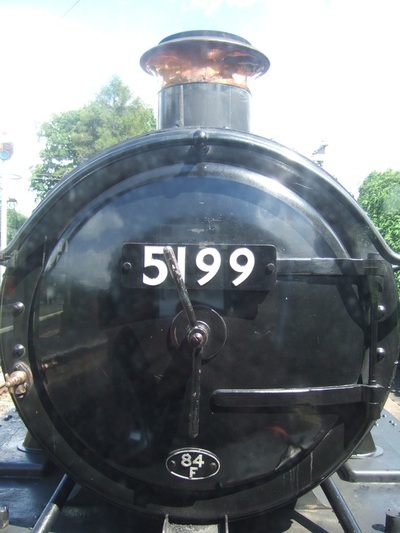 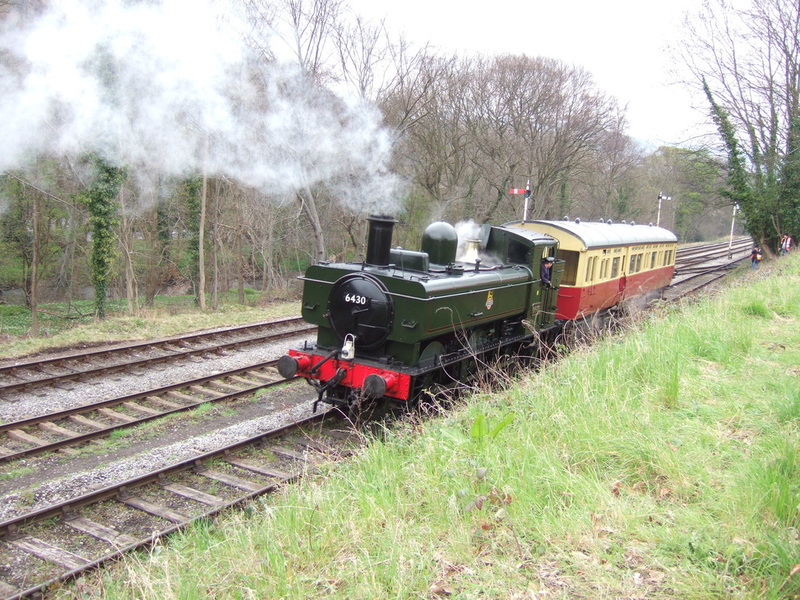 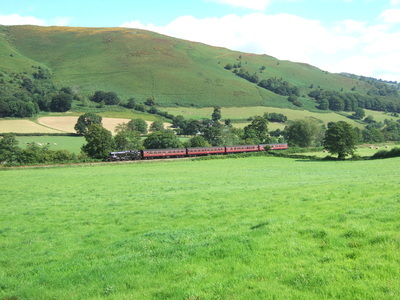 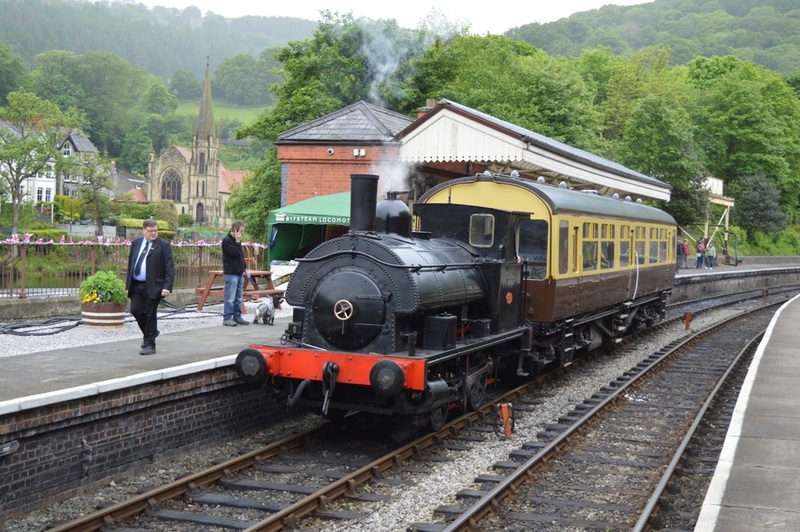 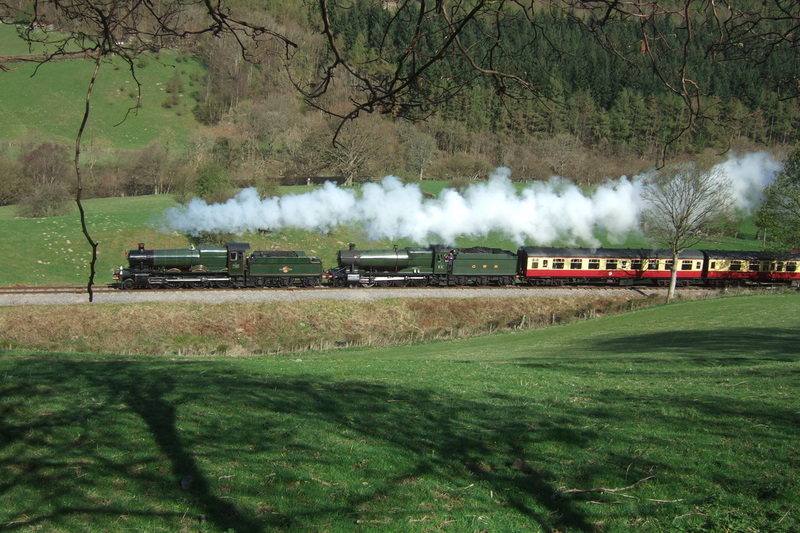 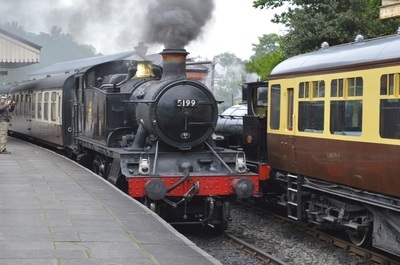 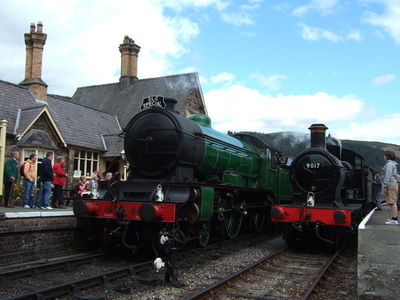 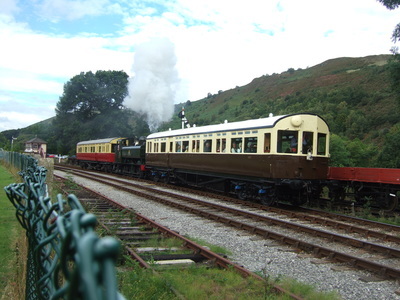 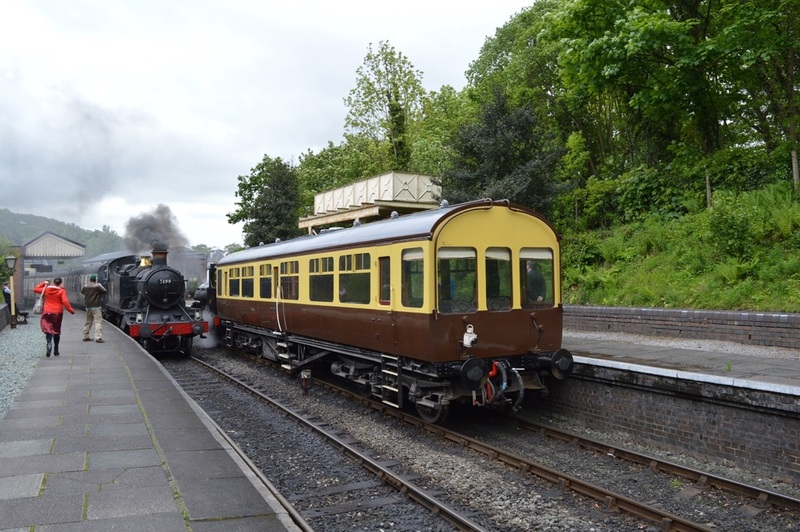 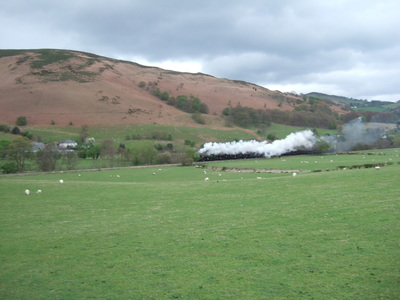 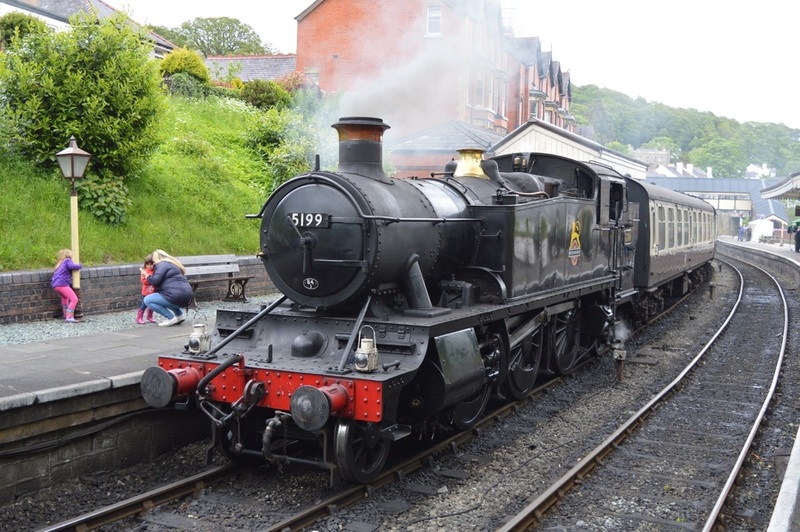 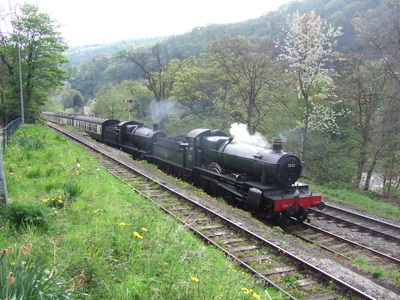 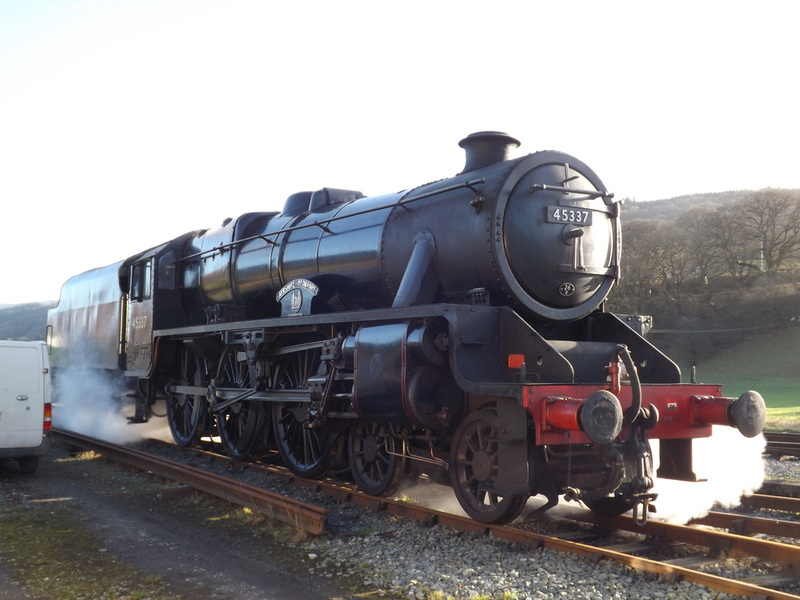 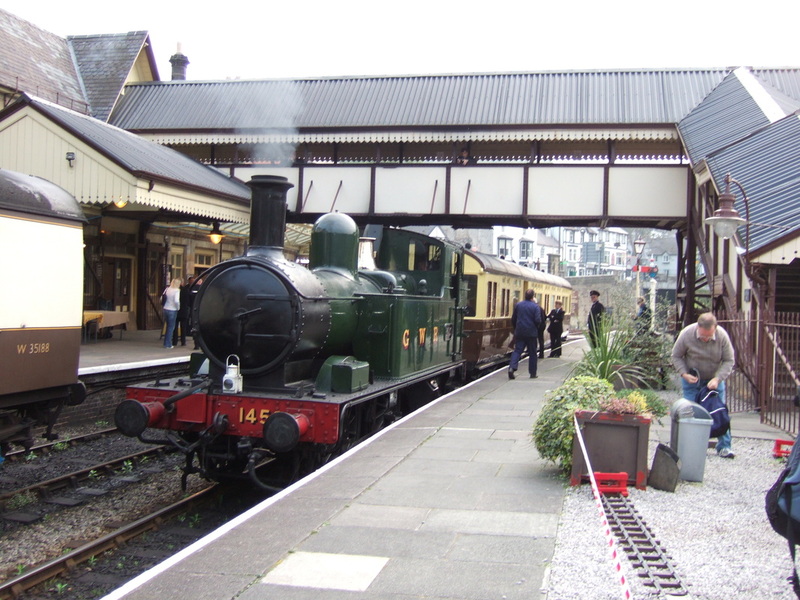 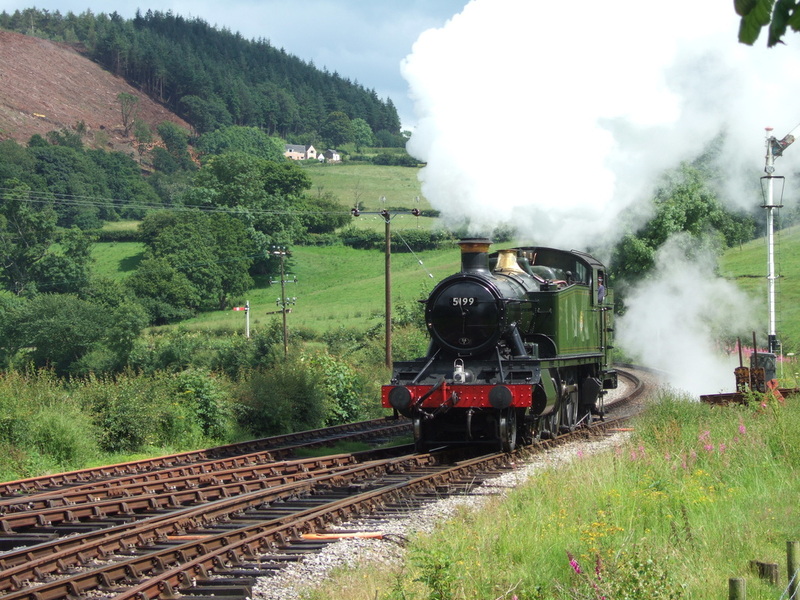 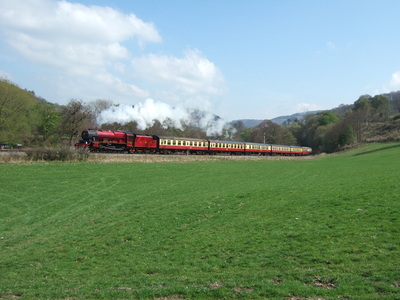 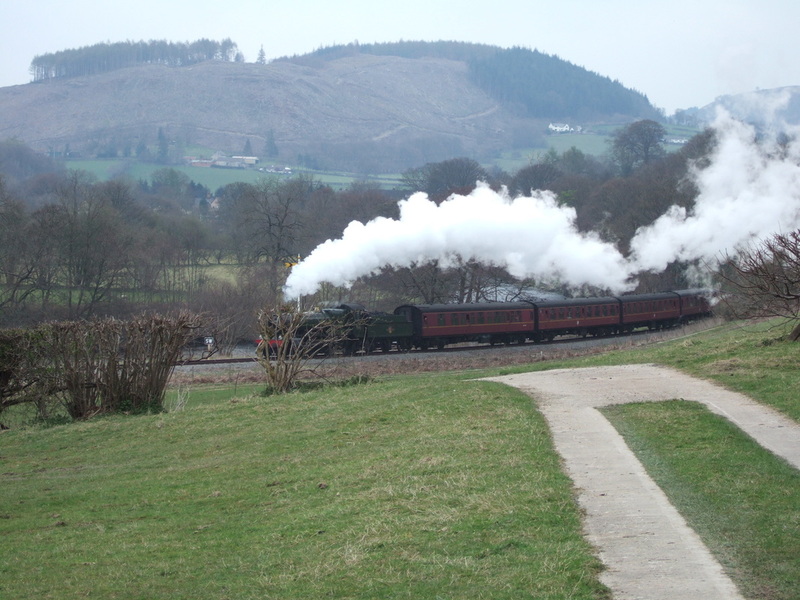 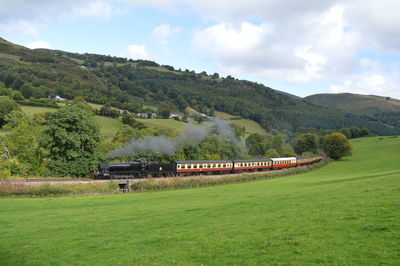 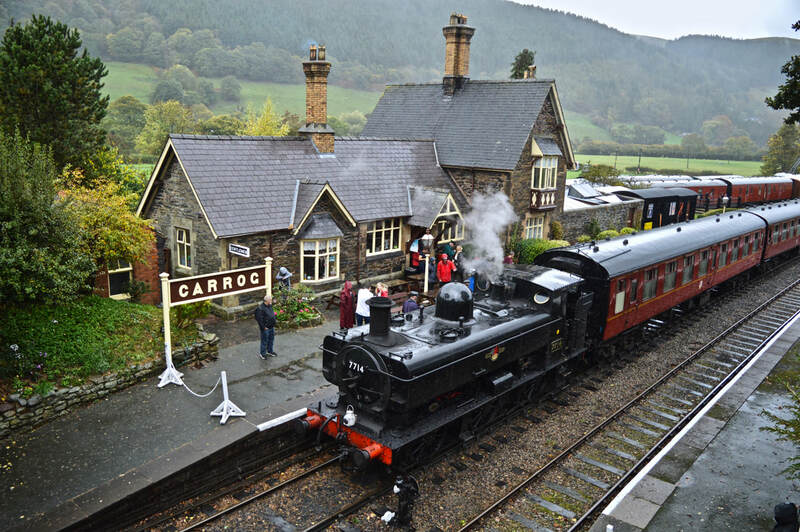 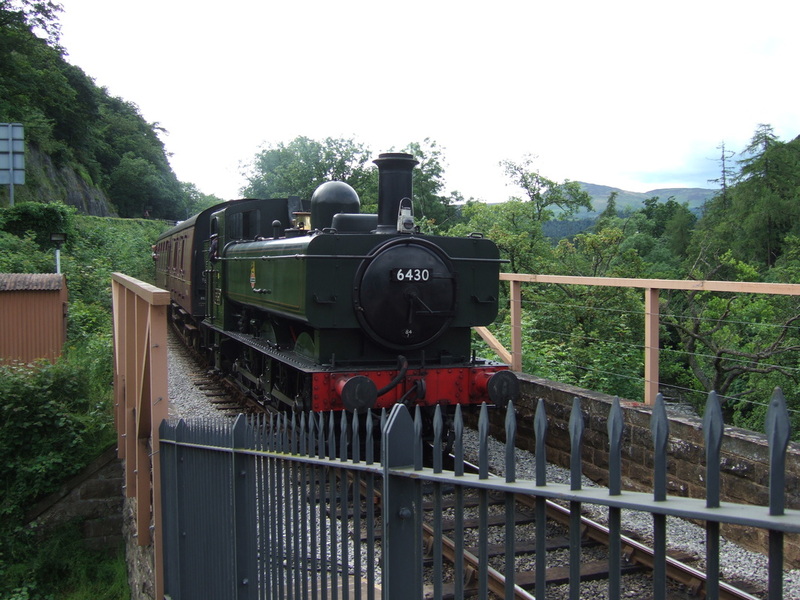 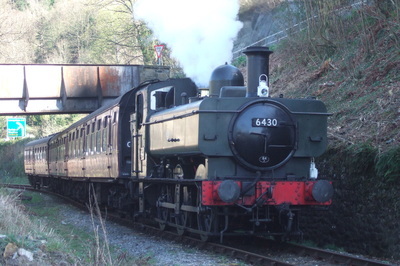 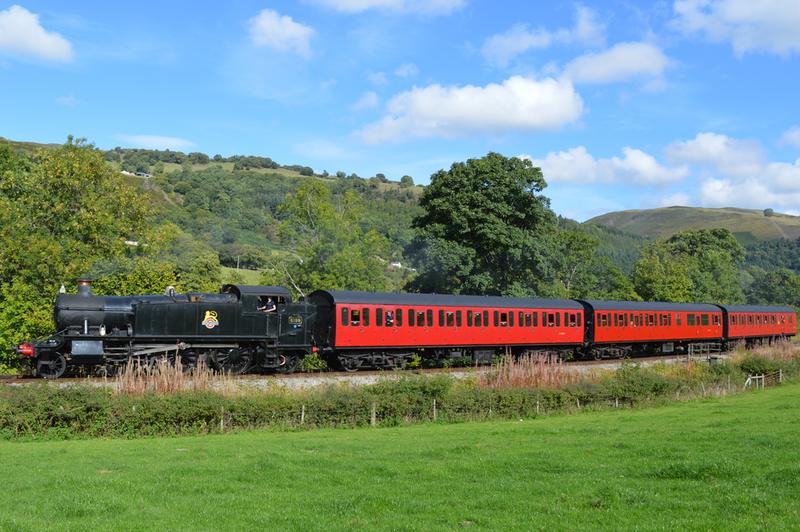 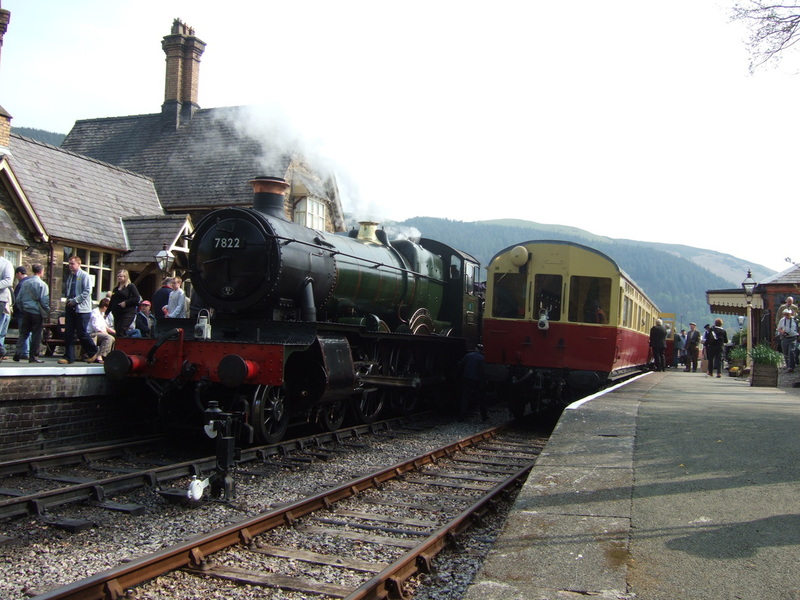 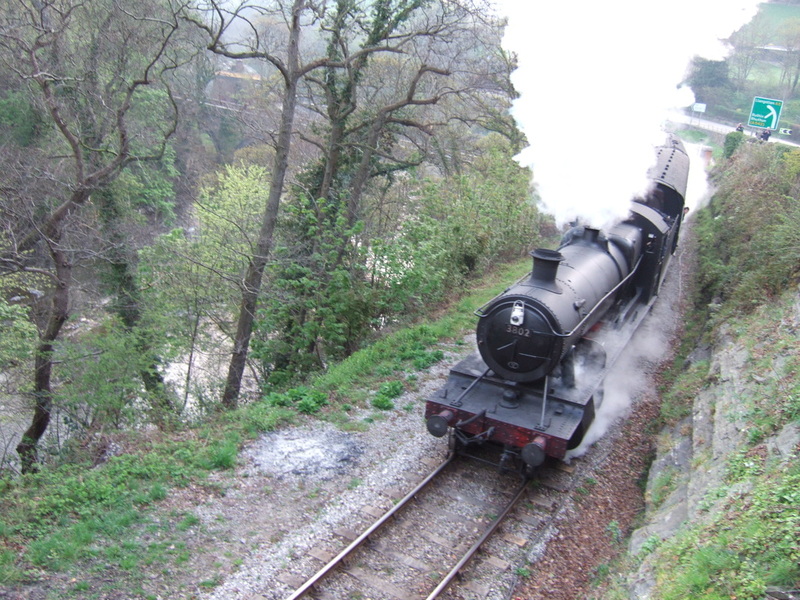 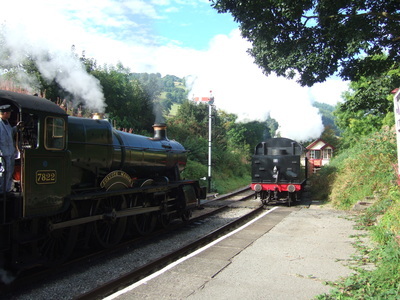 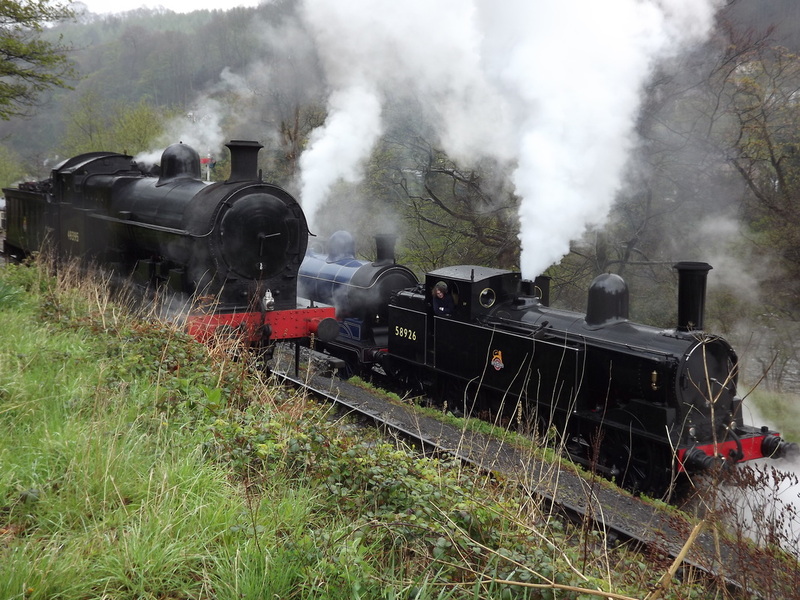 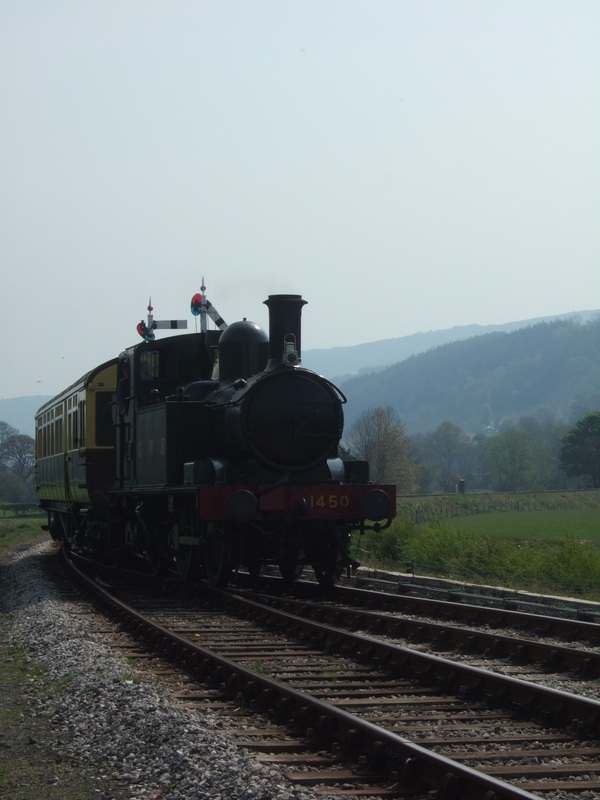 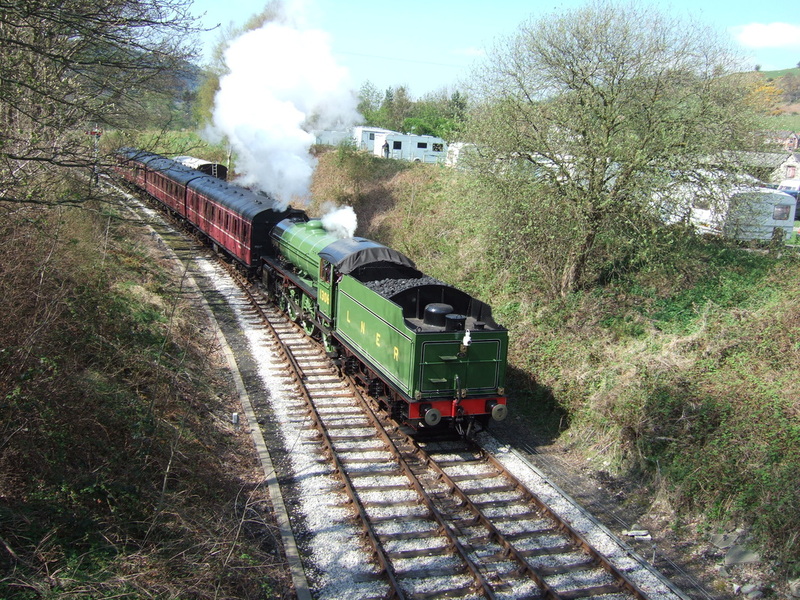 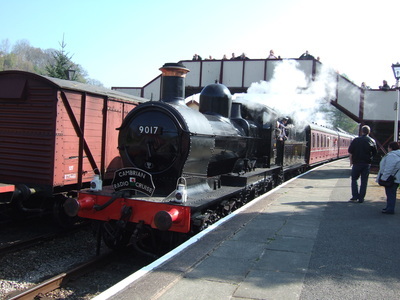 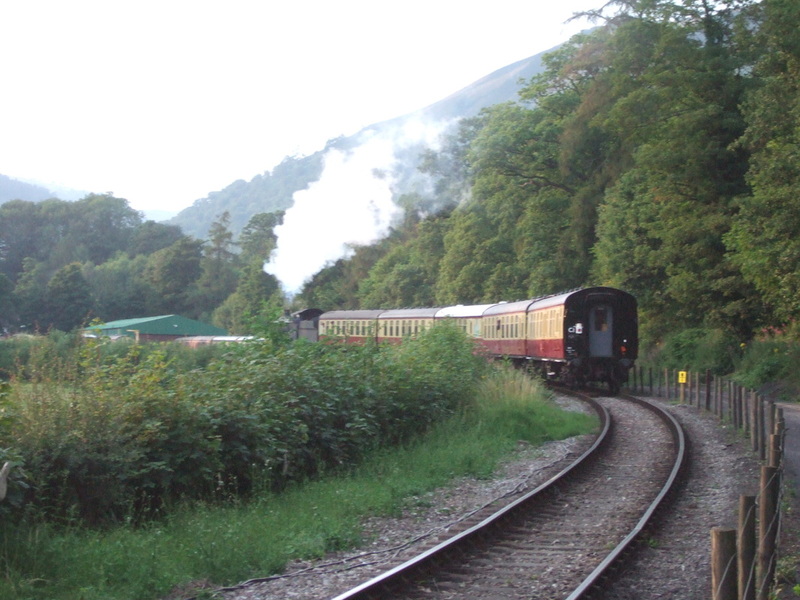 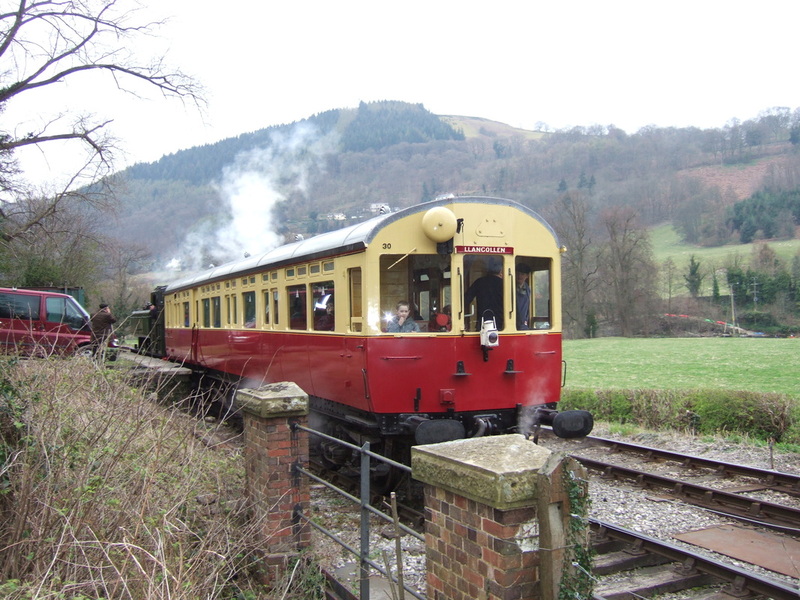 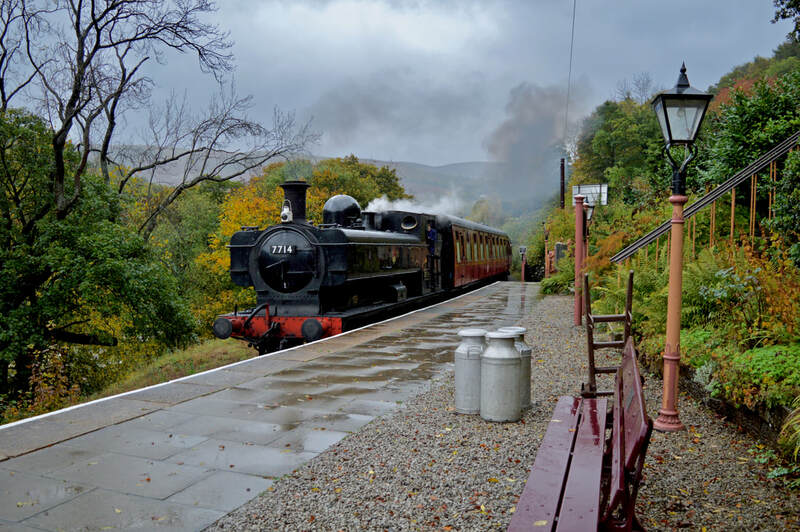 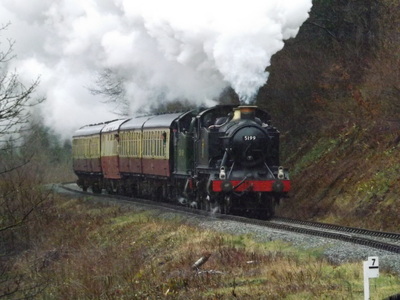 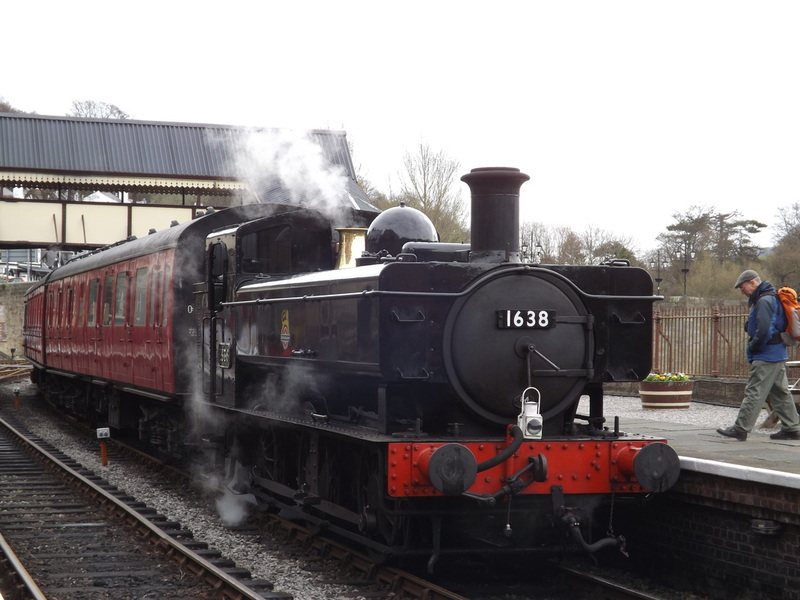 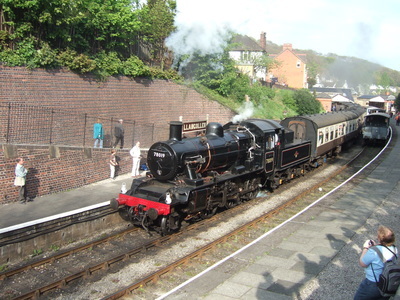 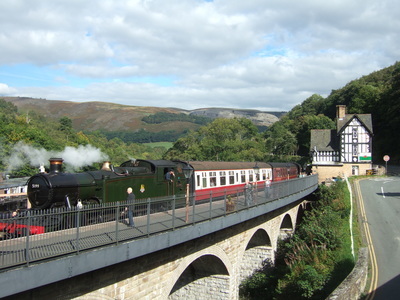 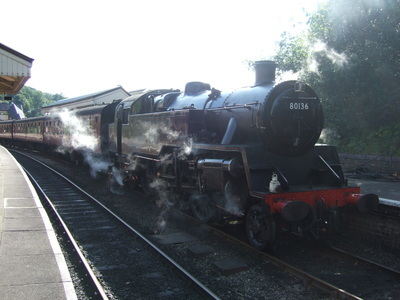 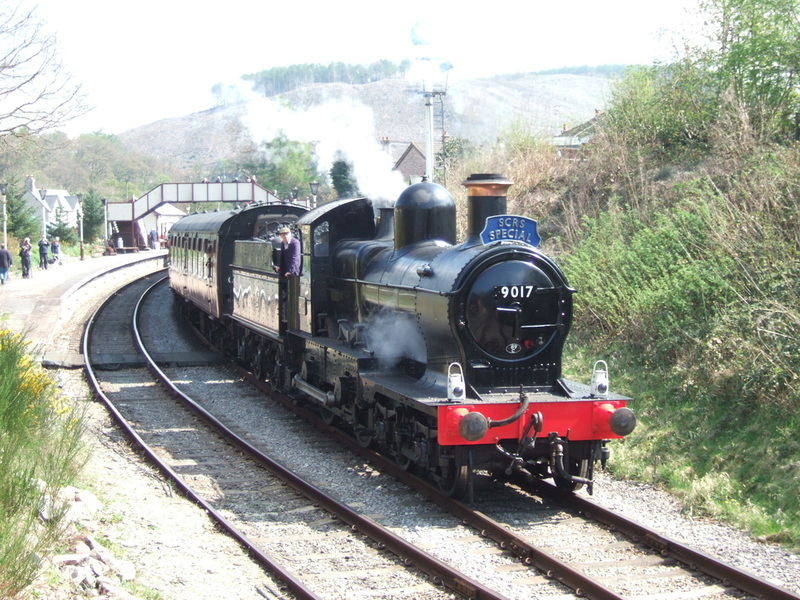 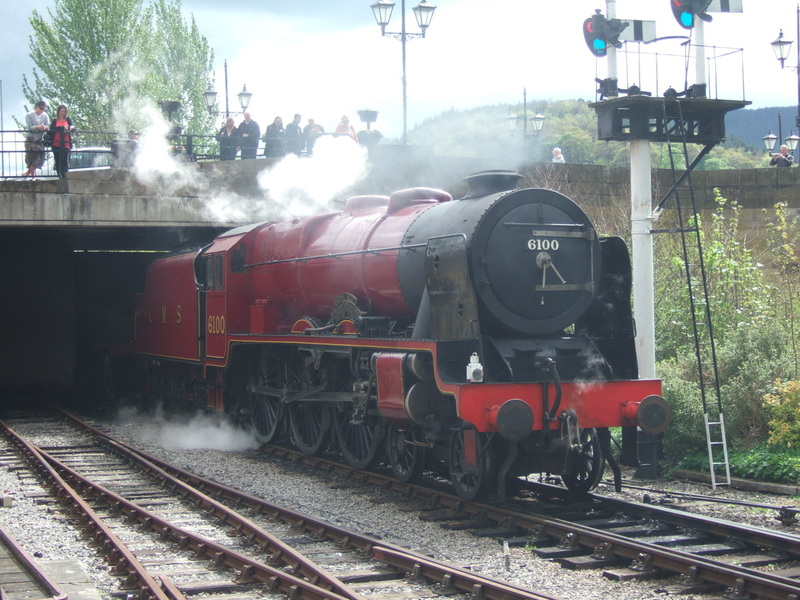 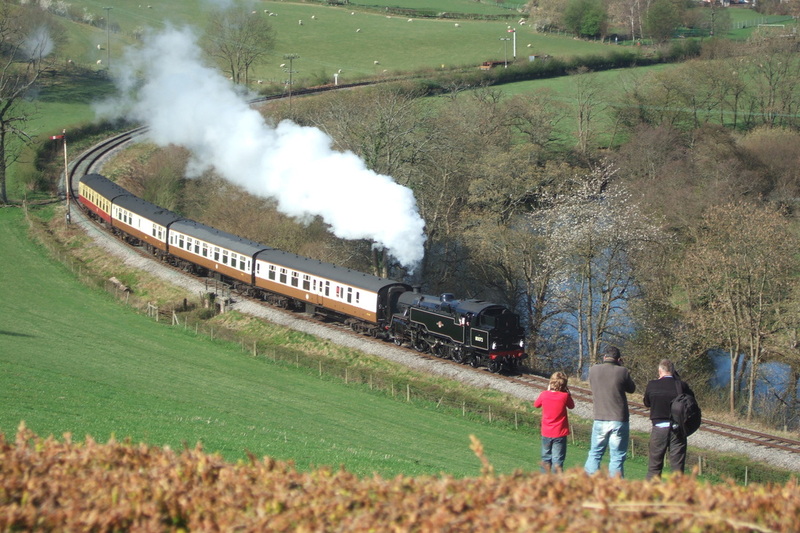 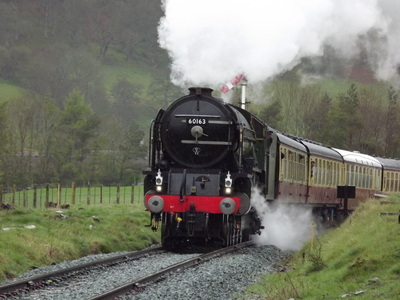 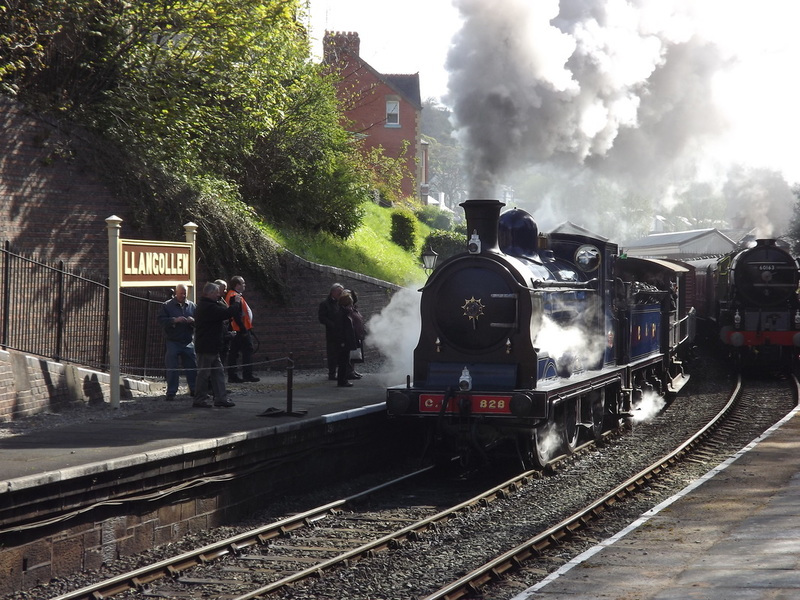 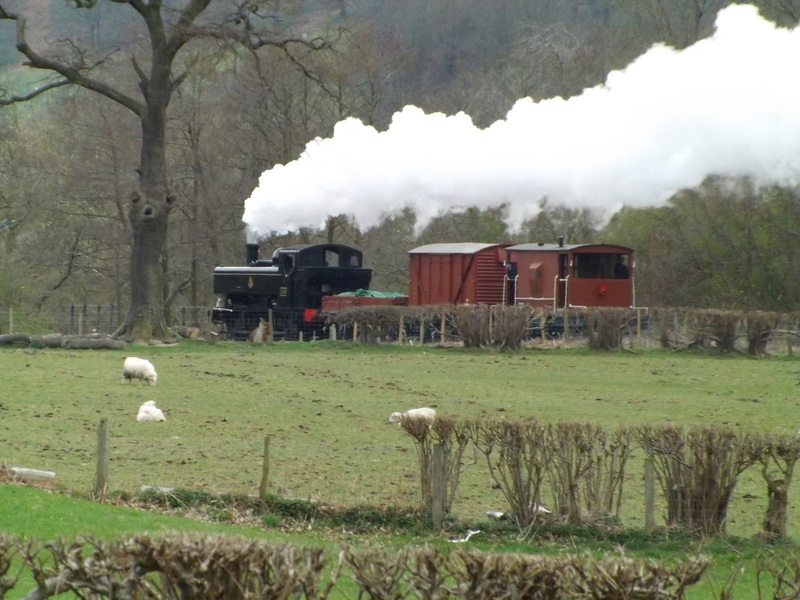 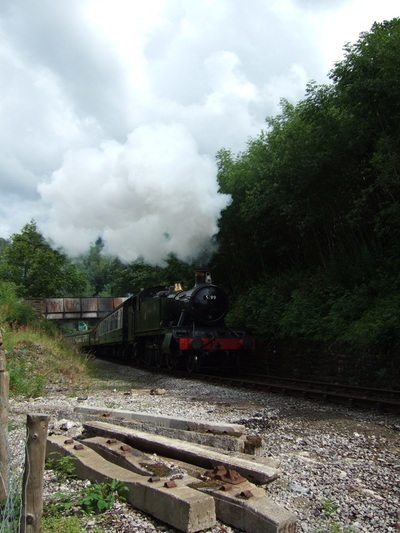 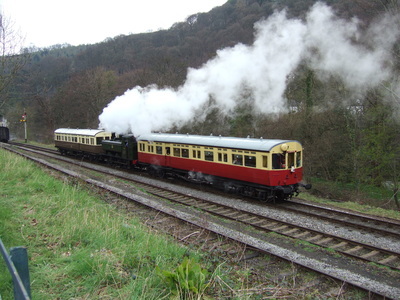 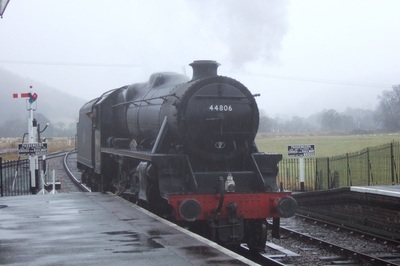 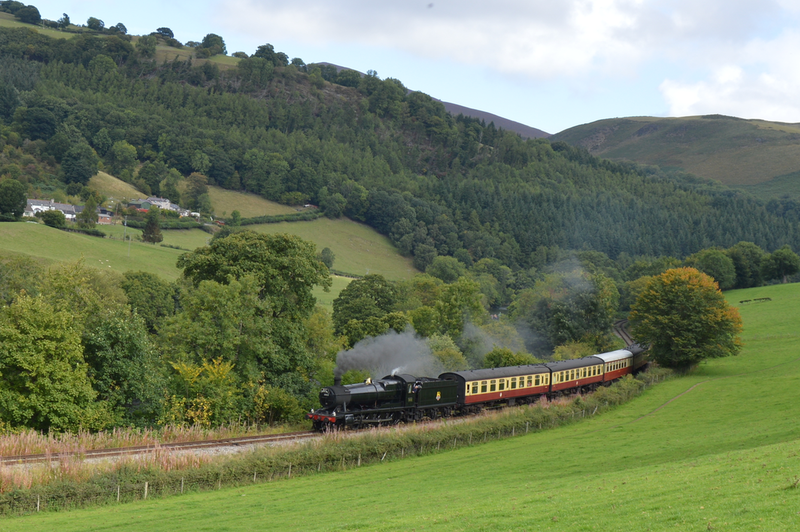 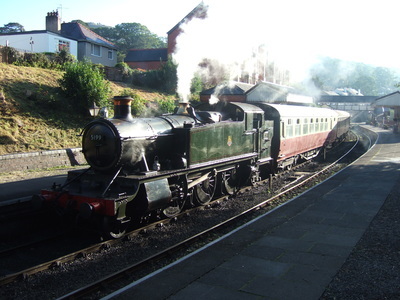 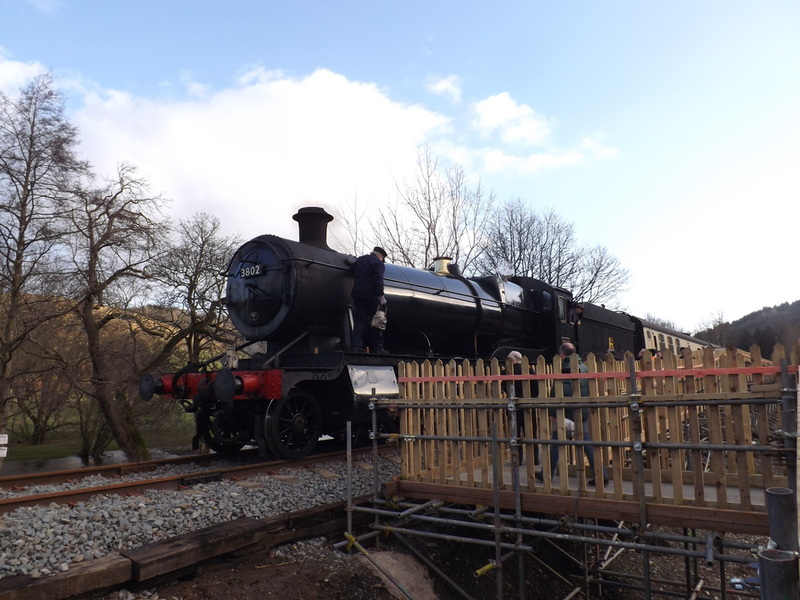 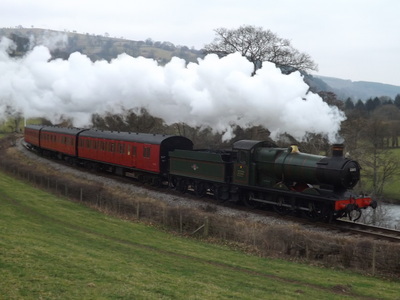 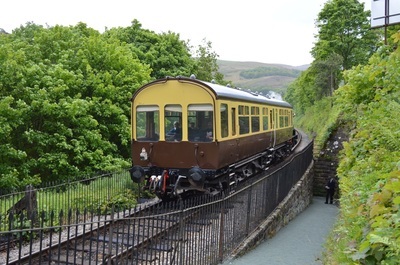 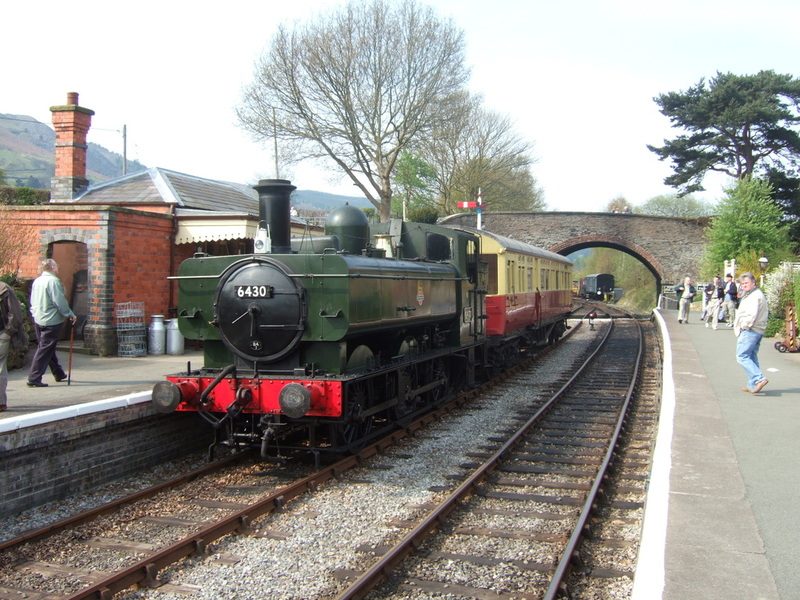 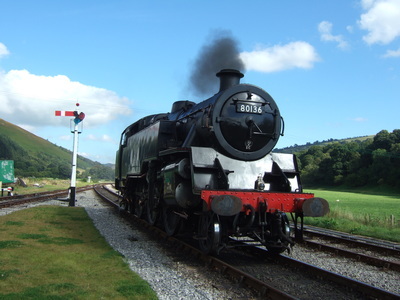 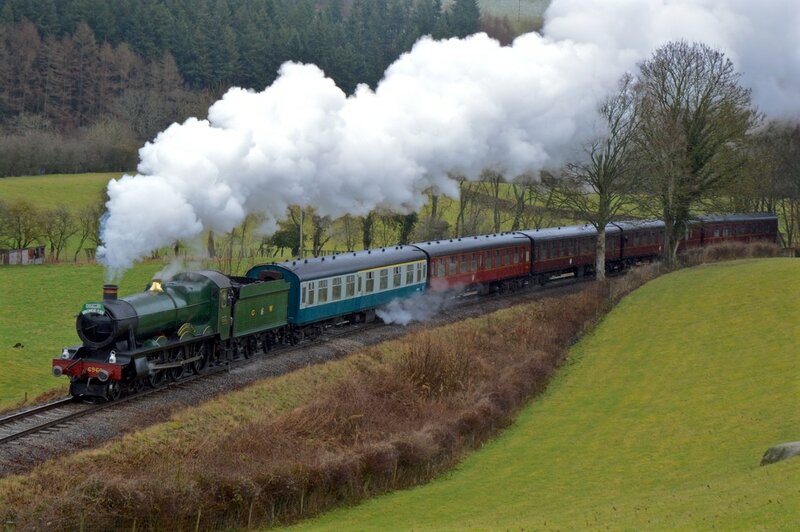 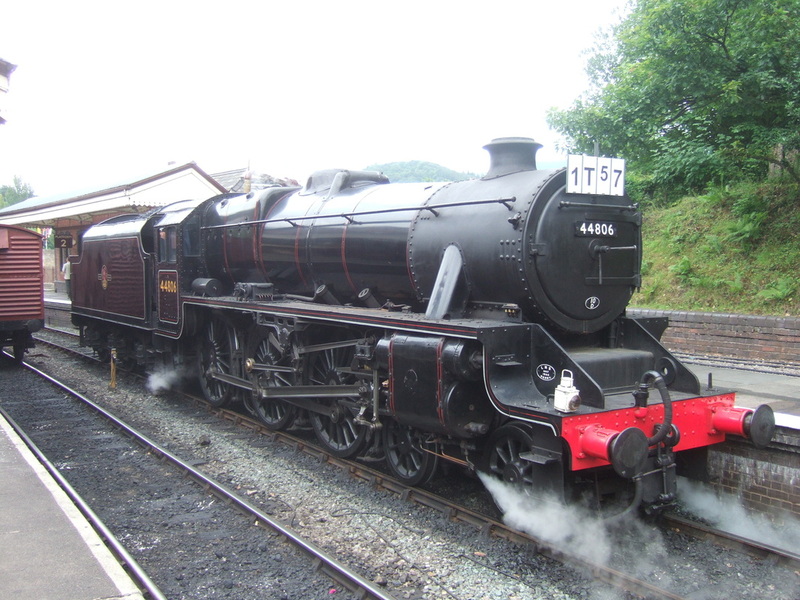 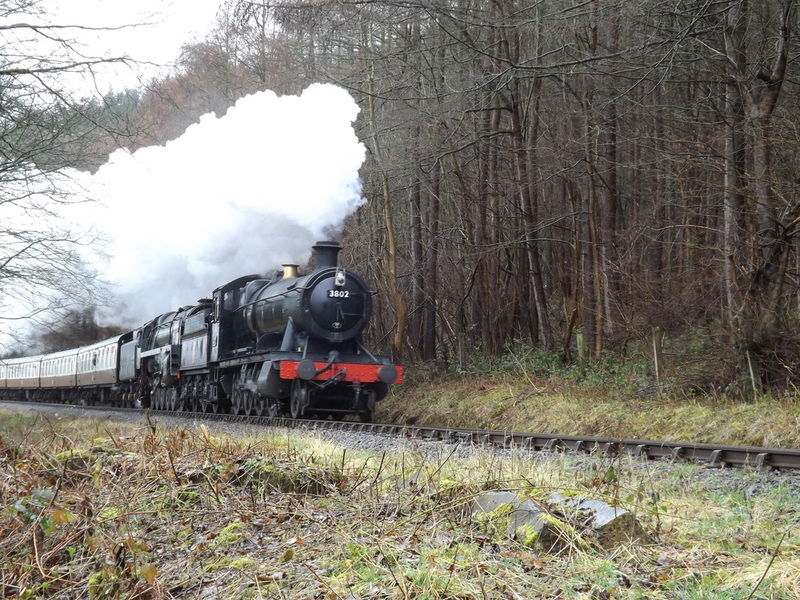 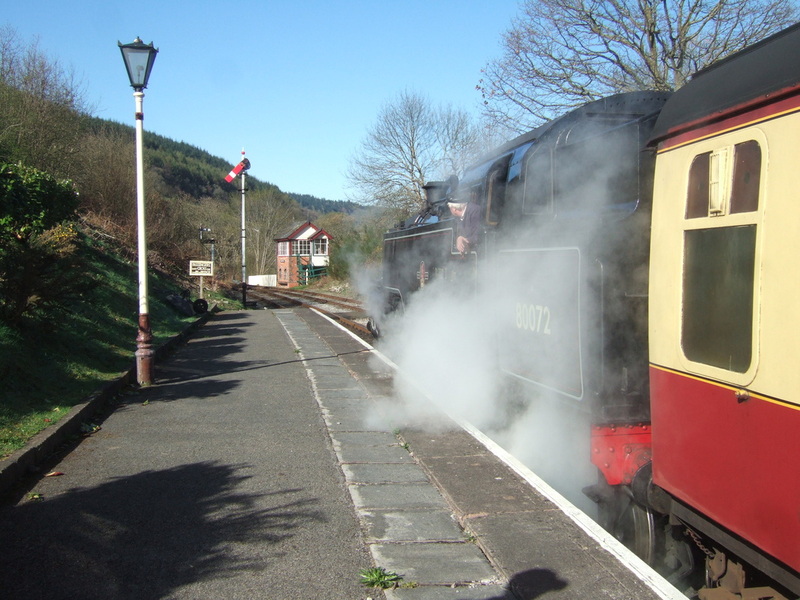 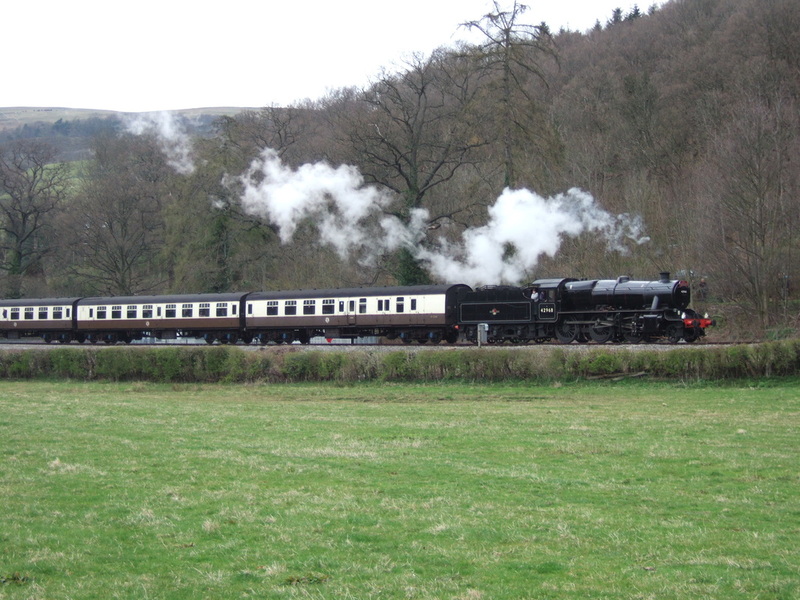 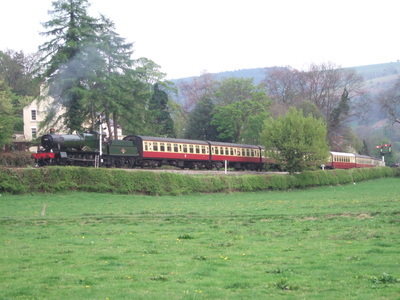 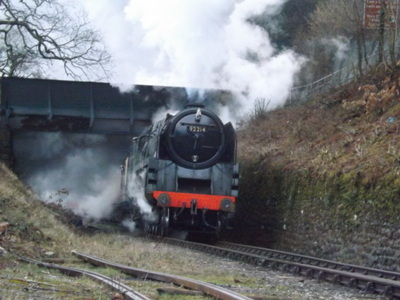 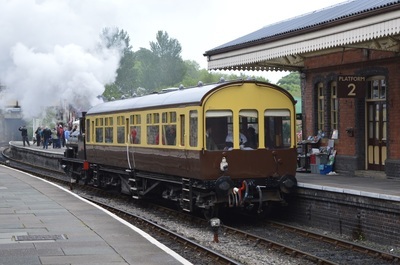 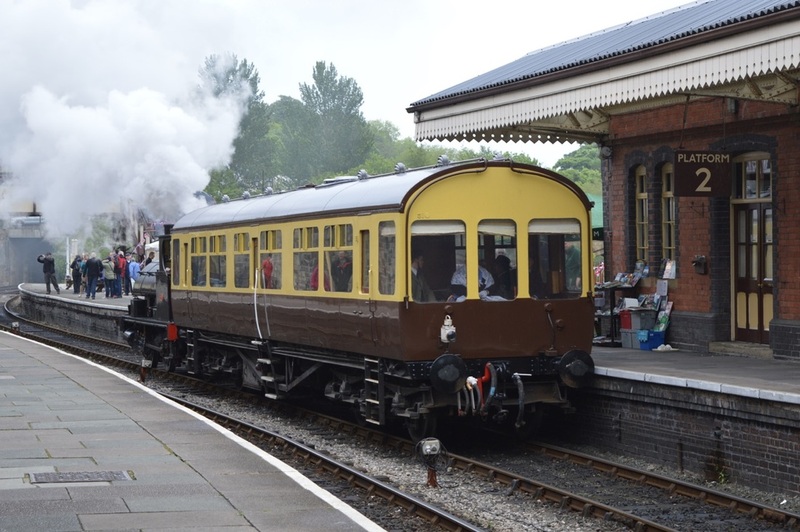 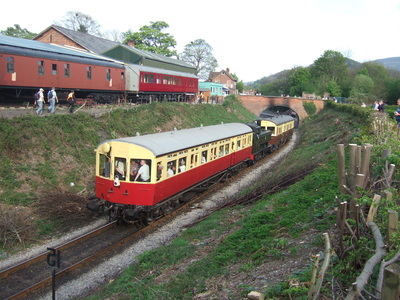 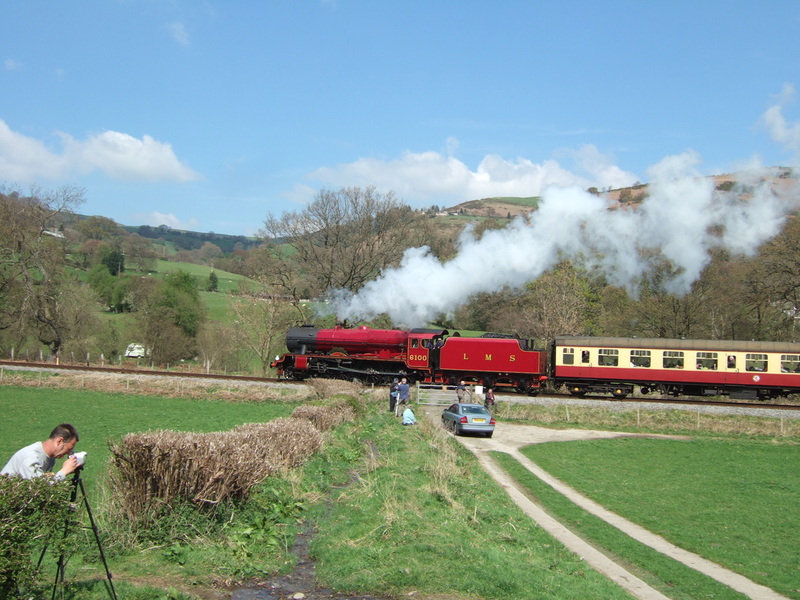 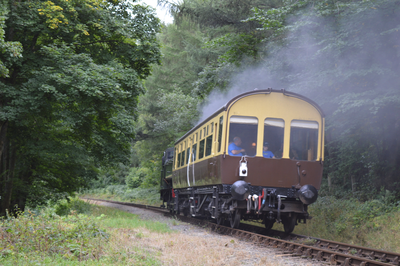 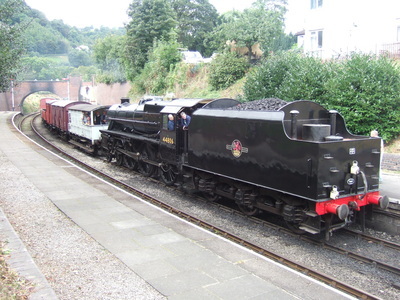 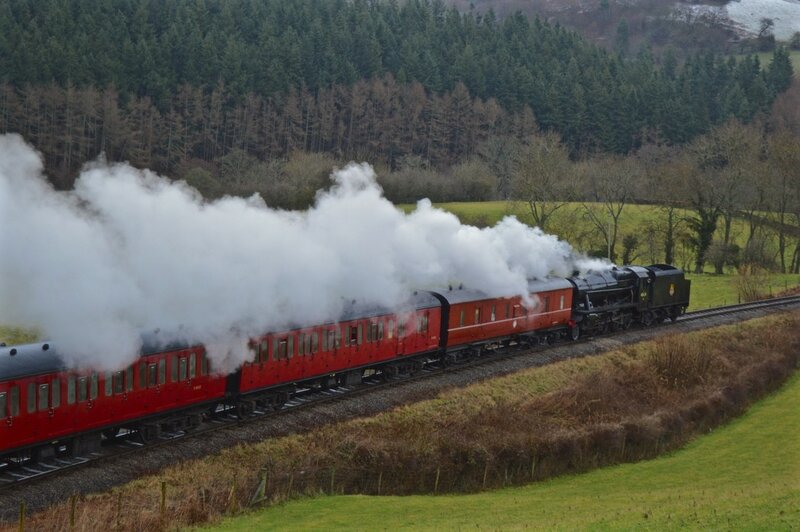 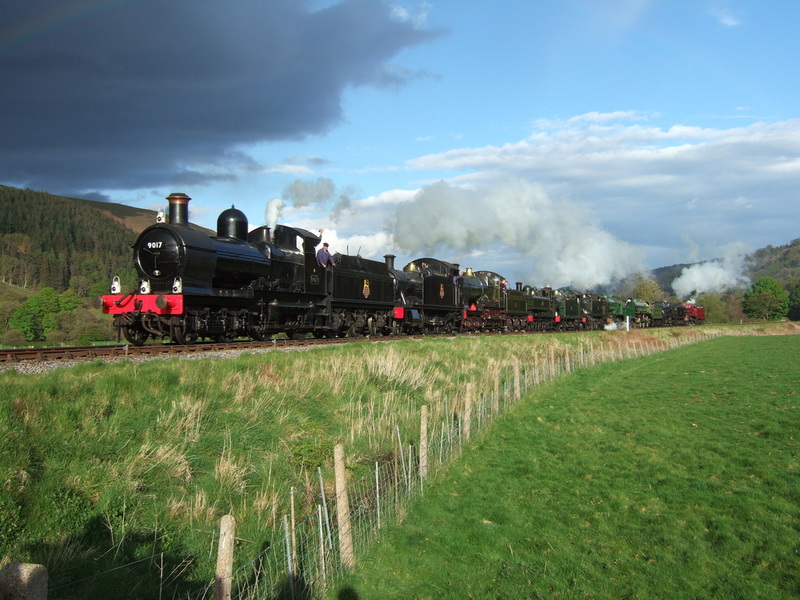 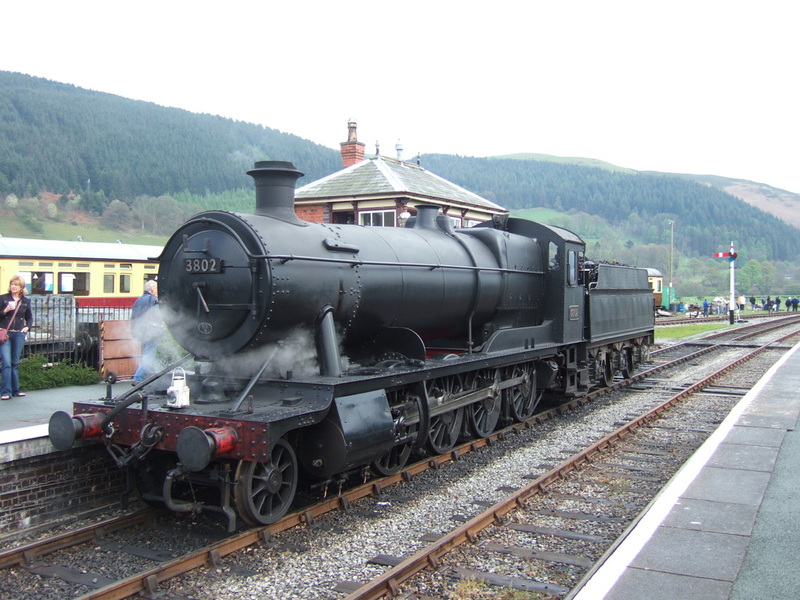 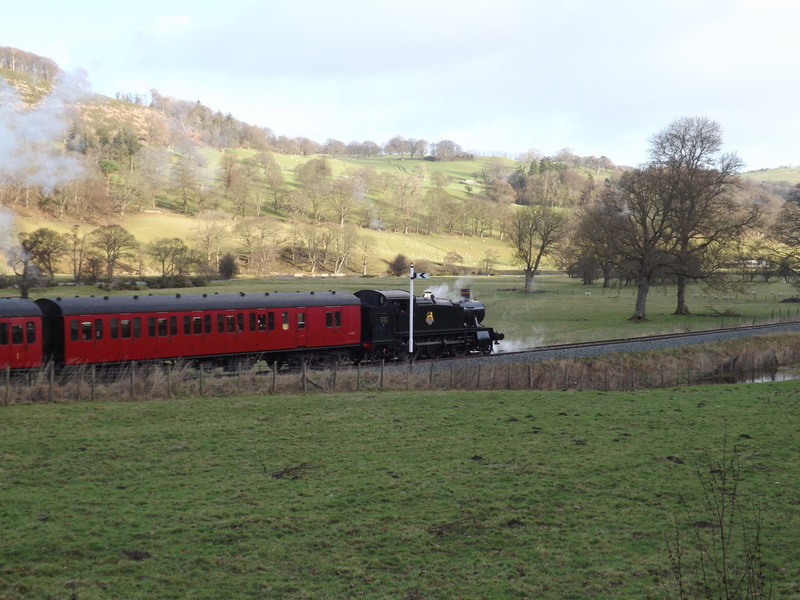 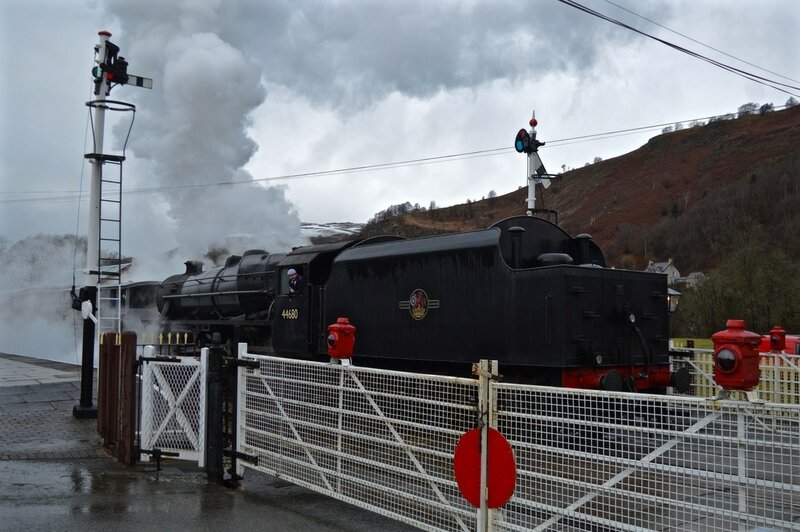 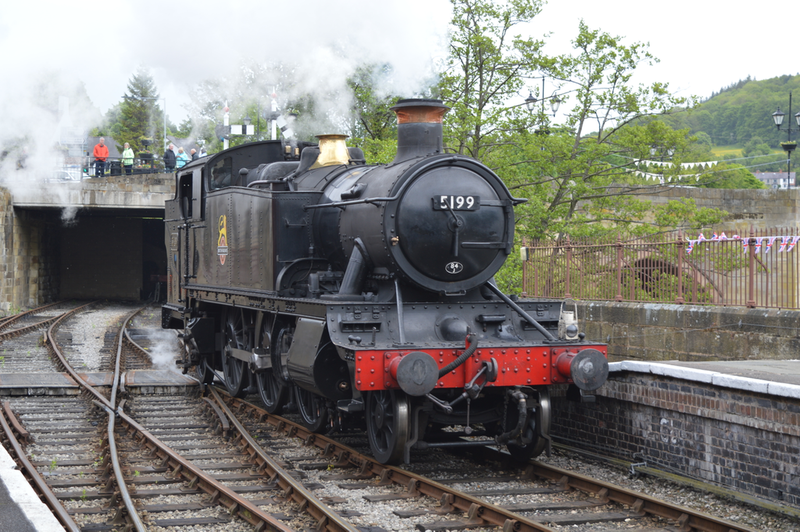 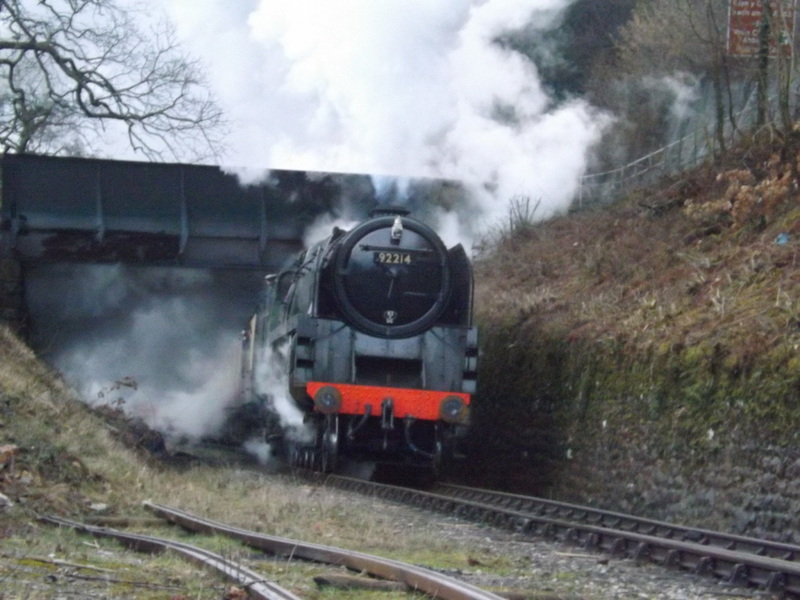 Back in 2007, the Betton Grange Group launched their first of its fundraising events, boosting the quality of steam galas at Llangollen and raising funds to built the 81st Grange 4-6-0. 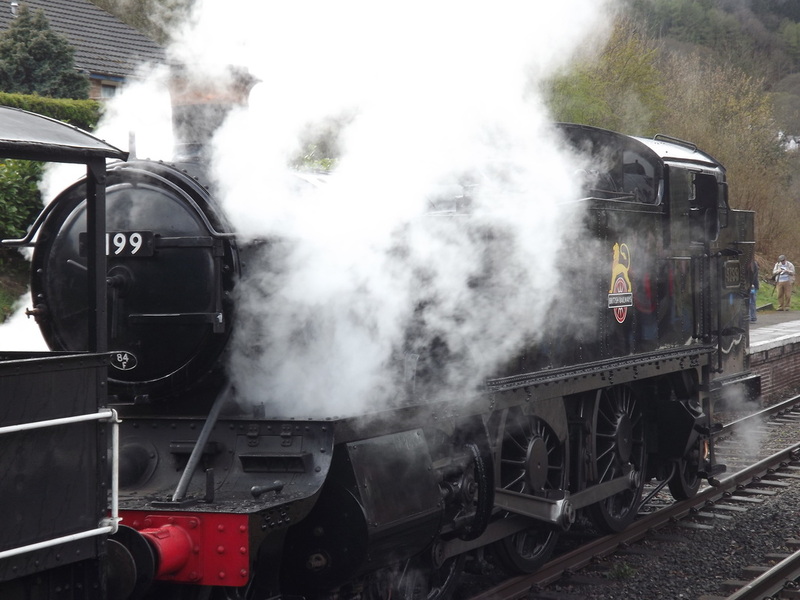 The event saw 92 Squadron visiting, although this had some problems early on Saturday and didn't appear until the afternoon. 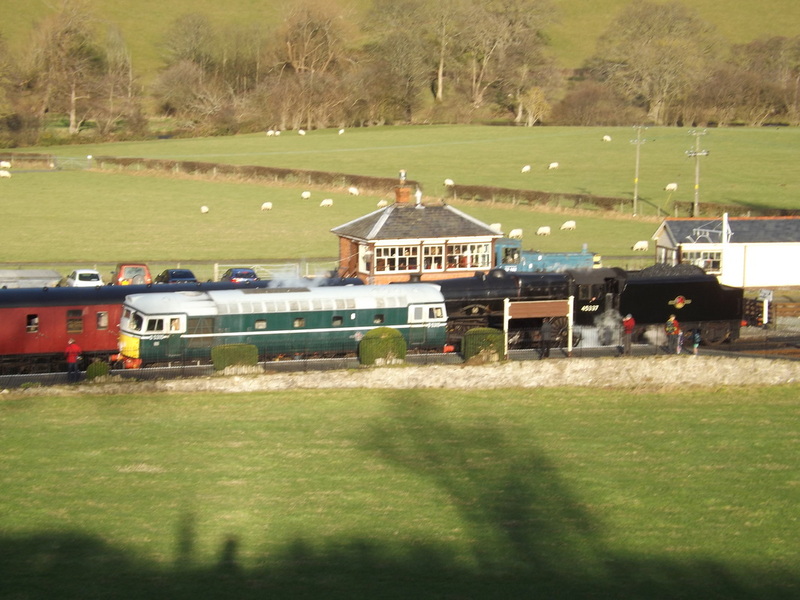 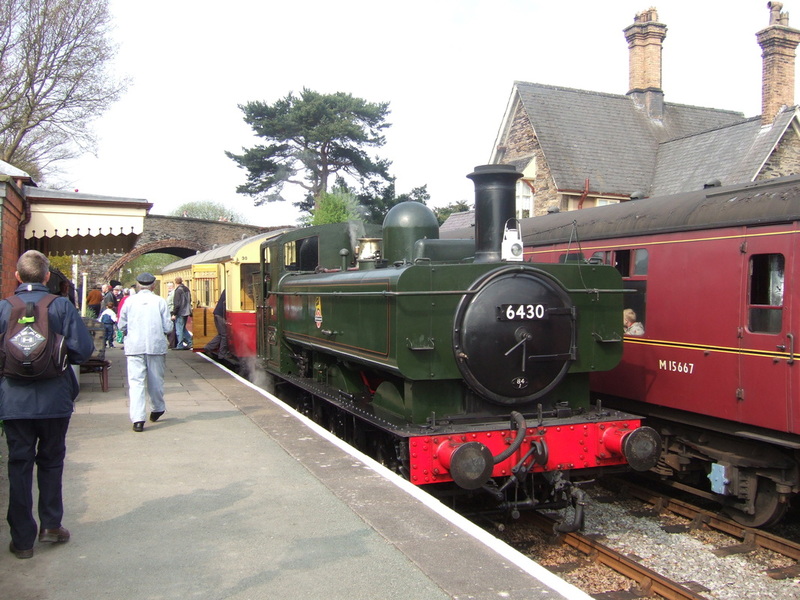 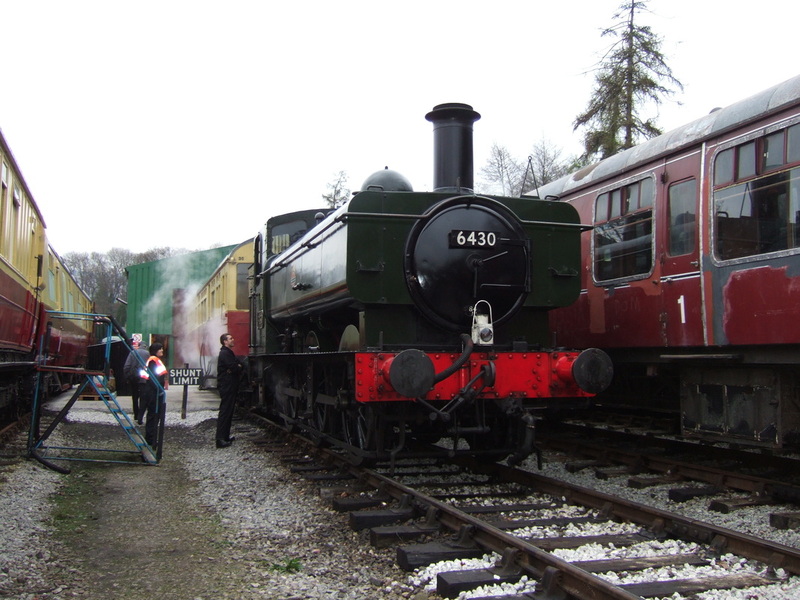 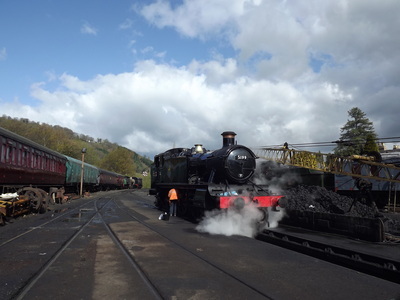 Other visitors including GWR tanks 1450, 9466, 5224 & 4160 and Standard 2mt 78019.